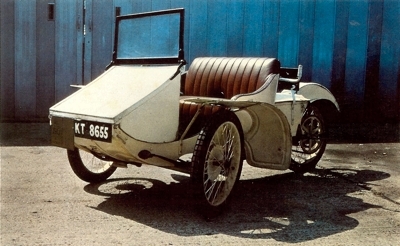 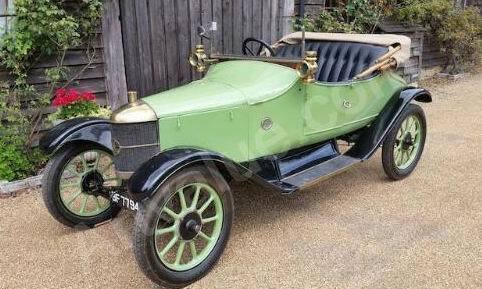 The first car from what eventually became AC was presented at the Crystal Palace motor show in 1903; it was a 20 HP touring car and was displayed under the Weller name. 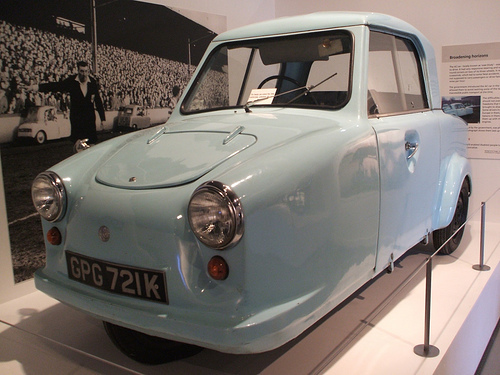 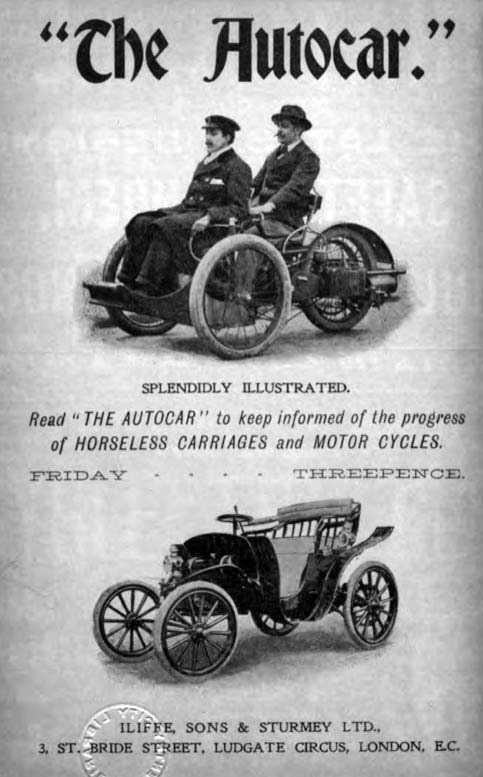 The Weller Brothers of West Norwood, London, planned to produce an advanced 20 hp (15 kW) car. 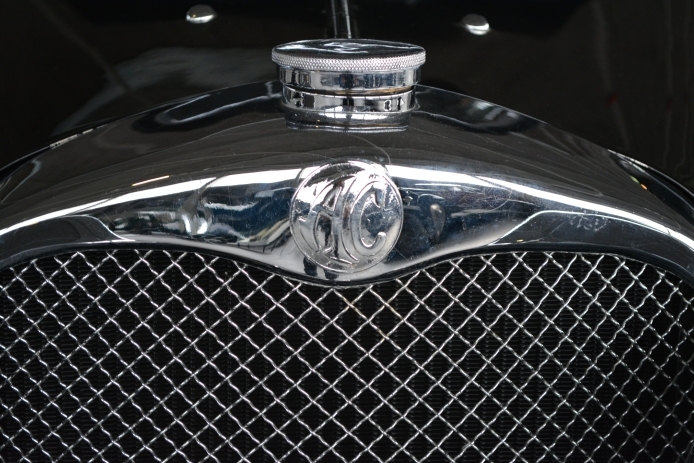 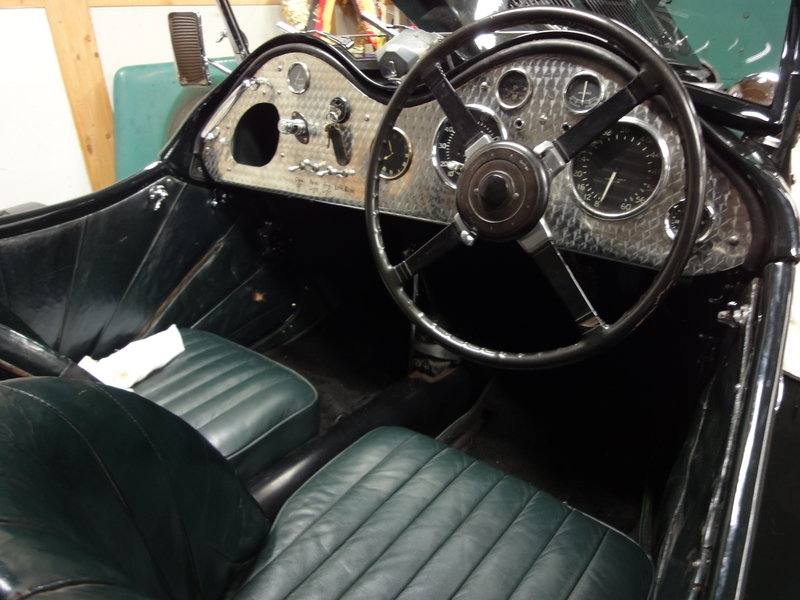 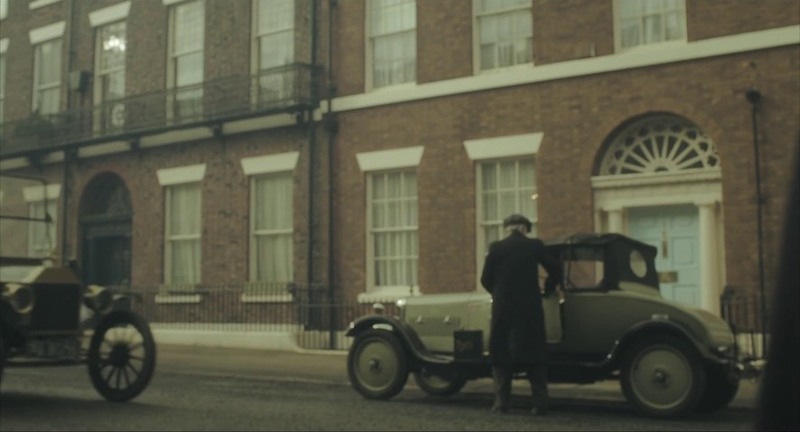 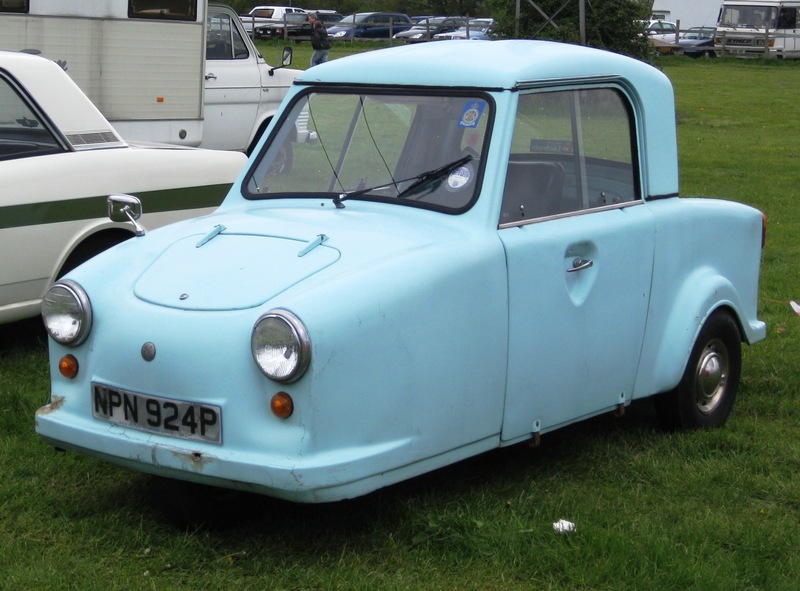 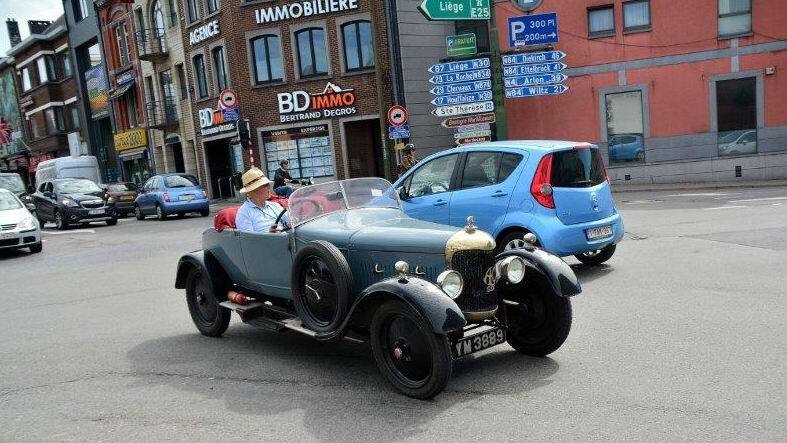 However, their financial backer and business manager John Portwine, a butcher, thought the car would be too expensive to produce and encouraged Weller to design and produce a little delivery three-wheeler. 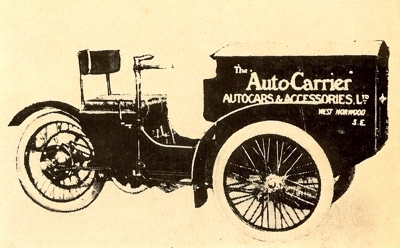 In 1904 a new company was founded and named Autocars and Accessories; production started with the Auto-Carrier. 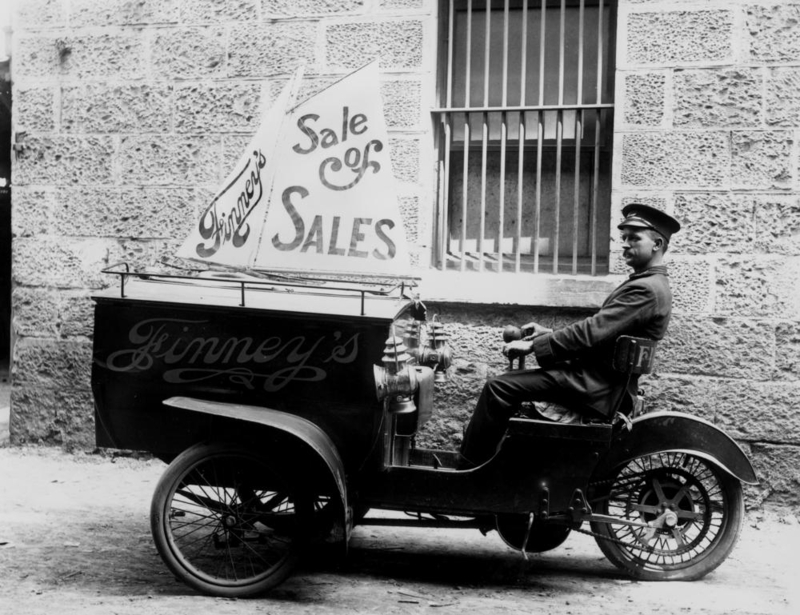 The vehicle caught on quickly and was a financial success. 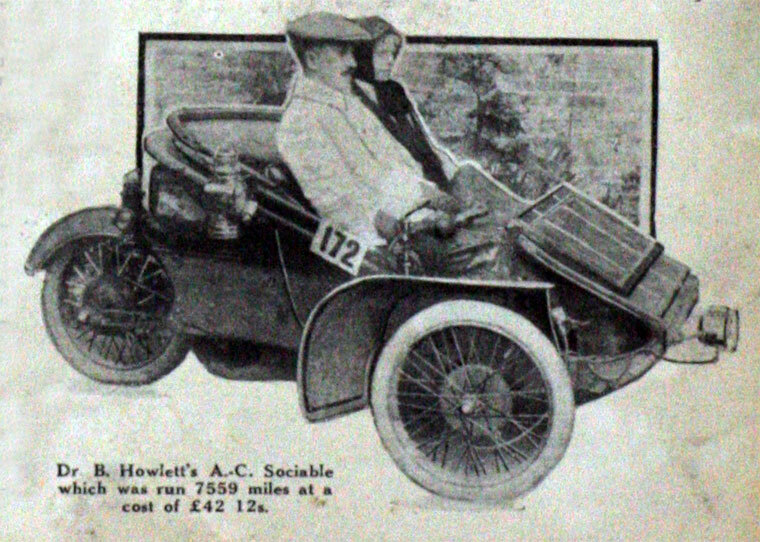 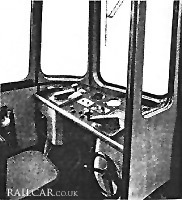 In 1907, a passenger version appeared, called the A.C. Sociable. 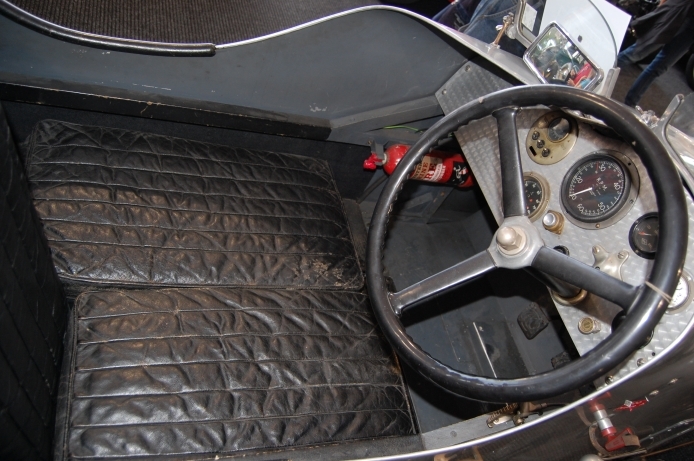 It had a seat in place of the cargo box. 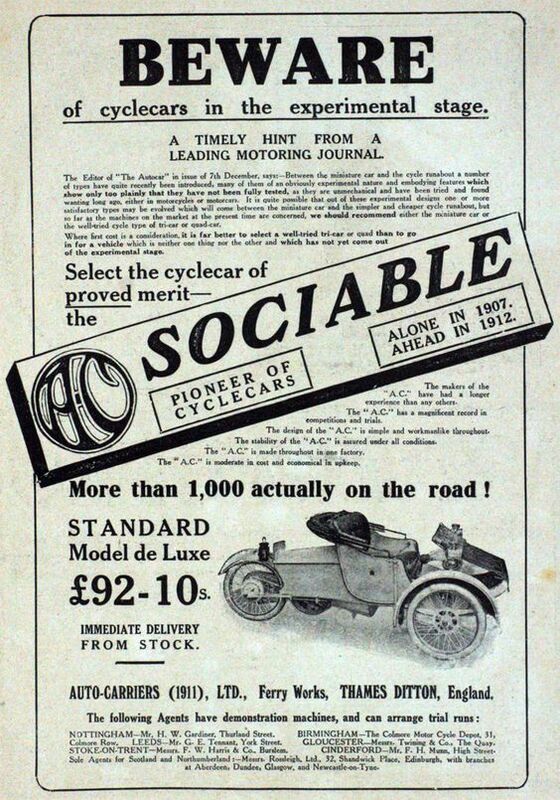 The A.C. Sociable was described in a review of the 1912 Motor Cycle and Cycle Car Show as “one of the most popular cycle cars on the road, both for pleasure and business”, and A.C. displayed eight vehicles on their stand, six for pleasure and two for business. 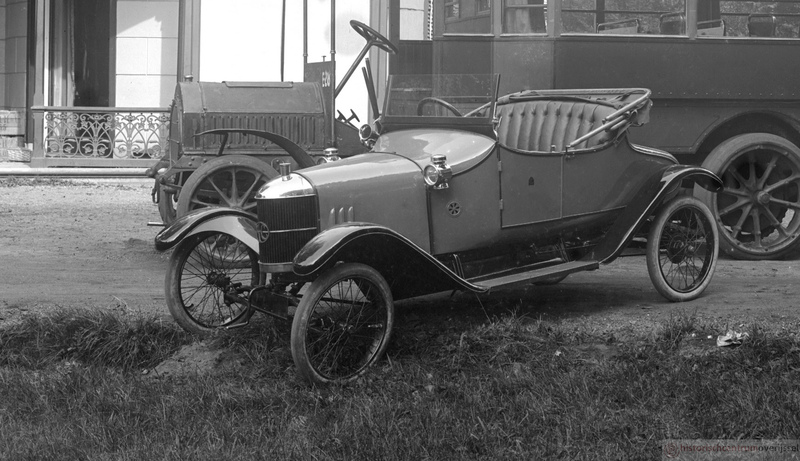 The single rear wheel contained a two-speed hub, and the single-cylinder engine was mounted just in front of it, with rear chain drive. 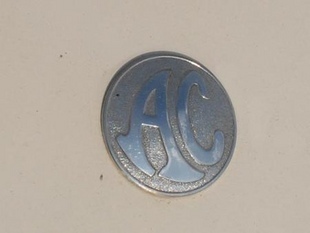 The company became Auto Carriers Ltd. in 1911 and moved to Ferry Works, Thames Ditton, Surrey—at this time they also began using the famed “AC” roundel logo. 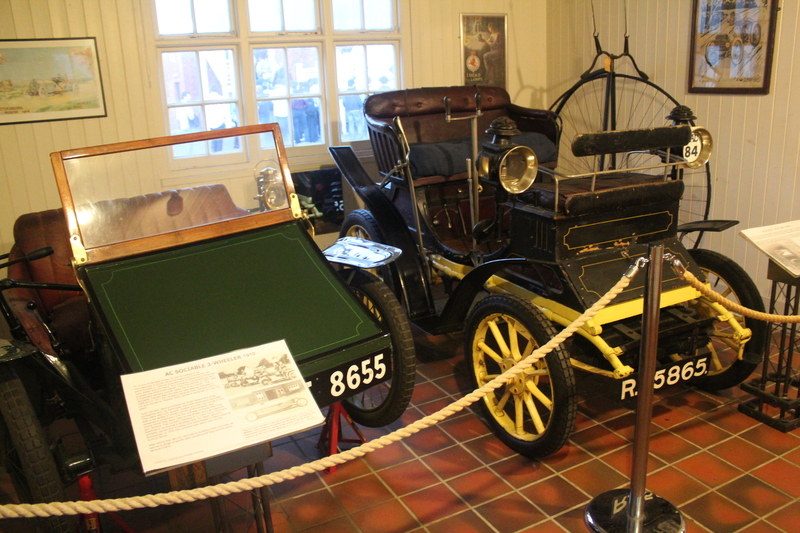 Their first four-wheeled car was produced in 1913; it was a sporty little two-seater with a gearbox on the rear axle. 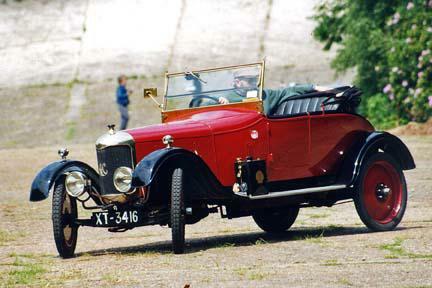 Only a few were built before production was interrupted by the First World War. 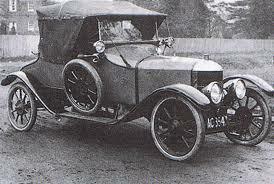 During the Great War, the Ferry Works factory produced shells and fuses for the war effort, although at least one vehicle was designed and built for the War Office. 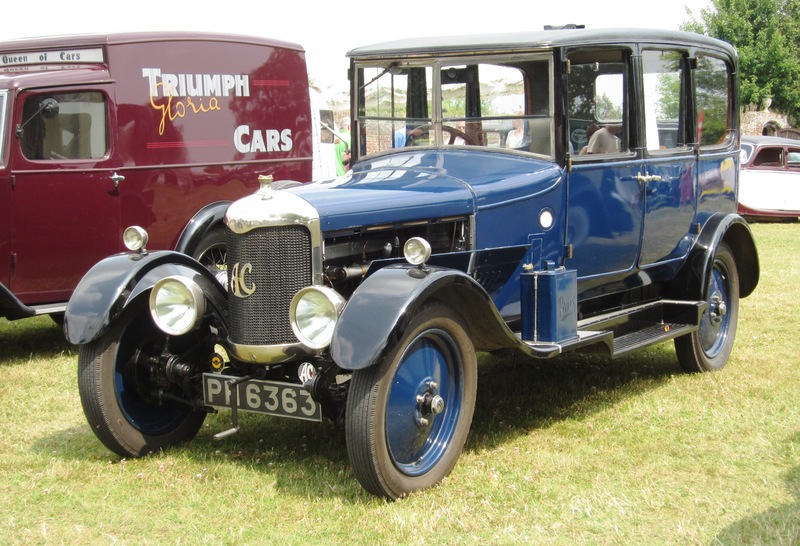 At the end of the First World War, AC Cars started making motor vehicles again, designing and building many successful cars at Ferry Works, as well as expanding into an old balloon factory on Thames Ditton High Street. 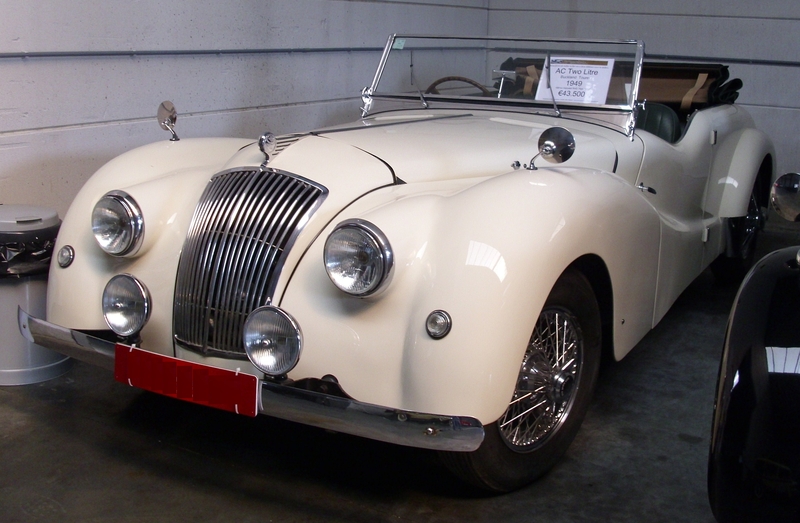 After the war, John Weller started on the design of a new overhead-cam 6-cylinder engine. 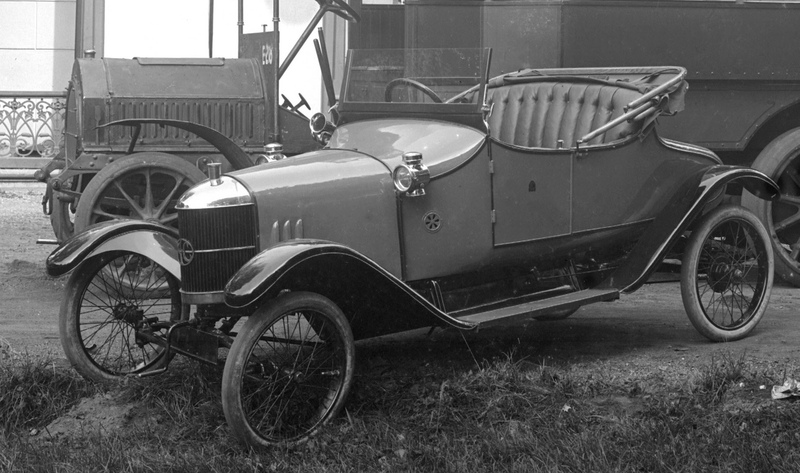 The first versions of this design were running by 1919. 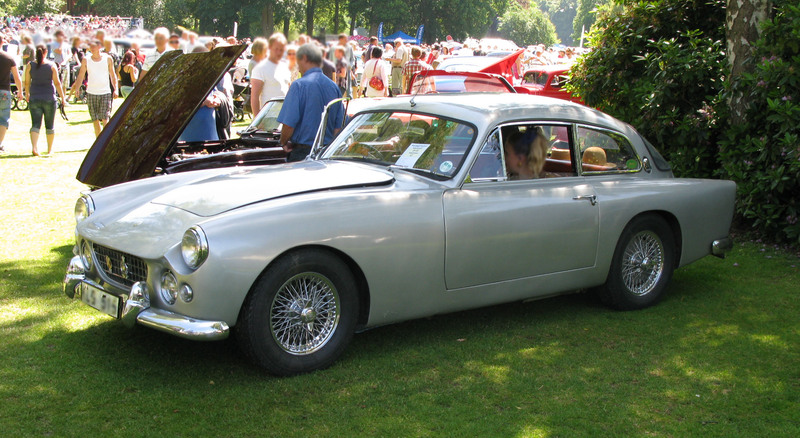 The Weller engine would be produced until 1963. 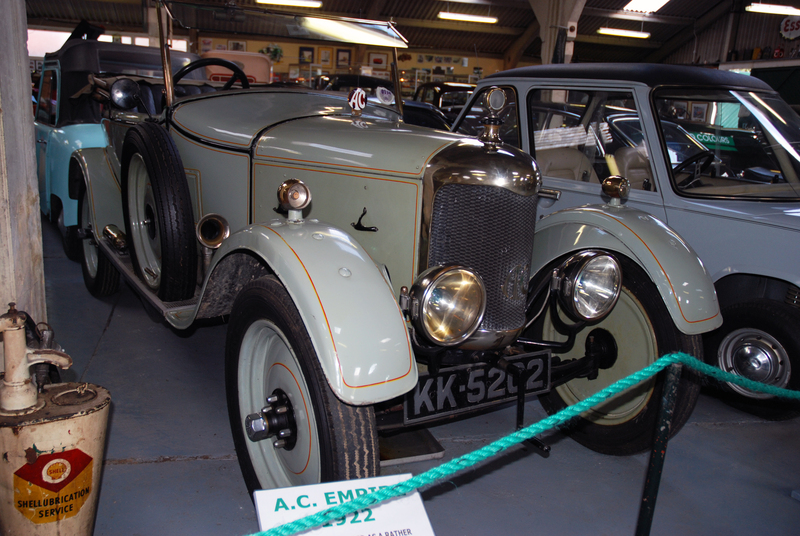 In 1921, Selwyn Edge (who had been with Napier) bought shares in the company and was appointed governing director. 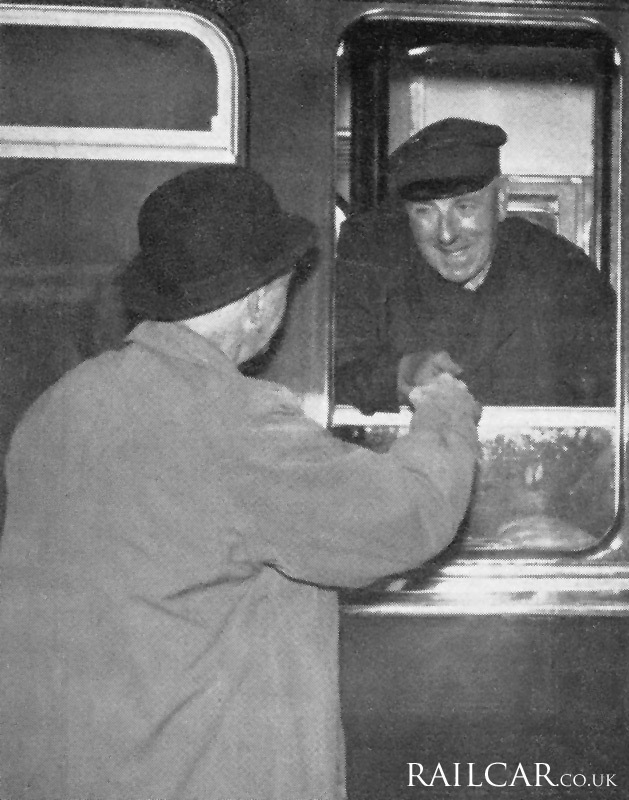 He did not get along with Weller or Portwine, who resigned less than a year later. 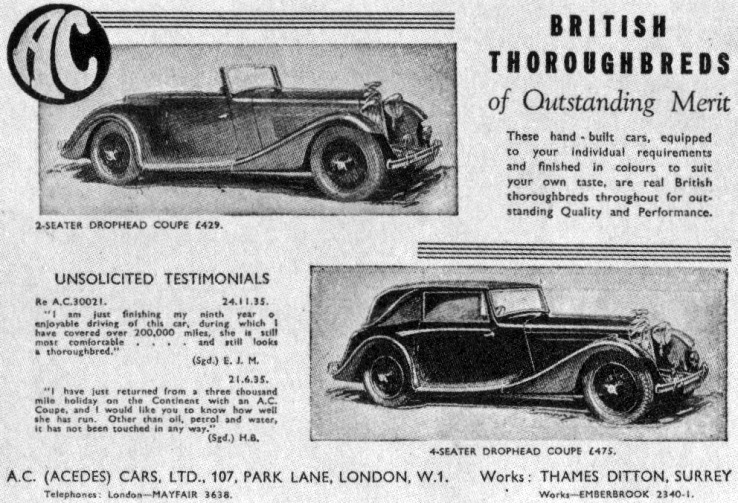 In customary fashion Edge sought publicity for the company through motoring competition. 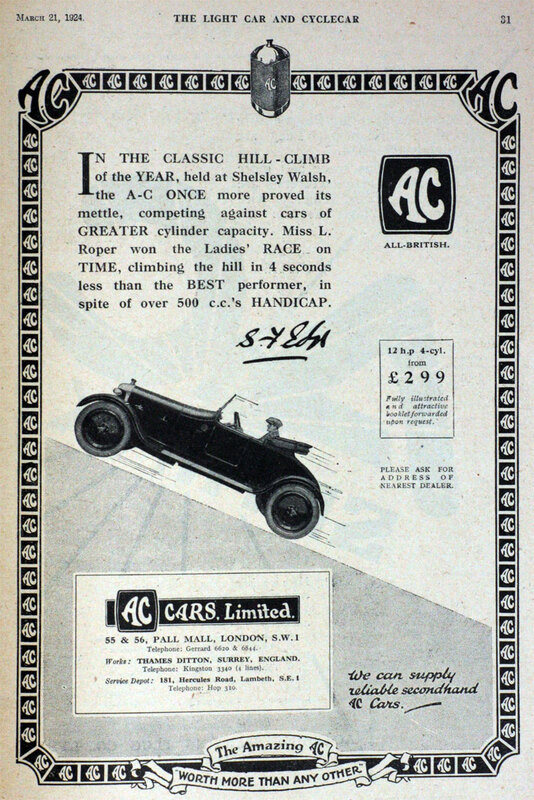 In 1921 Sammy Davis joined A.C. as a driver, competing in the Junior Car Club 200-mile (320 km) race, for cars up to 1,500 c.c., at Brooklands. 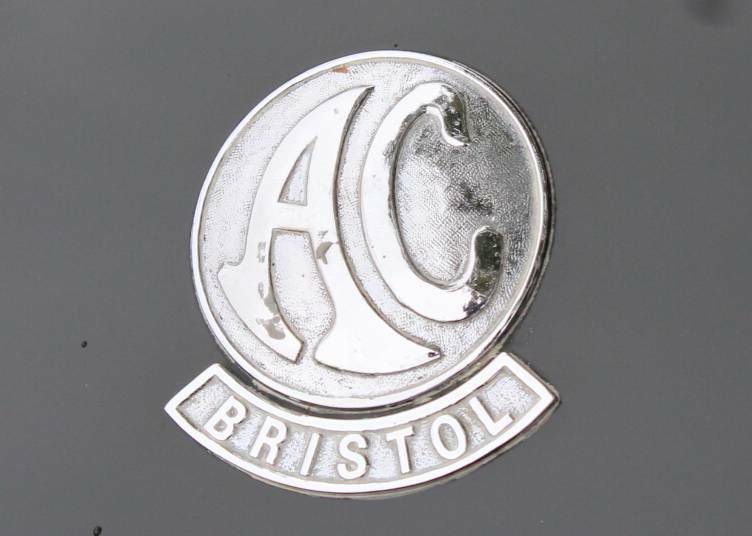 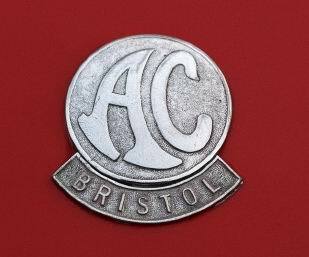 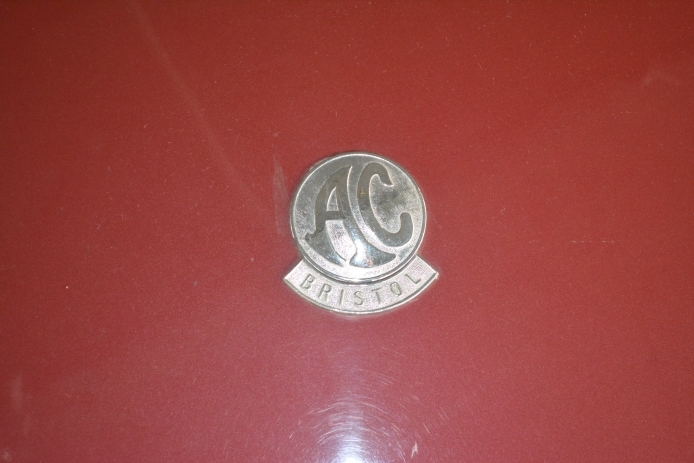 In 1922, the name changed again to AC Cars Ltd. 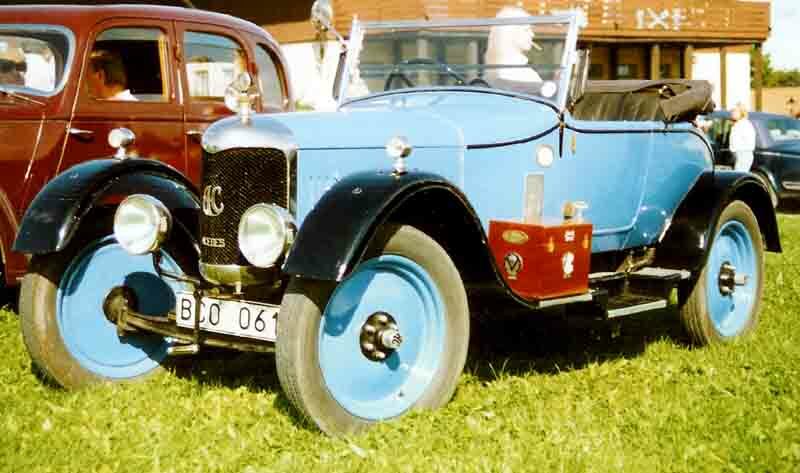 In 1923 and 1924 J.A. 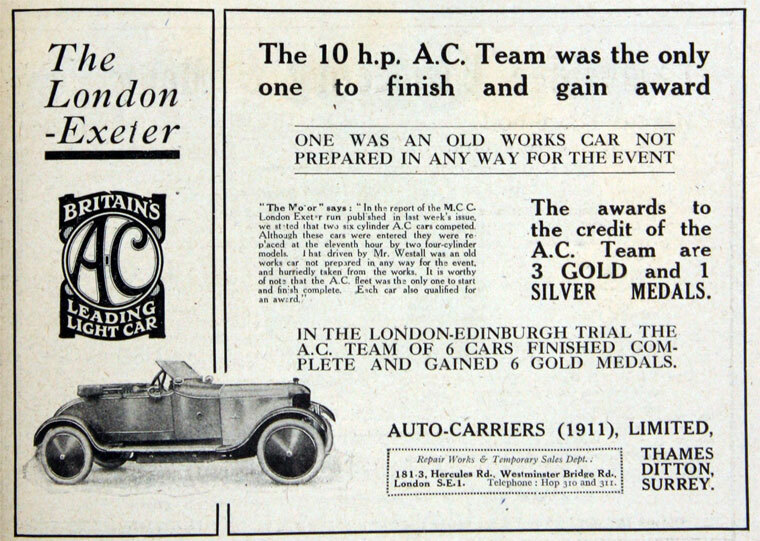 Joyce won the Brighton Speed Trials driving an A.C. 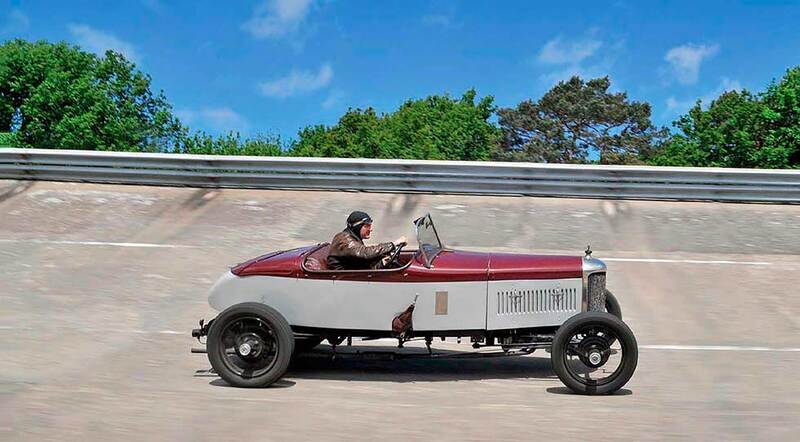 In May 1924, at Montlhéry, near Paris, T. G. Gillett broke the continuous 24-hour record in a 2-litre A.C., fitted with special streamlined bodywork, covering a distance of 1,949.3 miles. 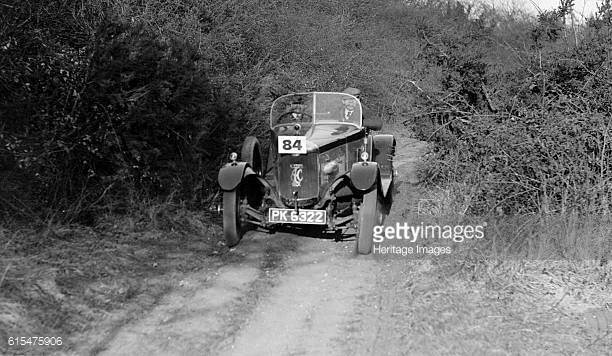 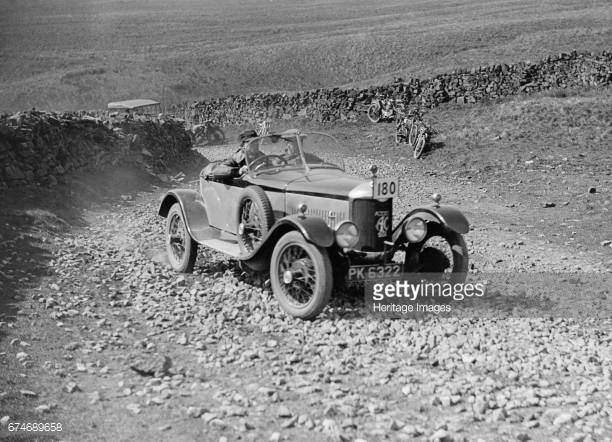 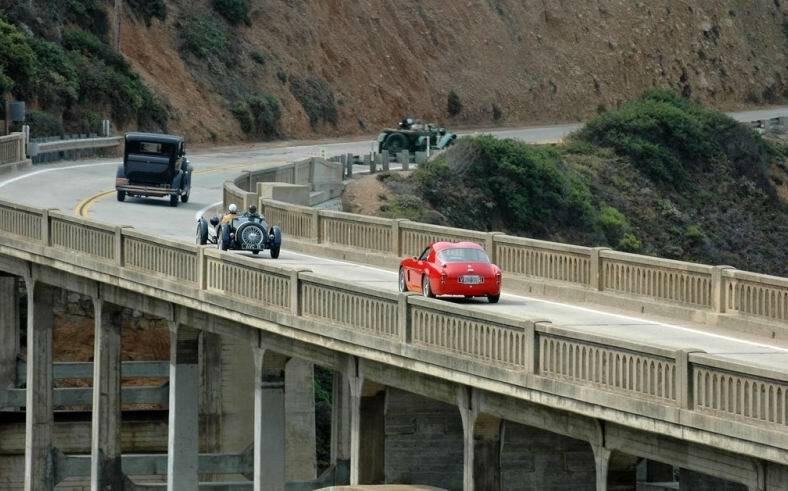 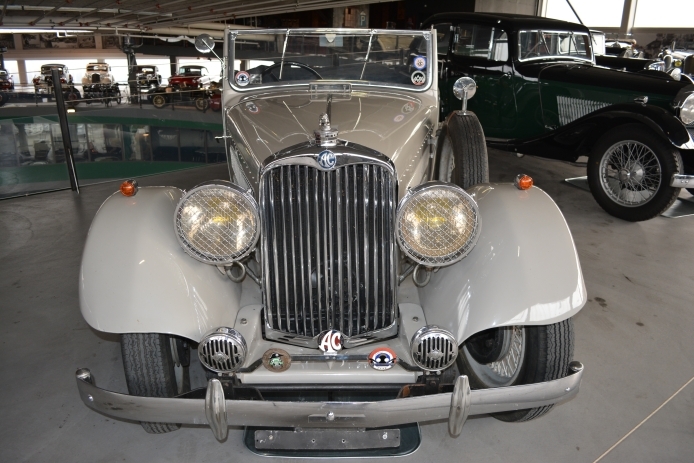 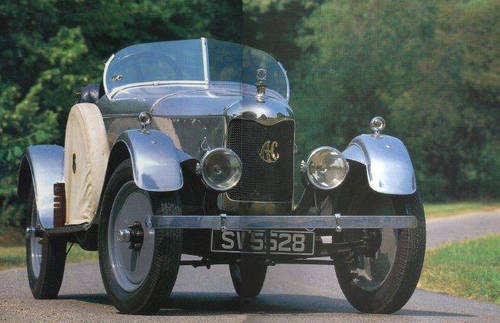 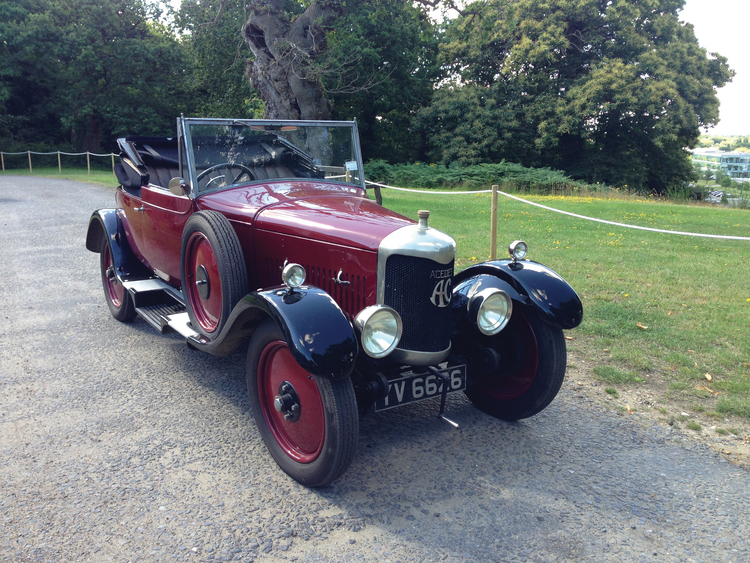 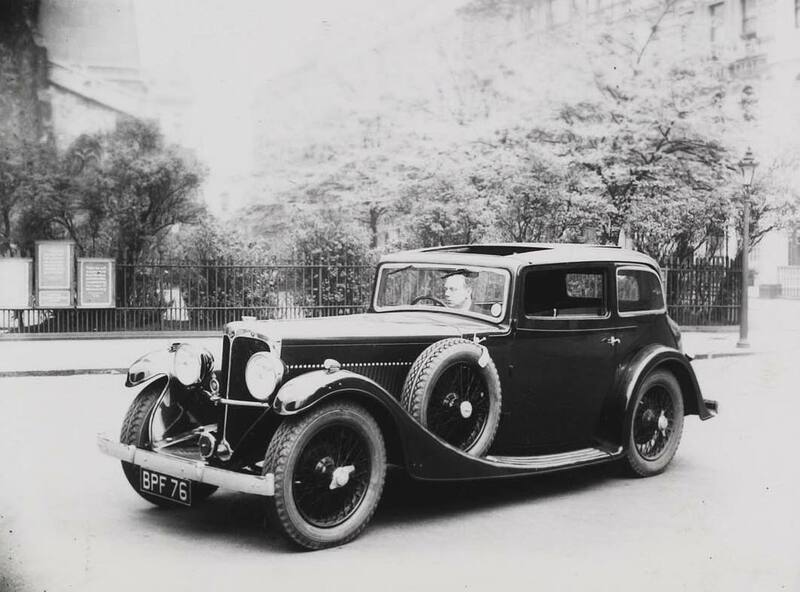 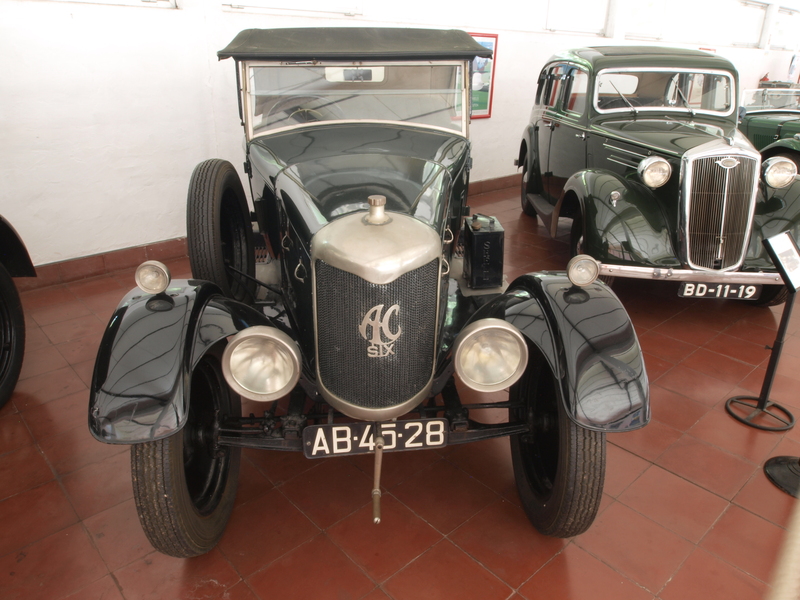 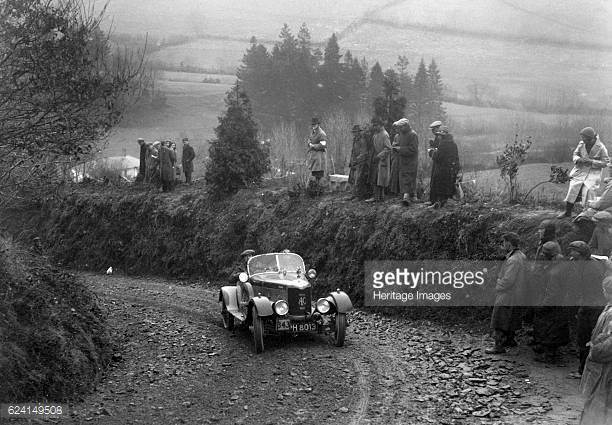 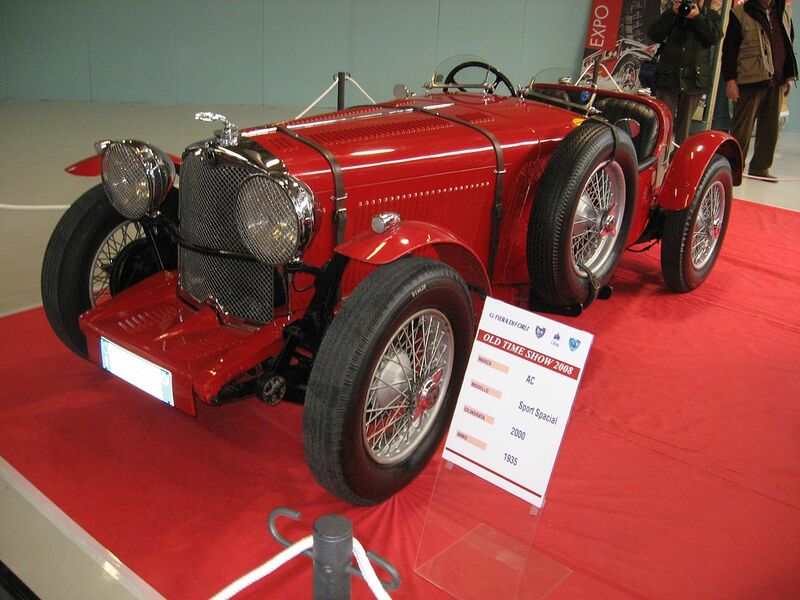 In 1926 the Honourable Victor Bruce, an AC employee, won the Monte Carlo Rally in his 2-litre AC. 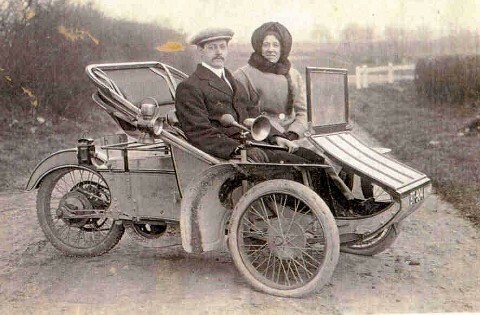 In 1927, Victor Bruce, with his wife Mildred (The Hon Mrs Victor Bruce), assisted by J.A. 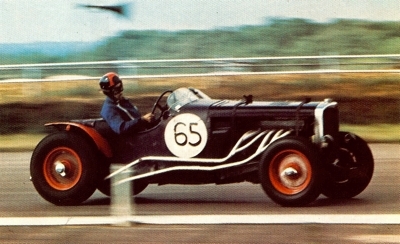 Joyce, set a 10-day endurance record at Montlhéry, driving an AC Six. 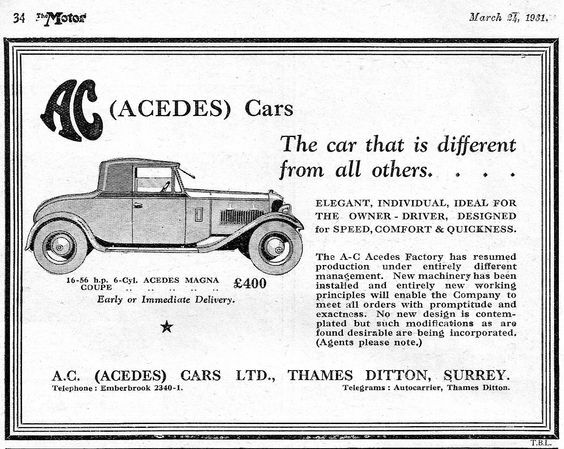 Selwyn Edge bought the company outright for £135,000 in 1927 and re-registered it as AC (Acedes) Ltd but sales, which had been falling, continued to decline. 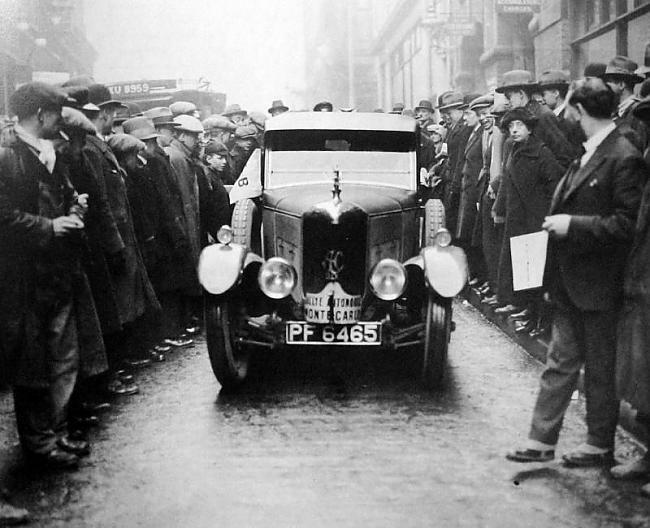 The company was caught by the crash of 1929 and went into voluntary liquidation. 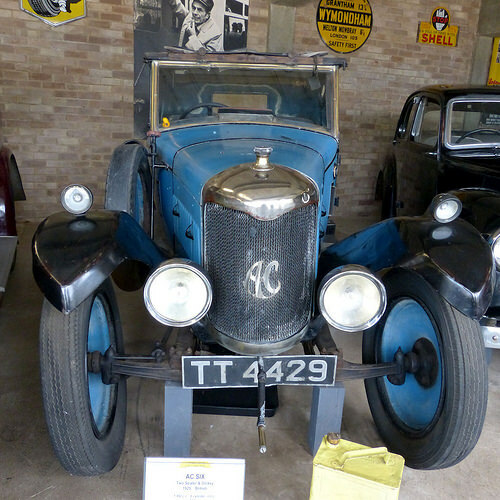 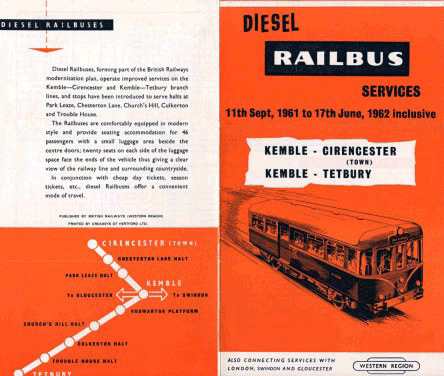 Production ceased for a time, and the company was sold to the Hurlock family who ran a successful haulage business. 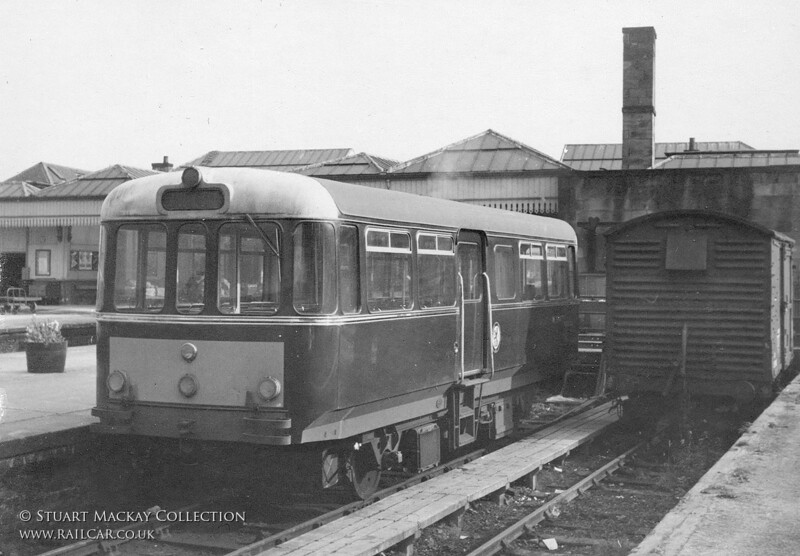 They wanted the High Street factory only as a warehouse (Ferry Works was not acquired), but allowed the service side of AC to continue. 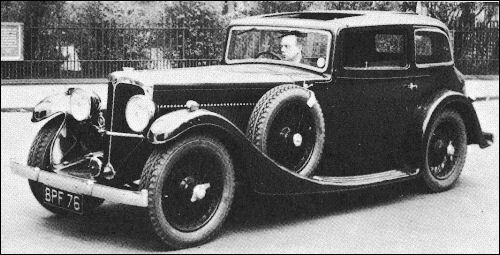 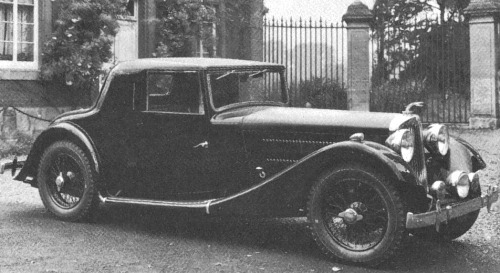 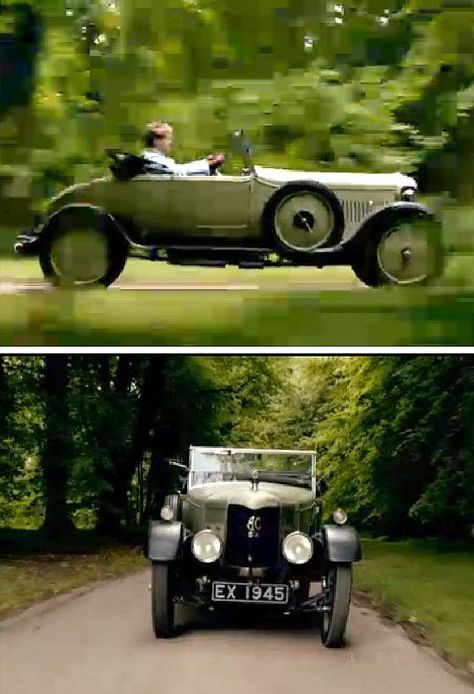 A single car was made for William Hurlock in 1930. 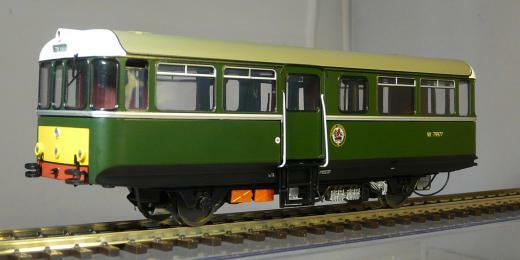 He liked it and agreed to restart very limited production, mainly using components left over from previous models. 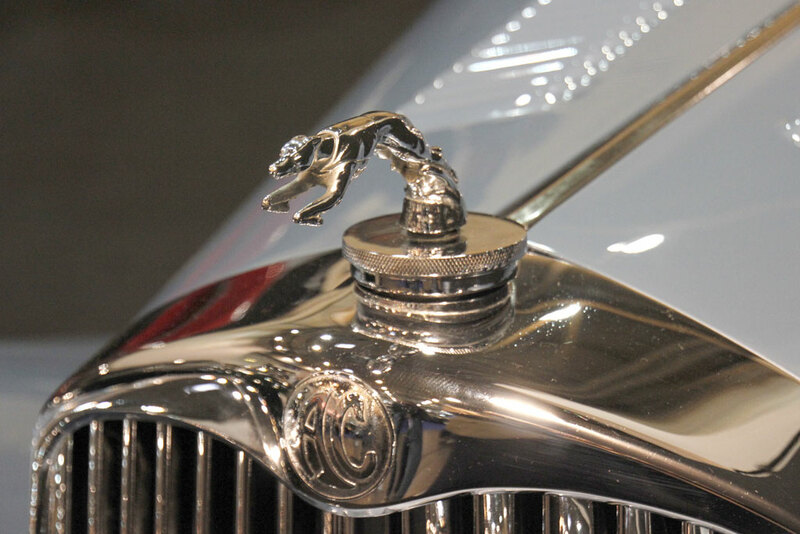 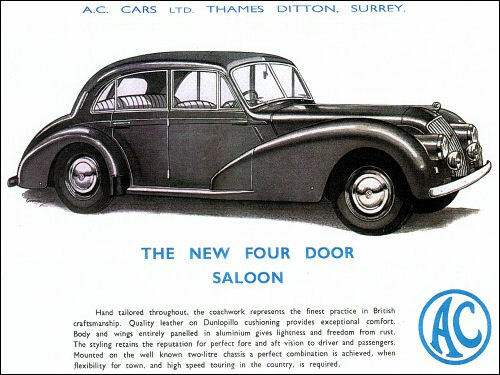 An agreement was reached with Standard to supply new chassis, the ancient three-speed transaxle was replaced by a modern four-speed gearbox (built in unit with the engine), and by 1932 a new range of cars was finally launched. 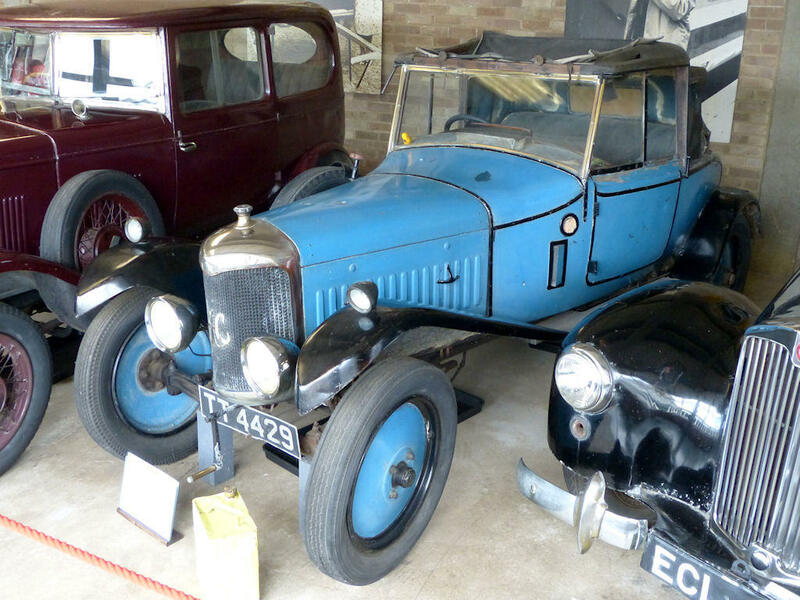 Production continued on this small scale, averaging less than 100 vehicles per year, until the outbreak of the Second World War in 1939. 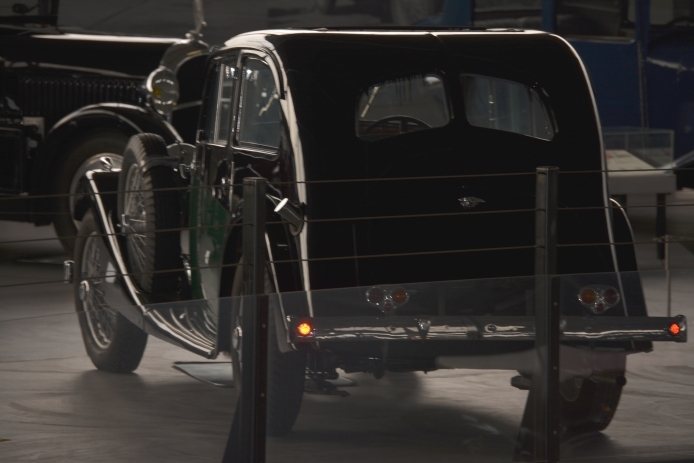 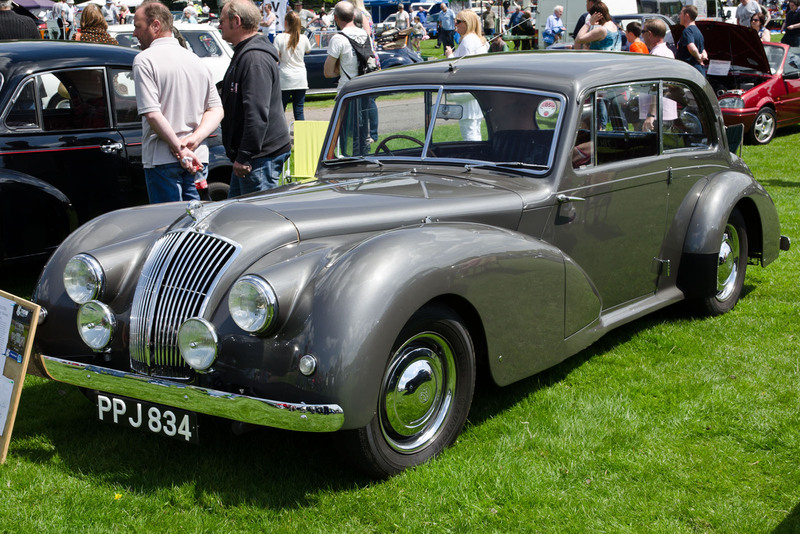 The final pre-war car was delivered in June 1940, after which the factory was fully involved with war production. 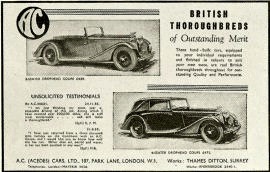 While the company’s sporting cars won plaudits from many enthusiasts, it was the long-running contract with the UK government for the production of three-wheeled invalid carriages that may have most impressed those concerned for the company’s financial stability. 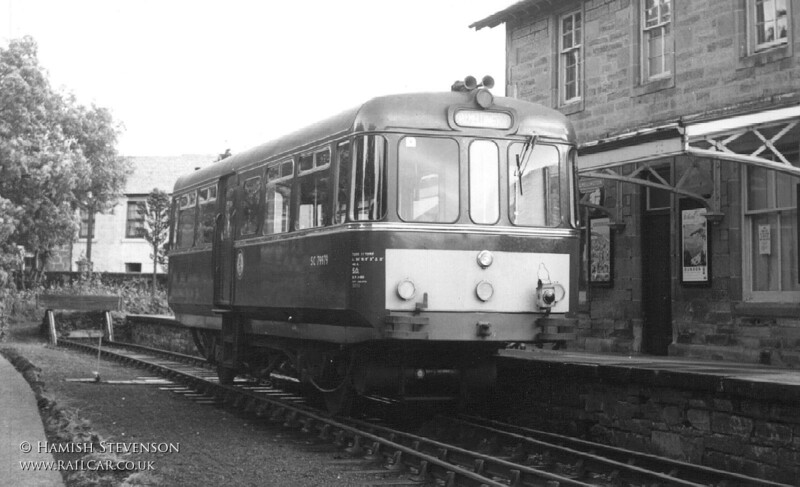 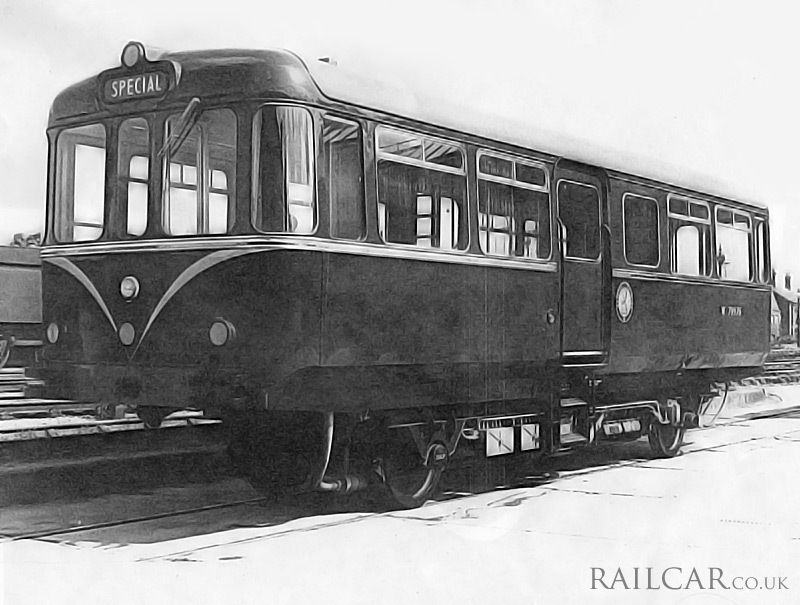 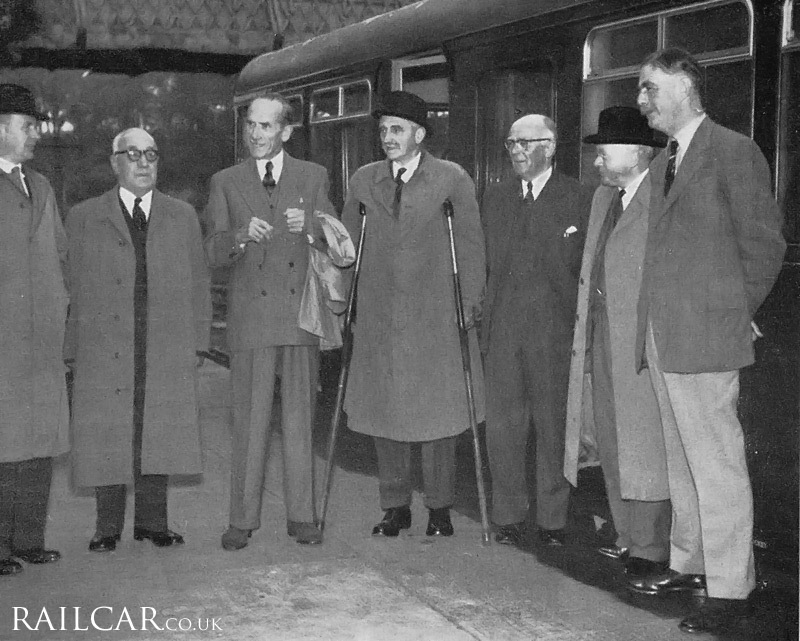 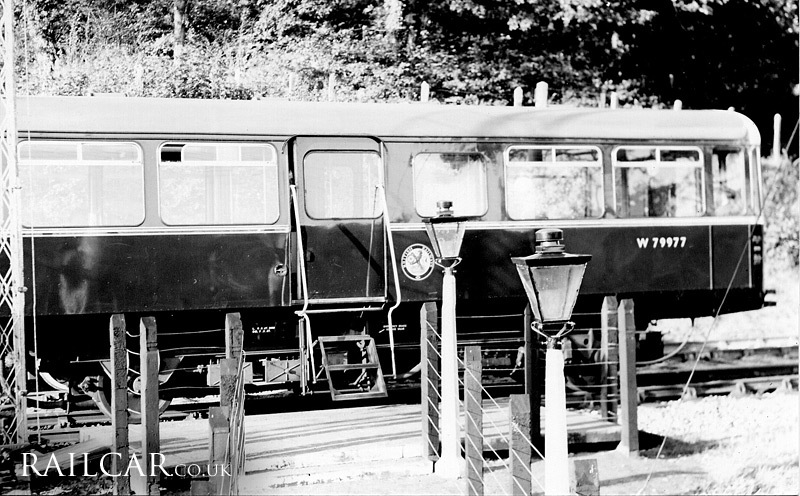 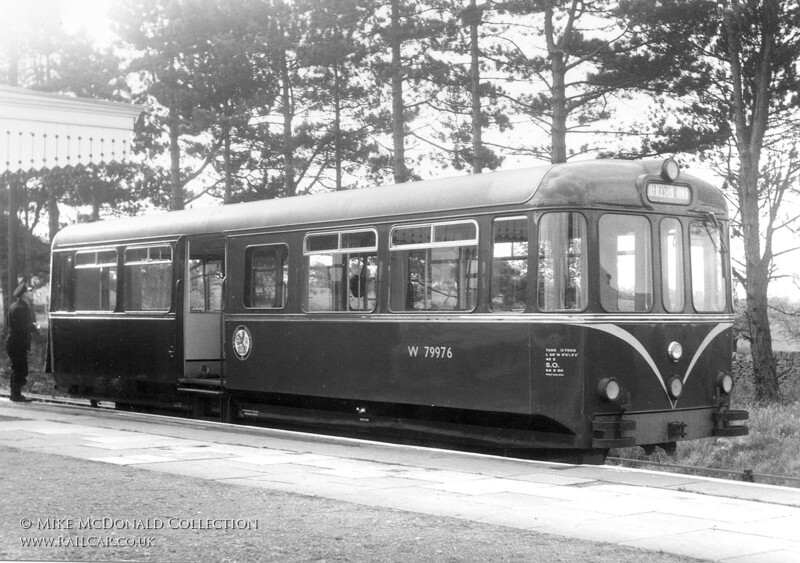 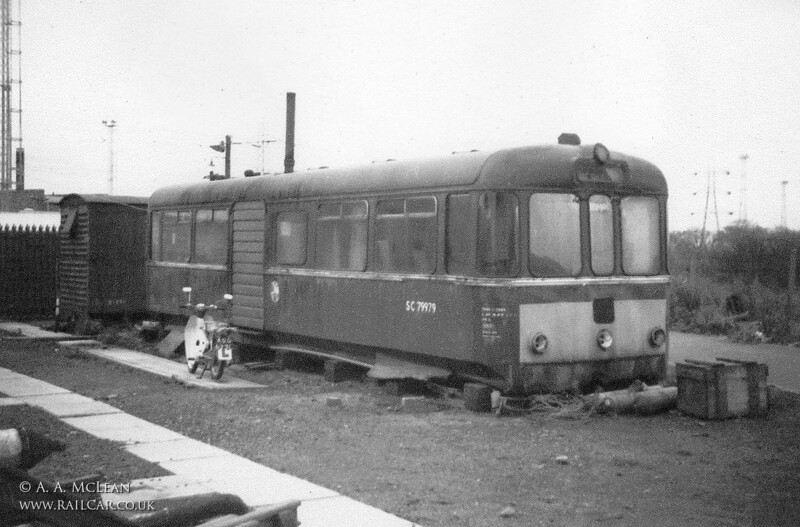 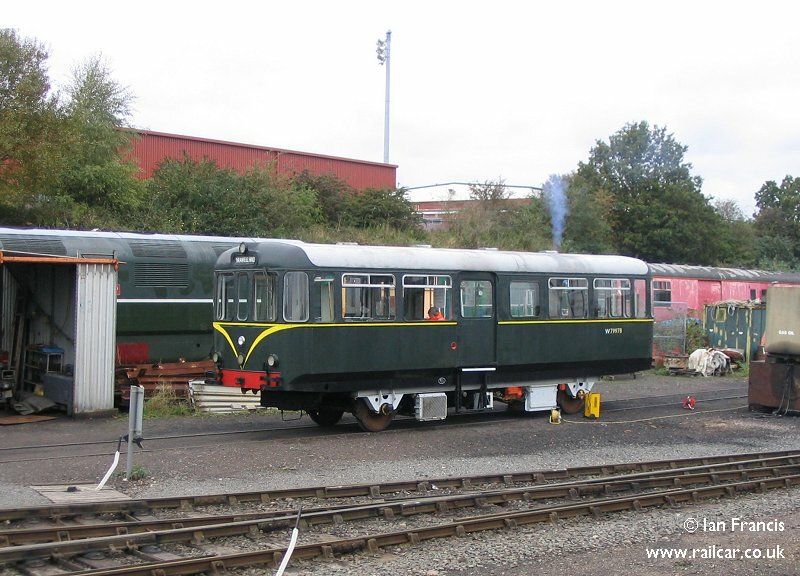 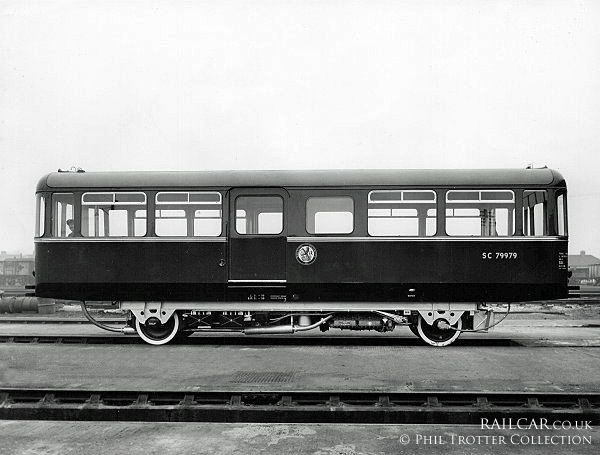 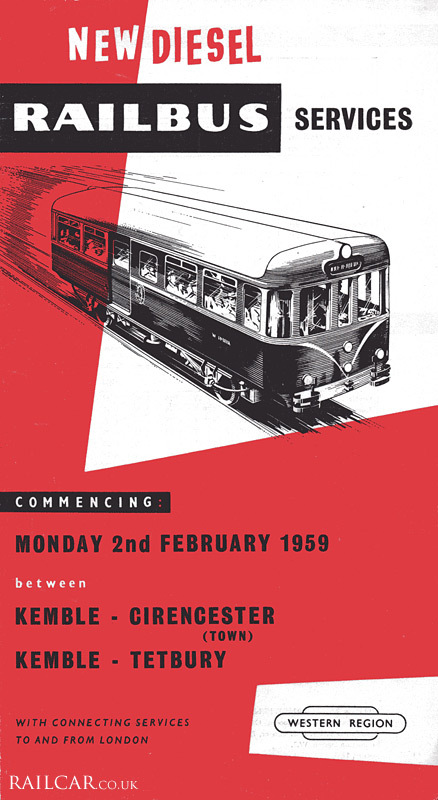 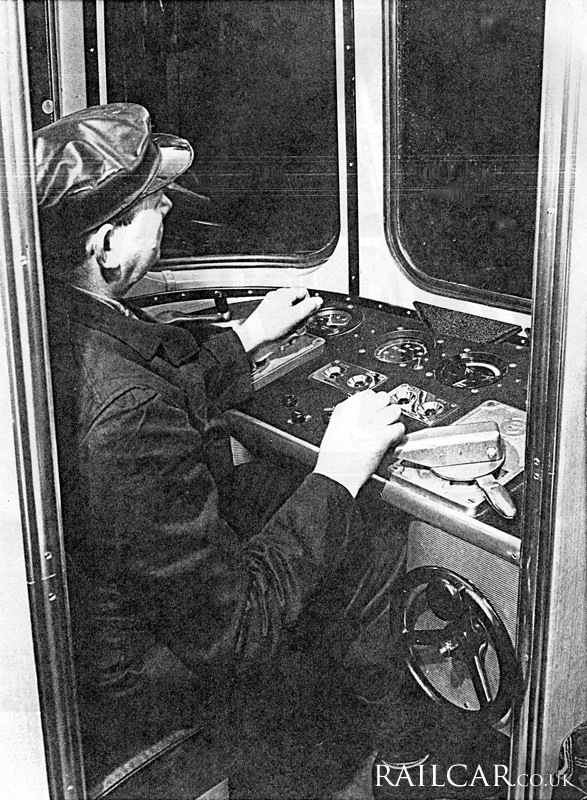 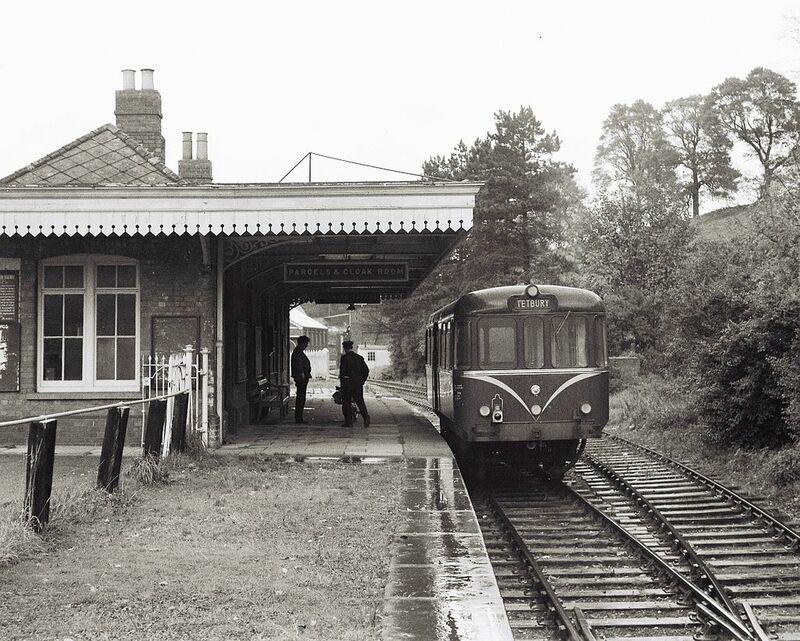 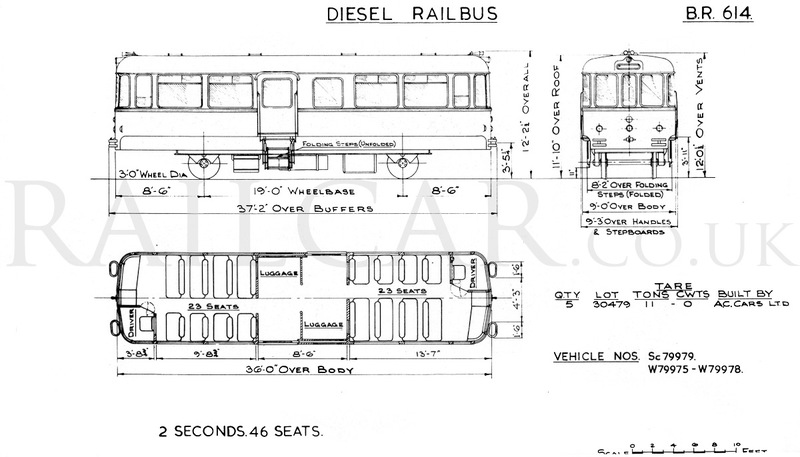 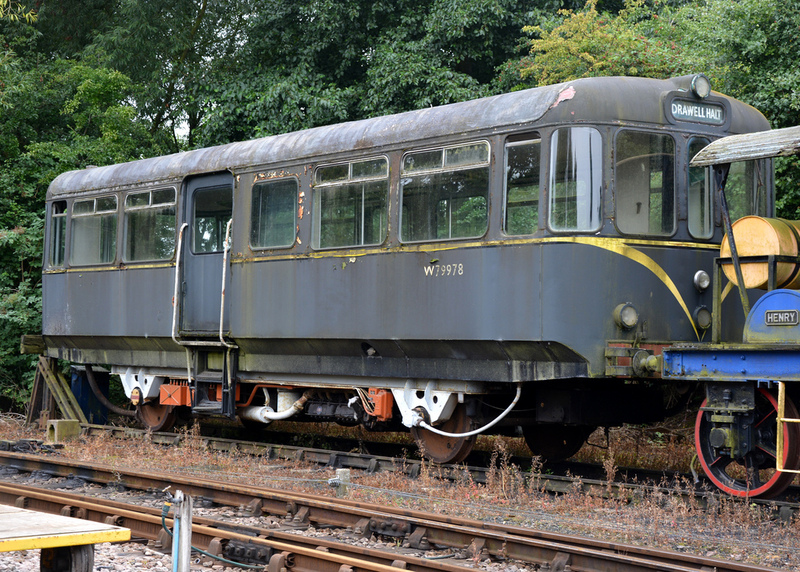 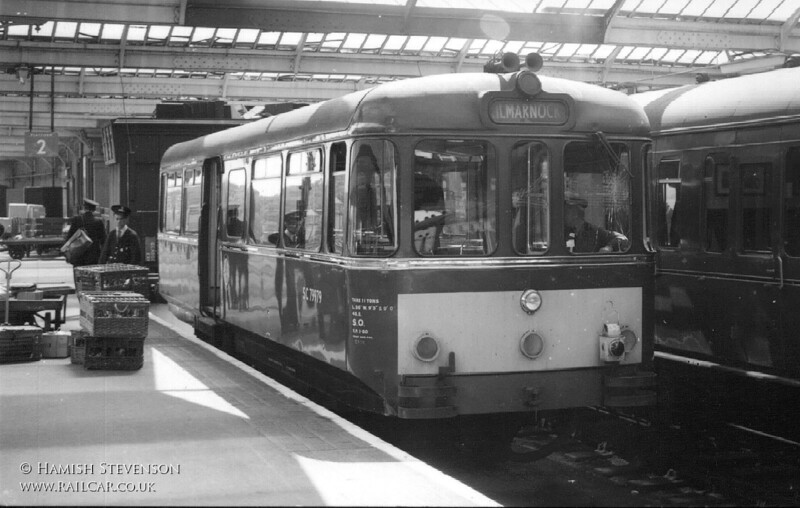 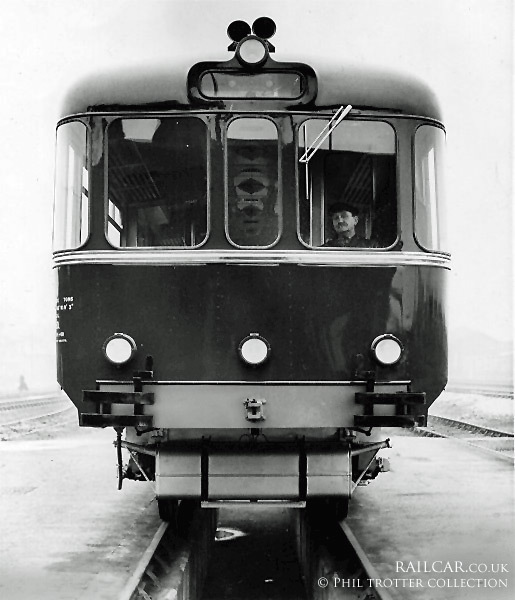 After the war AC secured a large contract with the government to produce the fibreglass-bodied, single seat, Thundersley Invacar Type 57 invalid carriages with BSA engines. 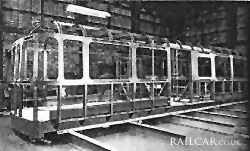 The invalid carriages continued to be built until 1976 and were an important source of revenue to the company. 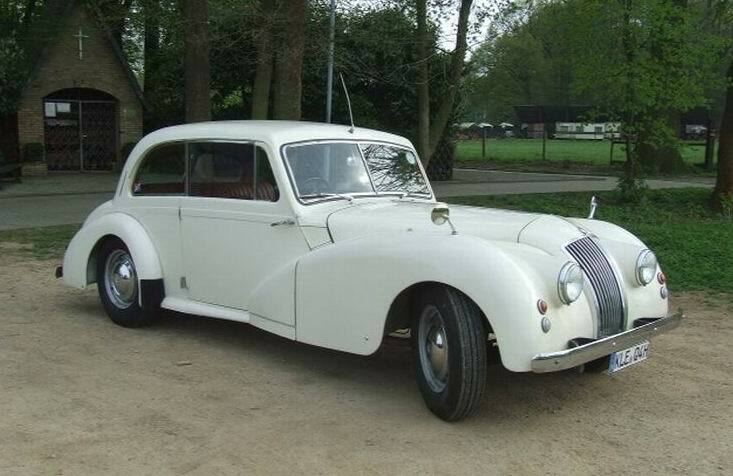 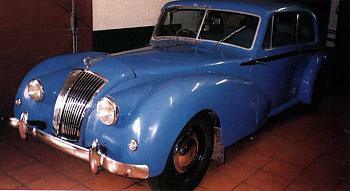 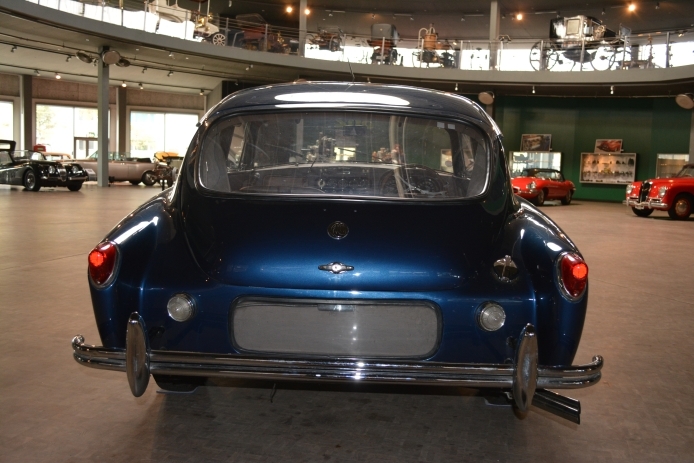 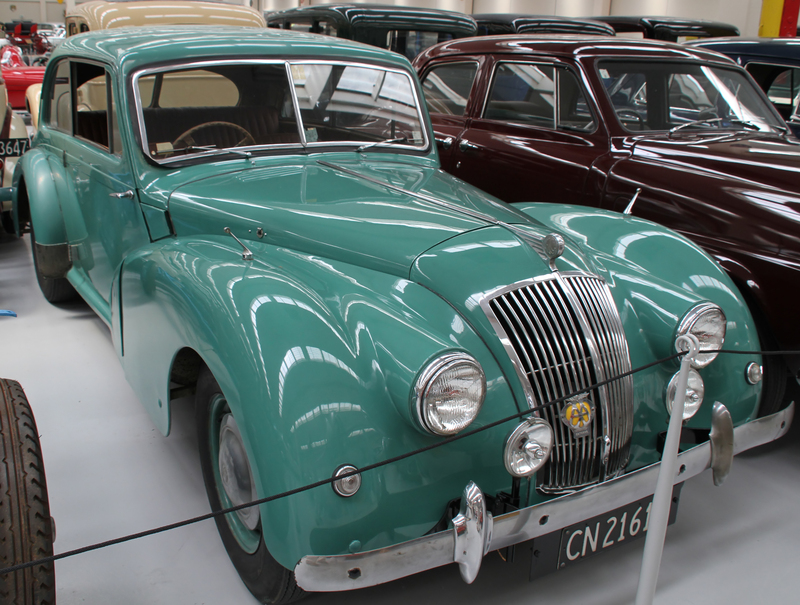 Production of cars restarted in 1947 with the 2-Litre, using the 1991 cc engine from the 16. 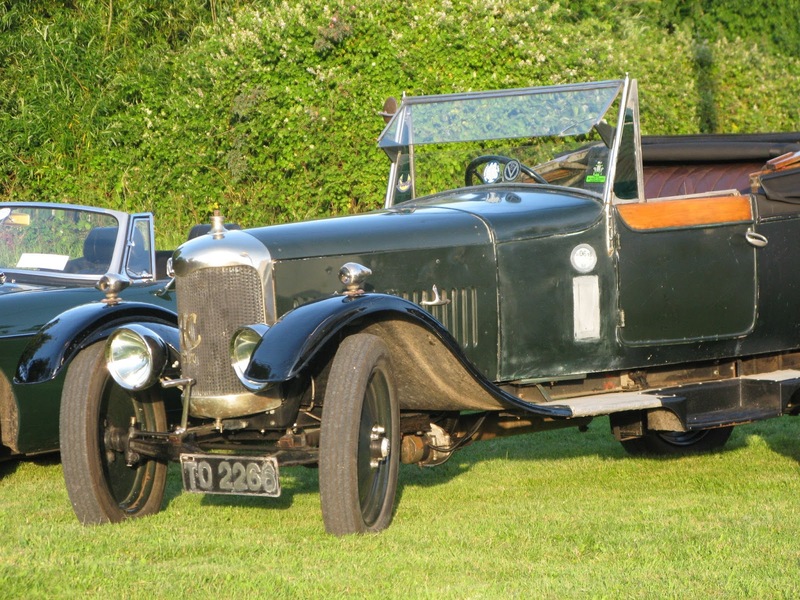 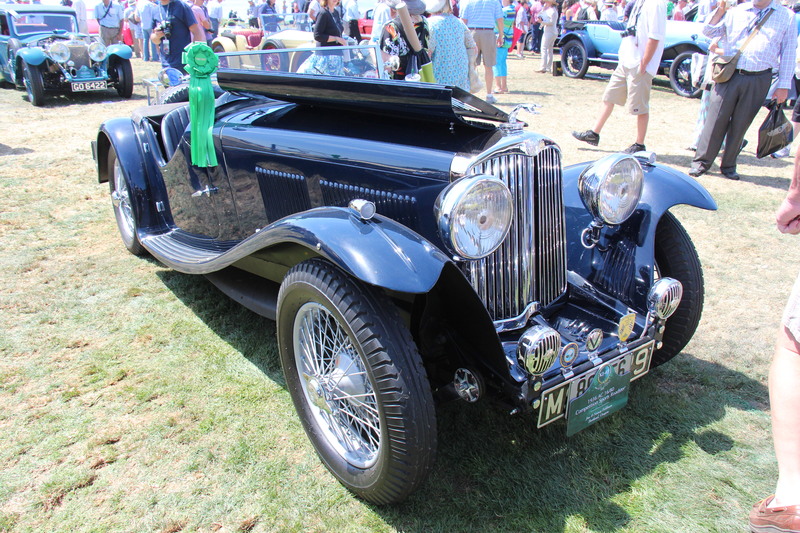 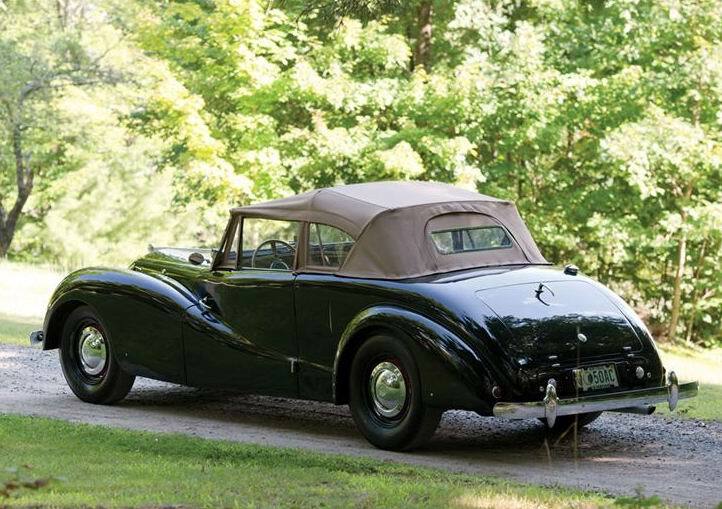 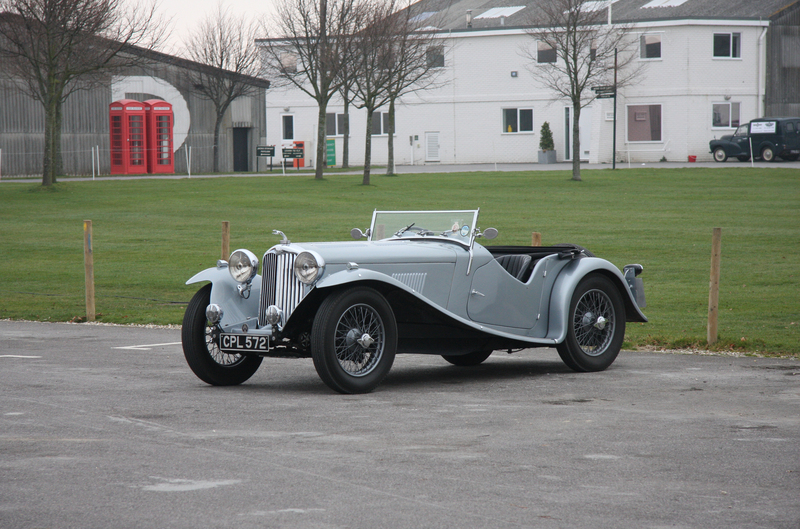 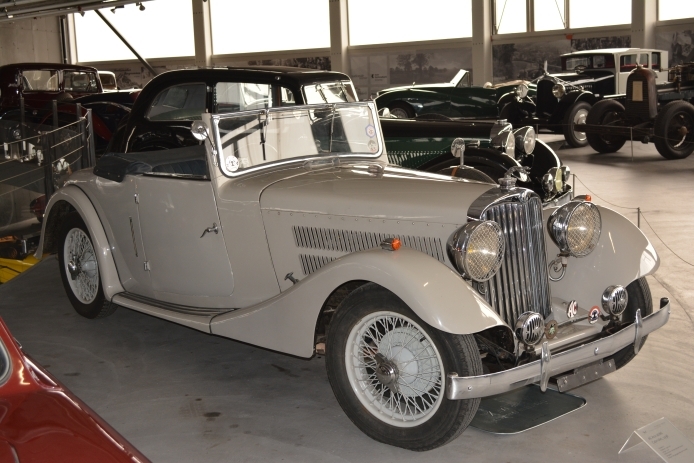 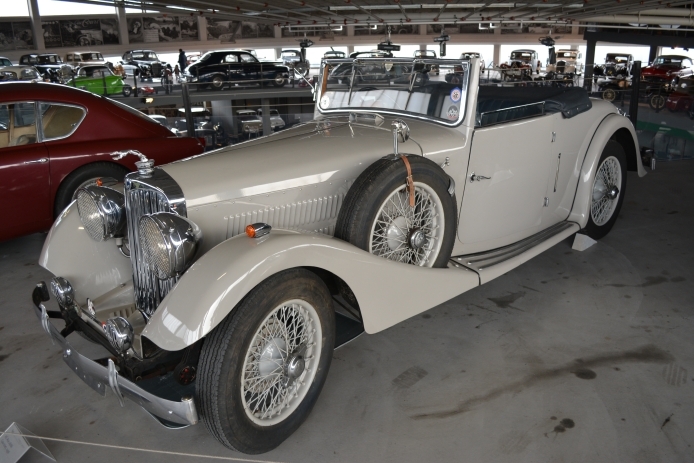 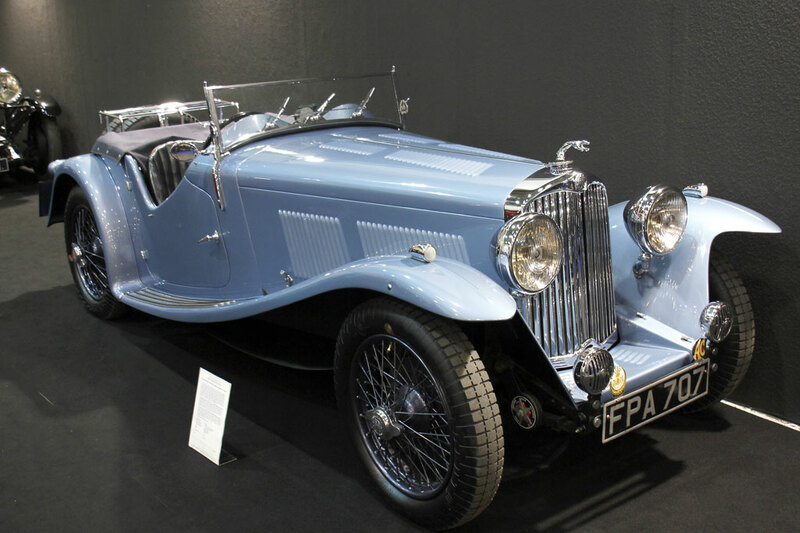 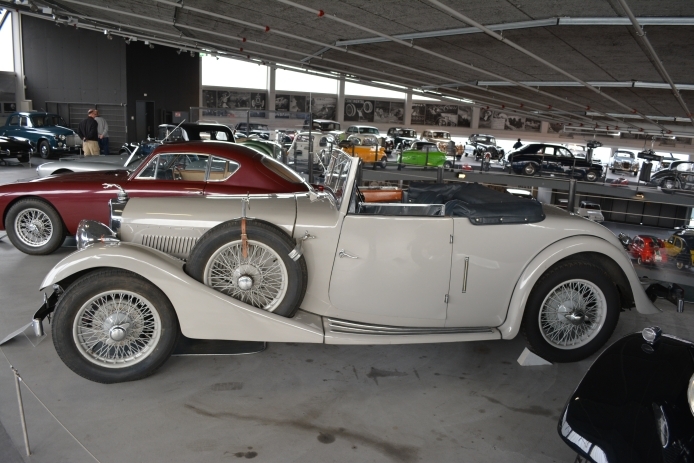 The 2-Litre used an updated version of the pre-war, underslung chassis, fitted with the AC straight-six engine and traditional ash-framed and aluminium-panelled coachwork, available in saloon or convertible versions. 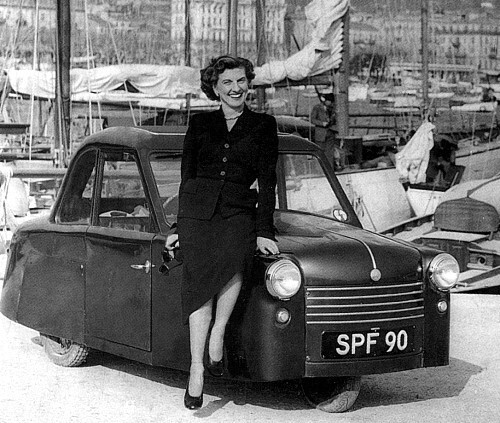 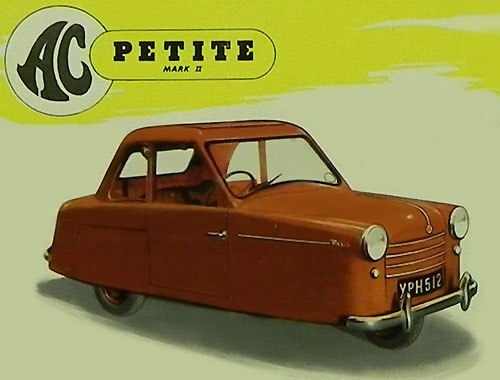 They also built an aluminum-bodied three-wheeled microcar, the Petite. 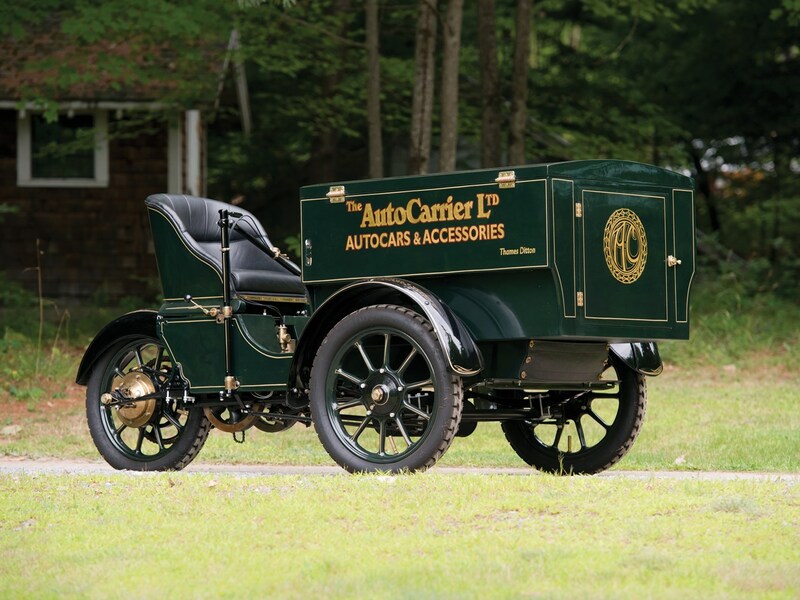 They also produced “Bag Boy” golf carts (with independent suspension to the two wheels!). 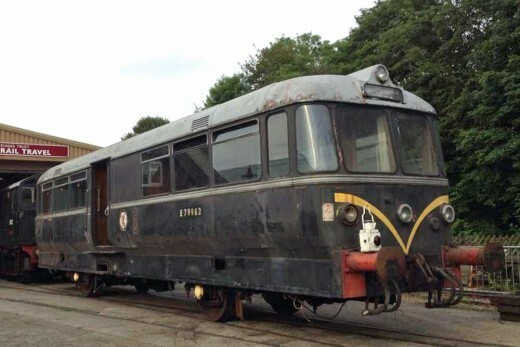 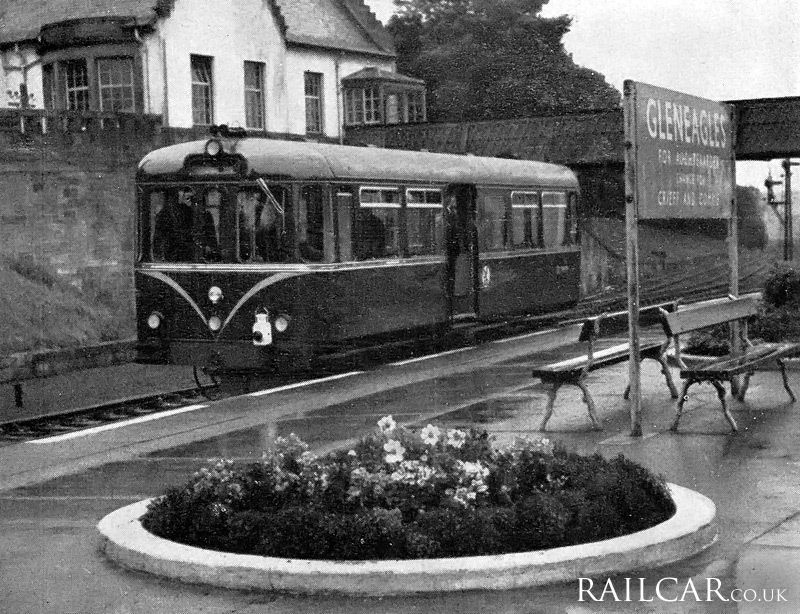 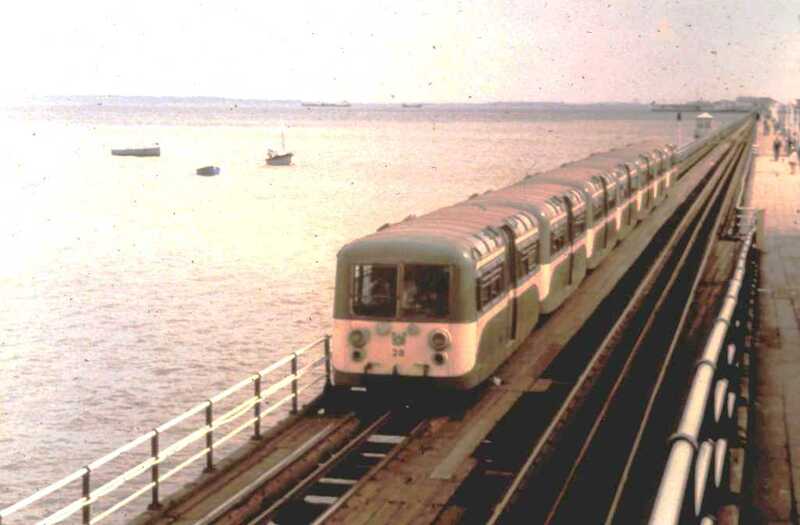 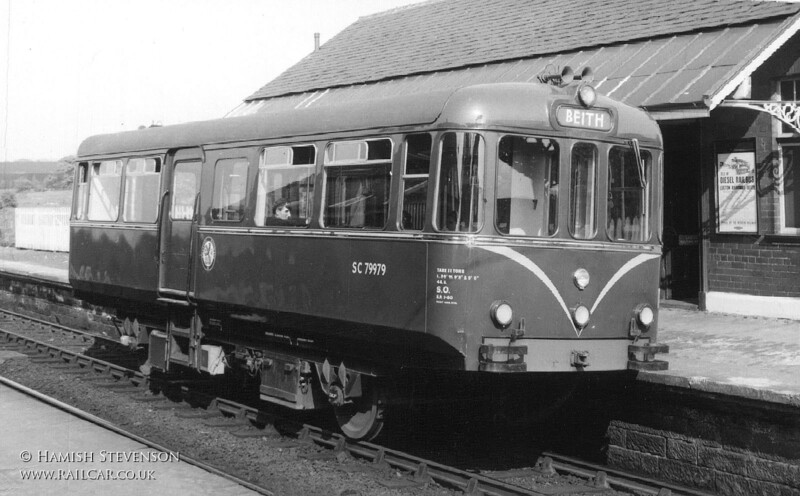 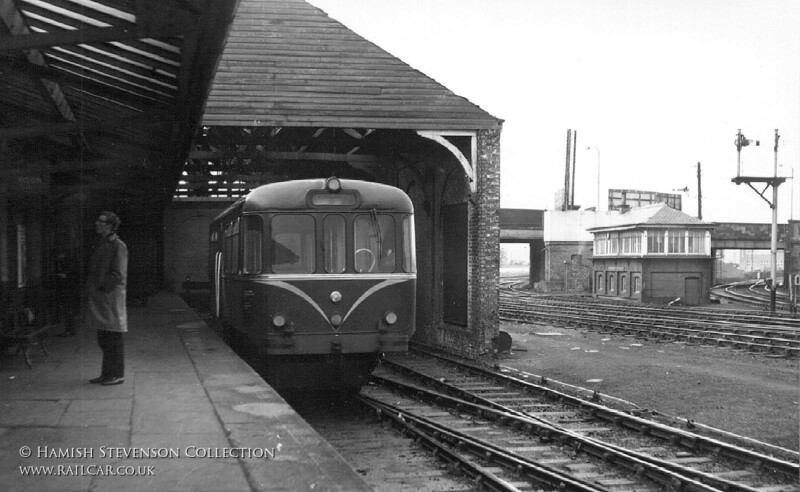 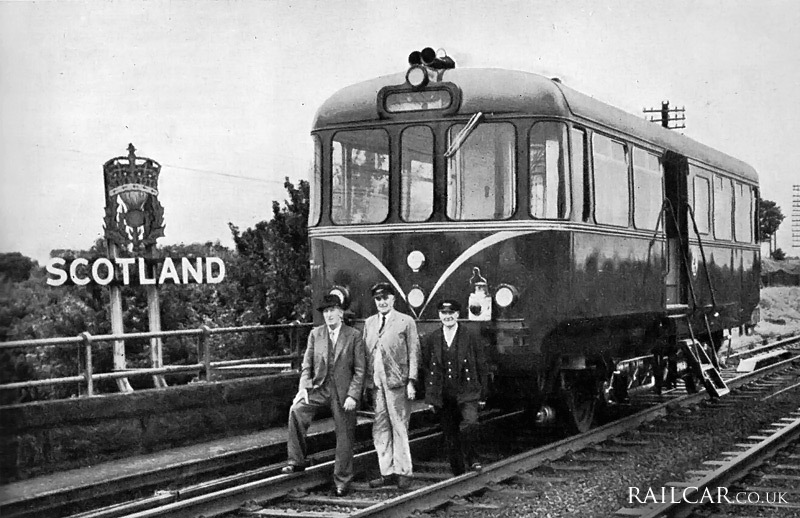 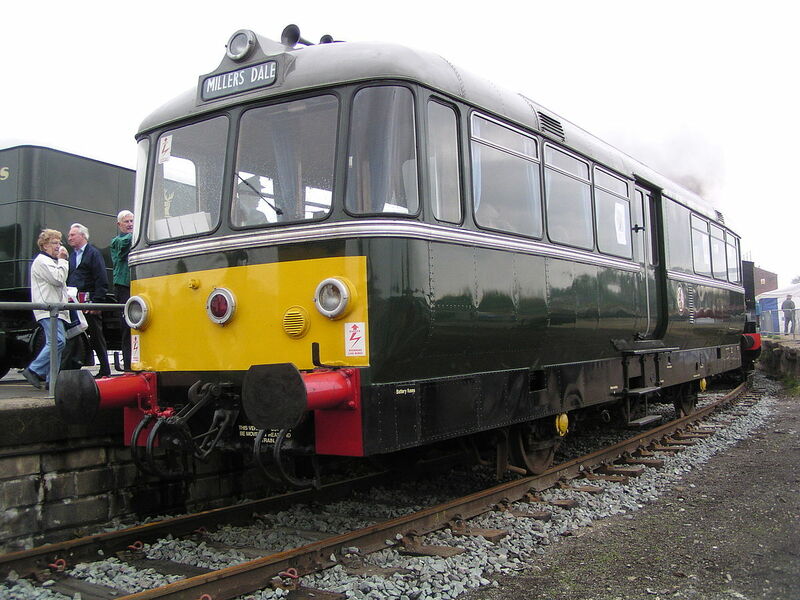 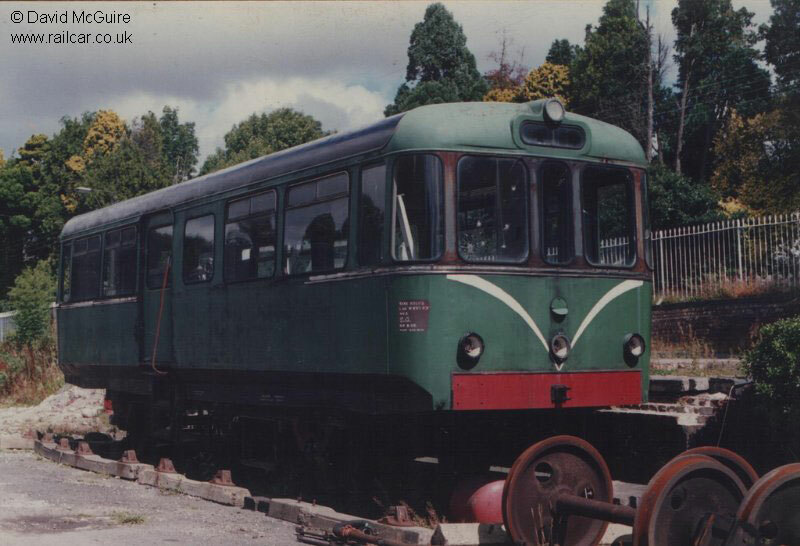 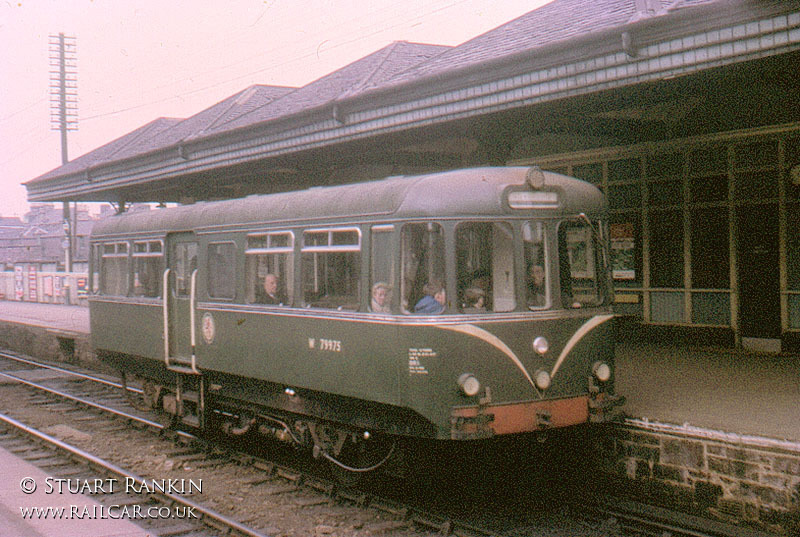 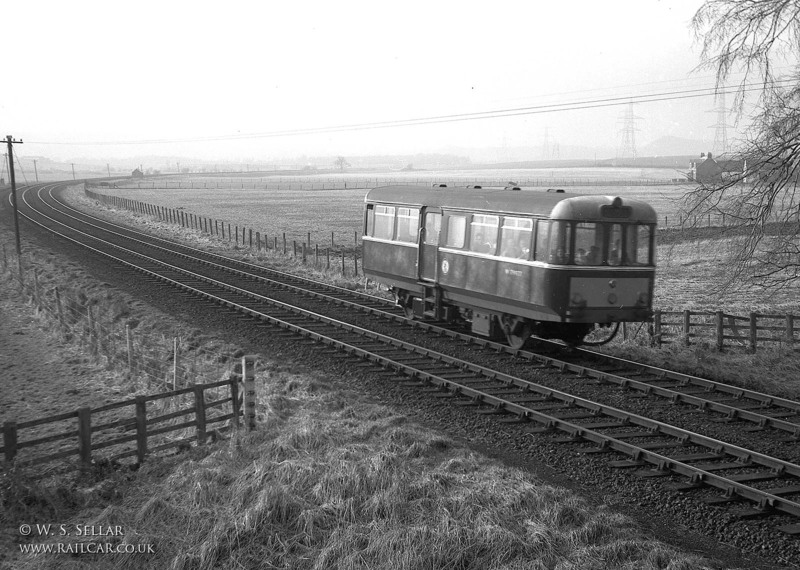 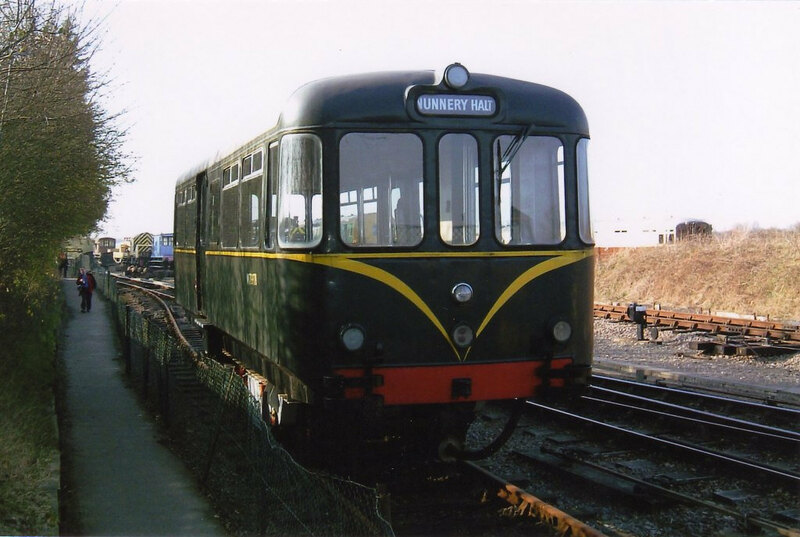 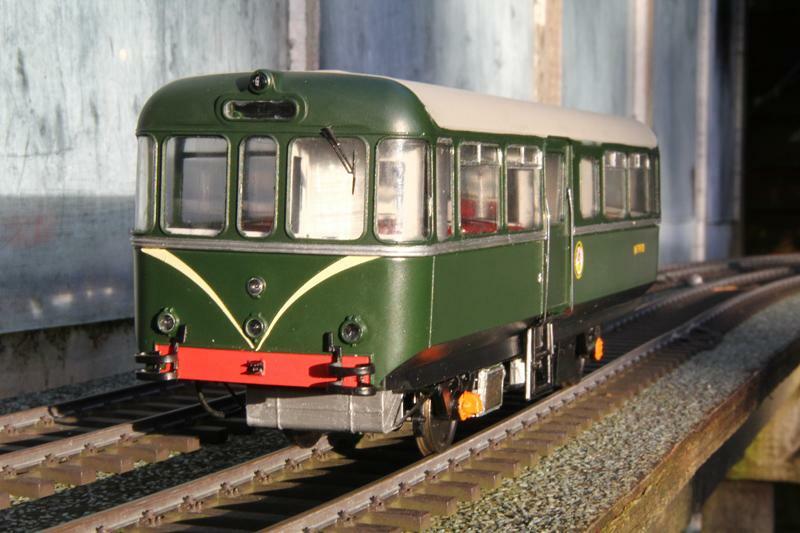 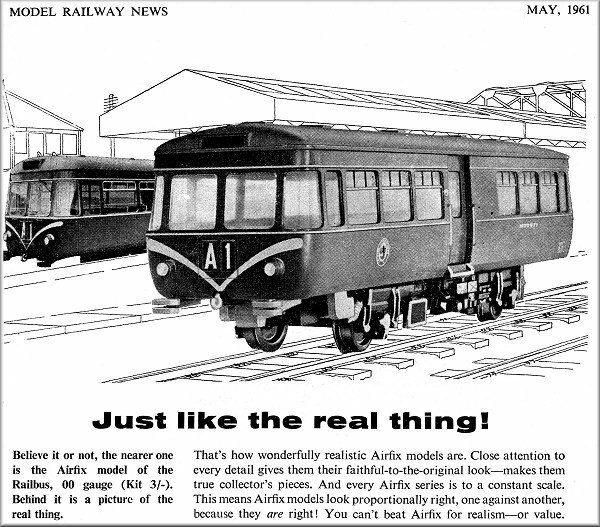 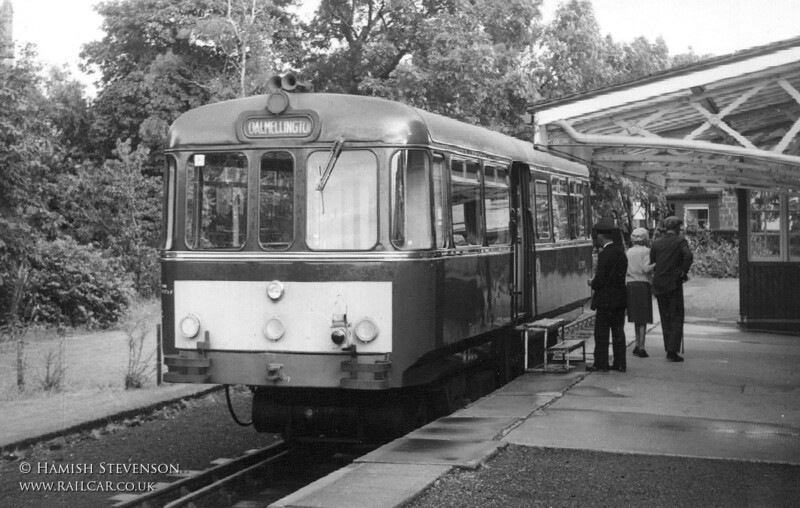 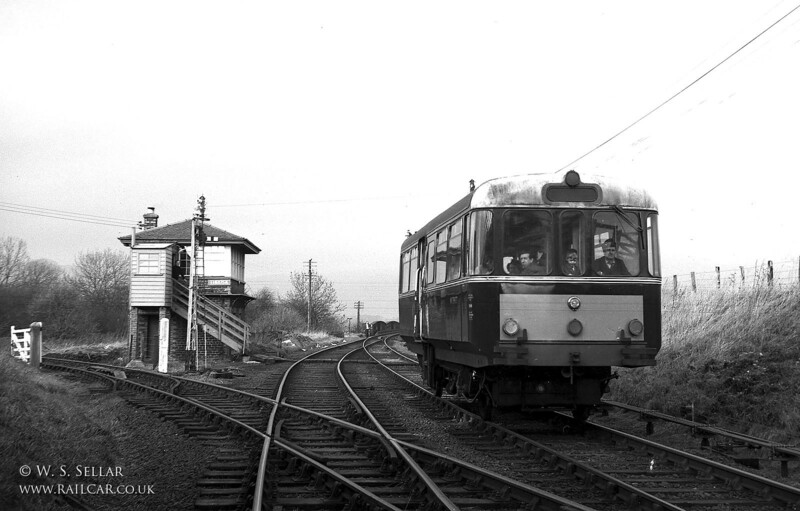 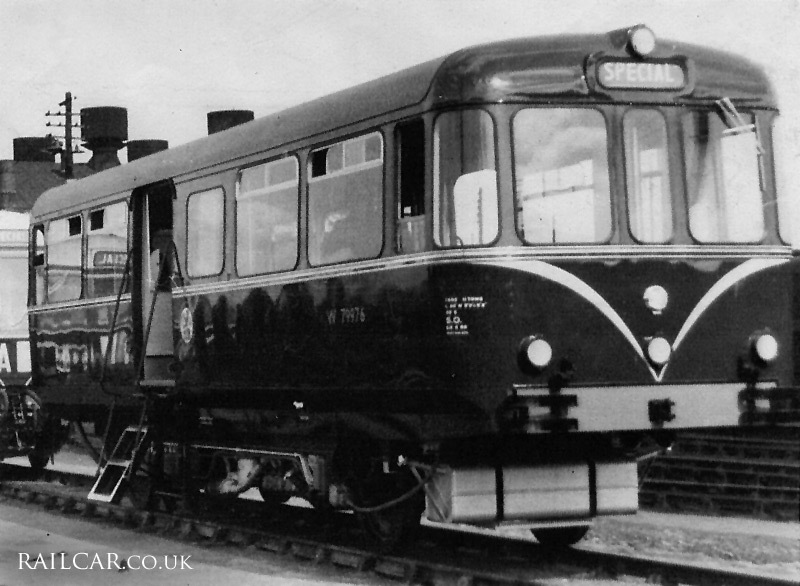 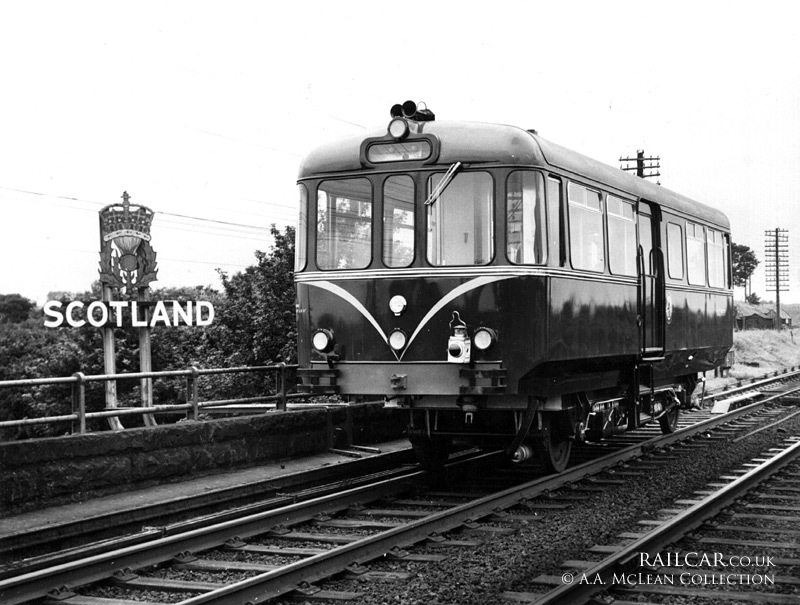 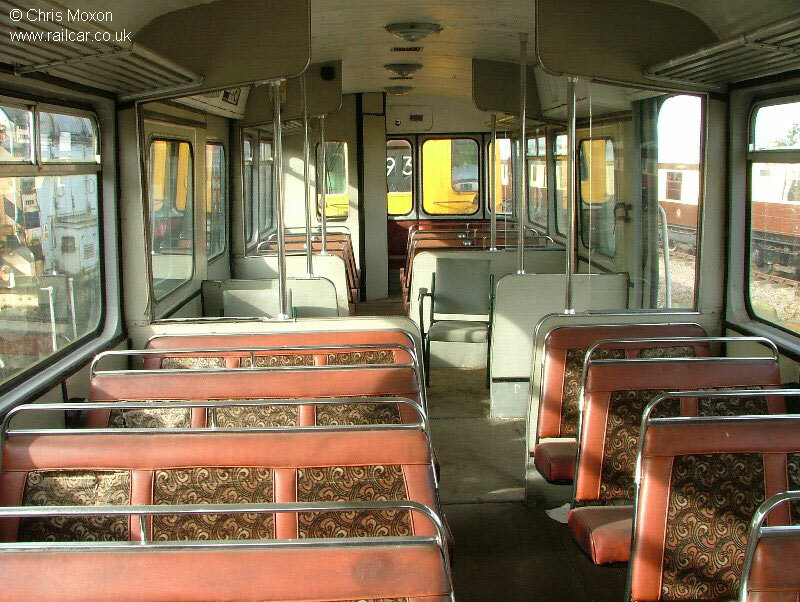 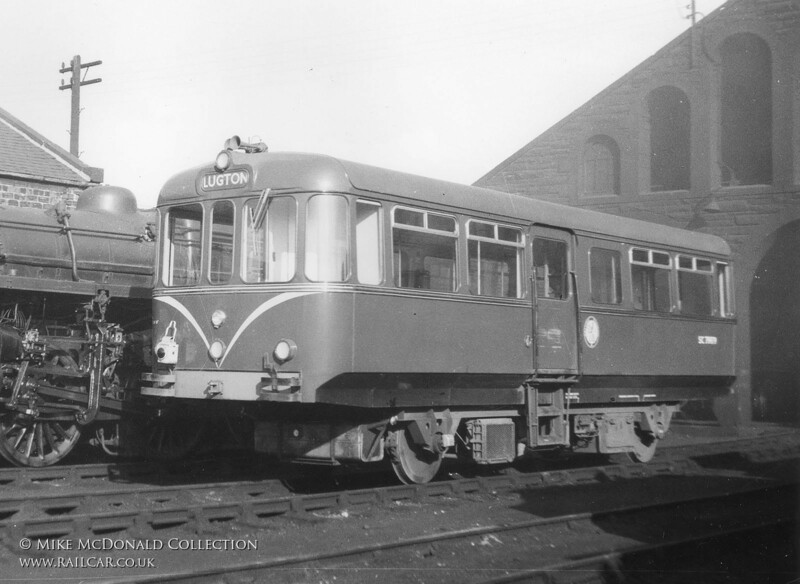 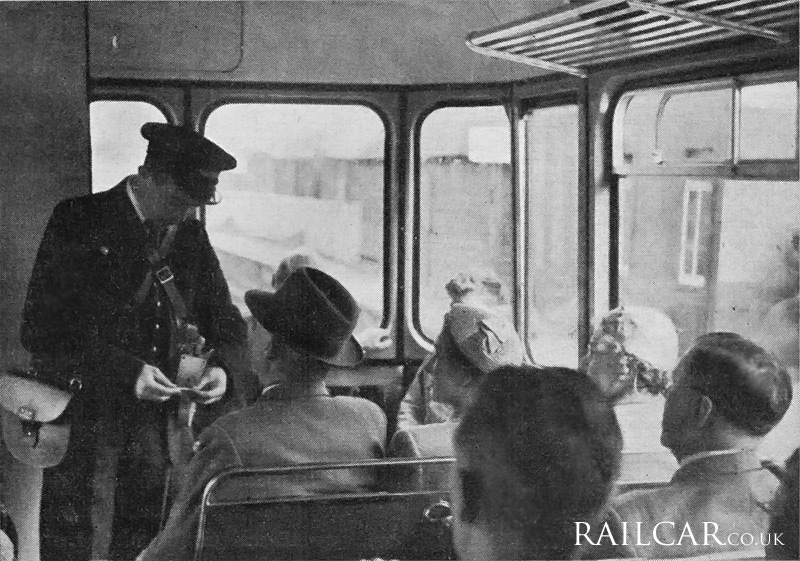 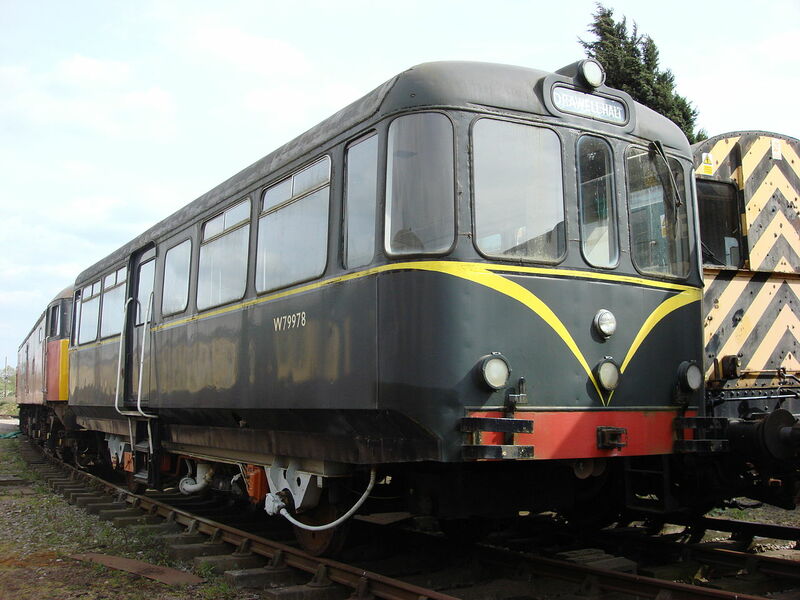 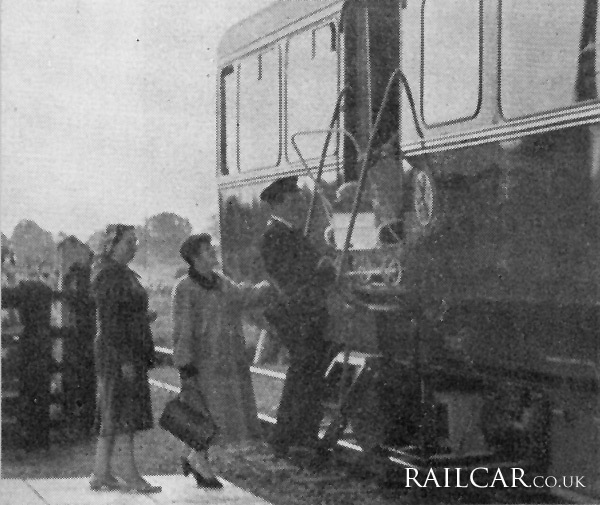 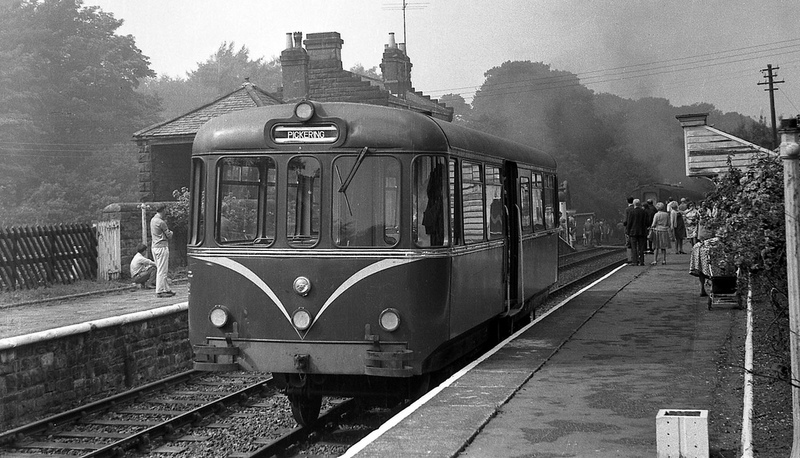 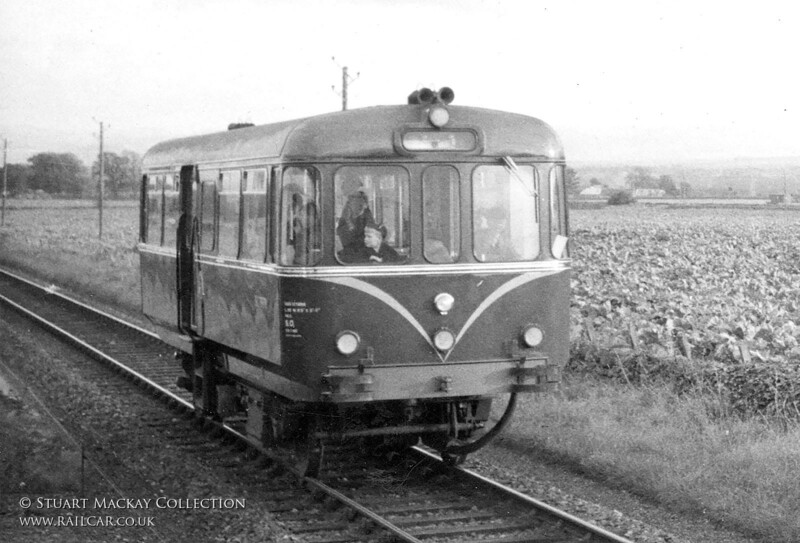 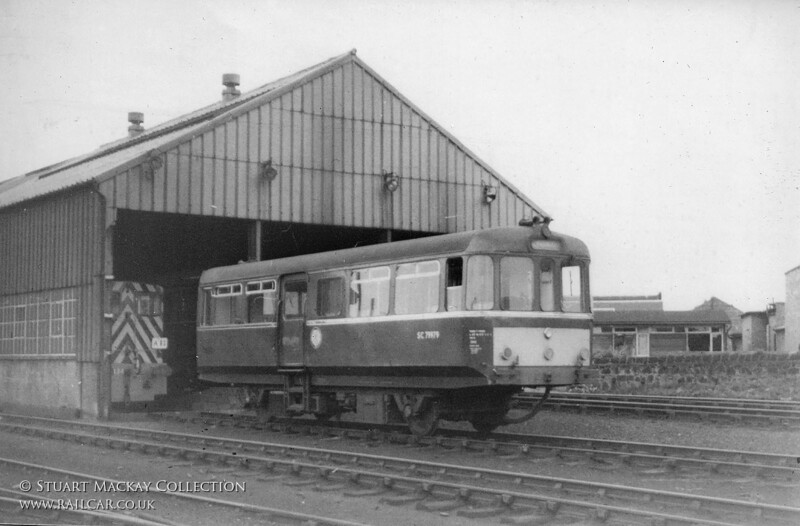 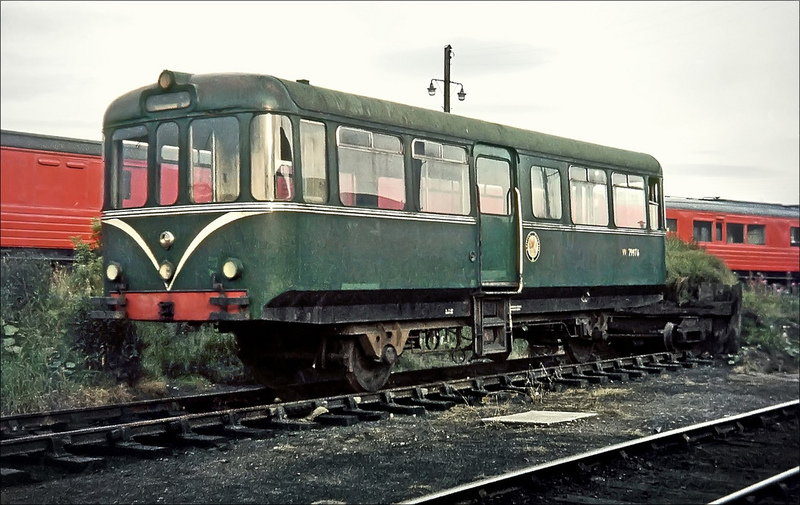 In 1949, AC Cars also produced four trains, each consisting three power cars and four coaches, for the Southend Pier Railway in Essex. 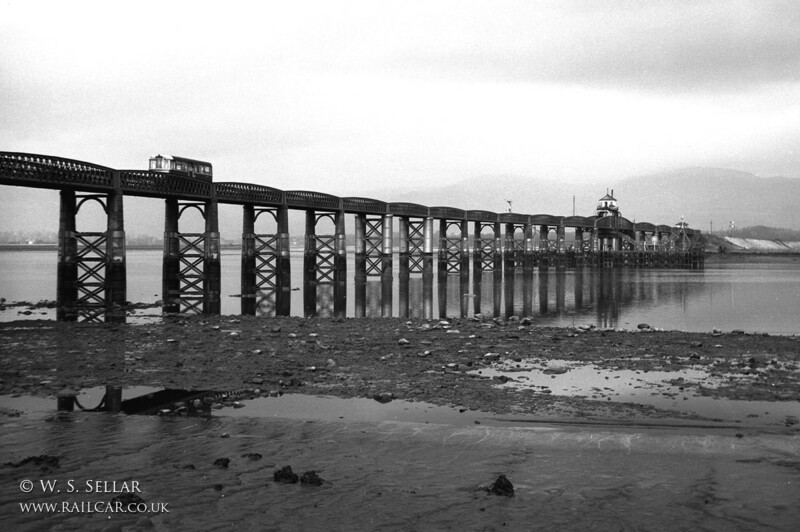 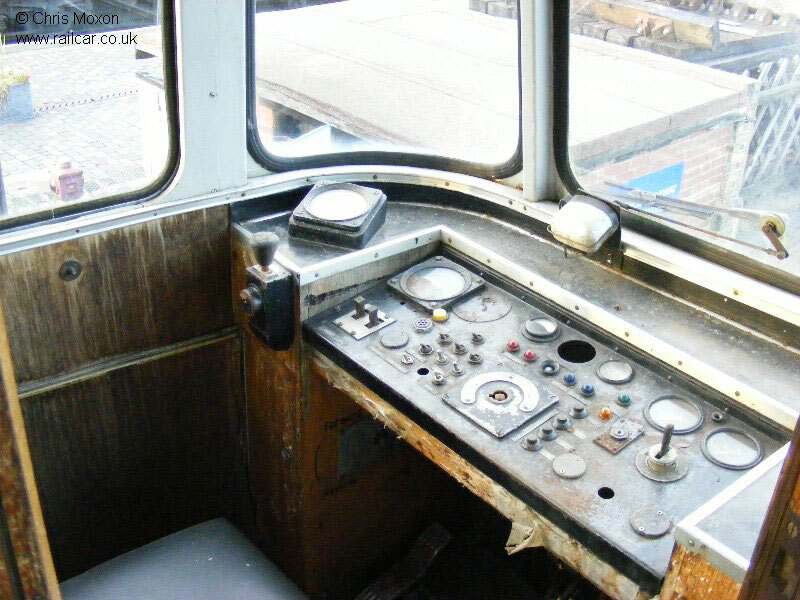 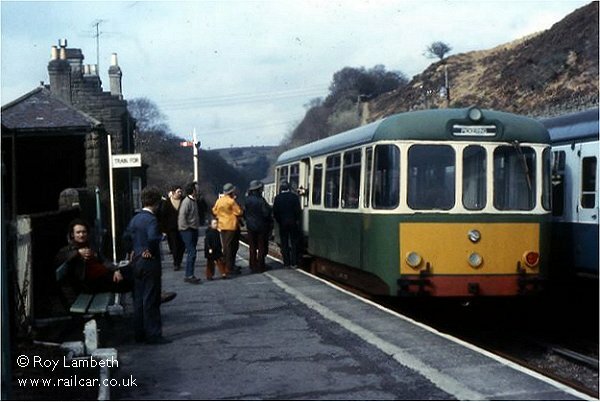 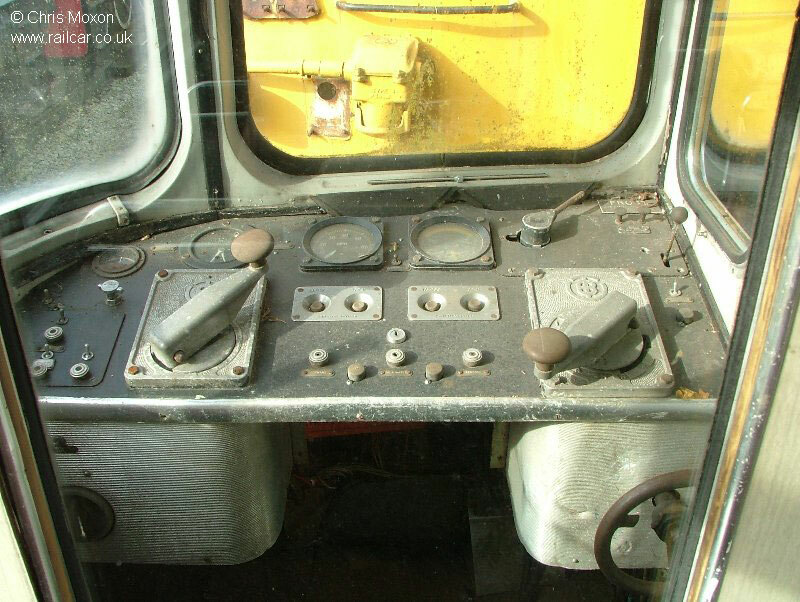 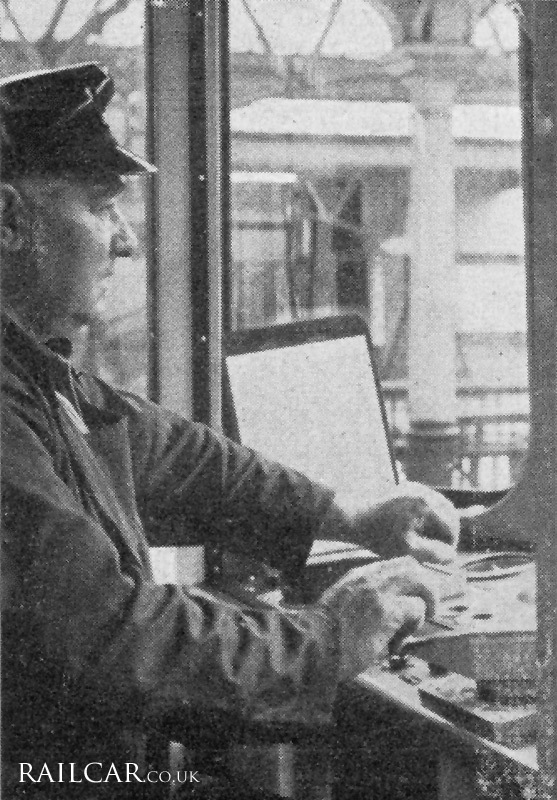 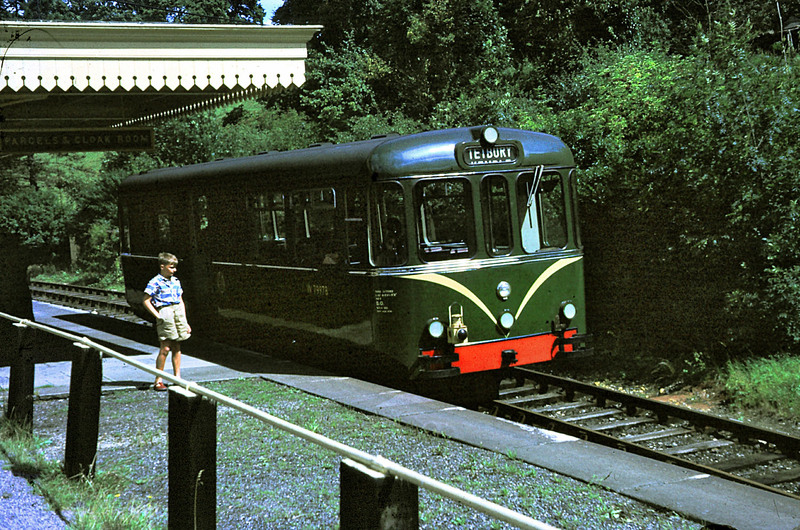 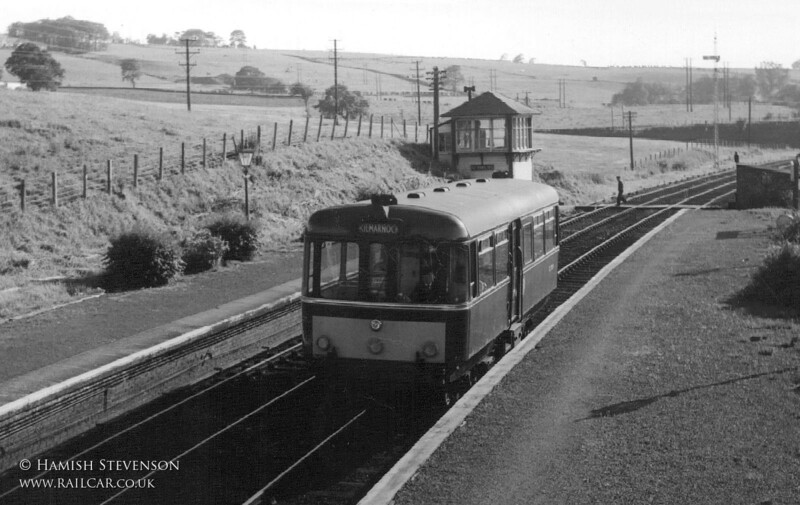 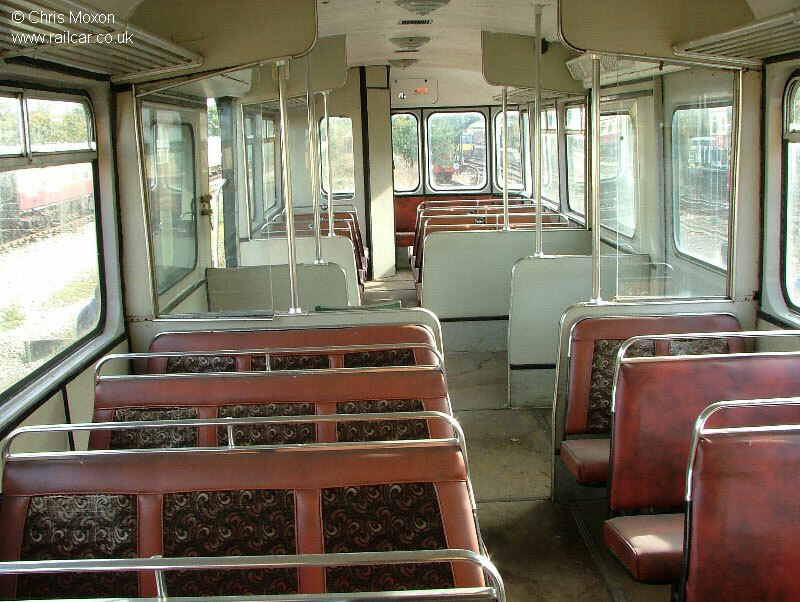 These remained in use until 1976. 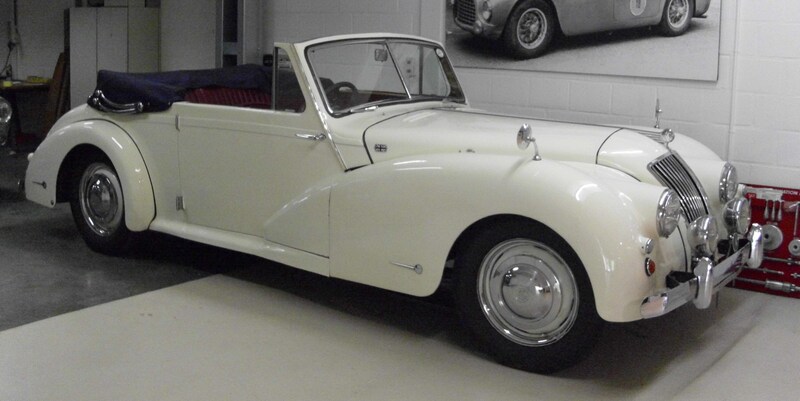 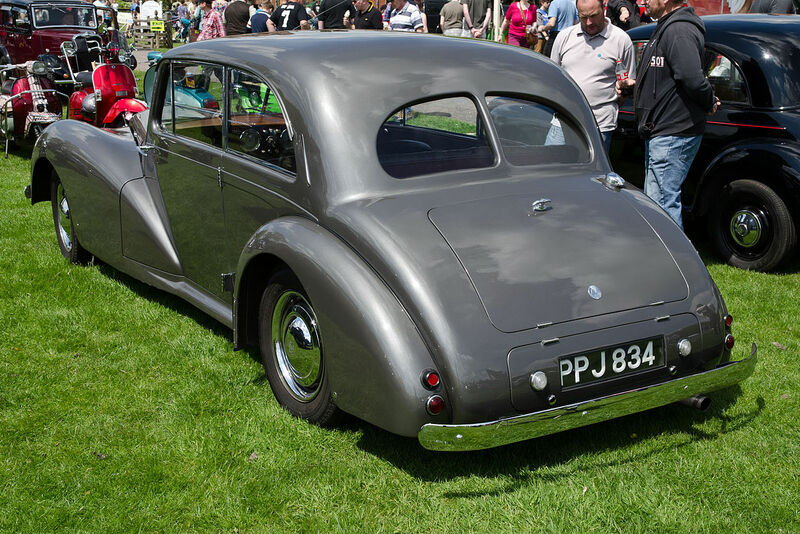 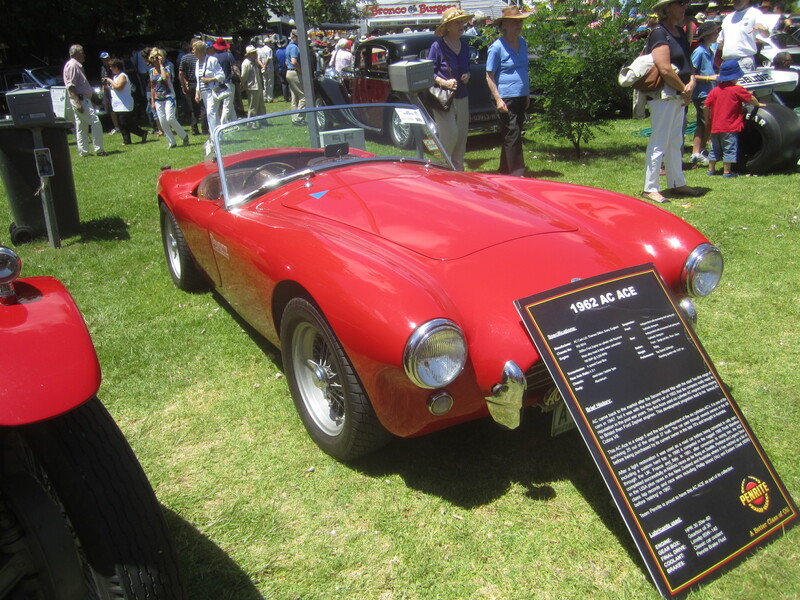 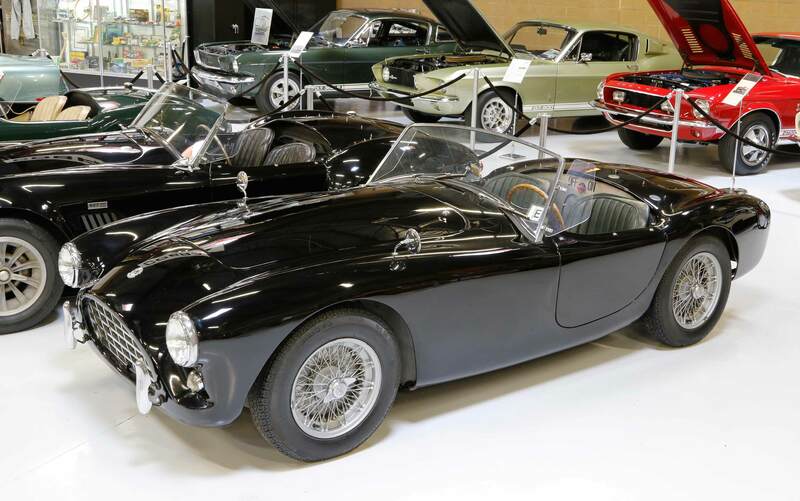 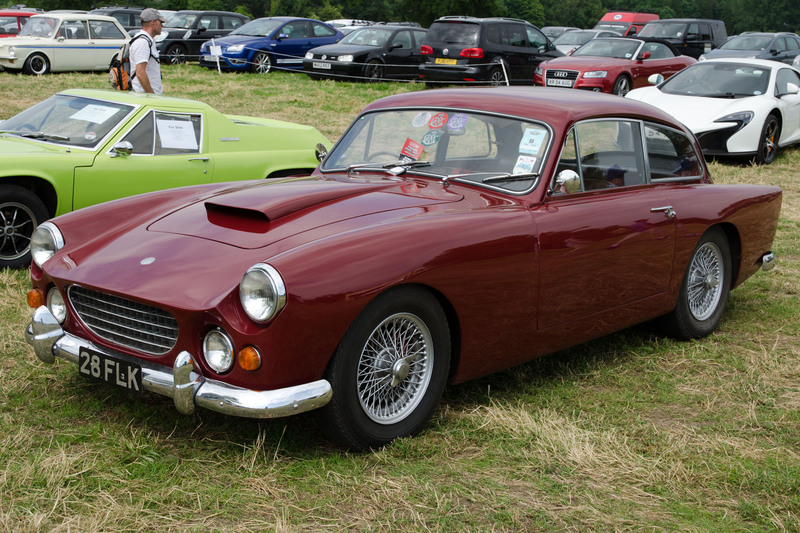 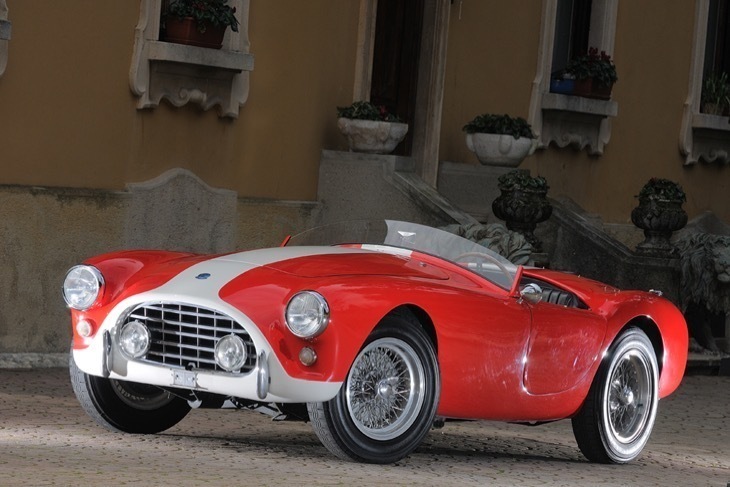 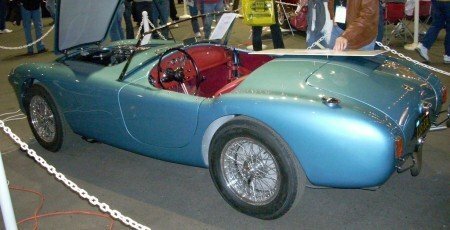 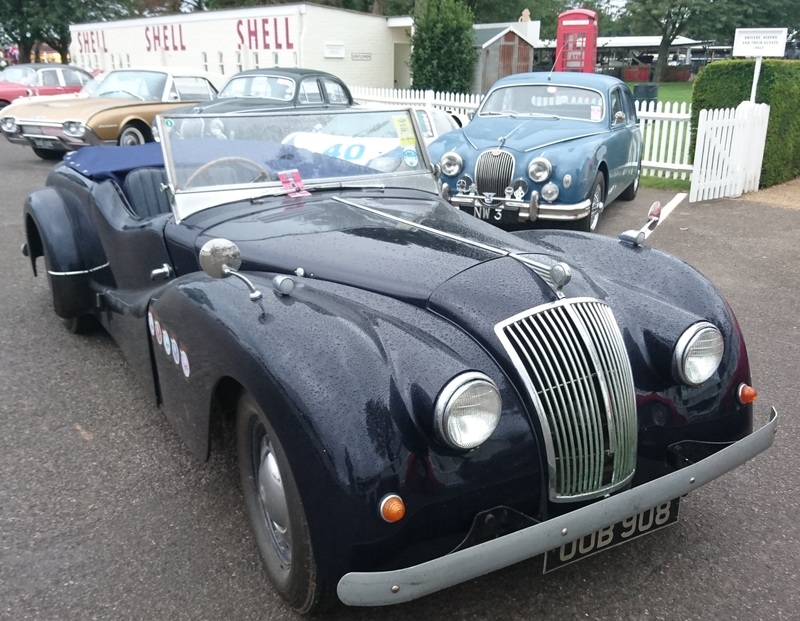 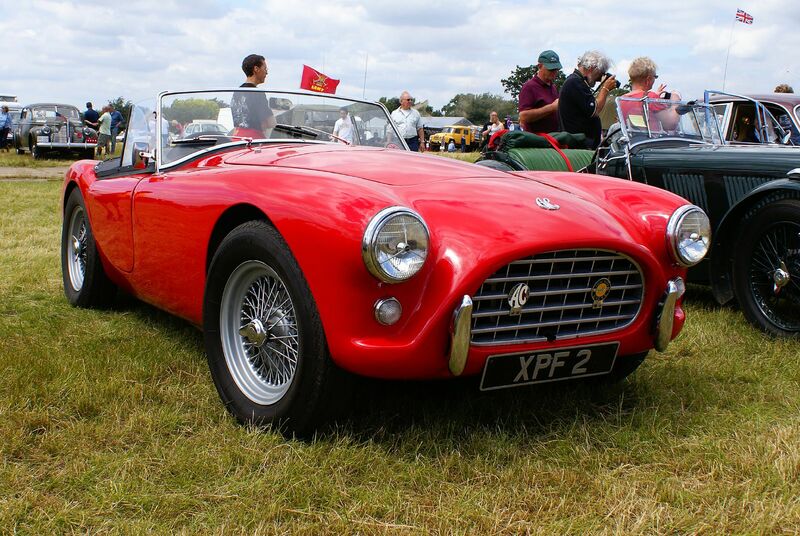 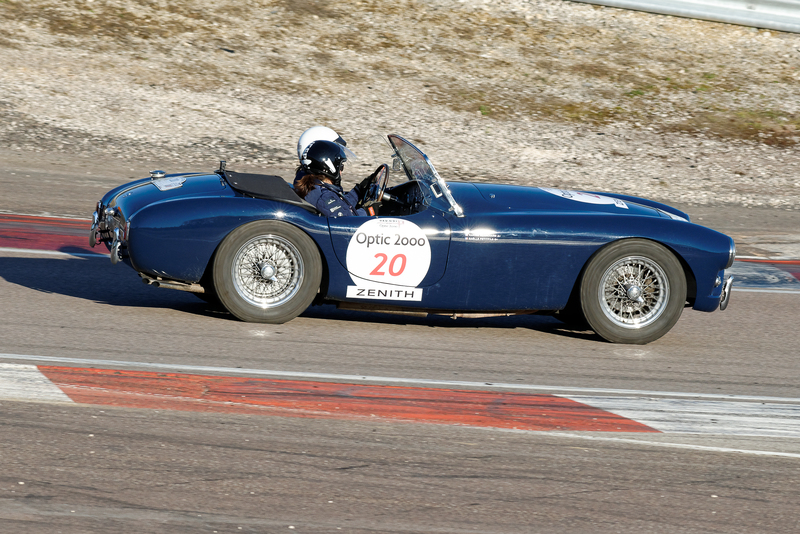 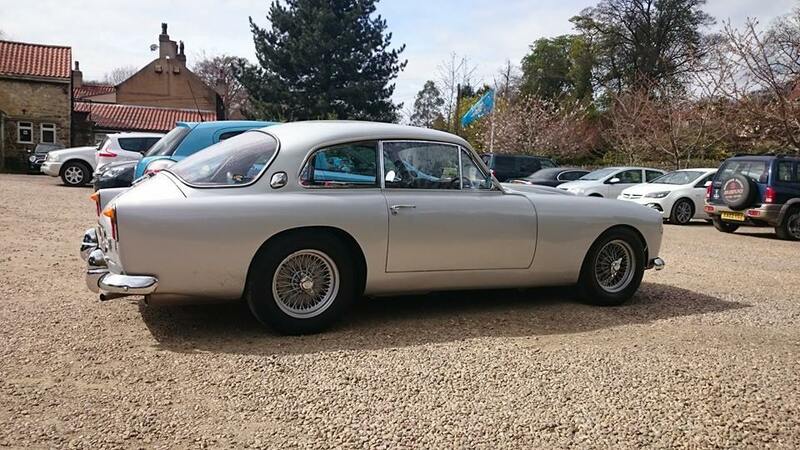 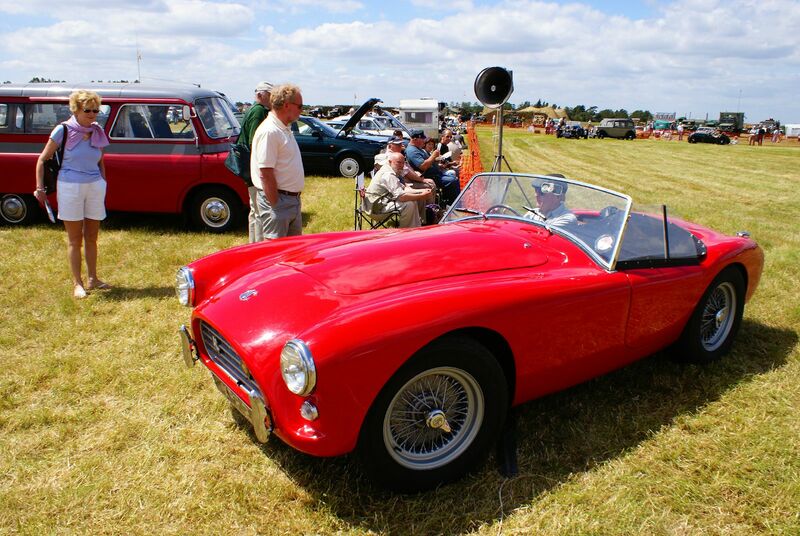 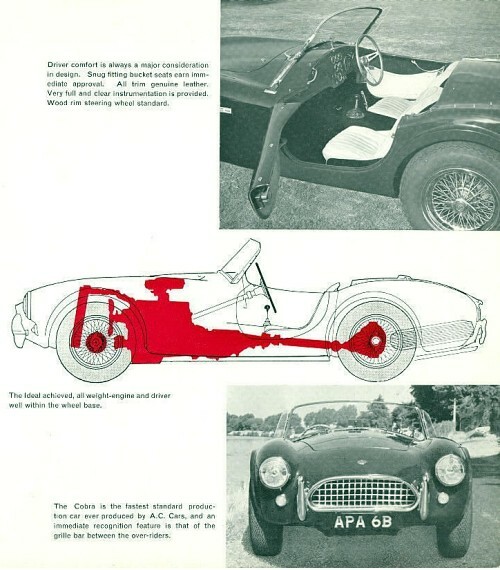 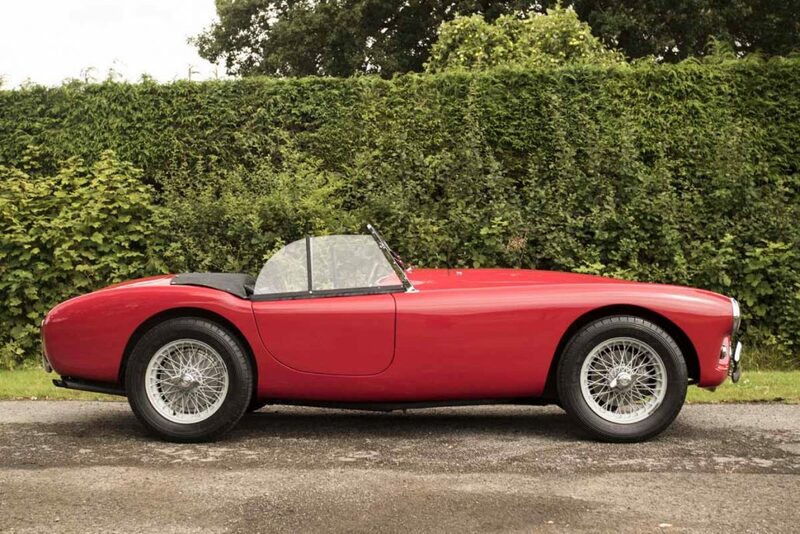 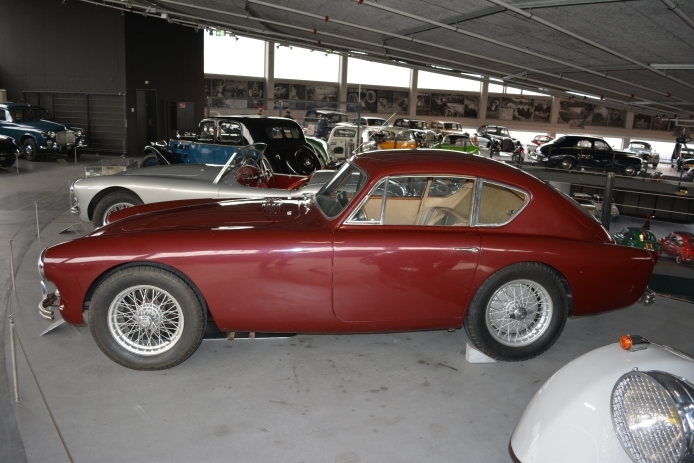 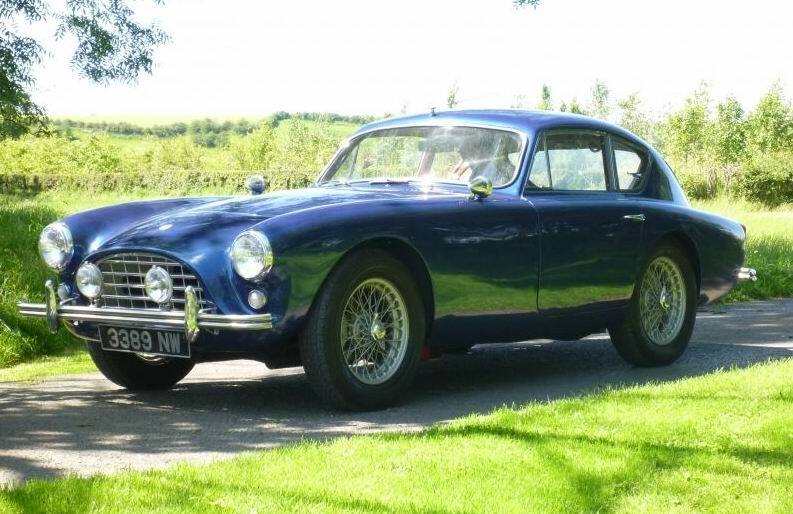 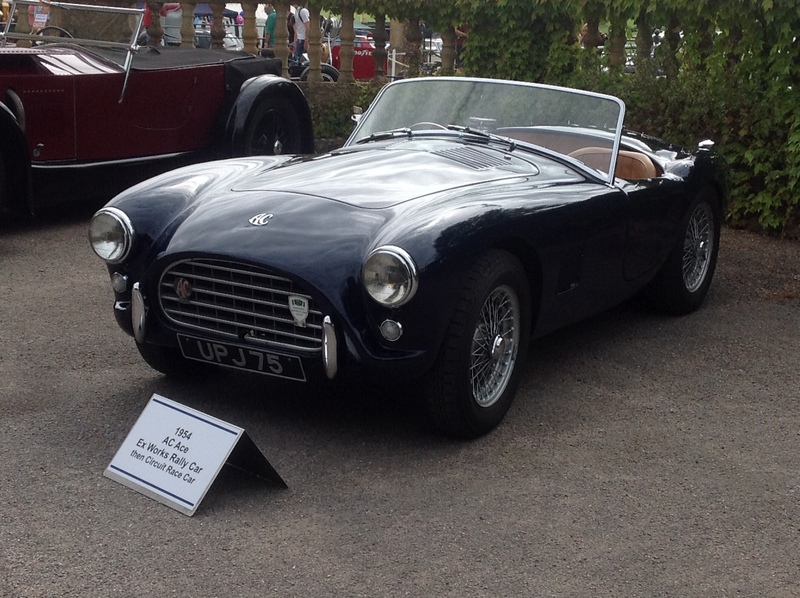 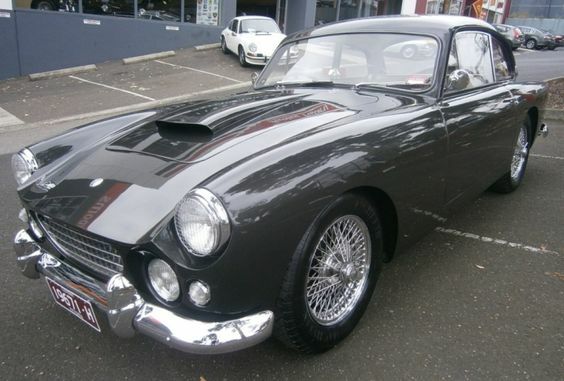 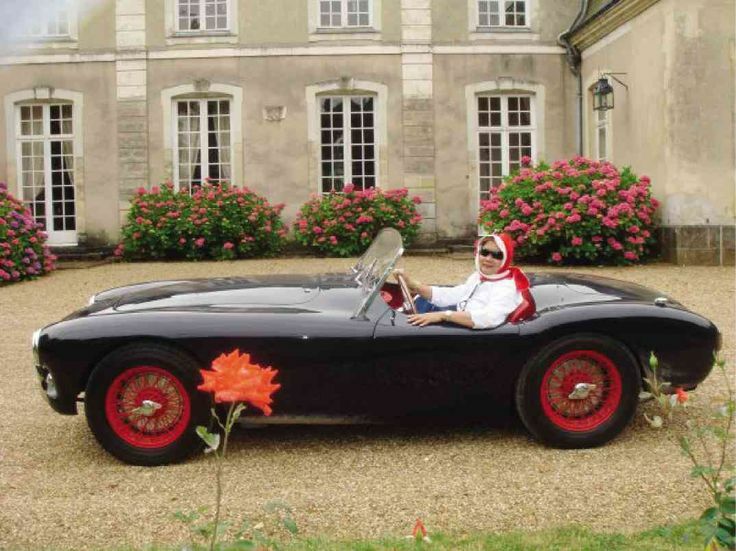 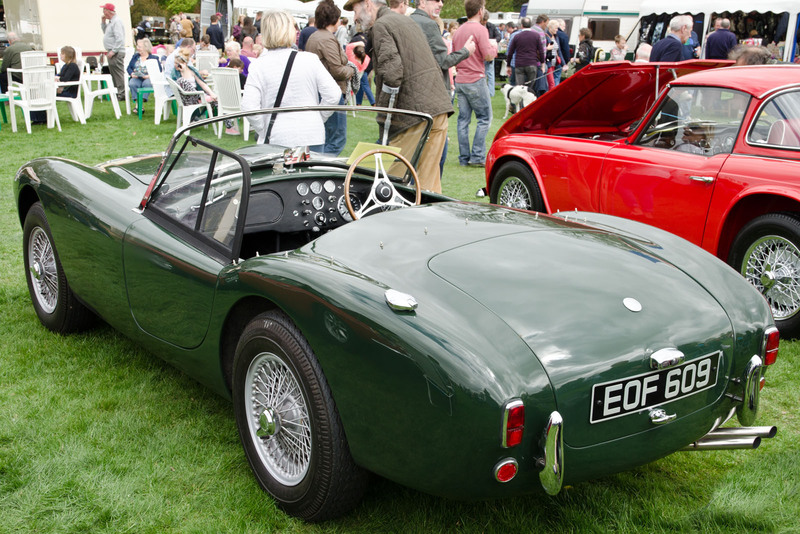 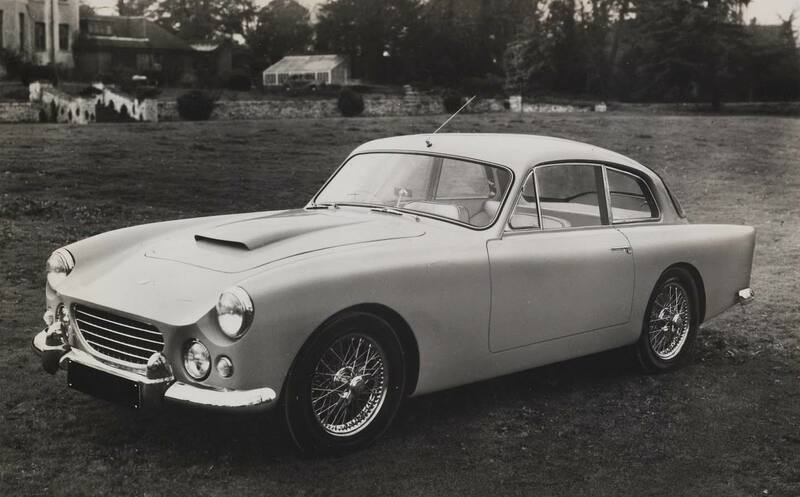 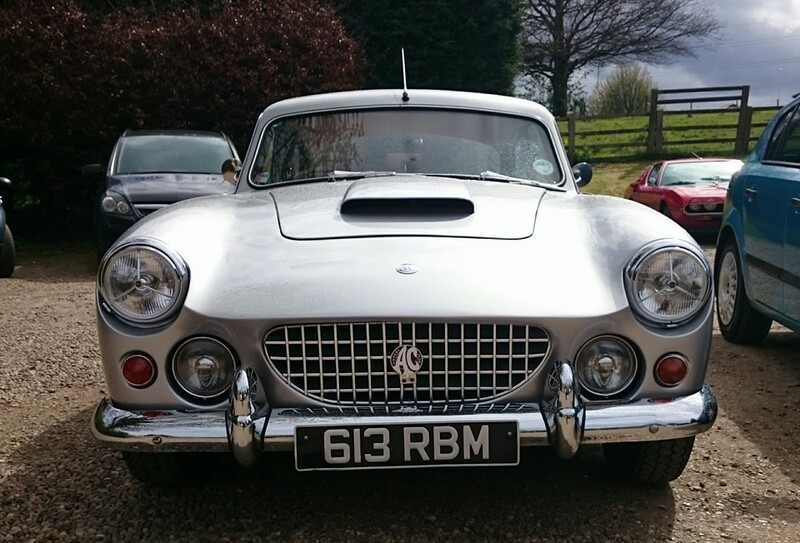 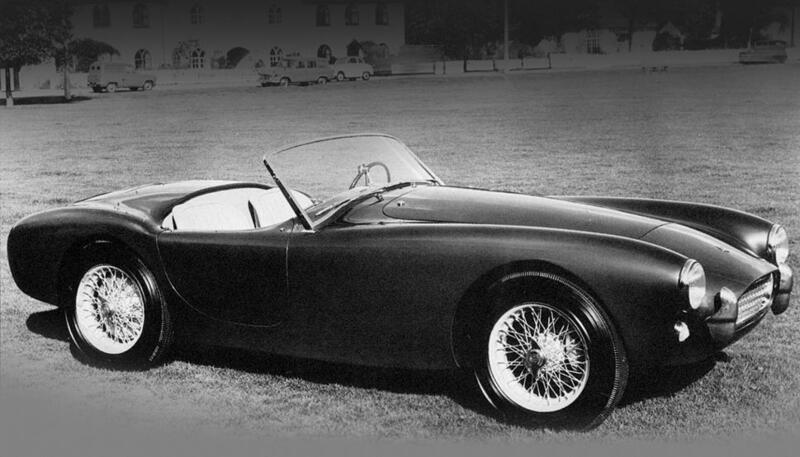 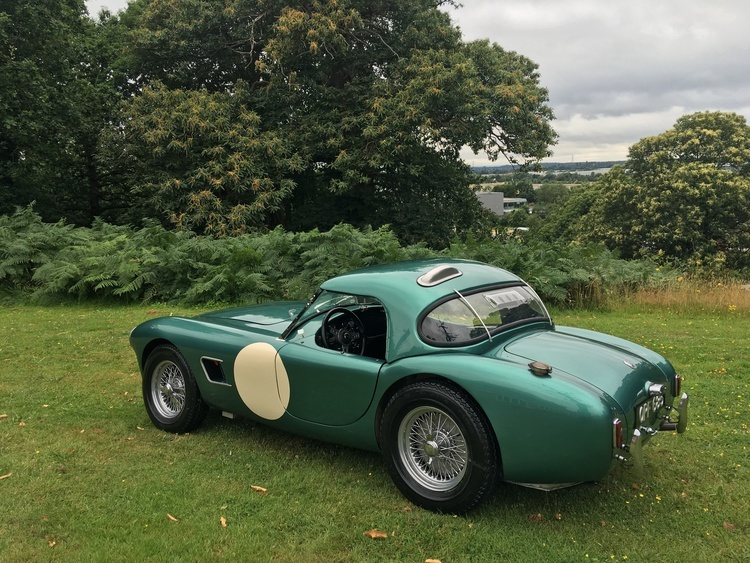 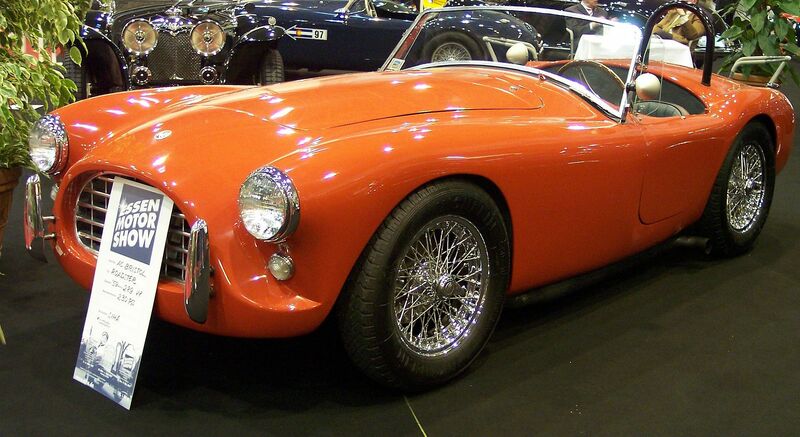 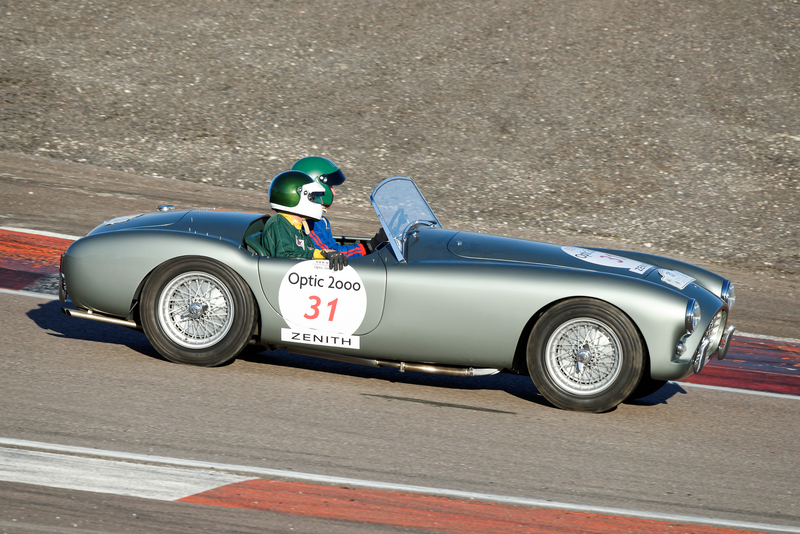 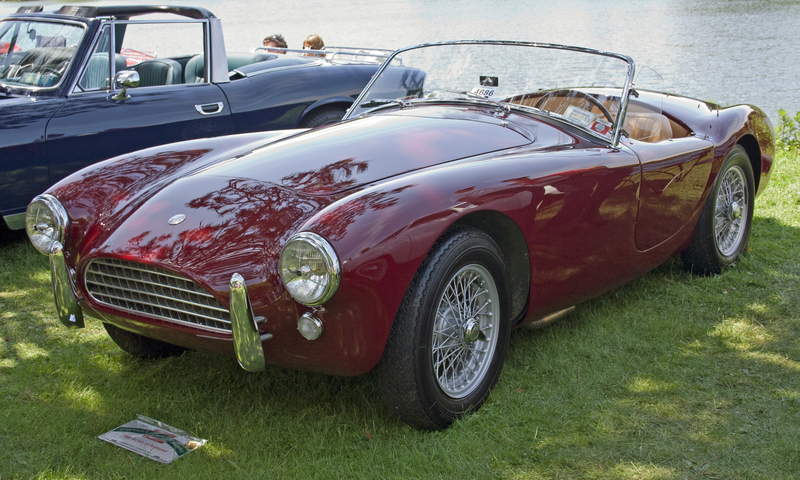 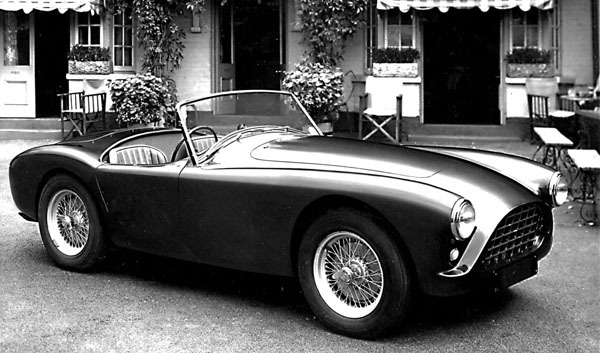 In 1953, the firm began production of the AC Ace, based on a lightweight chassis designed by John Tojeiro and Hand built Aluminium Body designed and built by Eric George Gray with the venerable Weller-designed 2-Litre engine. 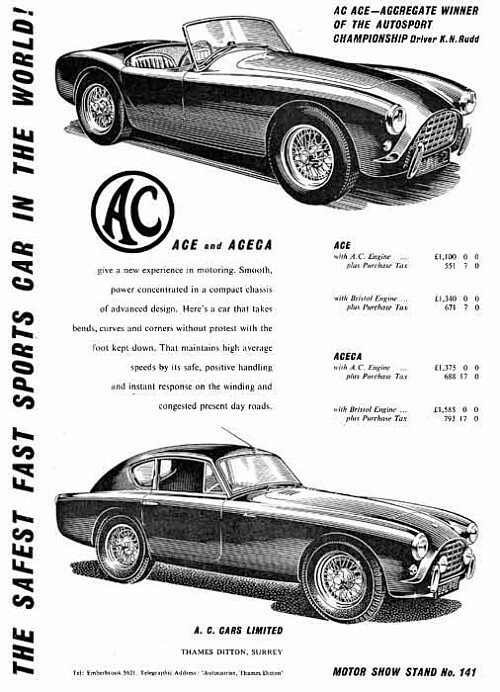 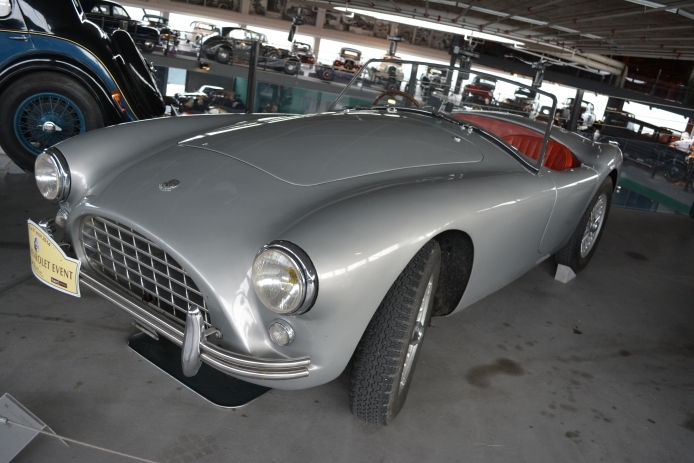 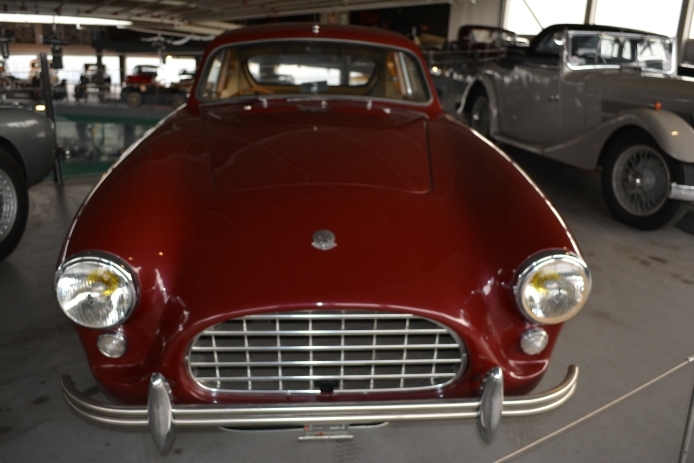 For 1954, a new aluminum-bodied closed coupe was unveiled at Earls Court, the AC Aceca. 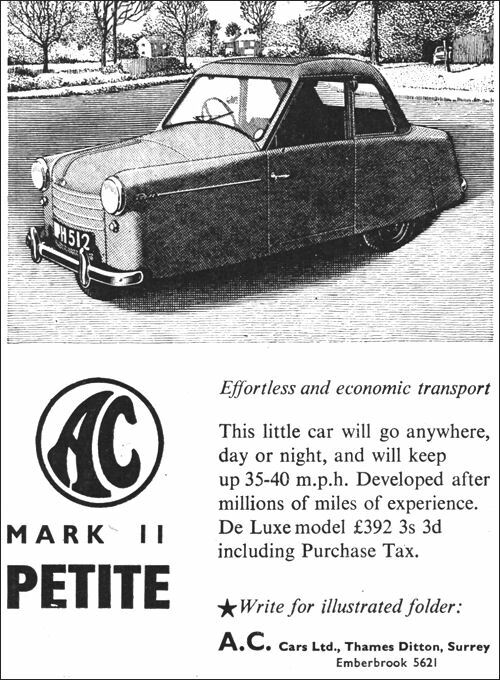 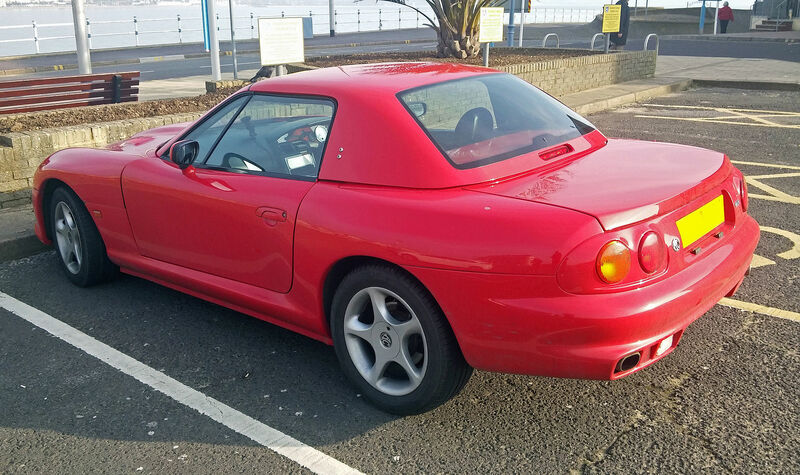 It was only slightly heavier than the convertible Ace, and because of better aerodynamics was actually slightly faster (128 mph (206 km/h) top speed). 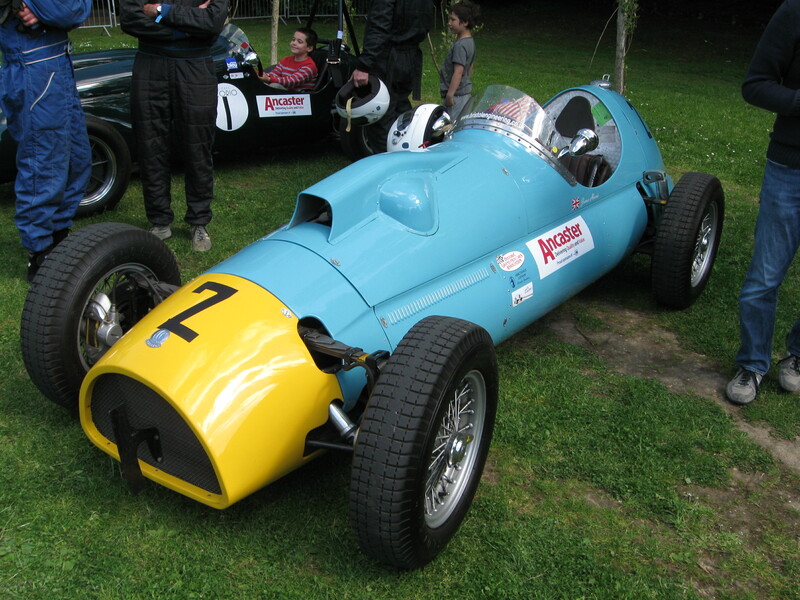 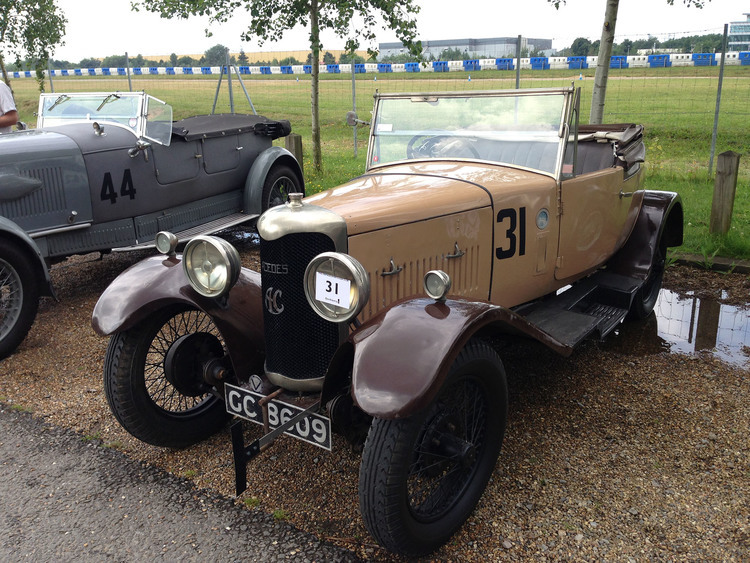 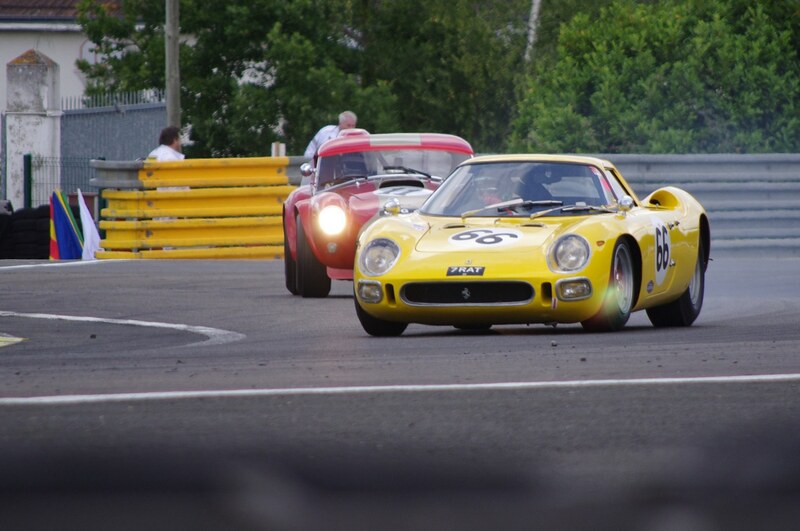 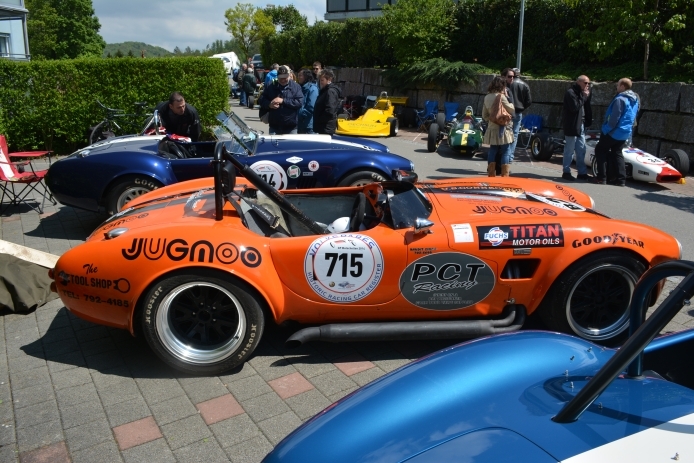 Today, Acecas are popular at historic racing events. 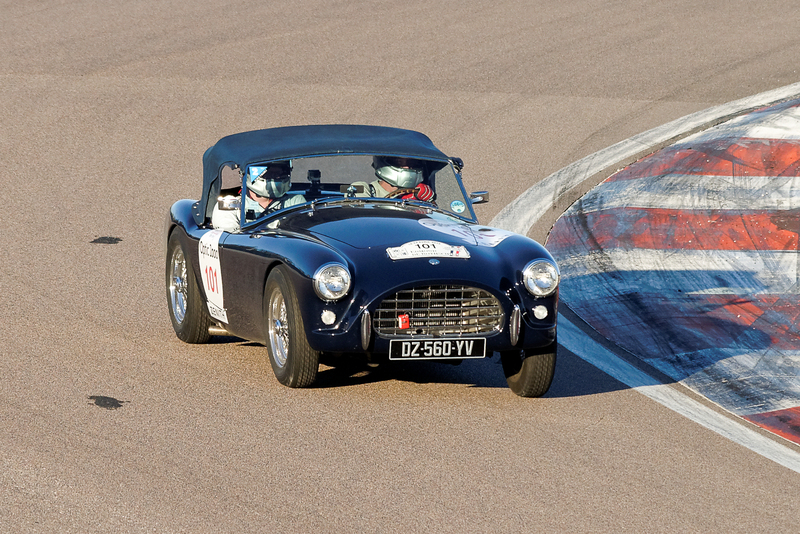 Arch McNeill, a factory Morgan racer from the 1940s, 1950s and 1960s told fellow Texan and Aceca owner Glenn Barnett that “the Morgan team spent two years campaigning to beat the factory AC Acecas and finally did in the late 1950s”. 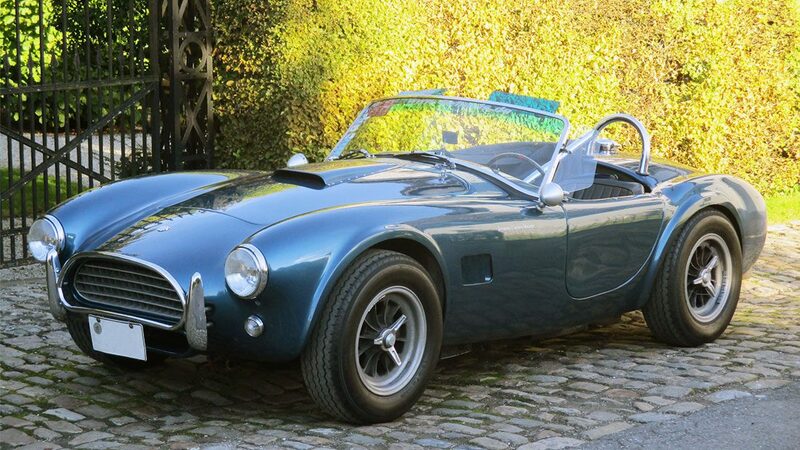 Though more valuable than comparable AC or Shelby replicas, the Aceca is still a bargain when compared to a Shelby CSX Cobra, while maintaining similar performance. 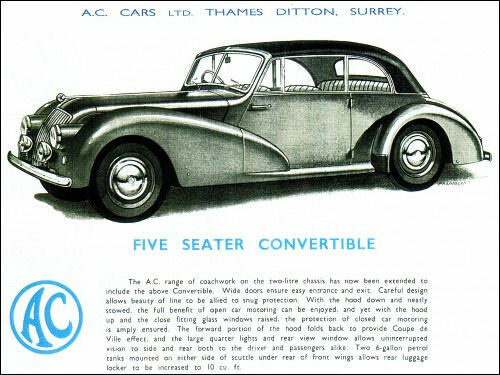 There was a demand from some customers for a larger four-seater car, for whom AC produced the Greyhound. 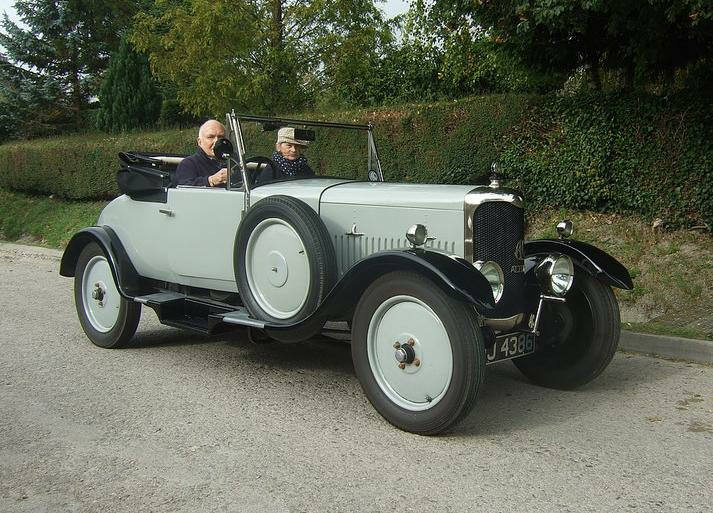 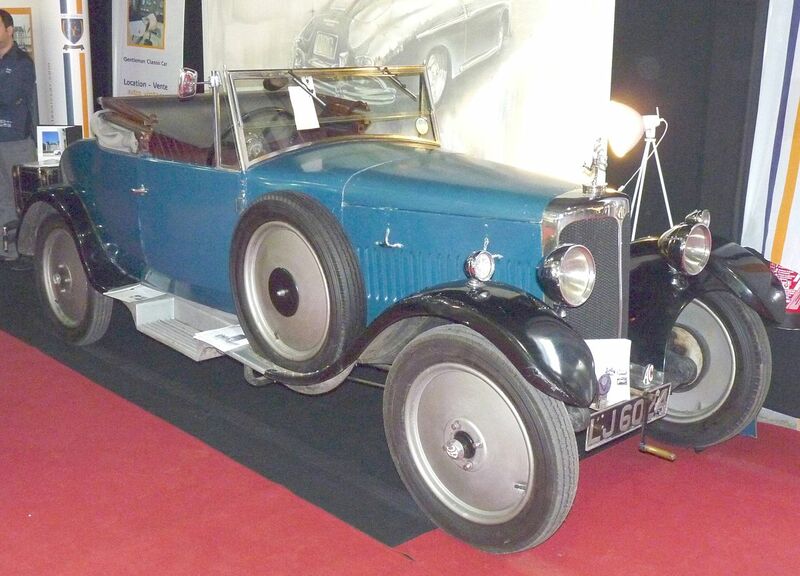 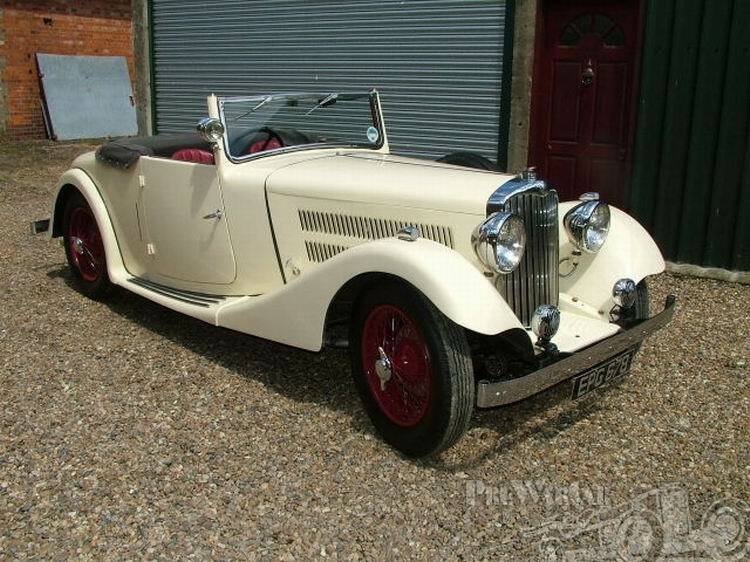 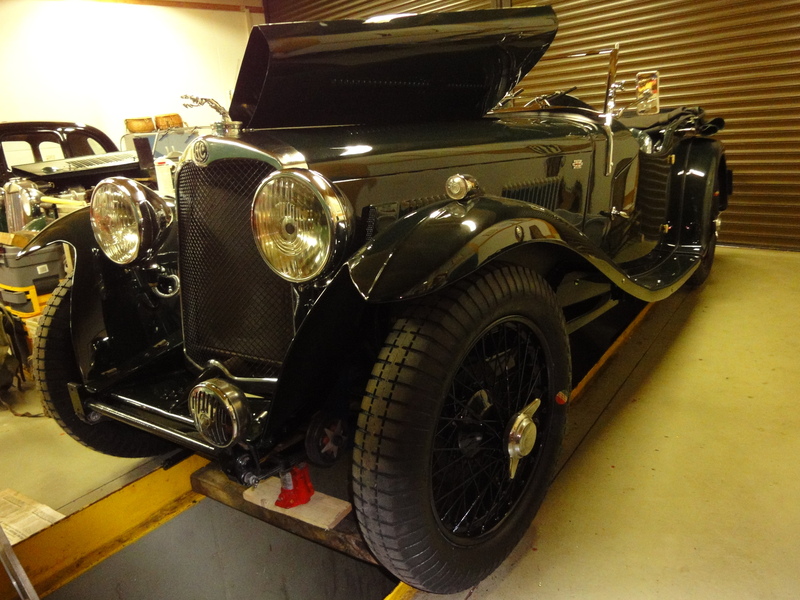 This was built on a stretched Ace chassis with coilsuspension all around and a 2.2-litre Bristol engine. 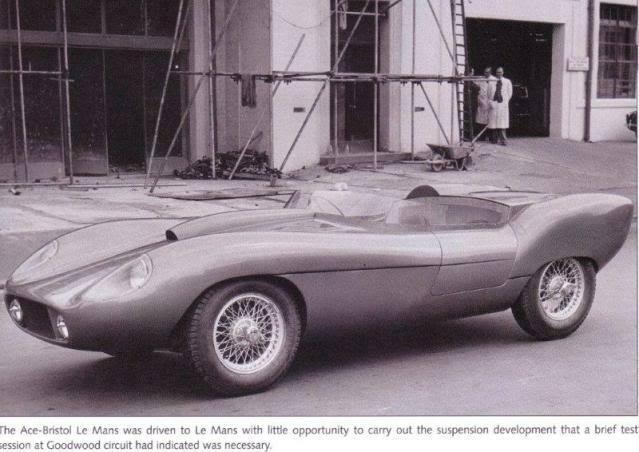 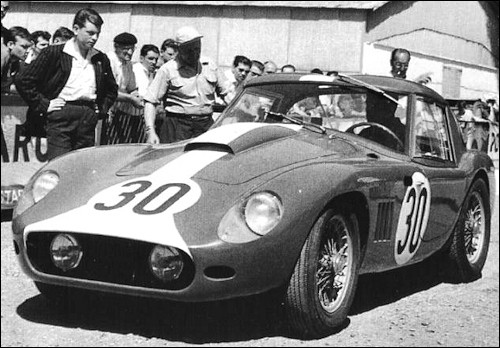 The AC Ace LM Prototype was a single piece from the year 1958 with the unusual chassis number LM5000, which John Tojeiro designed on behalf of the brothers Hurlock specifically for the AC factory at the 24 Hours of Le Mans and for further long distance racing. 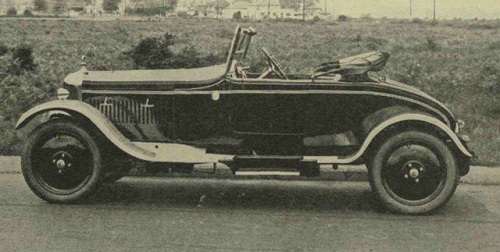 The vehicle was only 737-kilogram and differed fundamentally from the standard model: it had a load-bearing, lightweight, tubular steel frame without the massive ladder structure, a new front axle with single wheel suspension, this time in the form of upper and lower triangular steering with coil spring / shock units, and a newly designed pendulum axle at the rear. 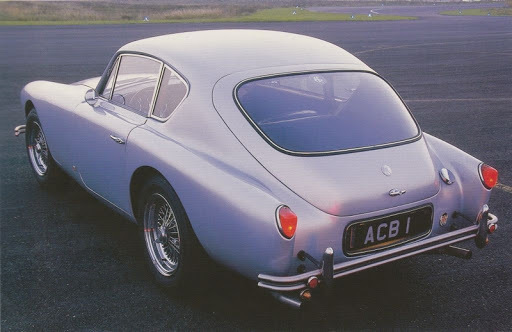 The open aluminium body was much flatter, with larger overhangs at the front and rear and aerodynamically rounded with a lowered down front and high tail. 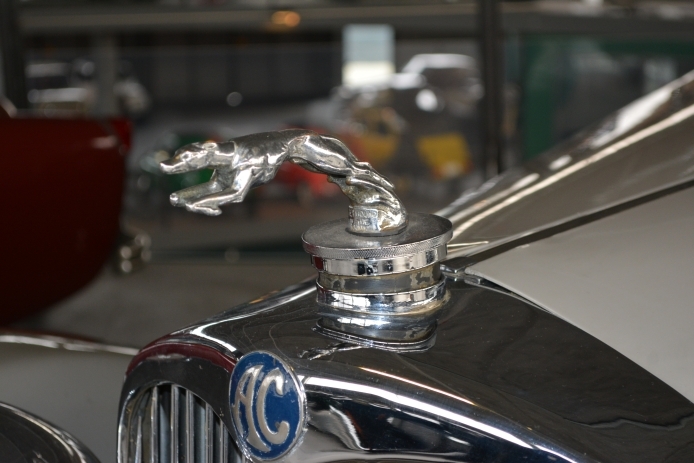 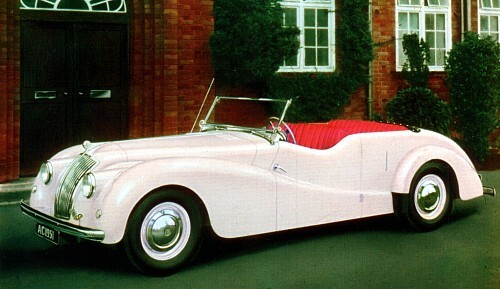 It was designed by the body builder Cavendish Morton. 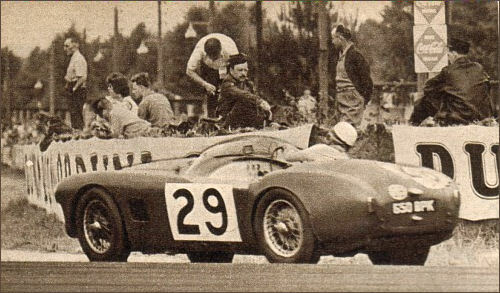 The engine/ transmission unit, a tuned production unit, came from the Bristol Type 100D2 / S. After a test ride on the Brooklands circuit, just a few kilometres from the AC factory, the prototype, which was not yet mature, completed two assignments in 1958: in June as a factory car in the Le Mans 24-hour race and in September in the Rudac Racing Team at the RAC Tourist Trophy at the Goodwood Circuit. 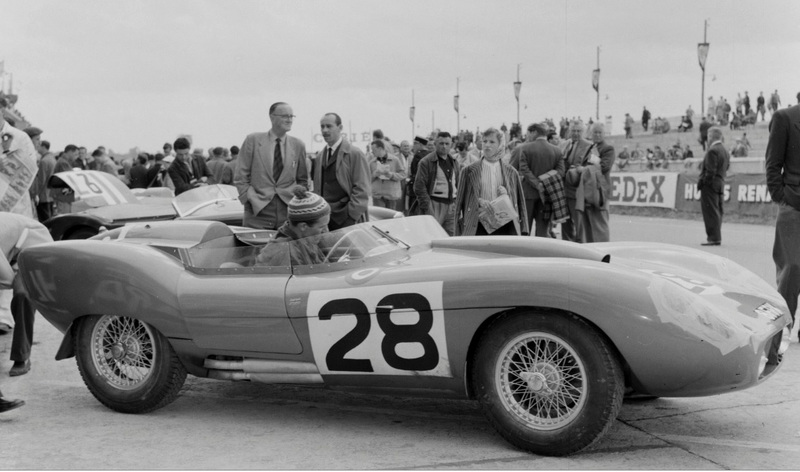 Due to changes in the regulations, the car was no longer able to compete in the next-class category in the FIA – Sportscar World Championship. 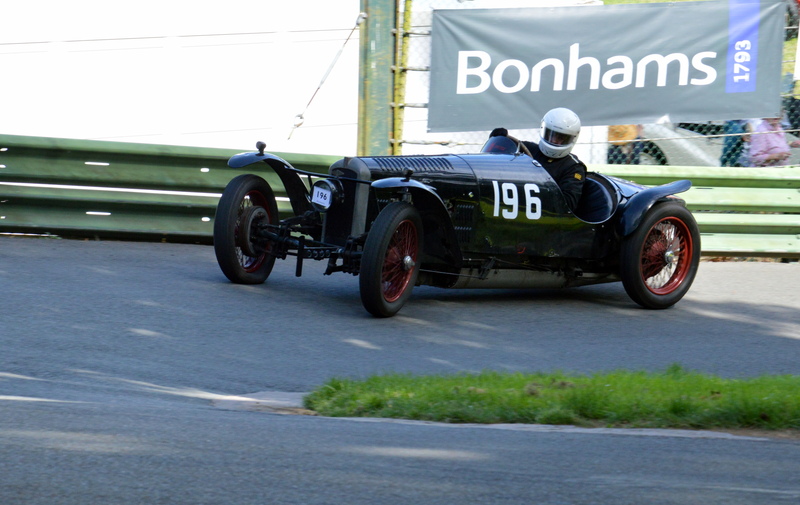 The ‘Bristol’ engine / gearbox unit went back there, the racing car was sold without drive and later rebuilt. 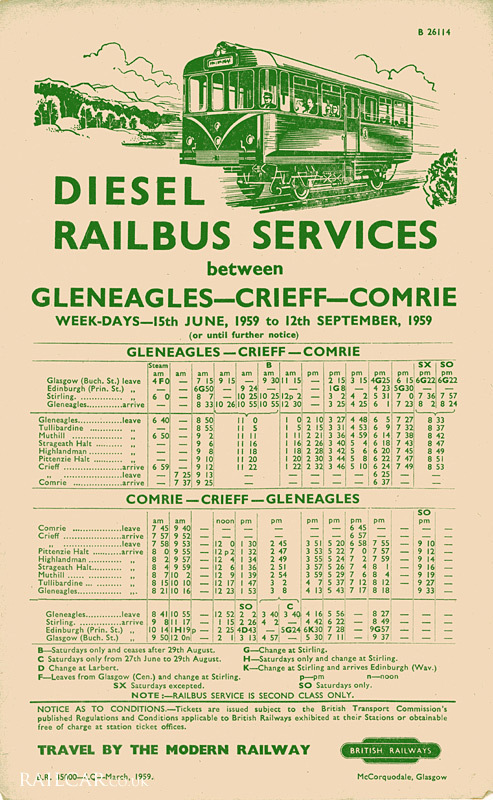 It still exists today as a collector’s item. 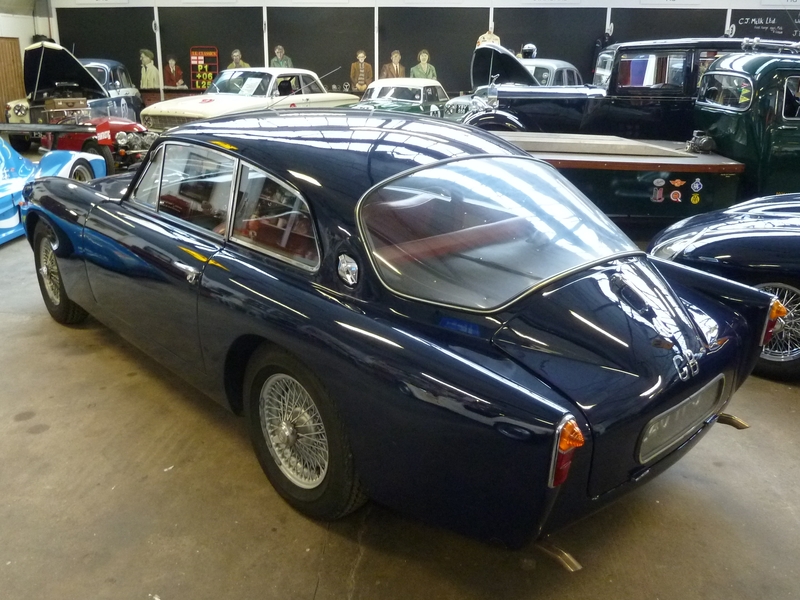 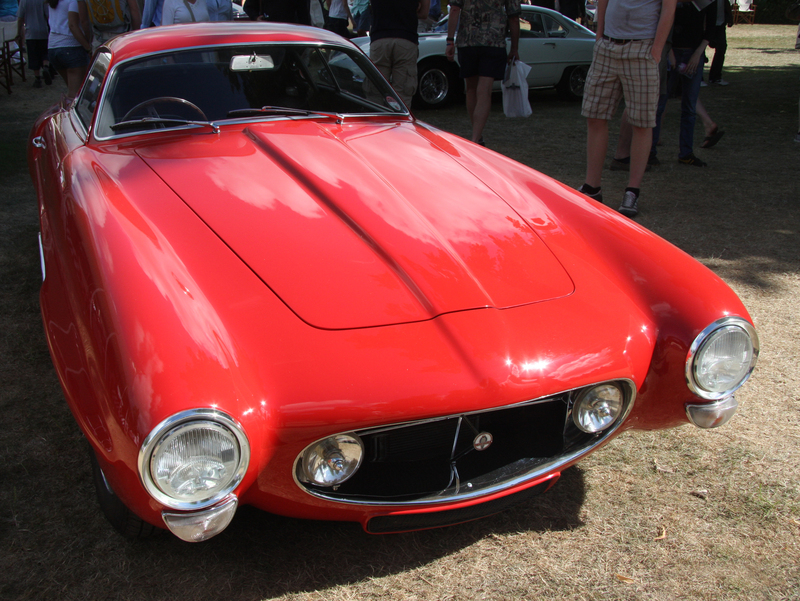 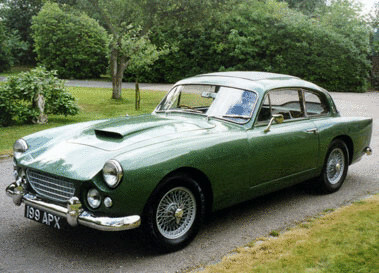 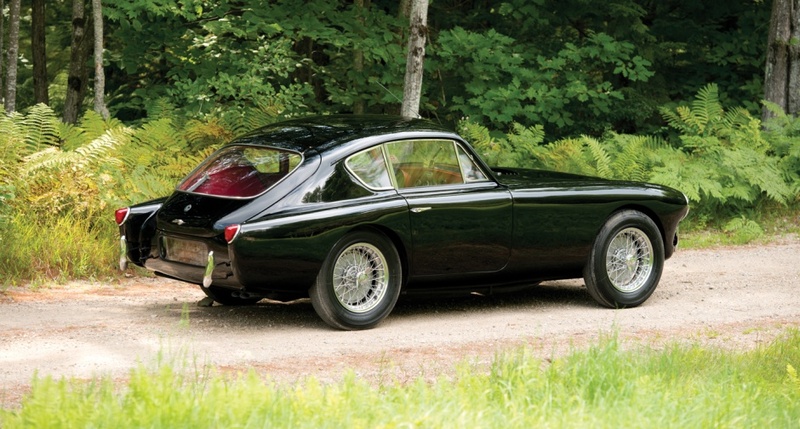 The “AC Ace Bristol Zagato” was designed and built by Zagato from the year 1958. 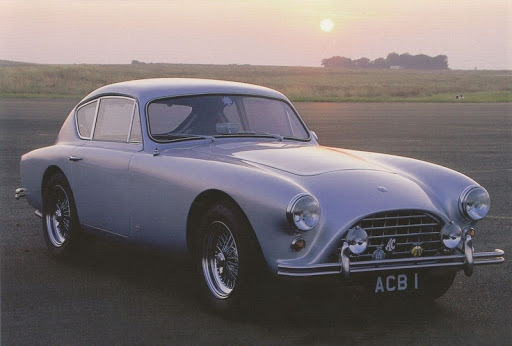 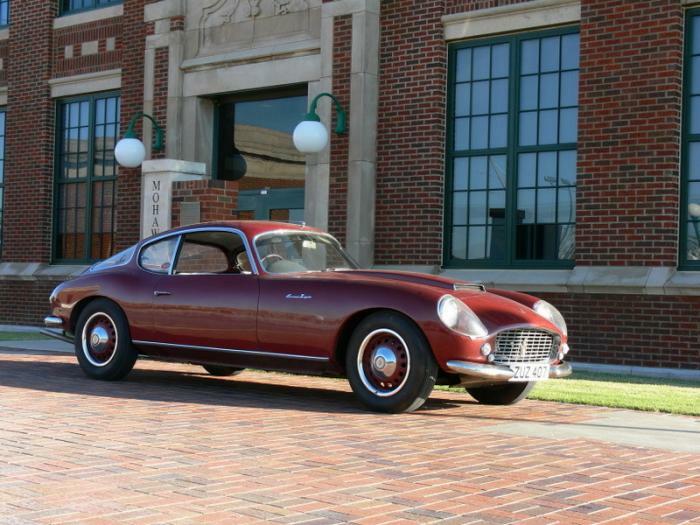 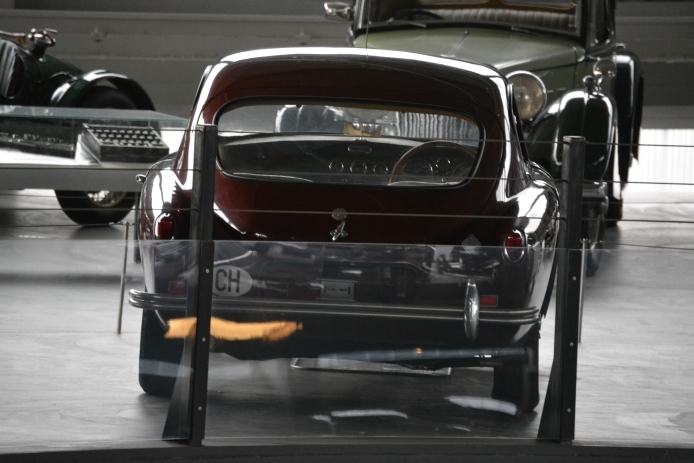 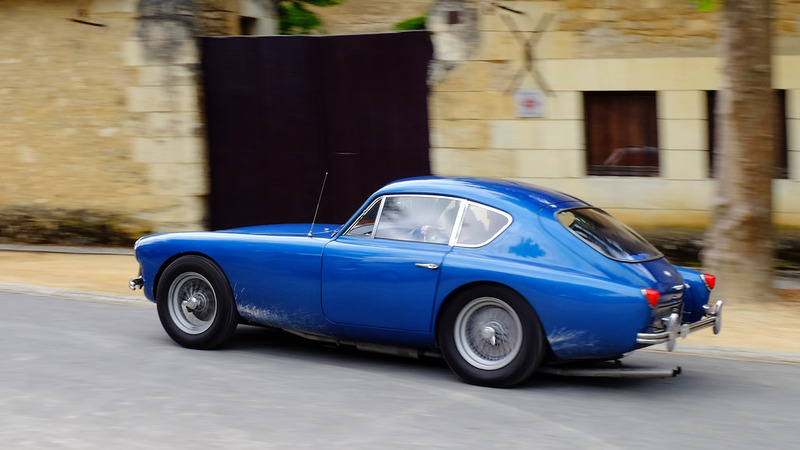 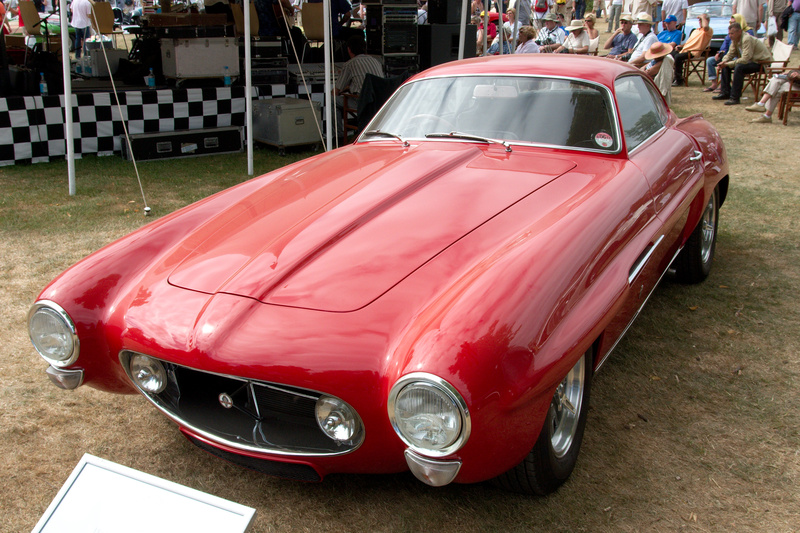 Conceptually, the Berlinetta resembles the two-seat factory coupe ‘ ‘AC Aceca’ ‘, but on the chassis number BEX 477 of a left-steered’ ‘AC Ace Bristol’ ‘. 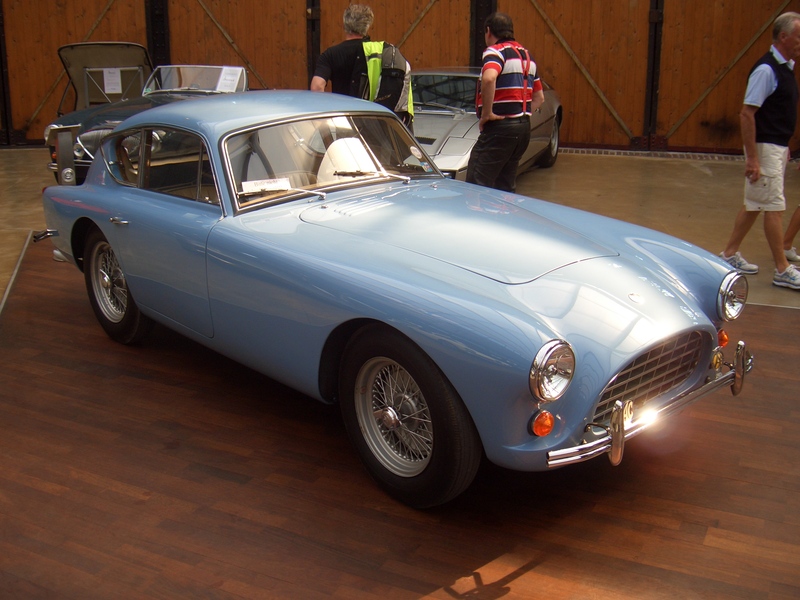 The idea came about at the Geneva Motor Show in 1957 during a meeting between Hubert Patthey, the then AC and Aston Martin importer for Switzerland and Elio Zagato. 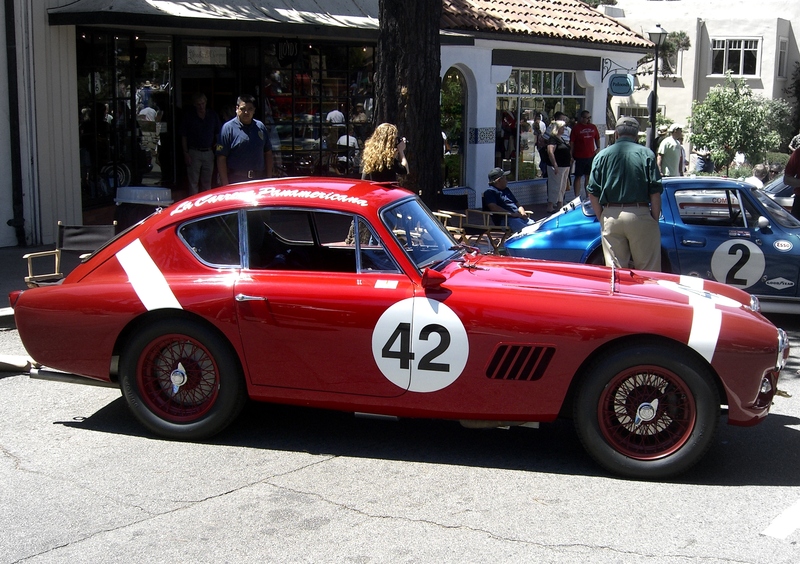 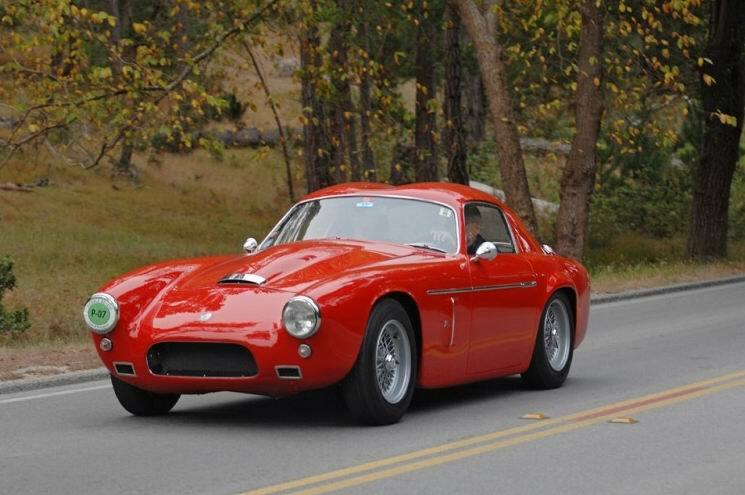 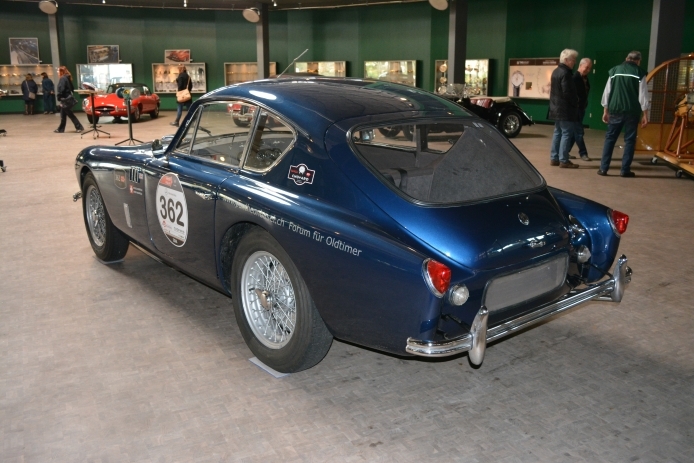 The original vehicle from 1957 was delivered to the Swiss company Pattheys in 1958; Who commissioned the Carrozzeria Zagato to produce a single, individual car body for the vehicle to be used at local races and the Pescara rally. 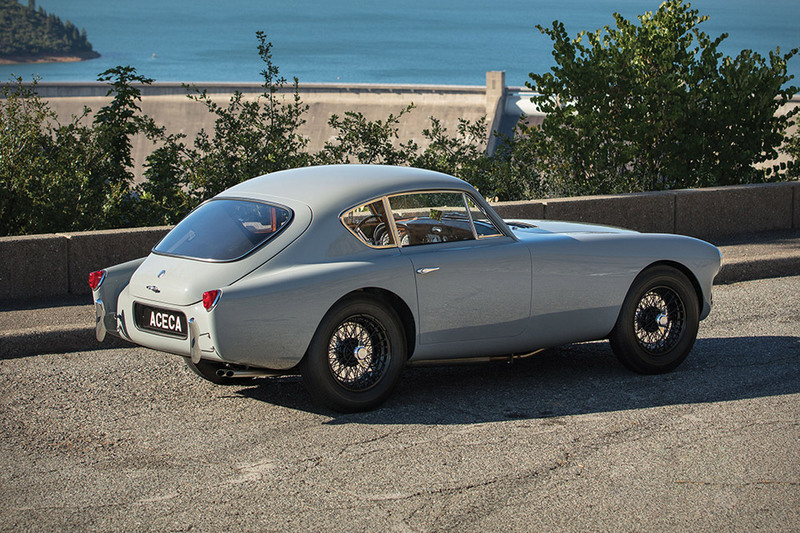 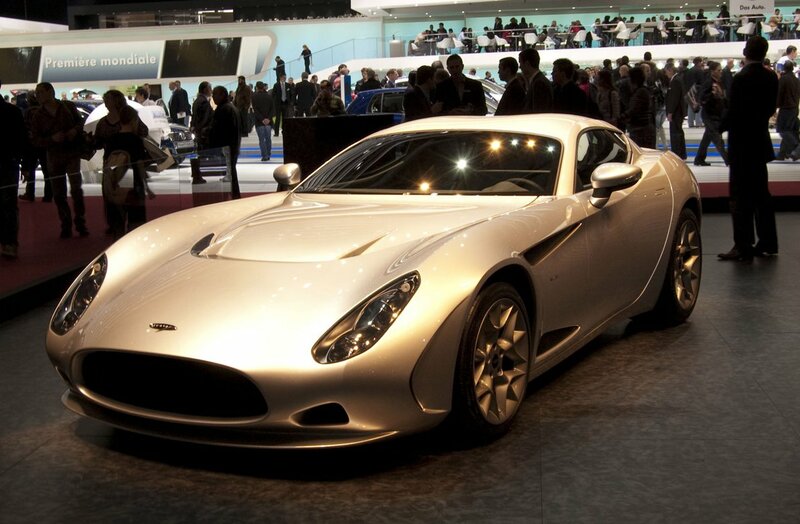 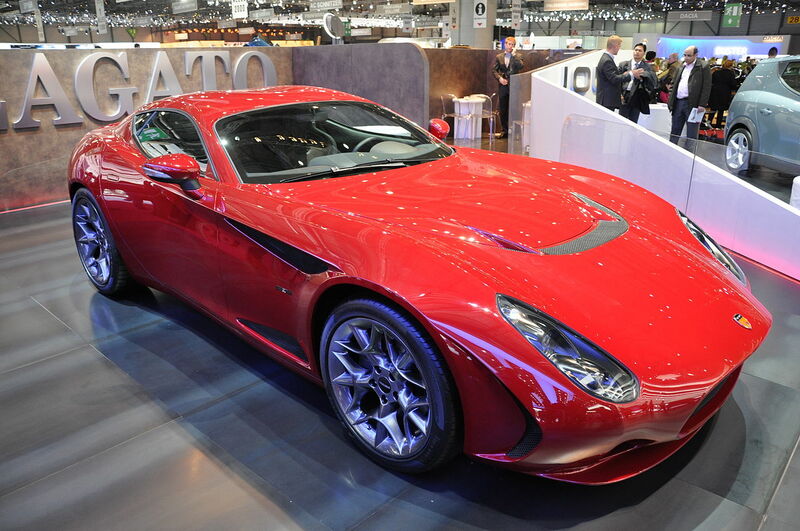 Zagato designed and built a coupé body made of thin-walled aluminum sheet with Zagato’s trademark “Double Bubble”, a solid roof with two vaults above the driver’s and co-driver’s seat to ensure sufficient headroom at low headroom. 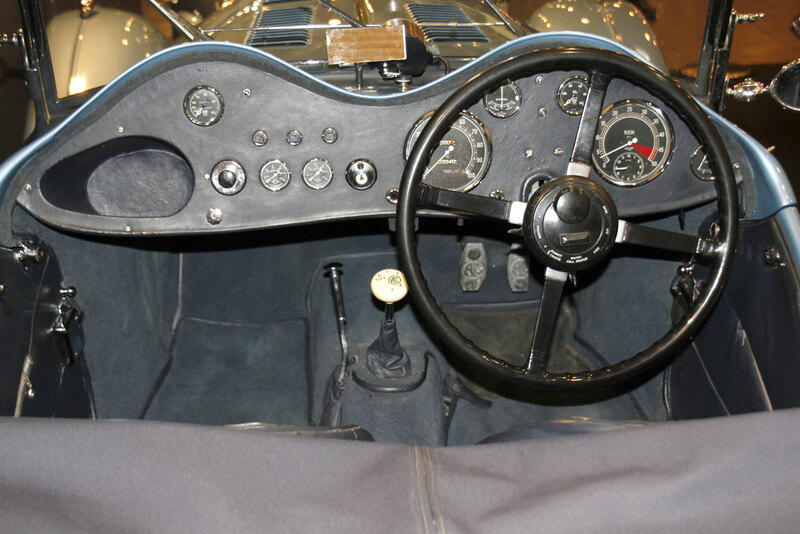 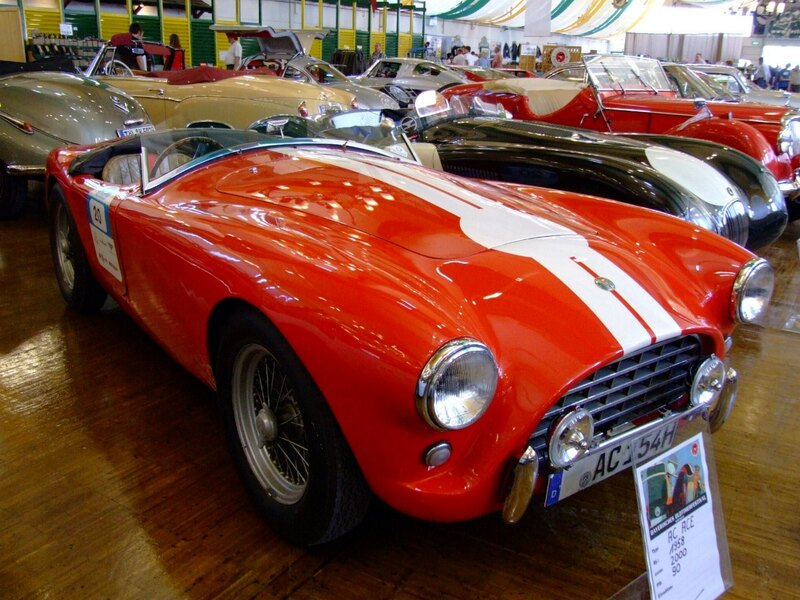 Pattey sold the finished vehicle to an Englishman who lived in Switzerland, who was arguing with him for various rides near Lake Geneva; Later the racing driver Jo Siffert acquired the single piece, which he used at different racing events and historical races like the Mille Miglia. 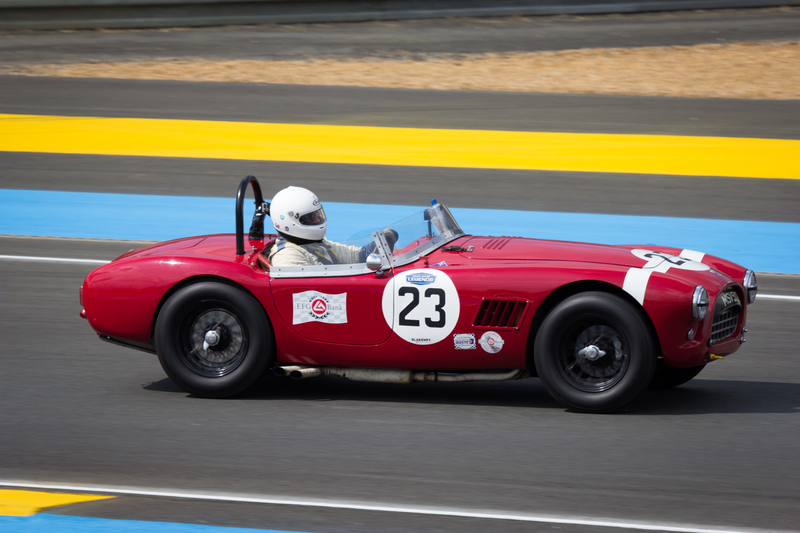 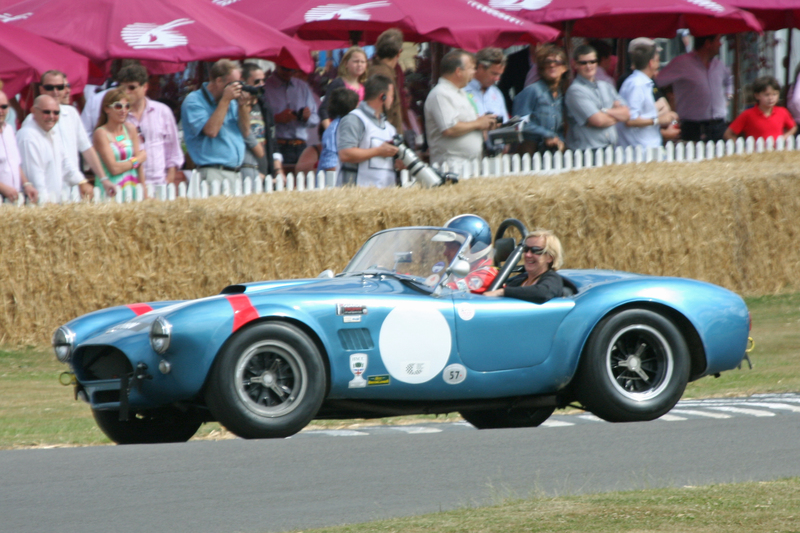 On the circuit, the single took part only in a well-known races, on October 5, 1958, at the Coupes du Salon in the French , where it won the class in the class up to 2000 cc. 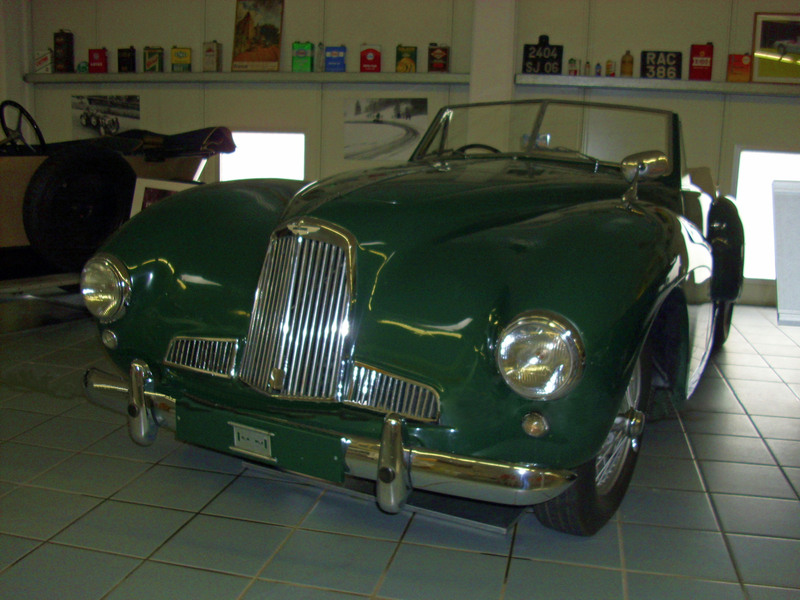 The vehicle is now owned by an American collector. 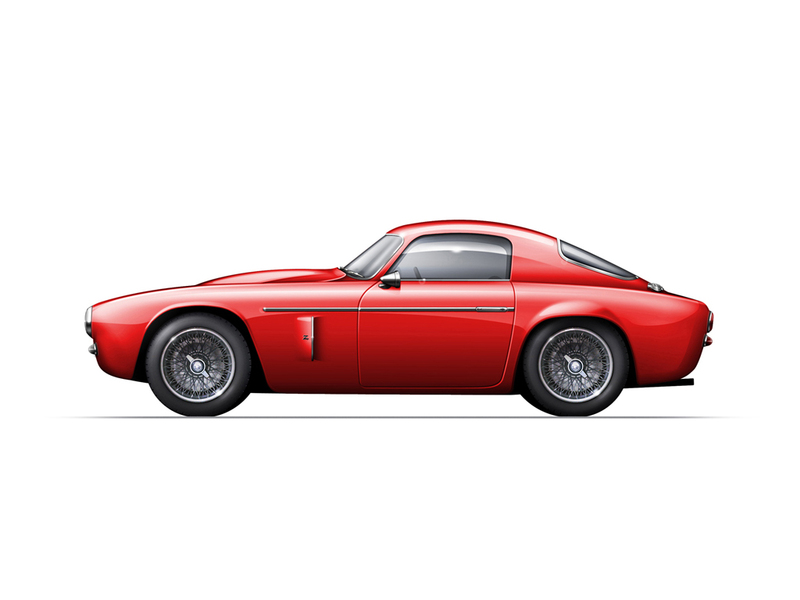 ‘Specifications AC Ace Bristol Zagato (if different): Modified Bristol six-cylinder engine with 130 hp at 13250 rpm at 5750 rpm, torque 174 Nm at 4500 rpm, length 3848 millimeters, height 1245 millimeters, ready-to-fly weight 862 kilograms, top speed 185 km / hr, Acceleration from zero to 60 miles per hour in 7.7 seconds, to 100 miles per hour in 161.2 seconds. 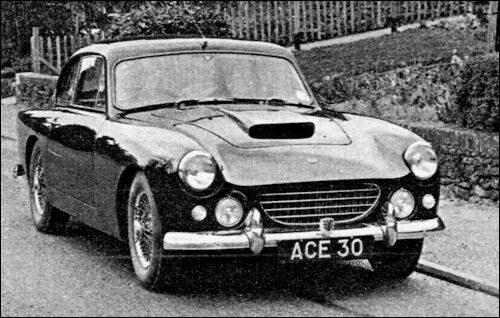 The ‘AC Ace-Aigle’ was an aerodynamically improved single-piece AC Ace Bristol based vehicle with the BEX289 chassis number designed specifically for the Le Mans 24-hour race in 1960. 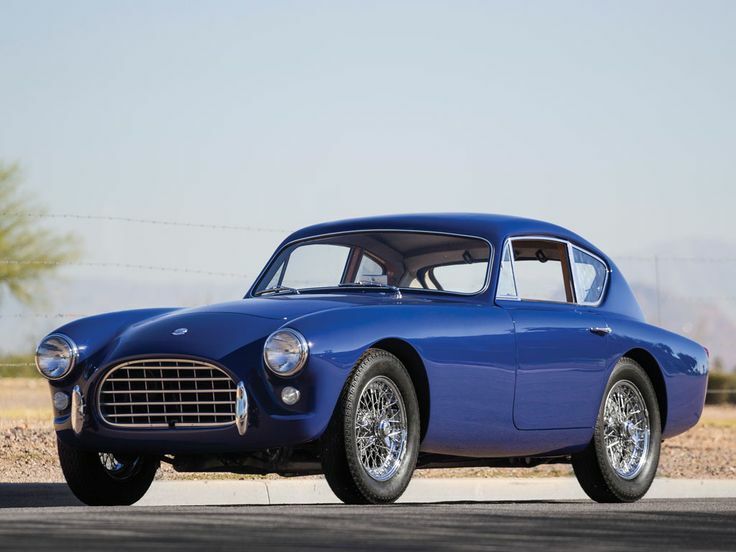 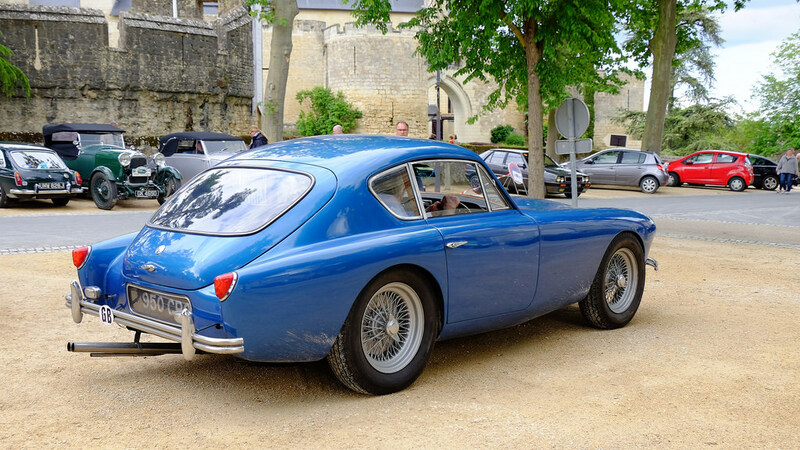 The inspiration came from the Swiss AC importer Hubert Patthey, as was the case with ‘AC Ace Bristol Zagato’ in 1958, but was conceptually much easier. 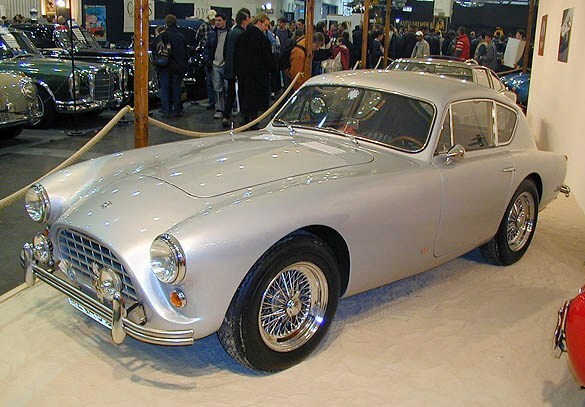 The Aigle Aigle, which has been legally independent in its own right alongside the design studio and car body builder Ghia in Turin existed. 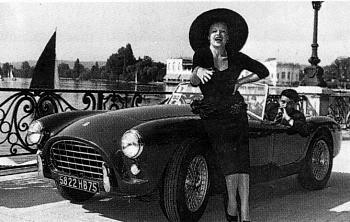 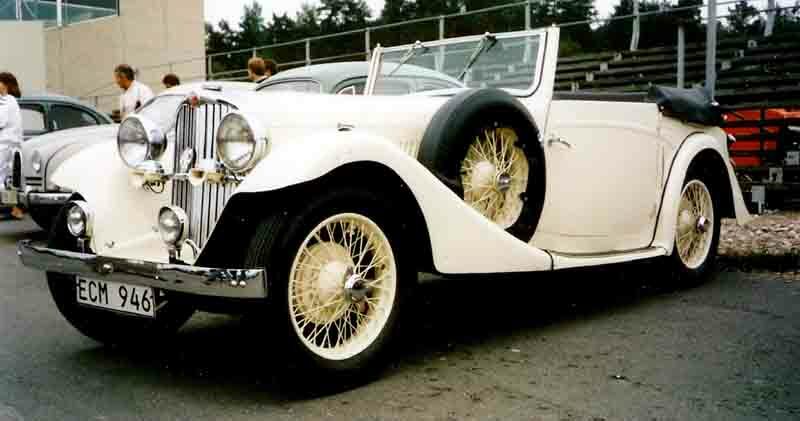 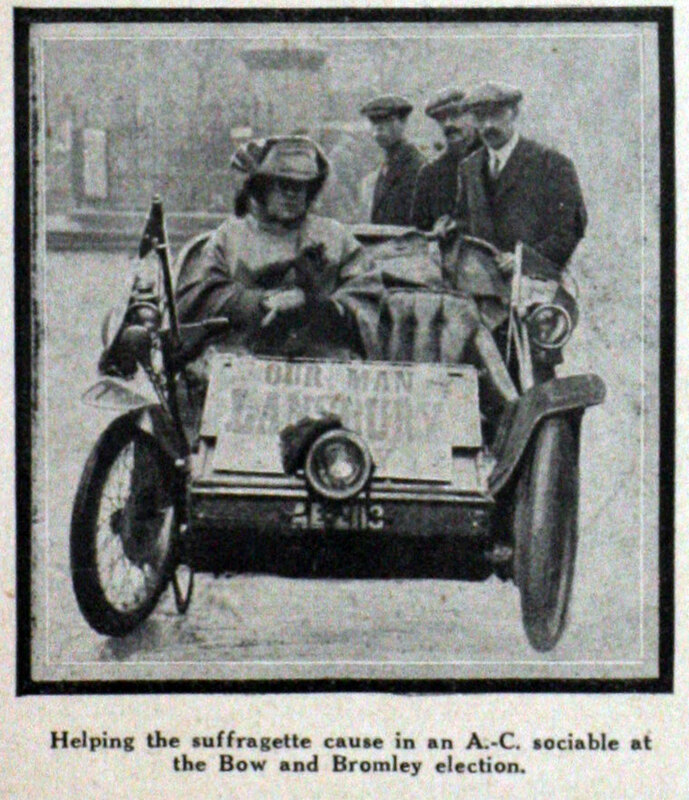 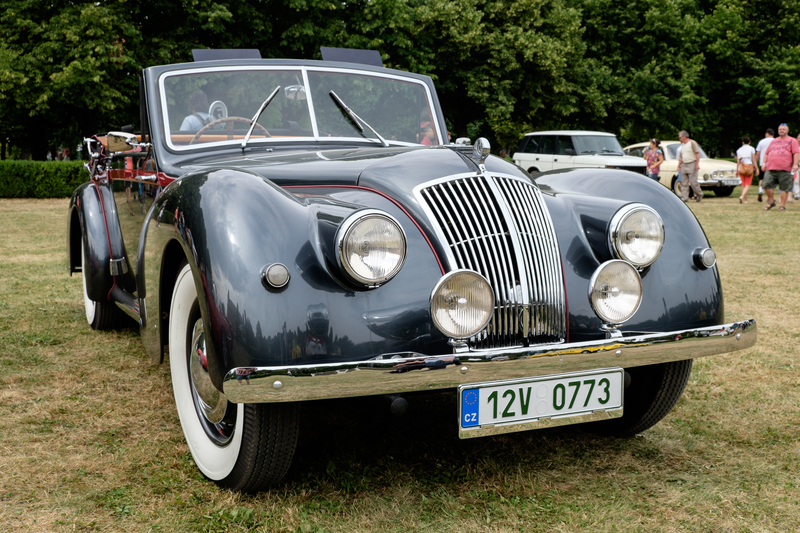 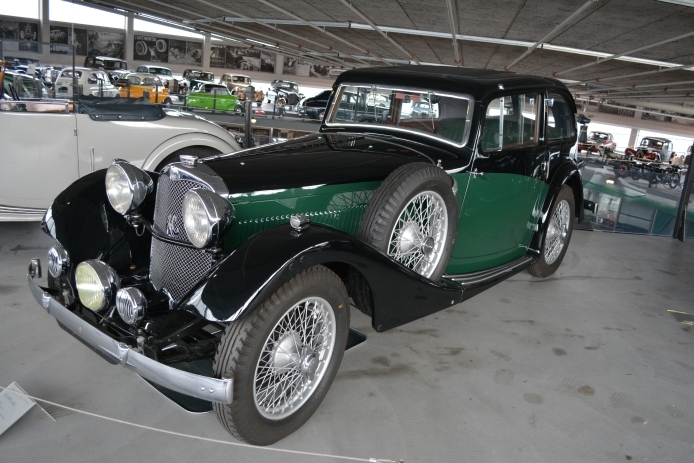 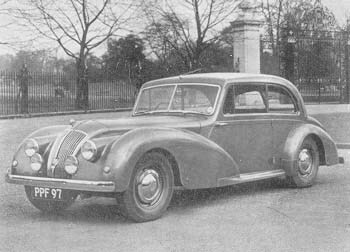 In contrast to the standard vehicle, the ‘Ace-Aigle’ had a modified front and a fixed hardtop. 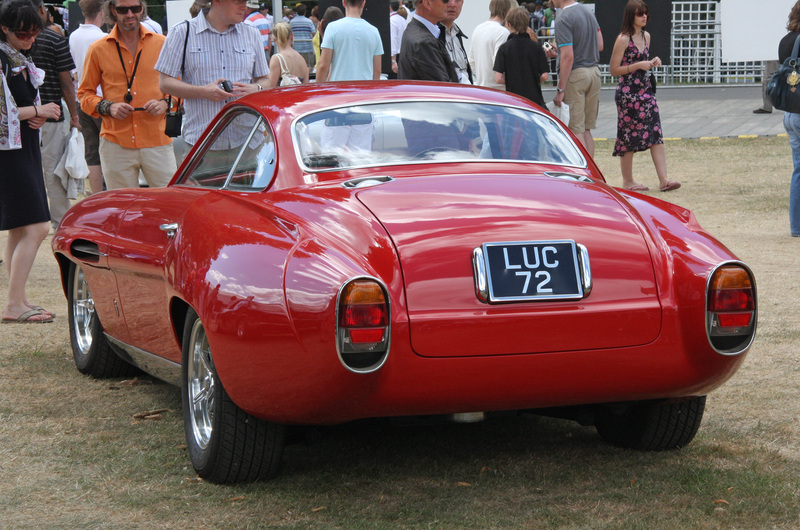 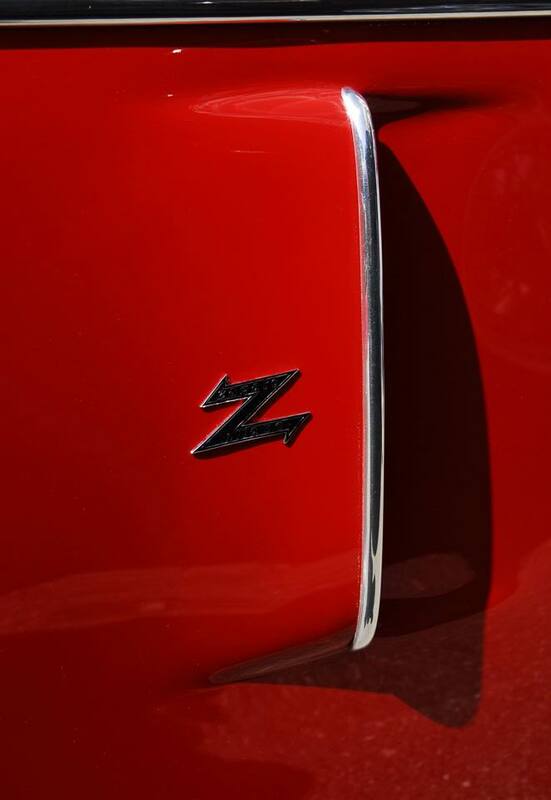 The roof top had two unusual vaults to give the rider and co-driver plenty of headroom – actually the “double bubble” design, typical of Zagato, and implemented in its 1958 coupé. 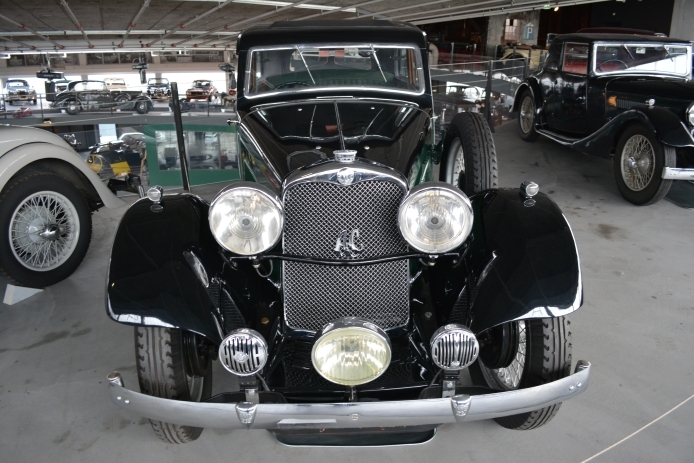 The normal, aerodynamically relatively unfavorable front body of radiator grille, front fenders and bonnet was replaced by a new front and made of lightweight polyester front. 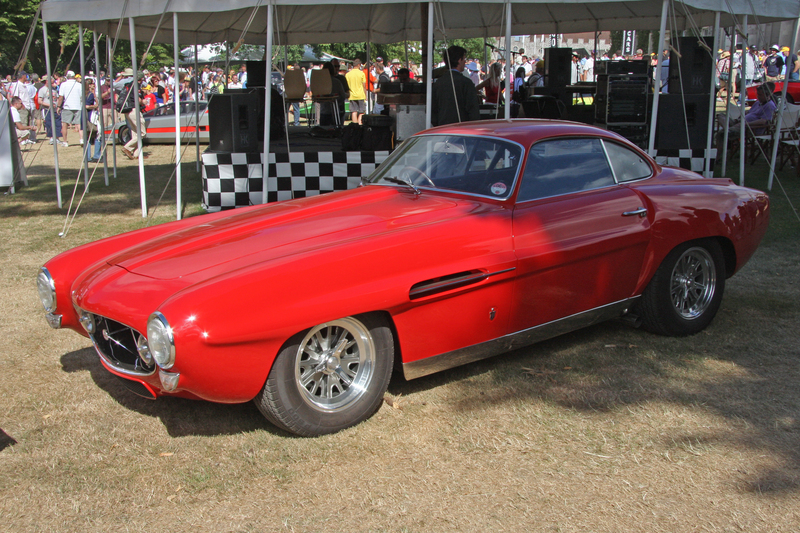 This was rounder, ran longer and flatter forward, and had a flat, oval cooling air intake, backlit headlights clad with plexiglas half shells. 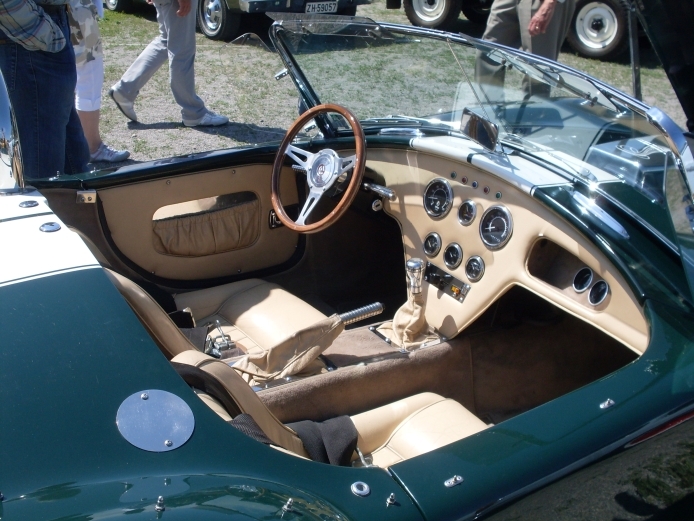 She remotely recalled the Jaguar E-Type. 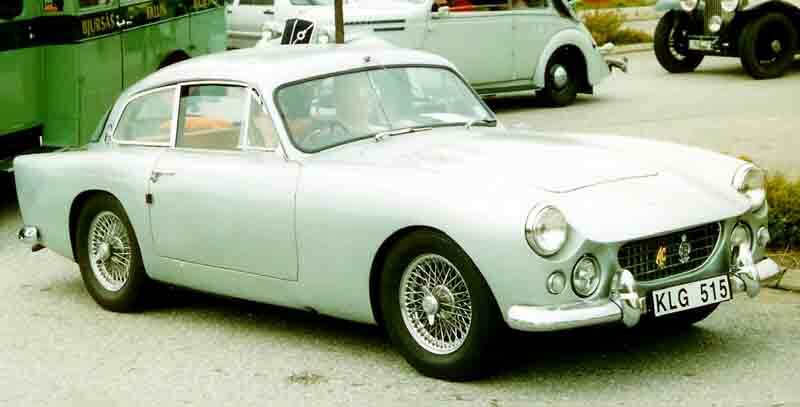 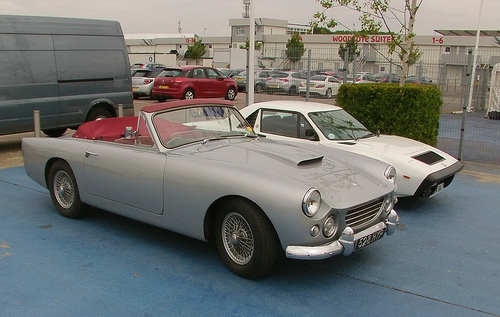 According to the same concept and with very similar lines, Ghia Aigle had already changed several Austin-Healey Sprite from 1958 to 1961 (albeit without hardtop). 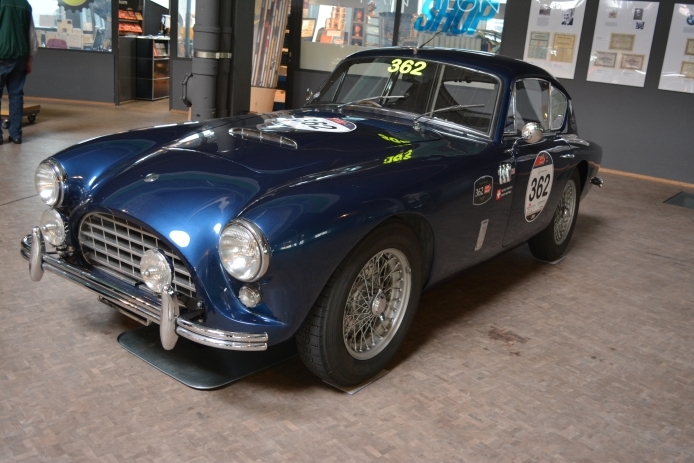 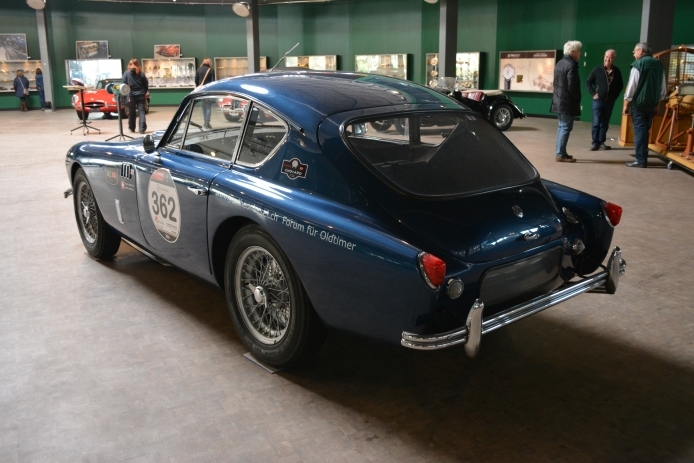 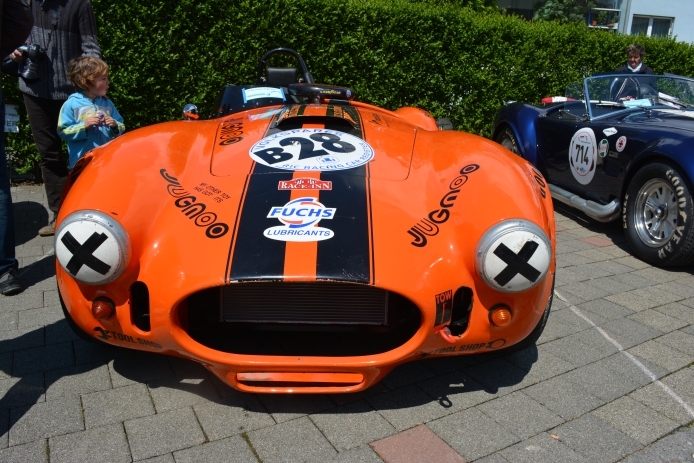 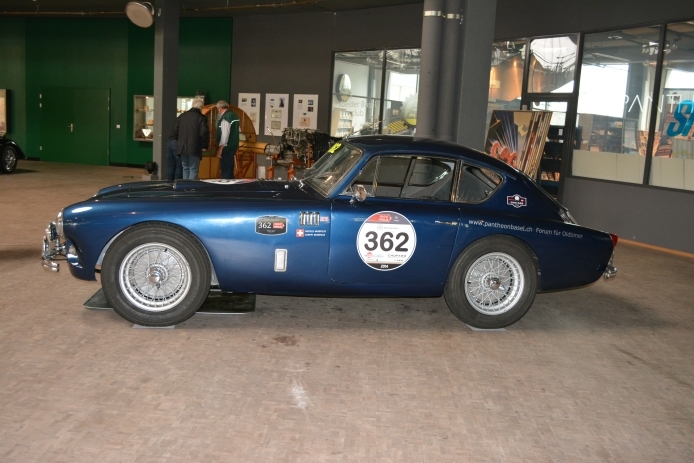 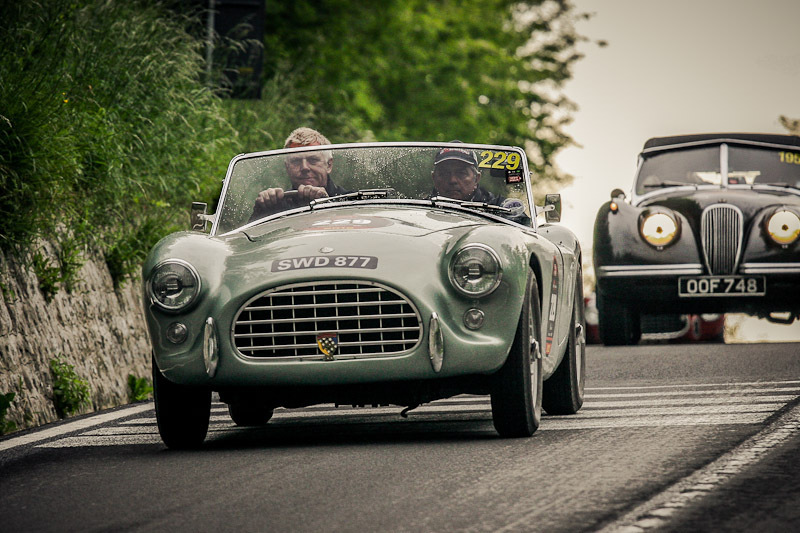 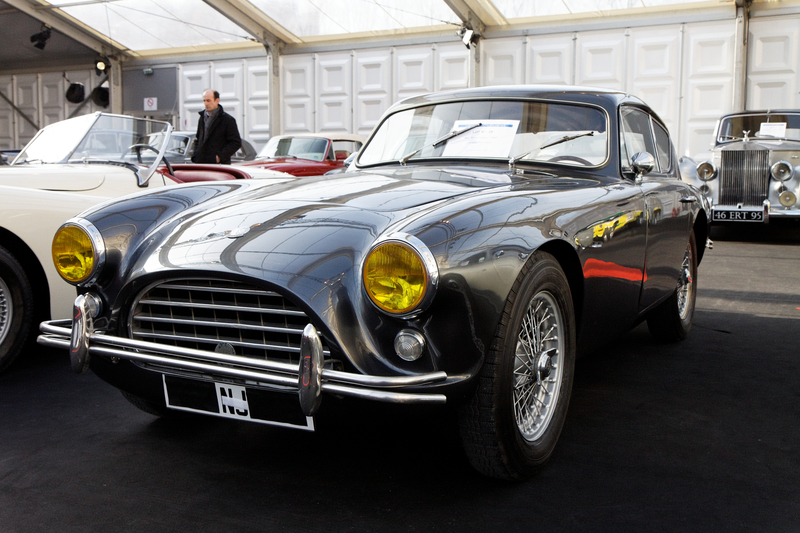 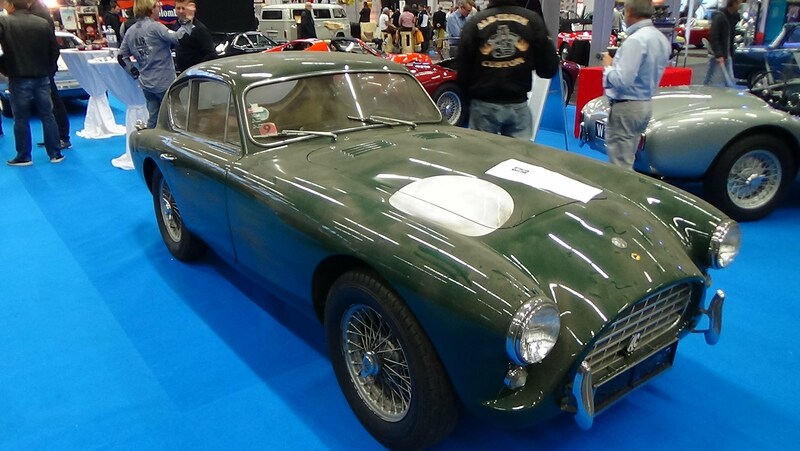 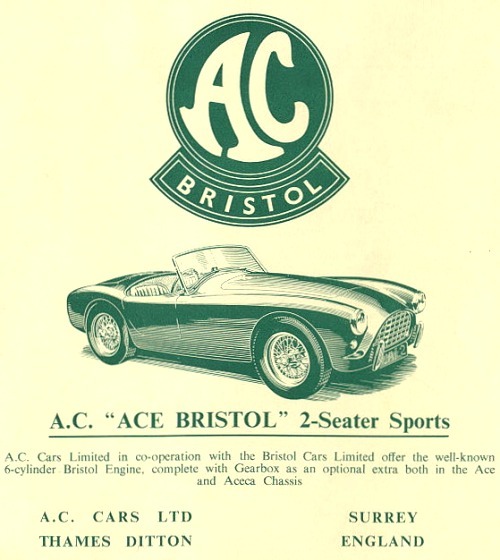 A very similar “Ace Bristol” with chassis number BEX1192 appeared in Le Mans in 1962, at the same time the last Le Mans appearance of an “AC Ace” before the “AC Cobra” from 1964 was used. 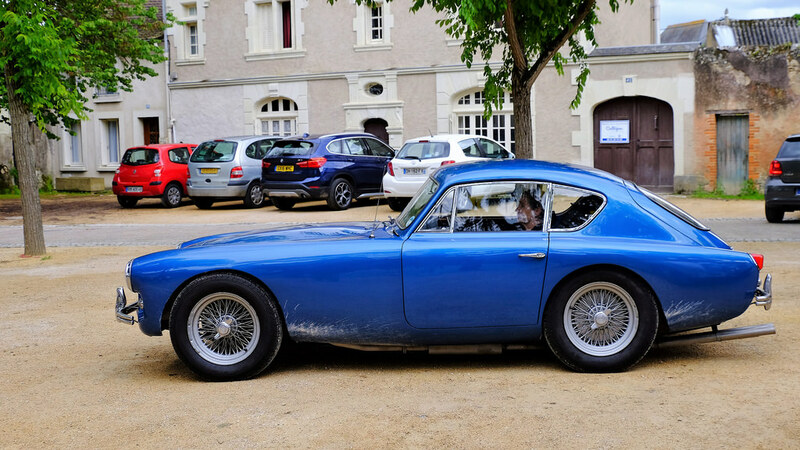 The car of a French private jet suffered accident damage the previous year and had been returned to the AC factory, where it received a special lightweight body with an aerodynamically favorable front in the style of the ‘Jaguar E-Type’ / ‘Ace -Aigle . 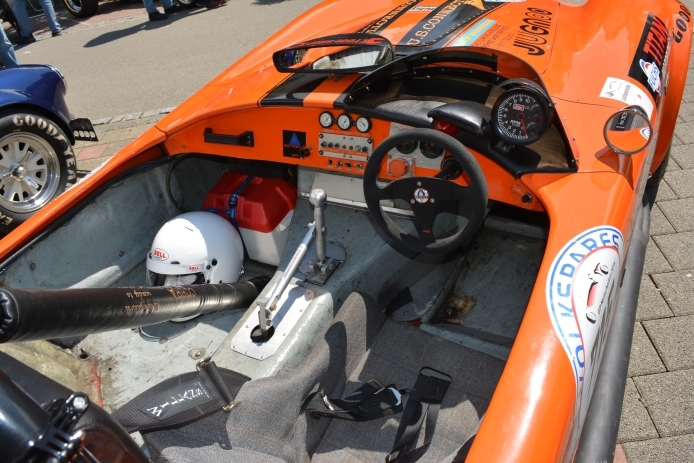 In the race, there was no clutch damage. 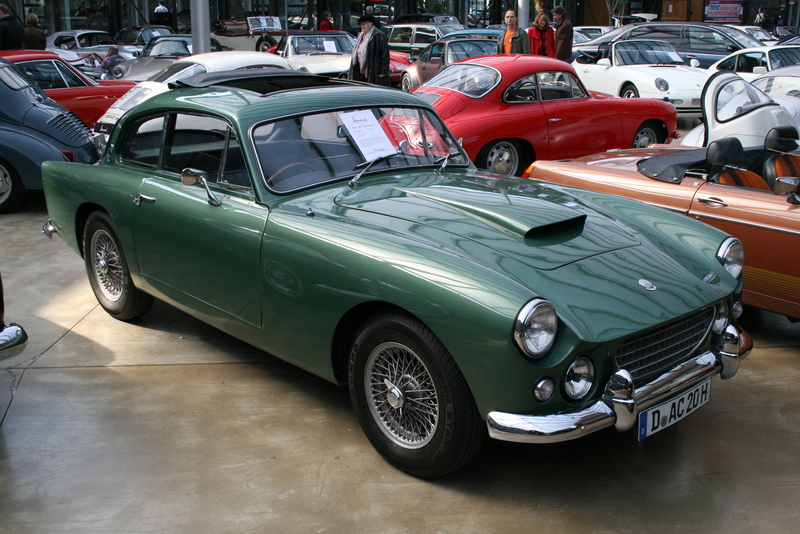 The 6 cylinder Bristol engine was optional until it ceased production in 1961. 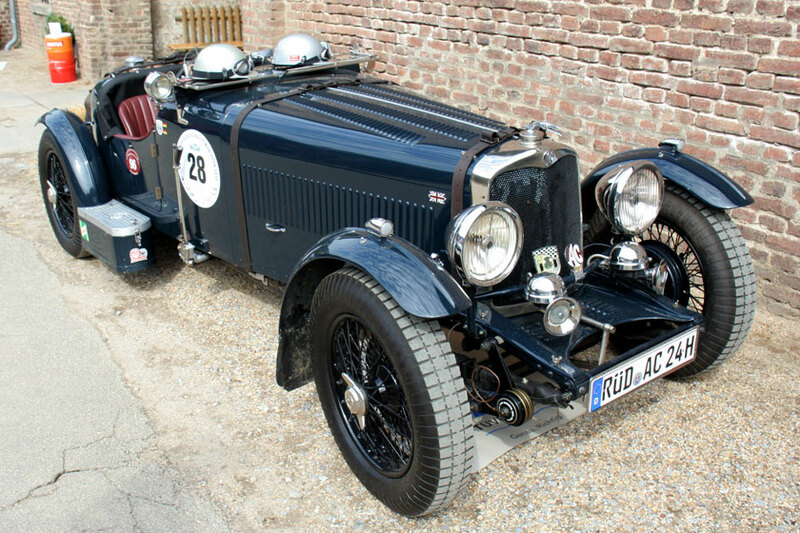 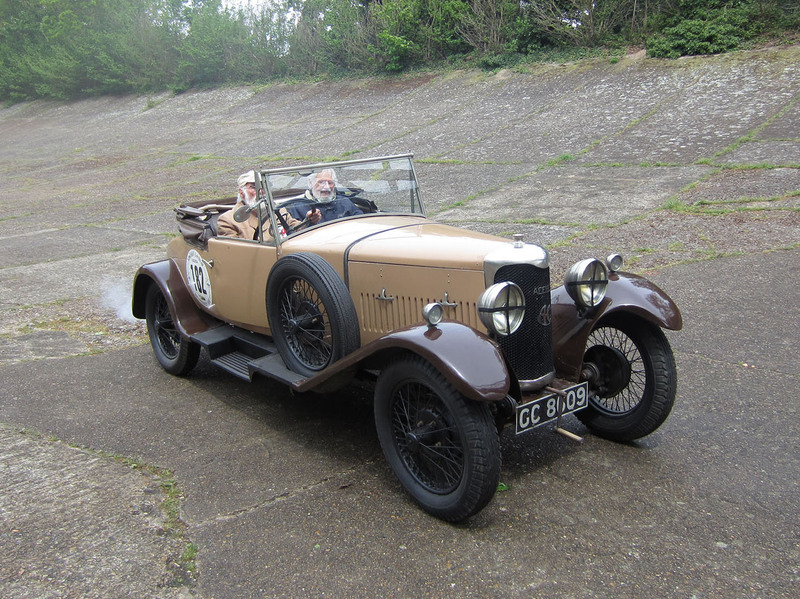 Soon after, car dealer and racing driver Ken Rudd fitted his own competition Ace with a pre-war BMW-designed, Bristol-produced 135 bhp (101 kW) six-cylinder engine. 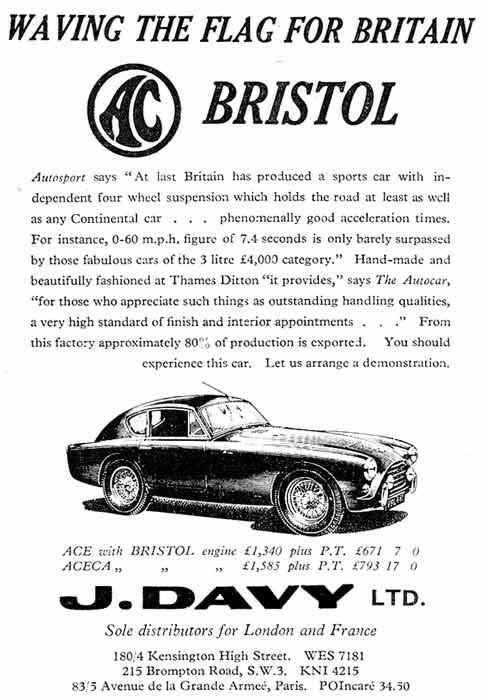 This combination was put into production as the AC Ace-Bristol in 1957. 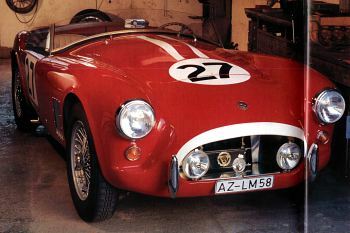 In this form, the car raced at Le Mans in 1957 and 1958. 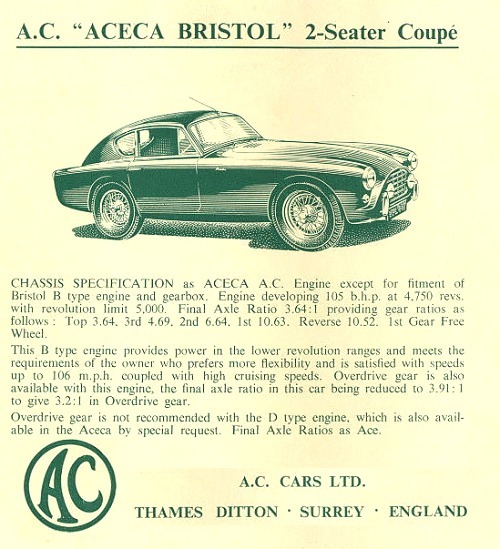 An AC Aceca fitted with a Bristol 6 engine. 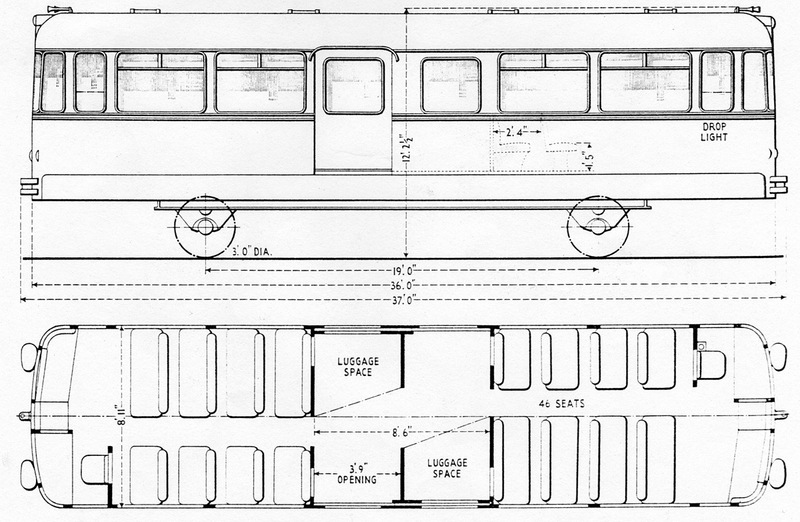 One prototype labeled as drawing number “A86” was made in 1959. 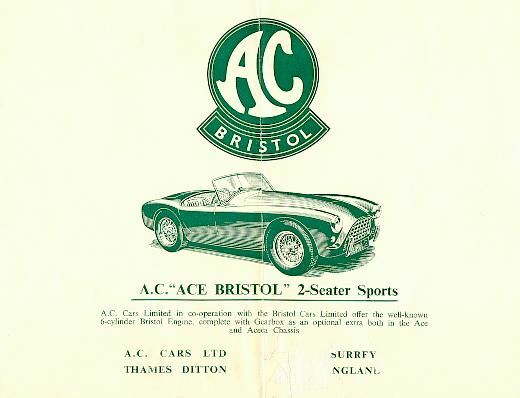 This Aceca-Bristol had a wider body and was built on a coil sprung chassis similar to the AC Greyhound. 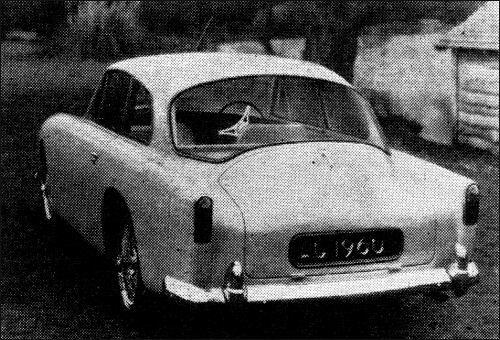 The prototype chassis number (RS 5000) featured the standard Ace body work. 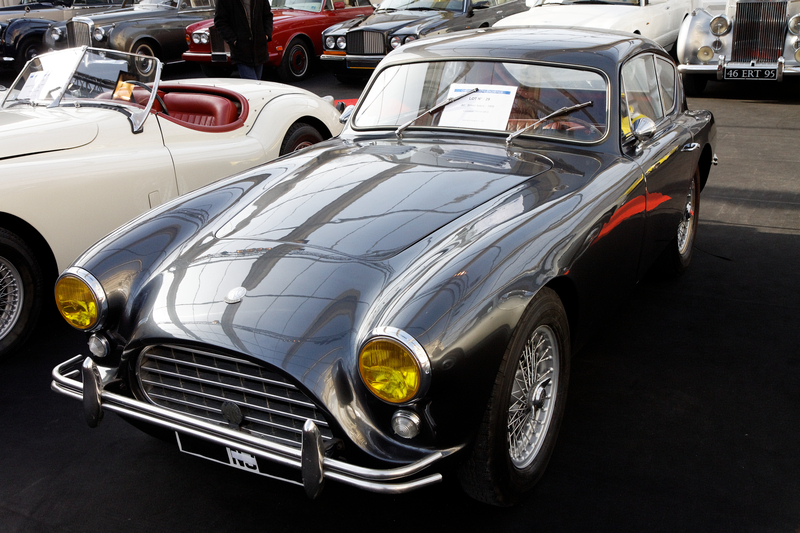 (RS 5001 – 5036) The production model of the AC Ace 2.6 (as it is latterly known today) is for many people the prettiest Ace of all—and undoubtedly the rarest, with only 36 such cars built. 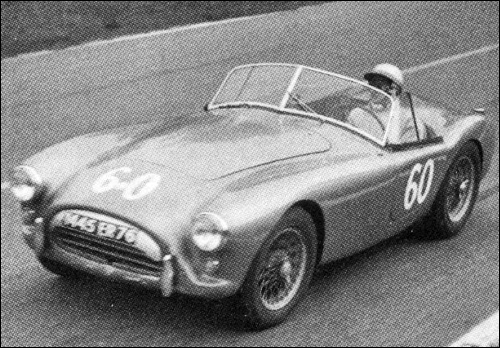 To fit the Zephyr engine, AC had to modify the frame, relocate the steering box and completely change the nose of the car. 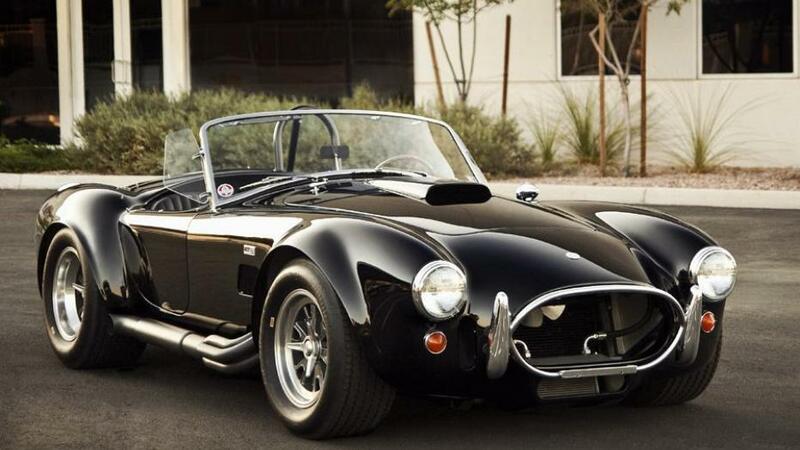 These changes are often mistakenly attributed to Carroll Shelby. 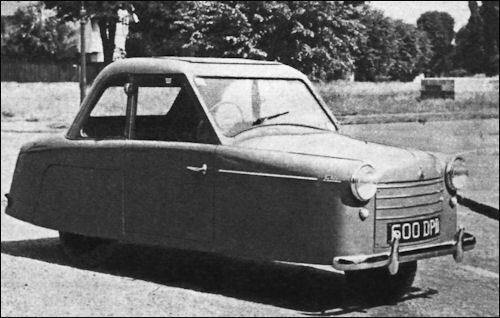 The prototype chassis number (RS 5500) featured the standard Ace body work. 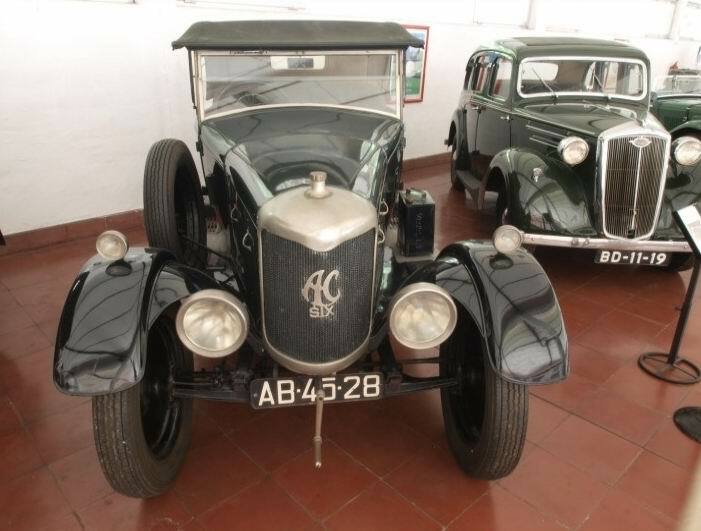 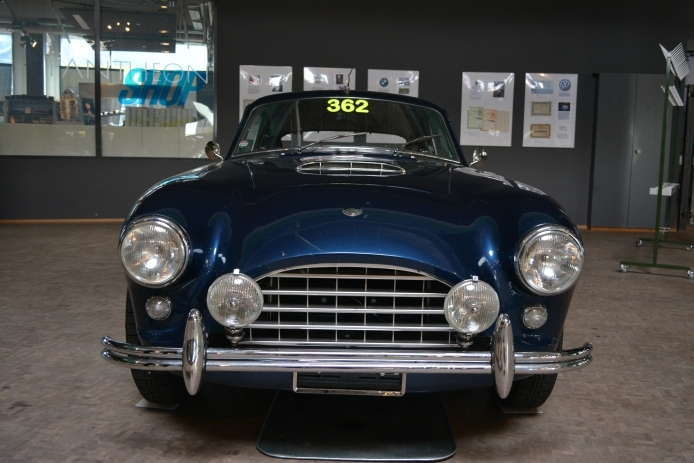 (RS 5501 – 5507) The production model of the AC Aceca 2.6 (as it is latterly known today) is one of the rarest models, with only 7 such cars built. 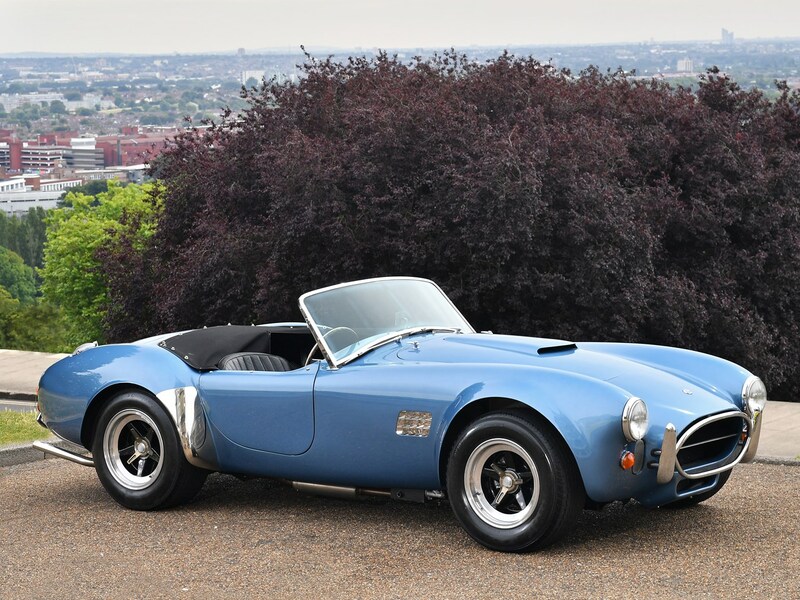 In September 1961, AC was approached by Carroll Shelby to use a small block Ford V8 engine in the Ace chassis, producing the AC Cobra. 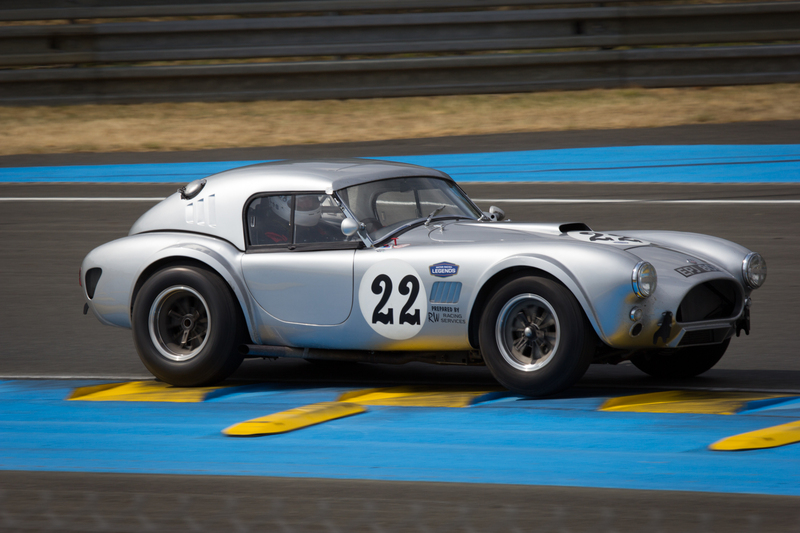 Shelby needed a car that could compete with the Chevrolet Corvette in US sports car racing. 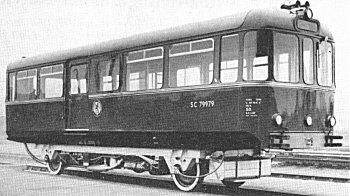 Only 1 was built (CSX 2000) using a Ford 221 Windsor V8. 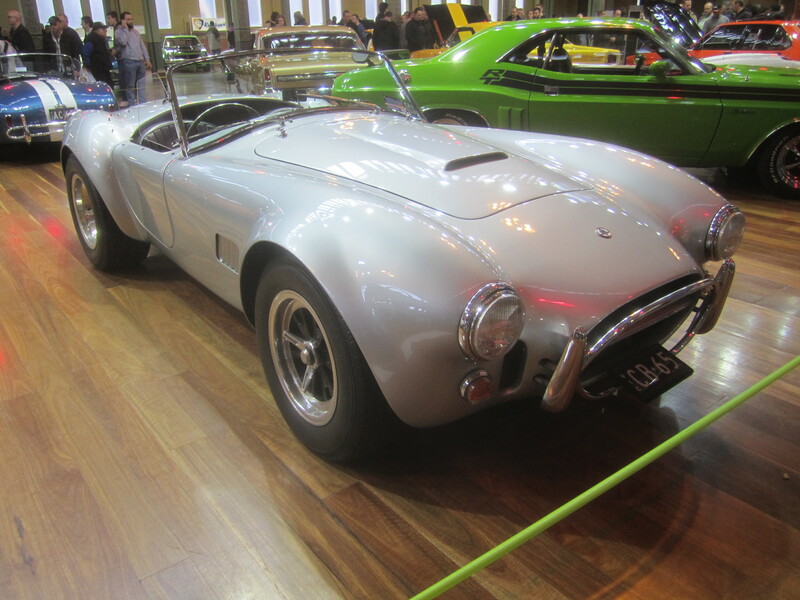 Debuted in 1962 with a Ford 260 V8 engine. 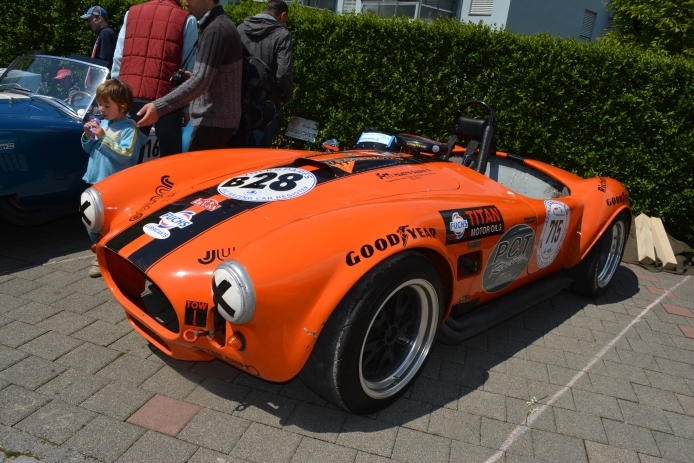 This was then superseded by the Ford 289 V8 engine. 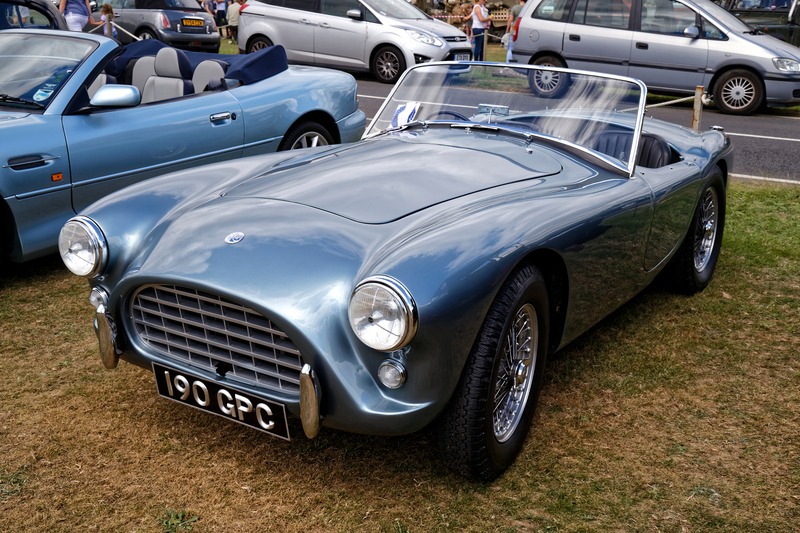 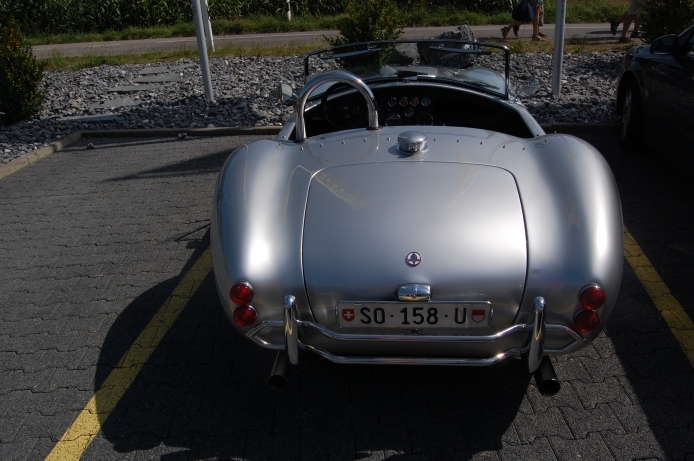 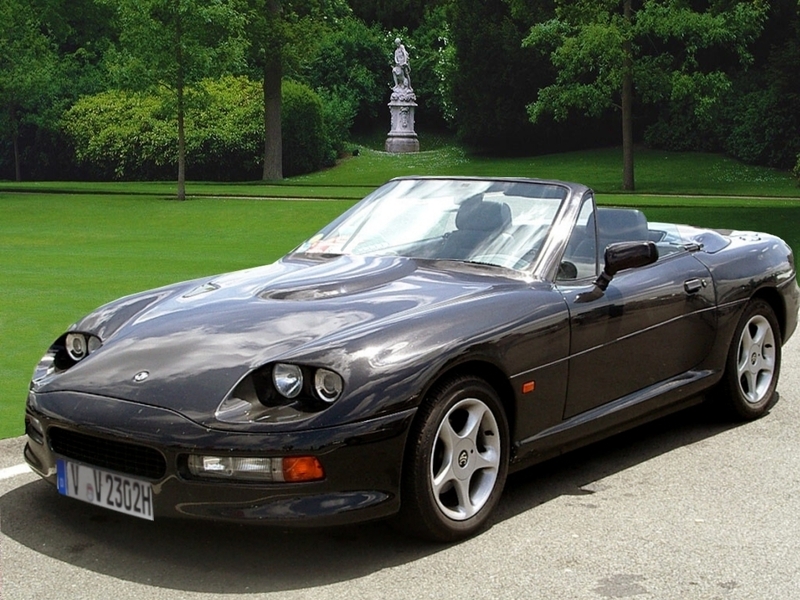 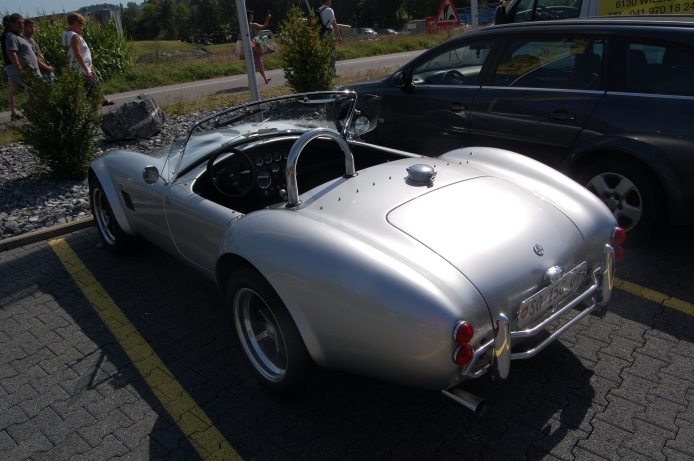 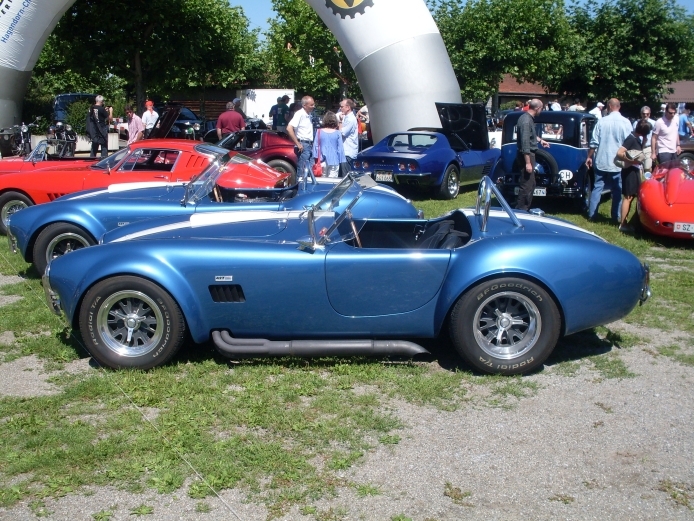 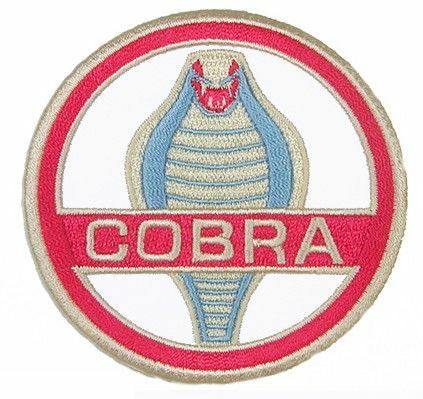 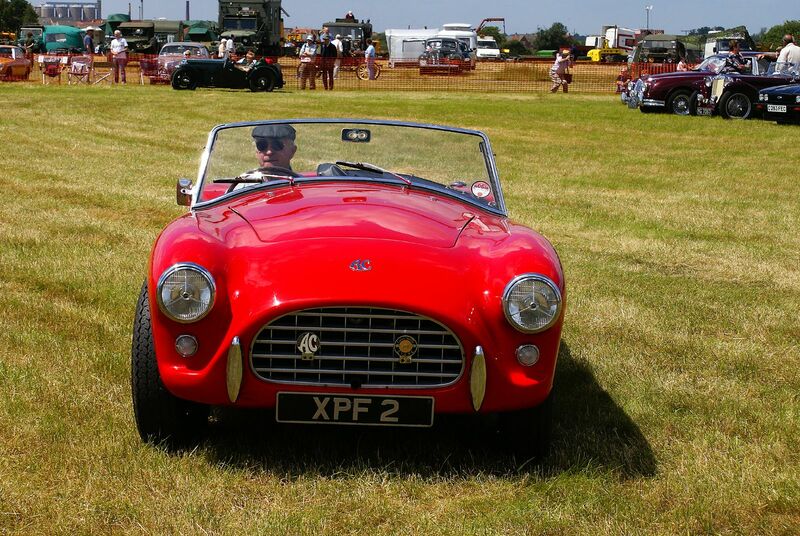 The resulting Cobra was a very powerful roadster, and it is commonly blamed for the introduction of the 70 mph (110 km/h) limit on British motorways. 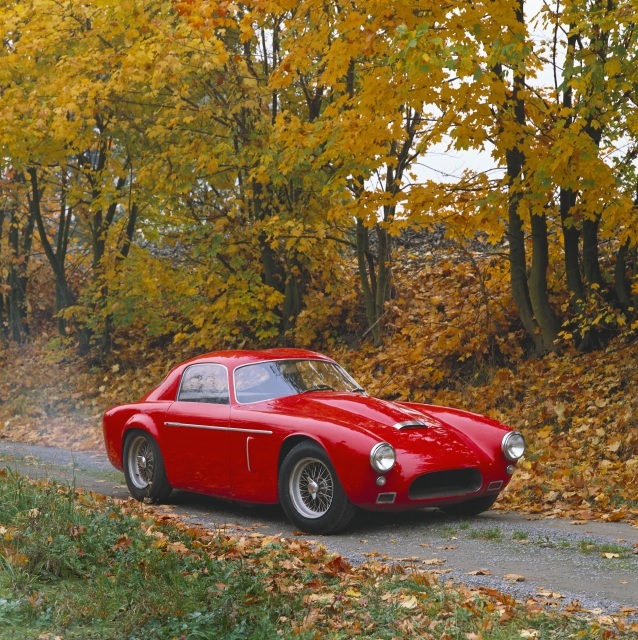 While this was a major factor in the decision, after a coupe version was caught doing 196 mph (315 km/h) during a test run, a then-recent spate of accidents under foggy conditions also helped the introduction of the limit. 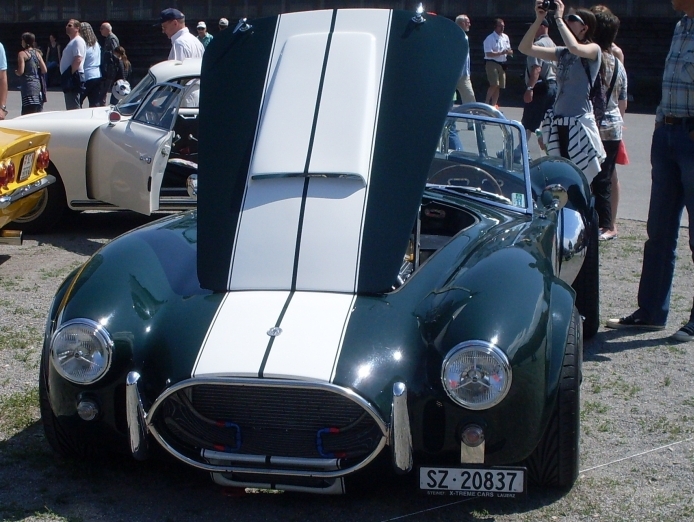 European Model of the Shelby 289 Cobra, introduced in 1963 as a replacement for the AC Ace 2.6 Ruddspedd. 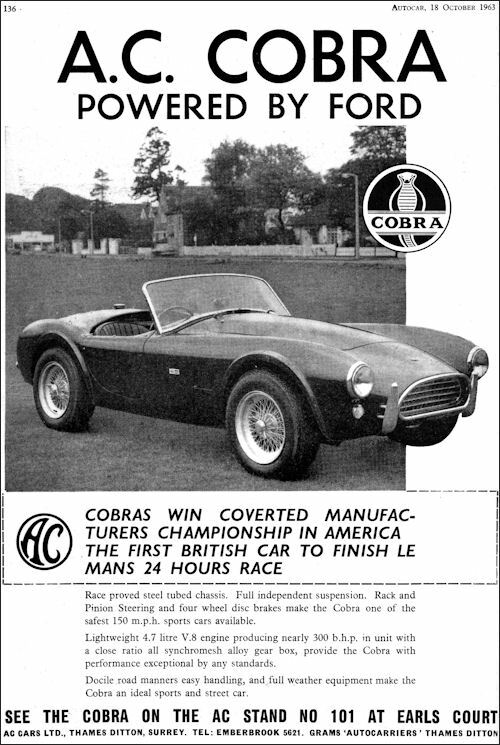 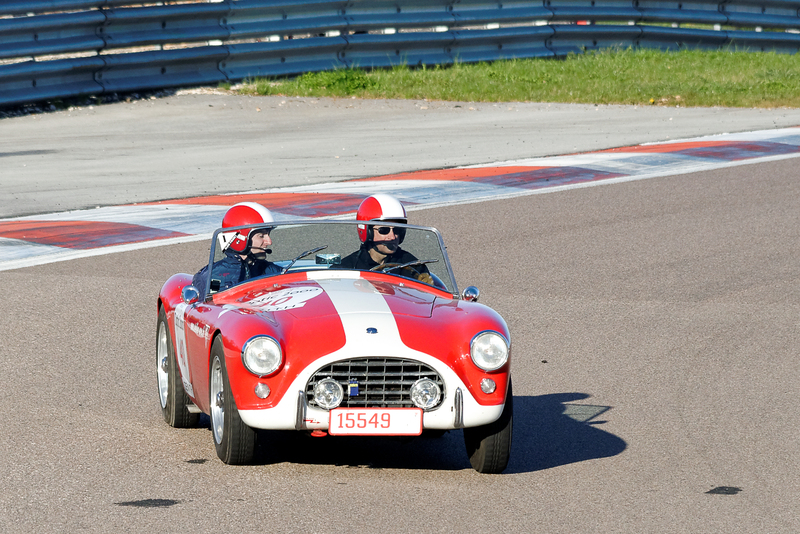 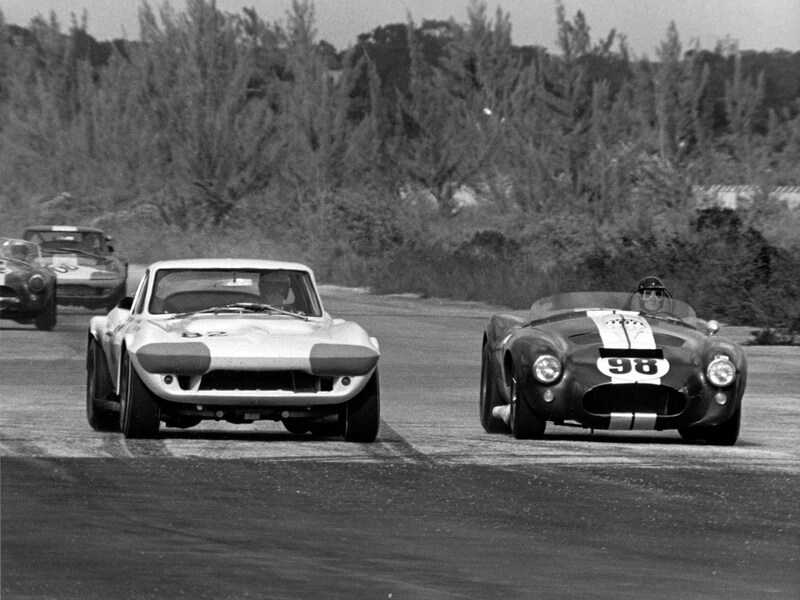 At the end of the 1964 racing season, the Cobra was being outclassed in sports car racing by Ferrari. 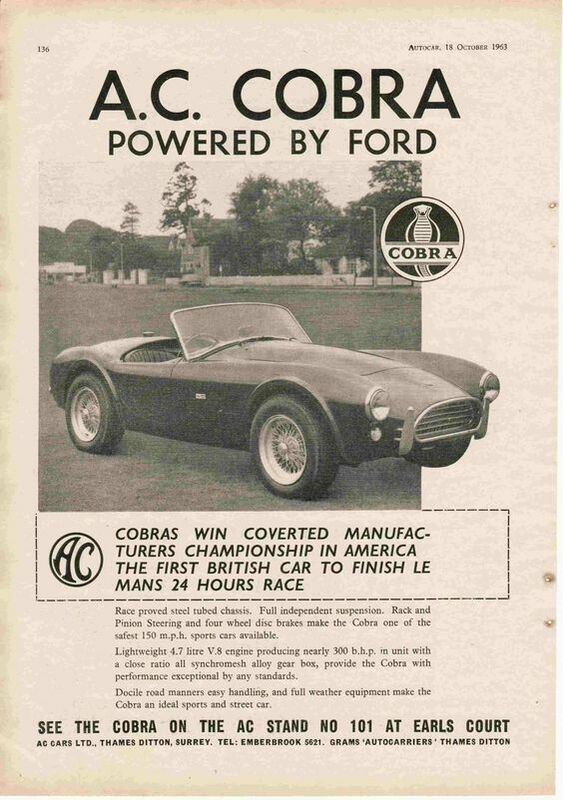 Carroll Shelby decided he needed a bigger engine. 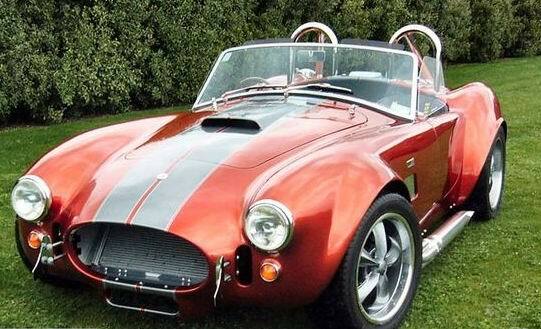 A big block Ford FE series 390 V8 was installed in a Cobra and the result was scary—the car was virtually undrivable. 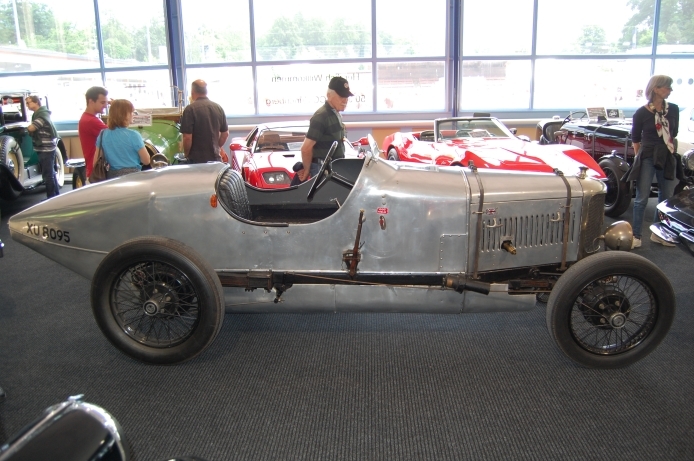 It was decided that a completely new chassis was needed. 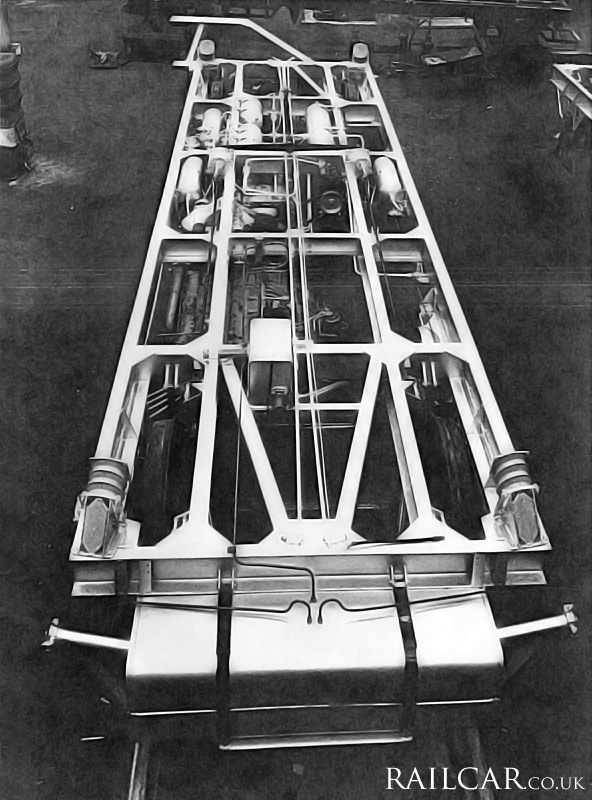 With the combined help of Ford’s computers and the experience of the AC engineers, the new MKIII was born with 4-inch (100 mm) main tubes instead of 3-inch (76 mm) for the chassis, huge cross-braced shock towers and coil springs all around. 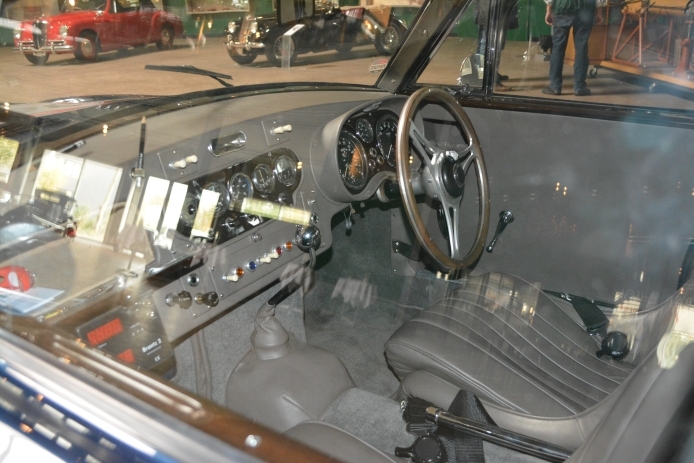 In 1965 a competition version with a stripped interior, no glove box, different instrument layout and revised suspension. 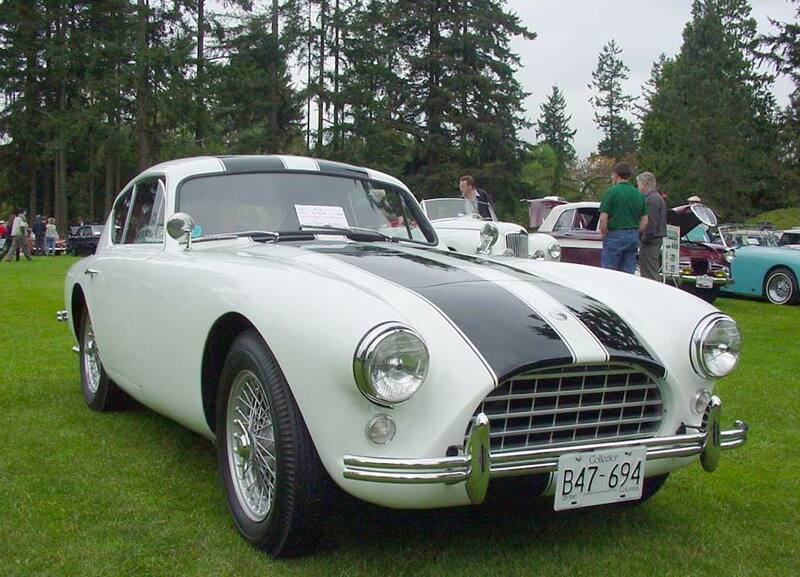 The competition version also had a more powerful motor with only one carburetor, side exhausts, a roll bar and wider fenders to accommodate racing tires. 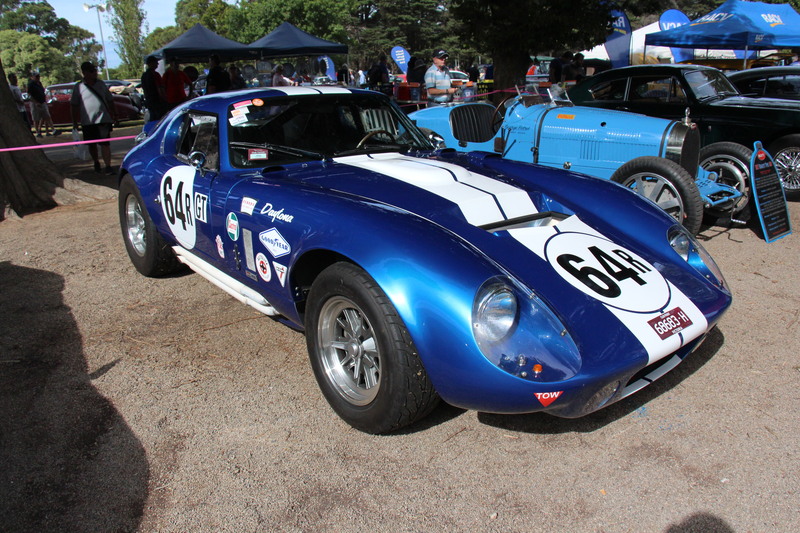 The engine that was installed in the car was Ford’s famed 427 FE NASCAR “Side-Oiler” V8, a power-house engine developing 425 bhp (317 kW) in its mildest street version. 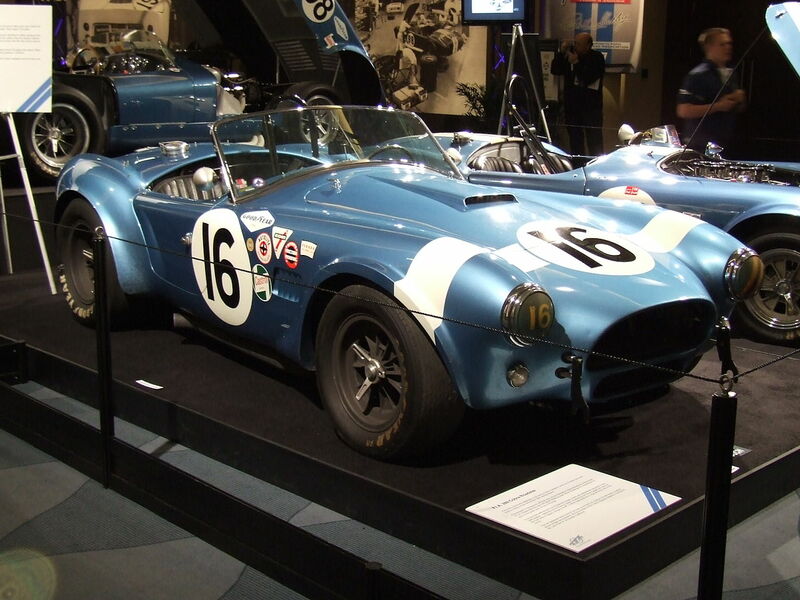 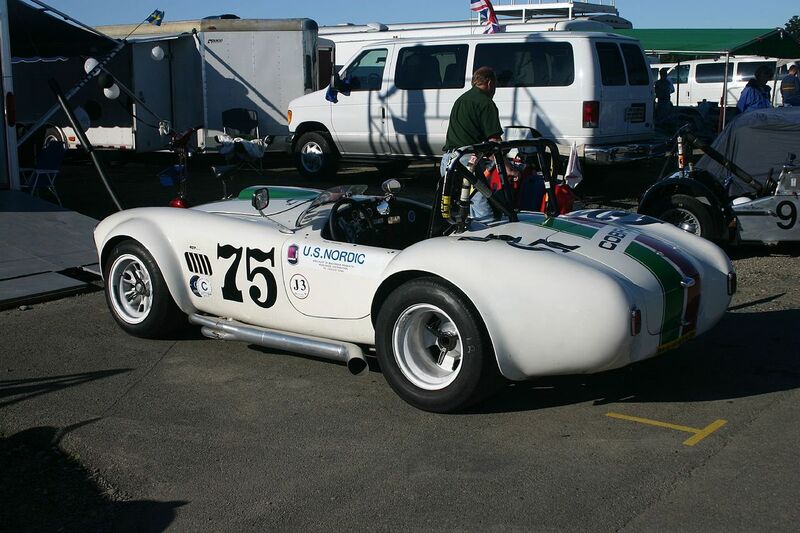 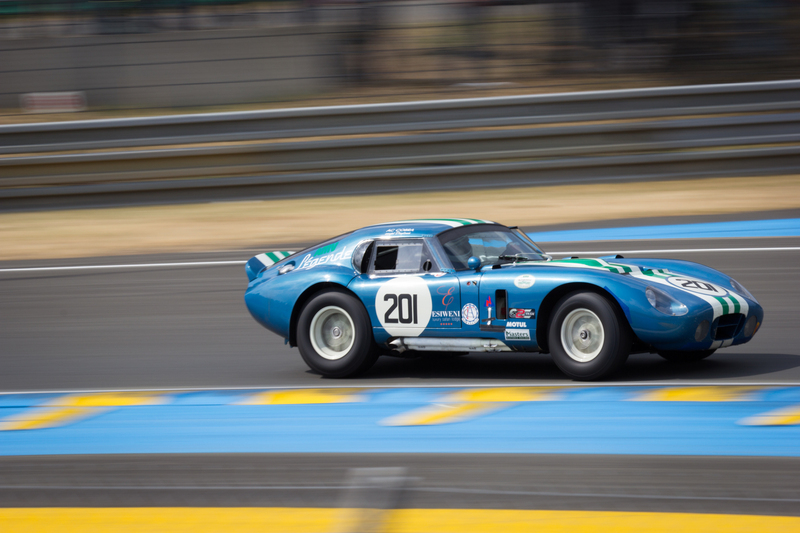 Unfortunately, the car missed homologation for the 1965 season and was not raced by the Shelby team. 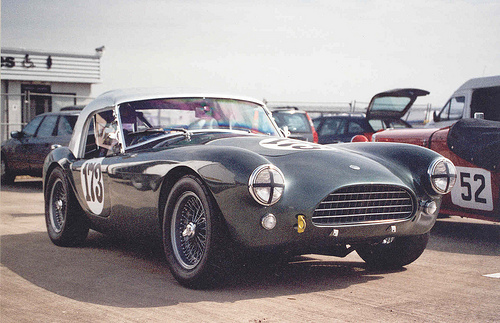 However, it was raced successfully by many privateers and went on to win races all the way into the 1970s. 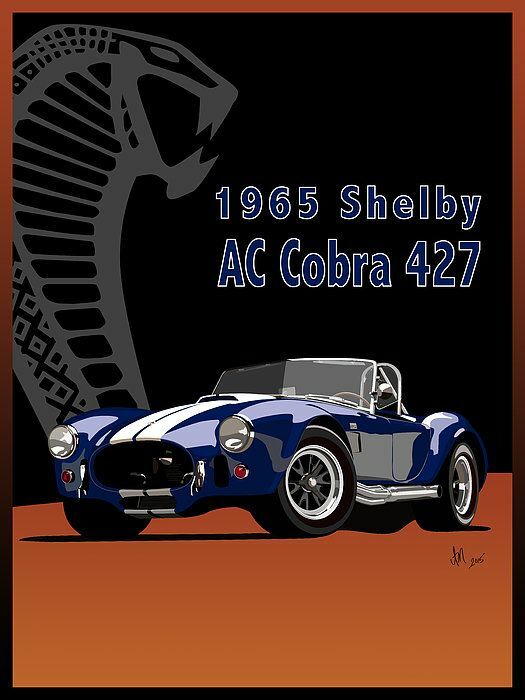 At the end in 1966, Shelby was left with 31 unsold competition cars; it was decided by Shelby American to sell them to the general public under the name of Cobra 427 S/C or Semi-Competition. 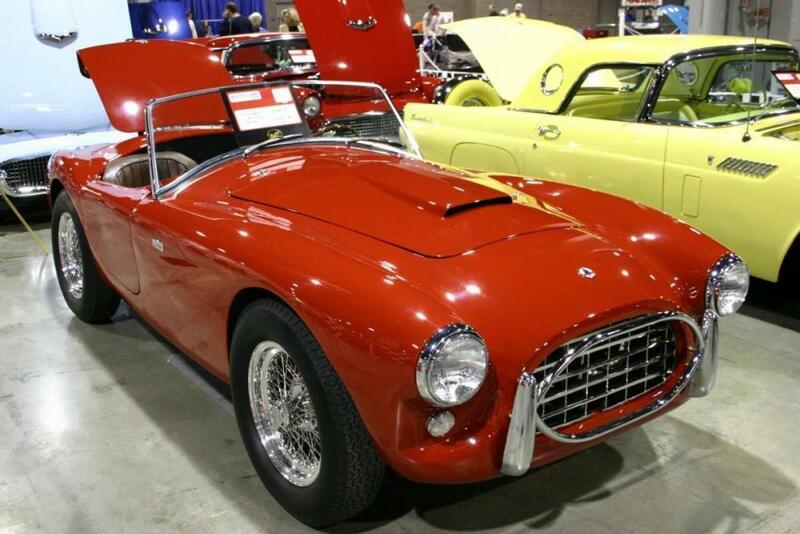 Today these S/C cars are the most sought after models and can sell in excess of 1.5 million dollars. 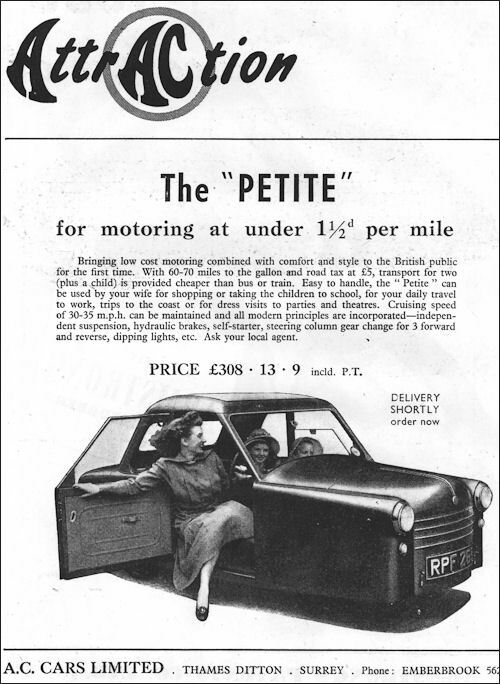 In 1966 a street model was available. 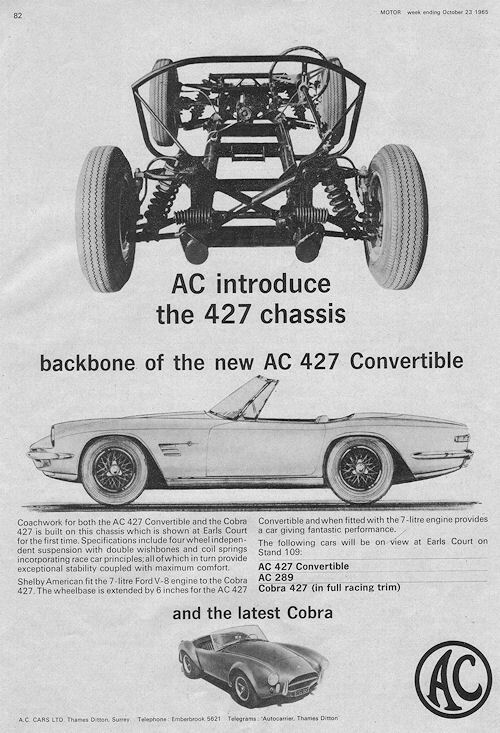 It came with a tamer motor, optional dual carburetors, a glove box, and exhaust running under the car. 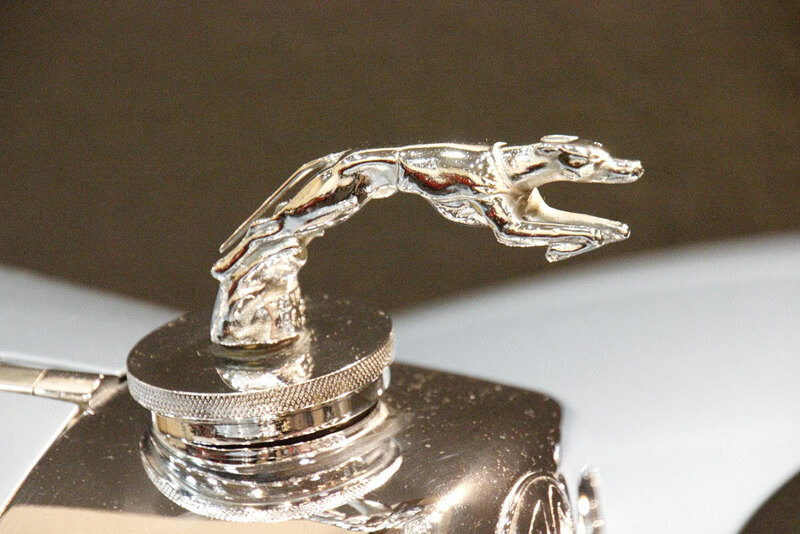 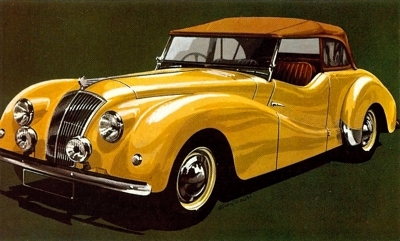 At the same time, the company realized they needed a grand tourer model that could appeal to wealthy customers. 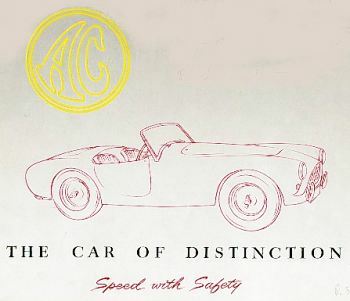 AC contacted the famed Italian coach builder Pietro Frua to design an appealing GT body that could be fitted on a MKIII Cobra chassis stretched by 6 inches (150 mm). 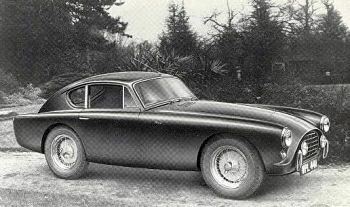 The new car was shown at the 1965 Turin show. 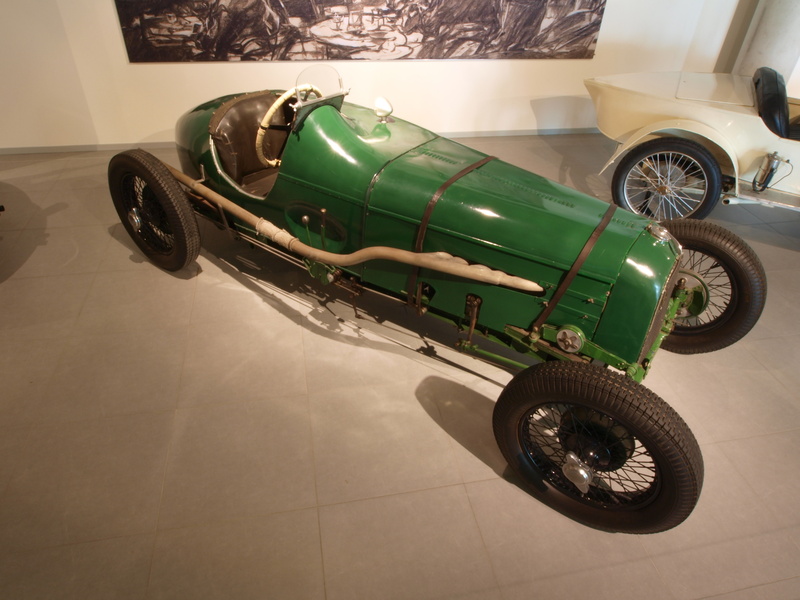 A few early models were fitted with the famed 427 Ford FE motors. 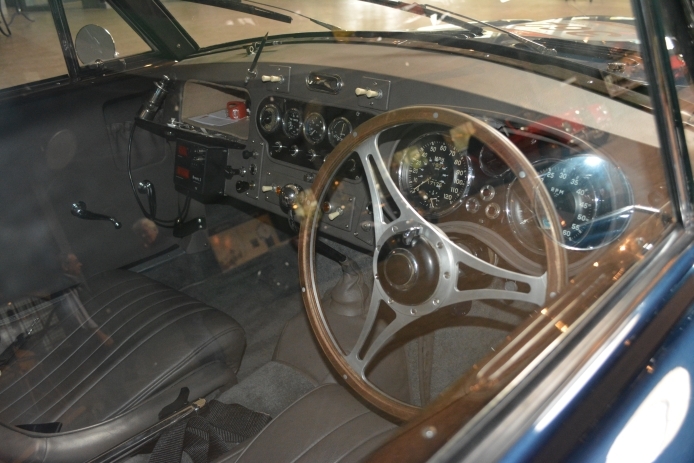 In 1967 the long-stroked 428 motor became available and the car was known as the AC Frua. 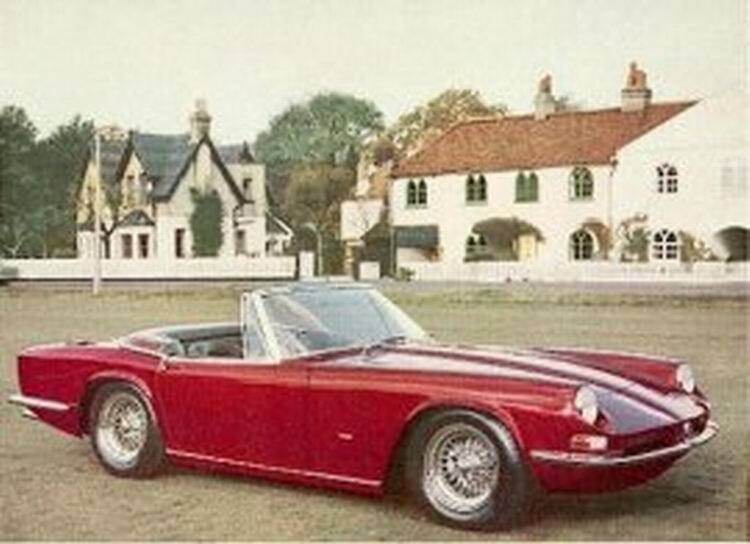 Built out of steel rather than AC’s usual aluminum, the Frua is heavier than a Cobra at slightly under 3,000 lb (1,400 kg). 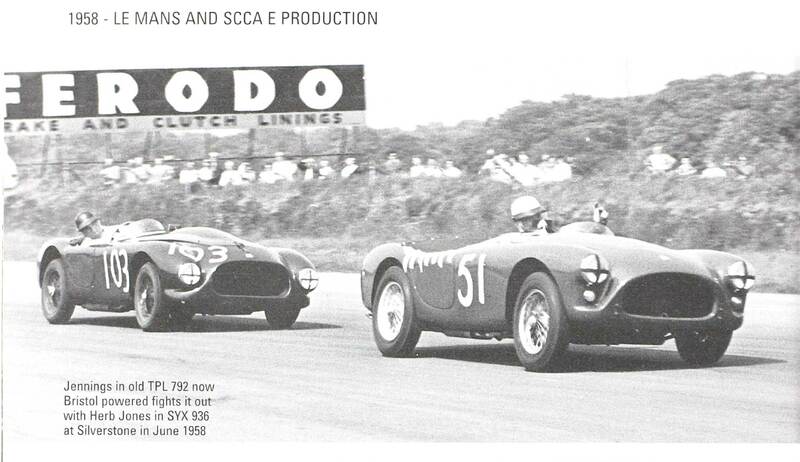 That said, it is still a light and very fast automobile built on a racing chassis. 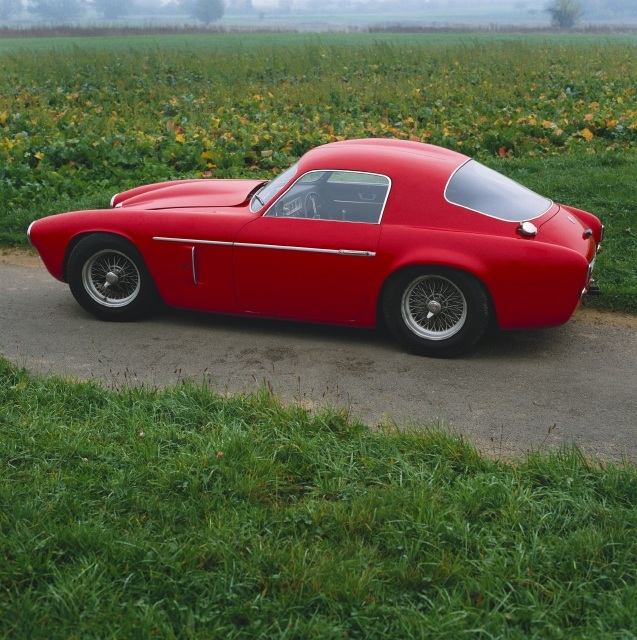 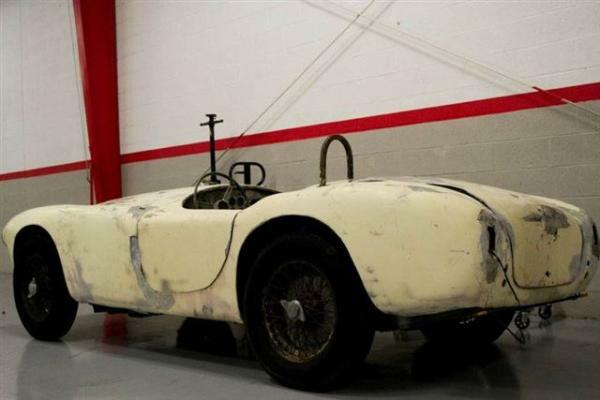 The car was never fully developed and the cost of sending chassis from England to Italy and back for final assembly made it so expensive that only a few were produced. 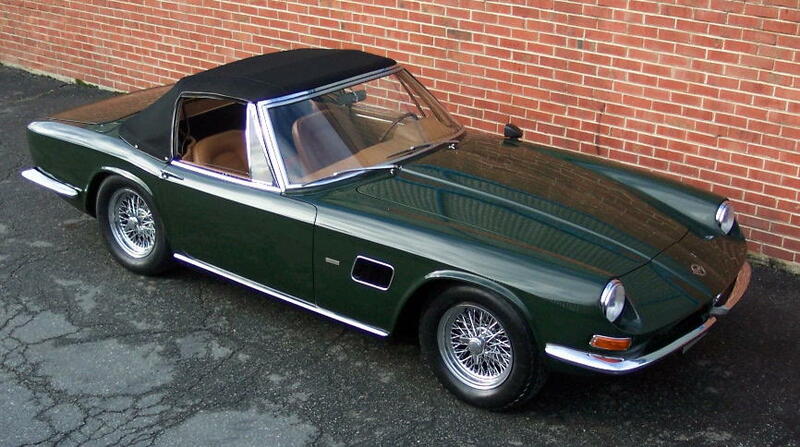 Production ended in 1973 after only 80 cars (29 convertibles and 51 coupes) were finished. 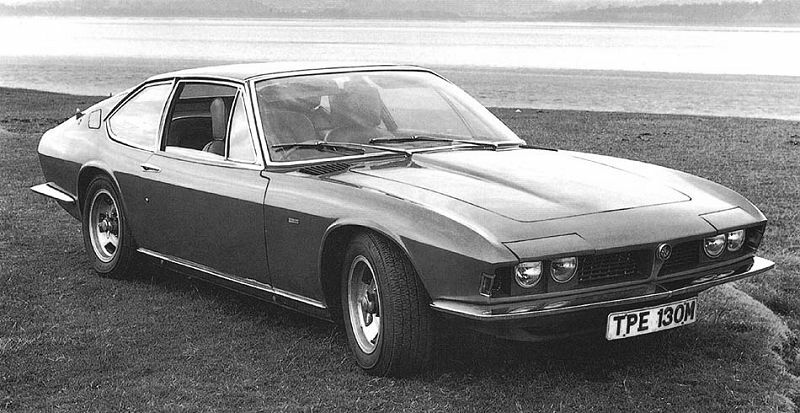 After the alliance of Monteverdi and Frua split off in Summer 1969, that bodyshell remained in the Frua works in Turin. 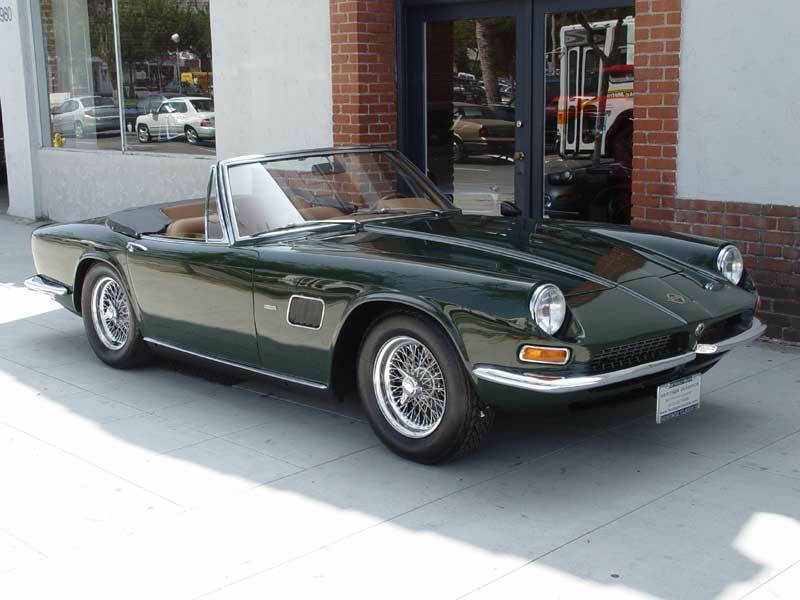 A year or so later Frua changed some details on front and rear, including some semi-hidden headlamps which had been seen on the Iso Lele and the Iso Grifo, second series, before. 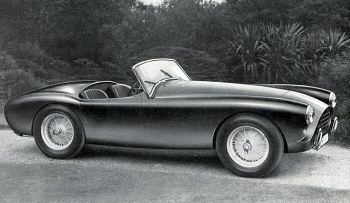 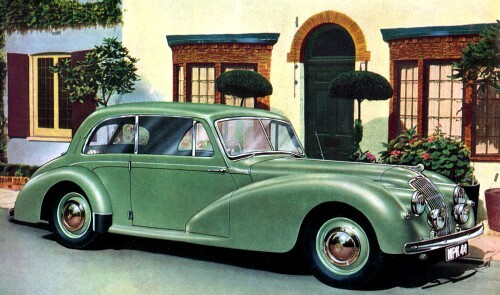 The car was called AC 429; it remained a one-off. 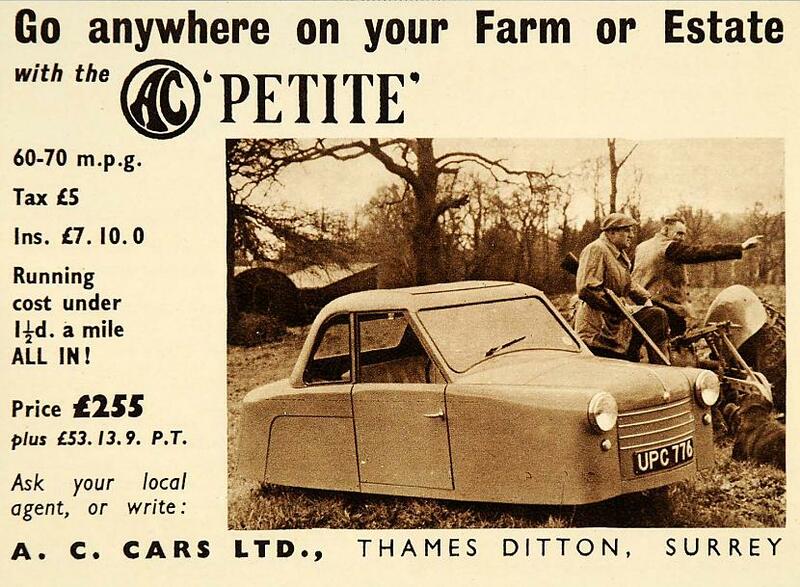 The 1970s were not a good period for luxury car manufacturers and Derek Hurlock went searching for a totally new smaller car. 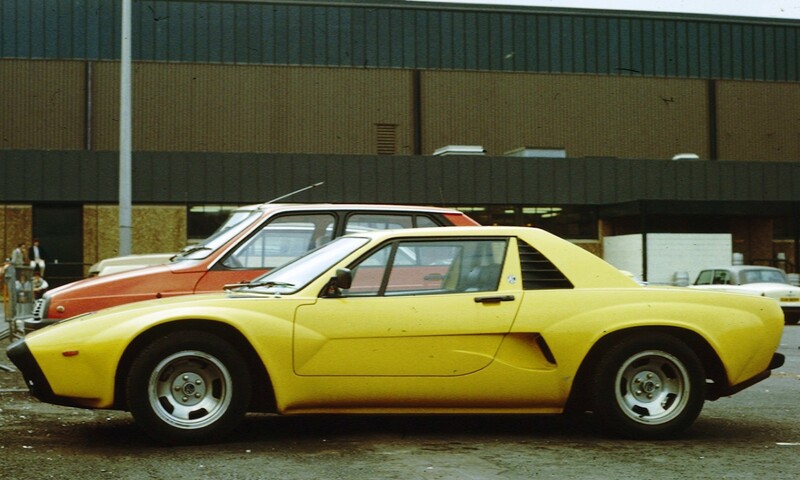 Mid-engined designs were in fashion at the time and in 1972 the Diablo, a prototype with an Austin Maxi engine and transaxle, was built by privateers Peter Bohanna and Robin Stables. 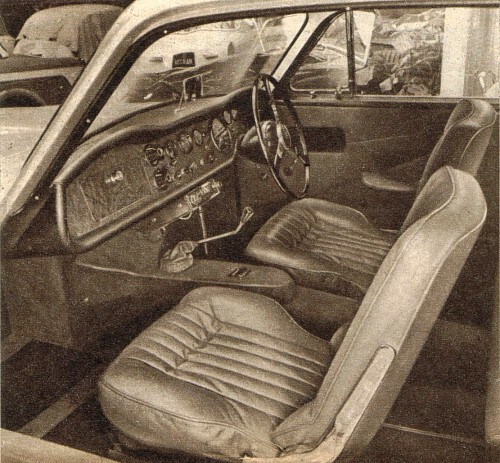 In much the same way as they had taken up the Tojeiro prototype and turned it into the Ace, AC acquired the rights and at the 1973 London Motor Show showed their own version, the mid-engined ME3000 with the 3.0-litre Ford Essex V6 engine installed transversely over a bespoke AC-designed gearbox. 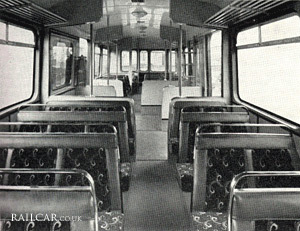 Development was virtually complete in 1976 when new Type Approval regulations were introduced. 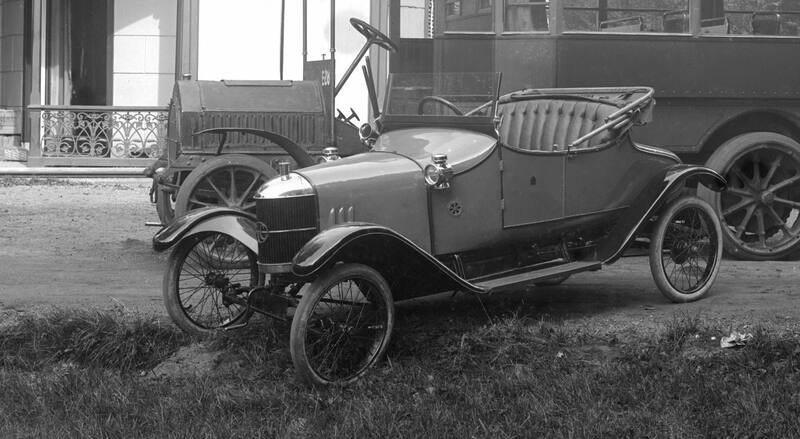 A prototype failed the 30 mph (48 km/h) crash test, and the chassis had to be redesigned. 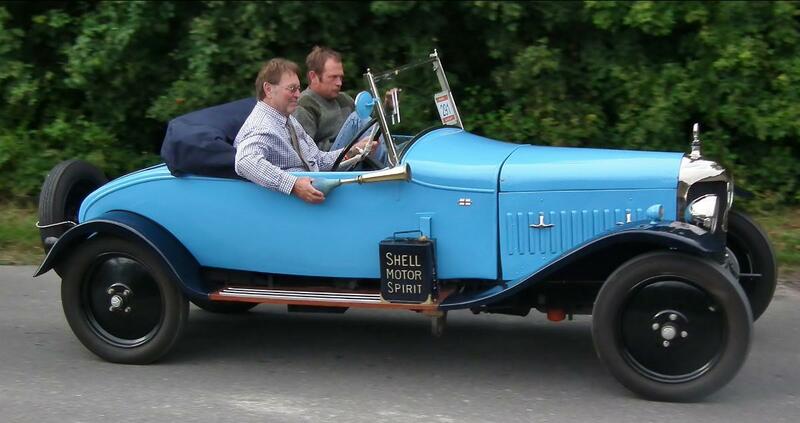 On the second attempt, the car passed with flying colours. 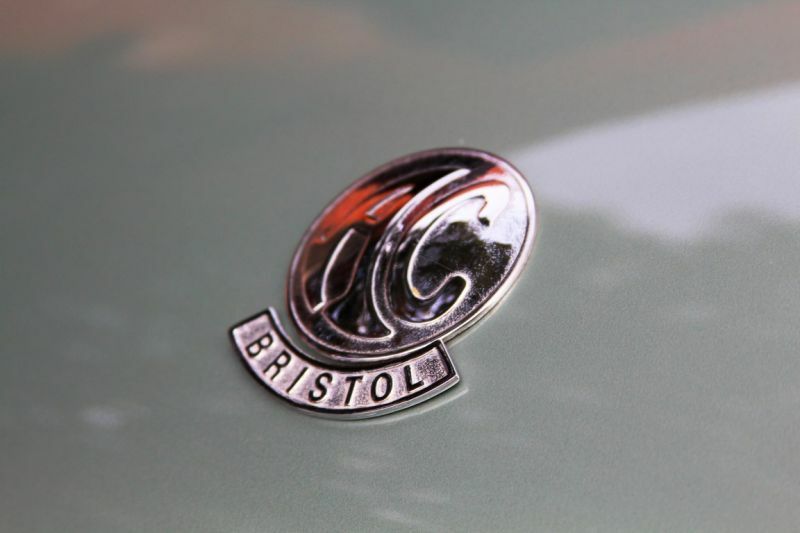 This was a huge achievement for a tiny firm—Vauxhall had to make several attempts before the contemporary Chevette passed. 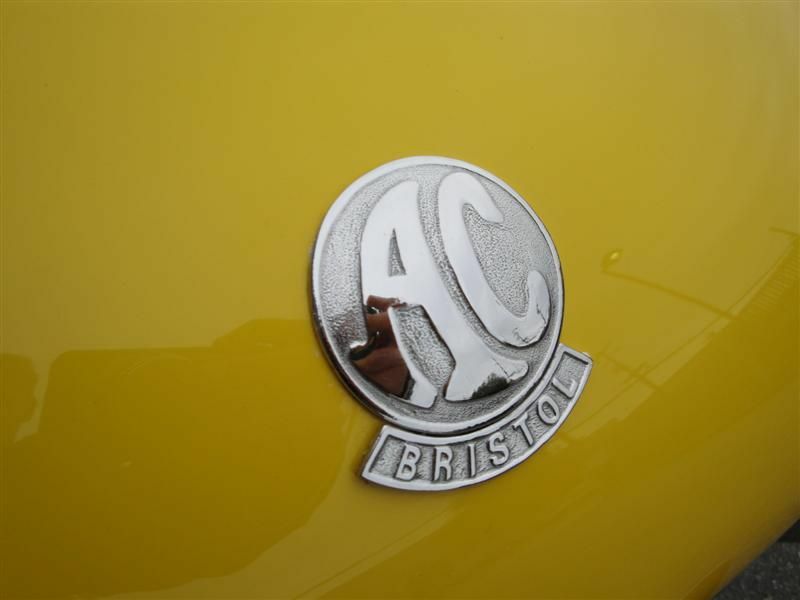 For AC, such delays meant that the first production cars (now renamed 3000ME) were not delivered until 1979, by which time they were in direct competition with the Lotus Esprit. 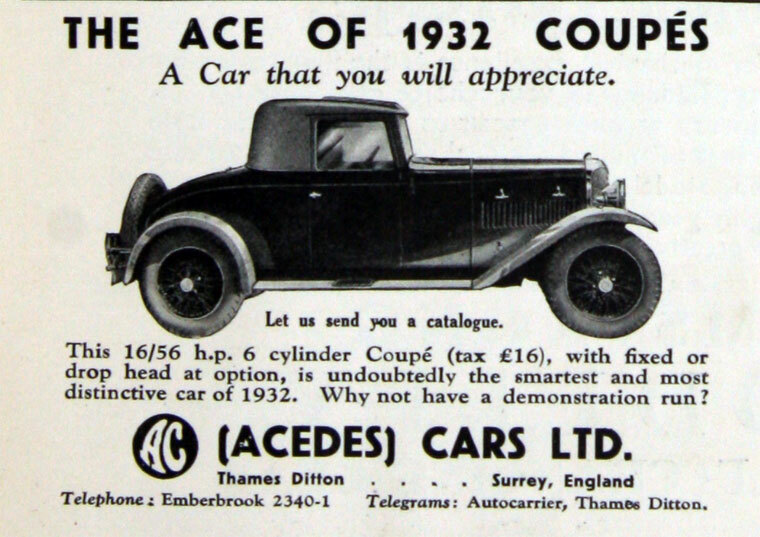 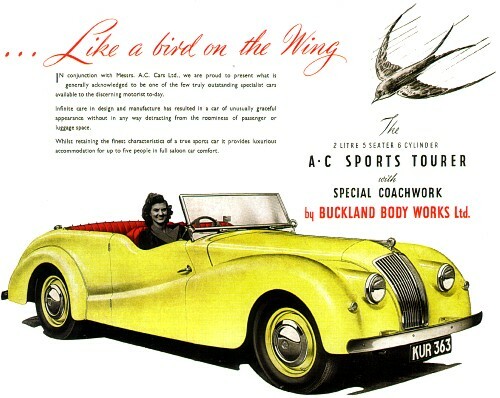 Although comfortable, brisk, nicely built and practical, AC’s ambitions of selling 250 cars per year were a distant memory. 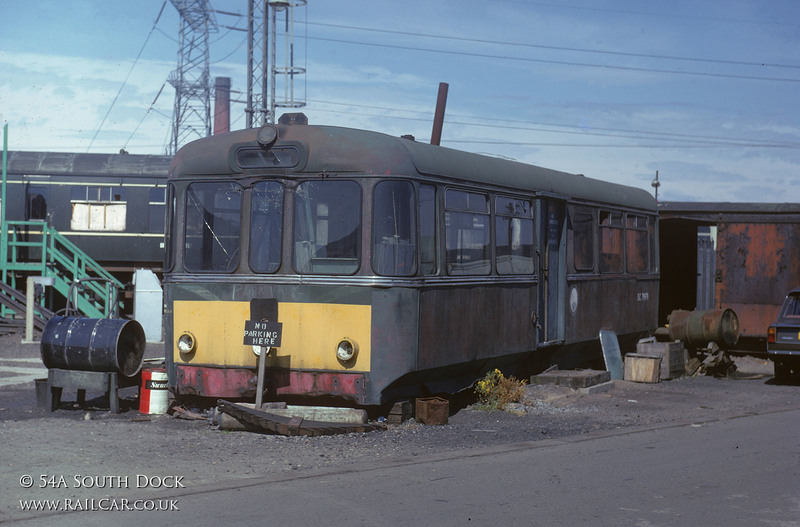 After just 71 cars were sold, Hurlock called a halt to production as his health was suffering and the company was struggling in the teeth of a recession. 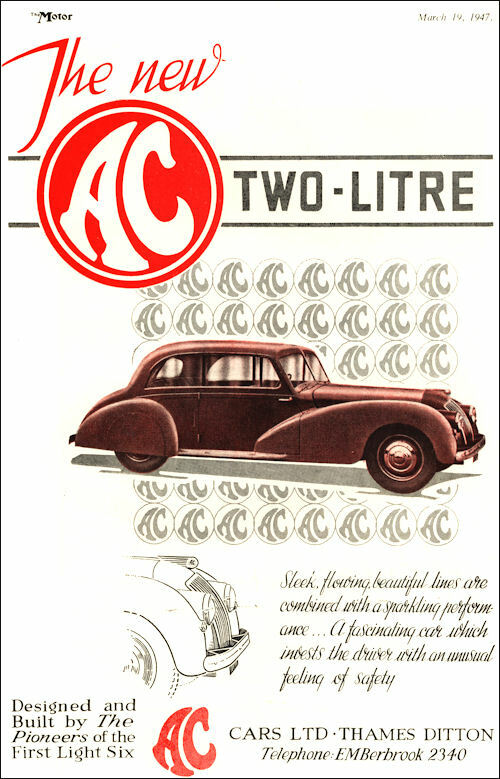 In 1984, production stopped at Thames Ditton and the car and the AC name were licensed to a new company registered as AC (Scotland) plc run by David McDonald in a new factory in Hillington, Glasgow. 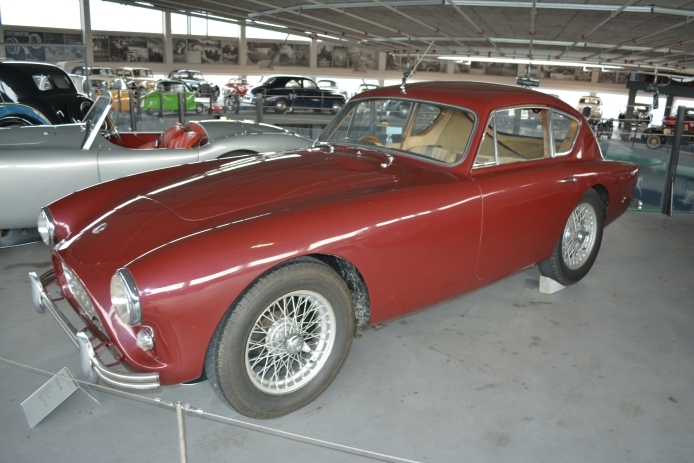 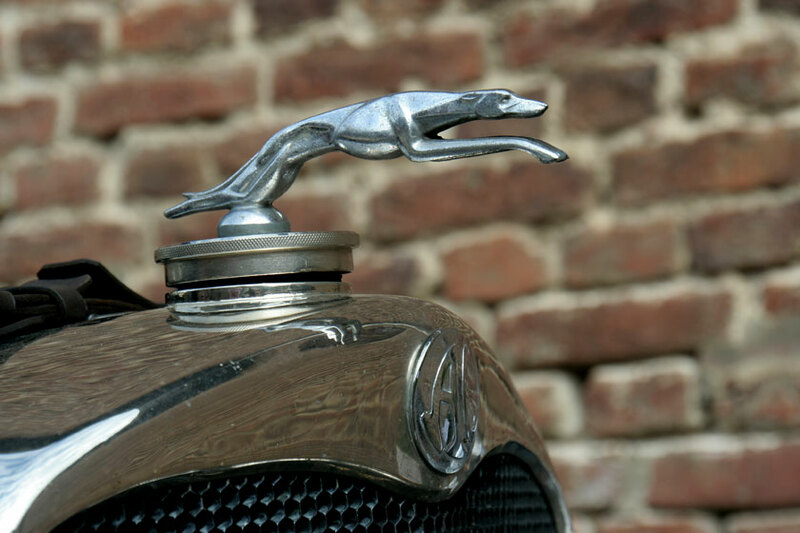 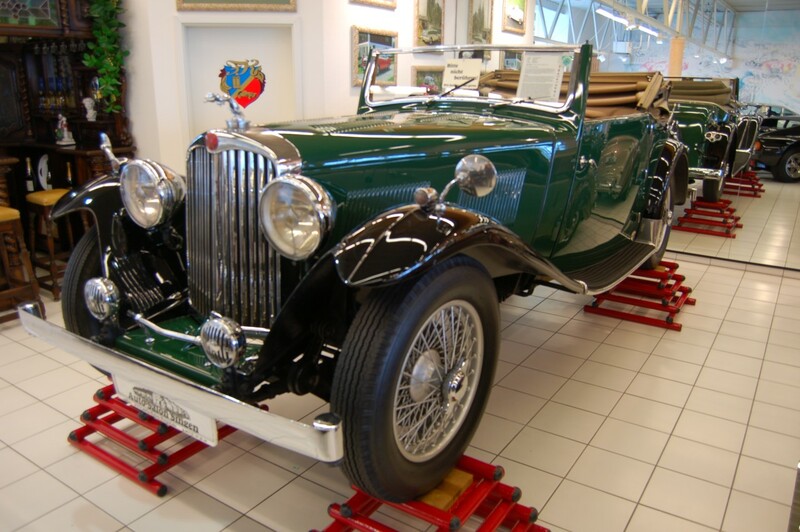 Here, 30 cars were built, including a development car tested with Alfa Romeo‘s 2.5-litre V6 engine and a nearly complete Mark 2 prototype of the same. 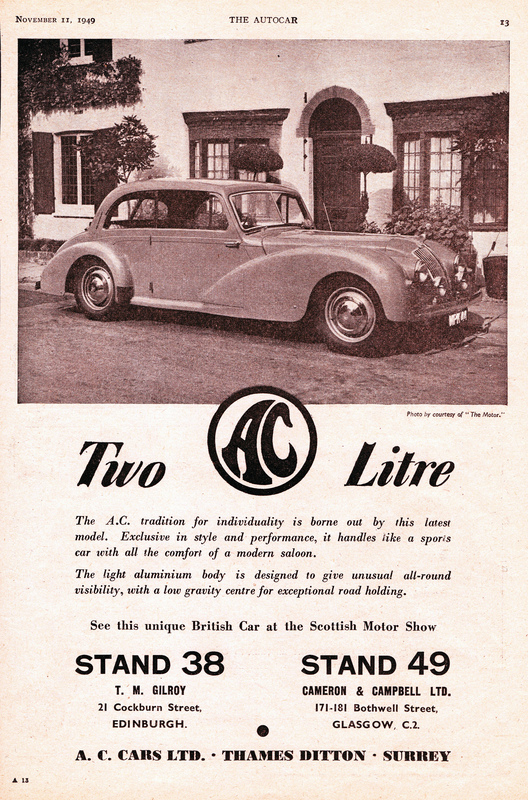 Regardless (or possibly because) of these developments, AC Scotland called in the receivers in 1985. 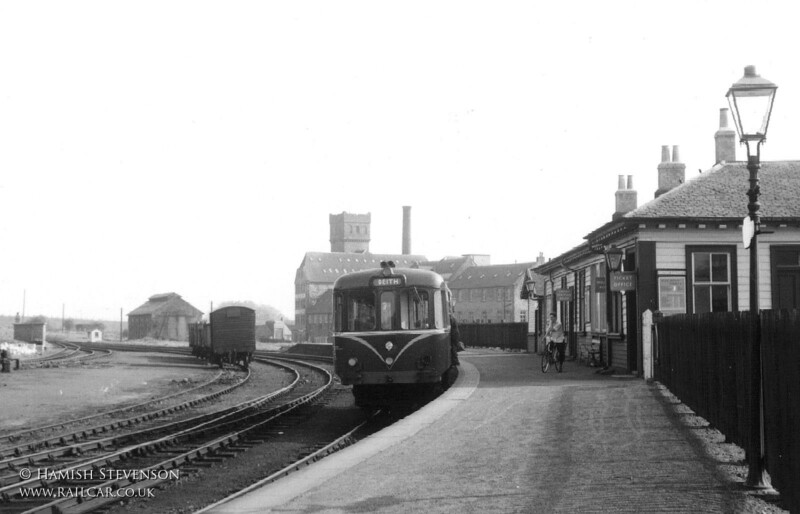 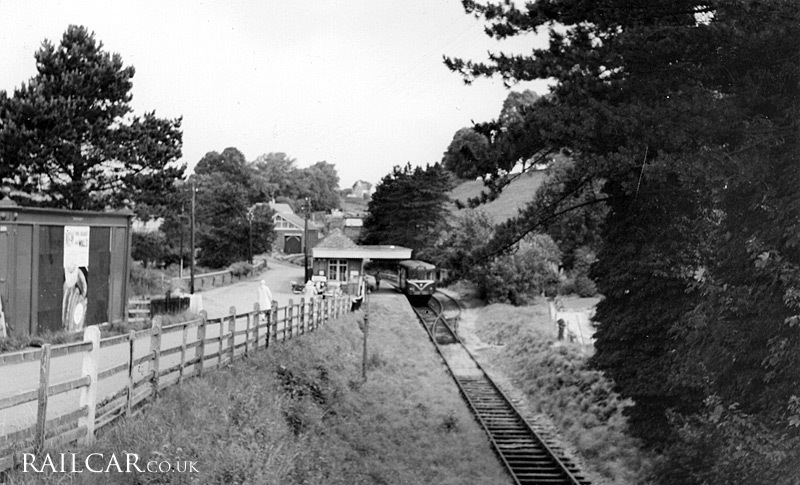 After selling the historic High Street works for redevelopment, AC themselves soldiered on as a service operation in the “21st Century” works on Summer Road until the Hurlock family finally sold their holdings in 1986 to William West. 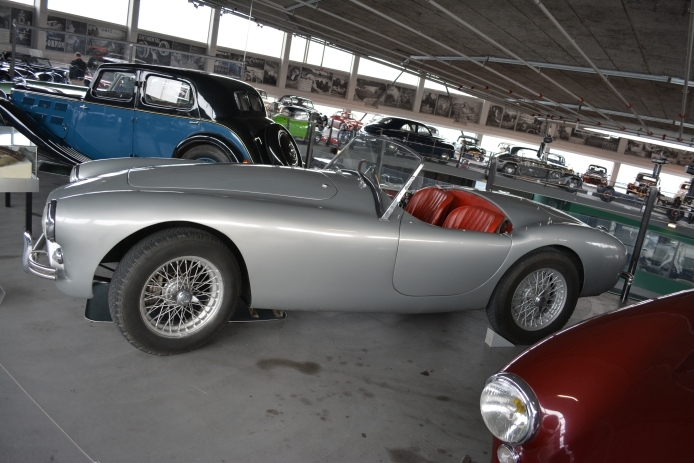 After some complex machinations the company was split between property interests and the car brand; the former was renamed and the latter was acquired by C.P.Autokraft’s owner Brian Angliss. 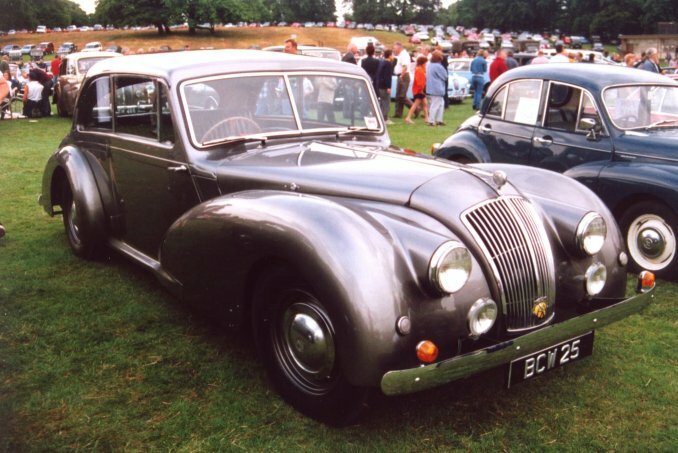 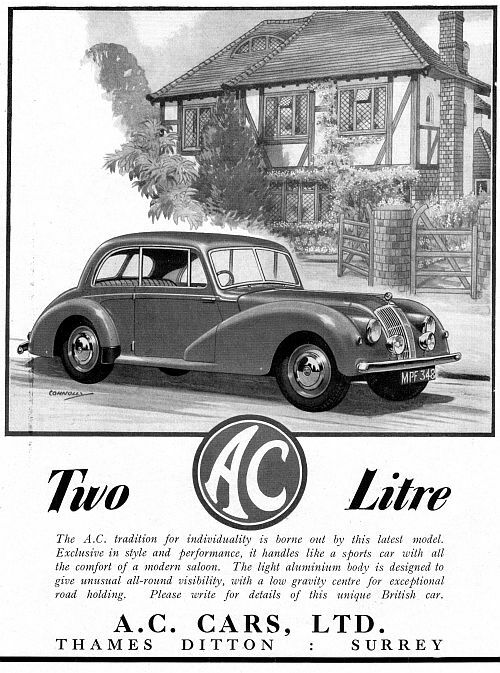 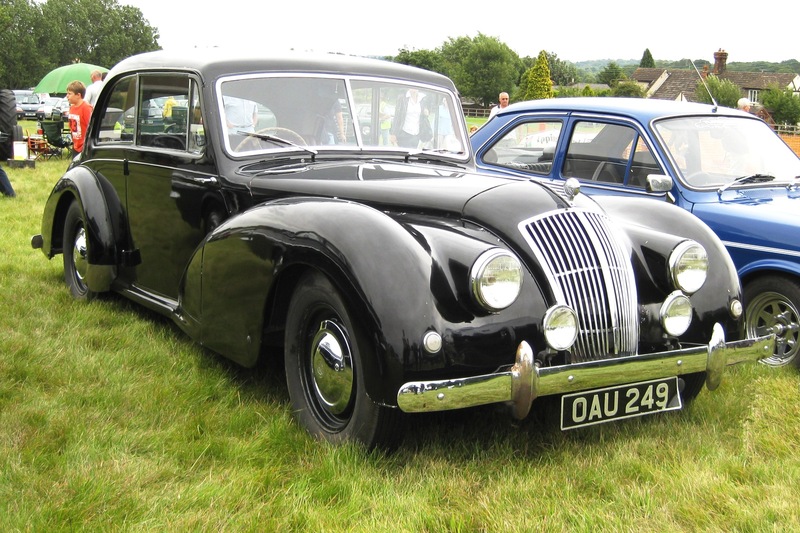 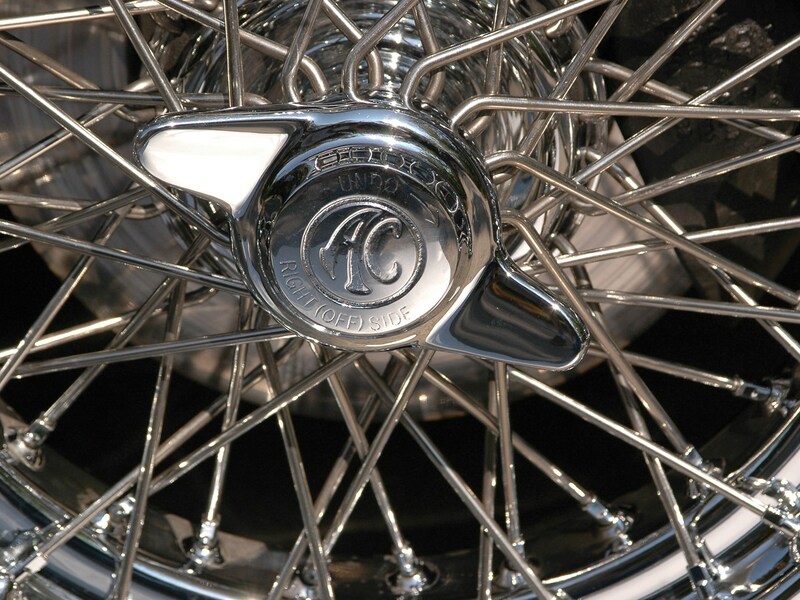 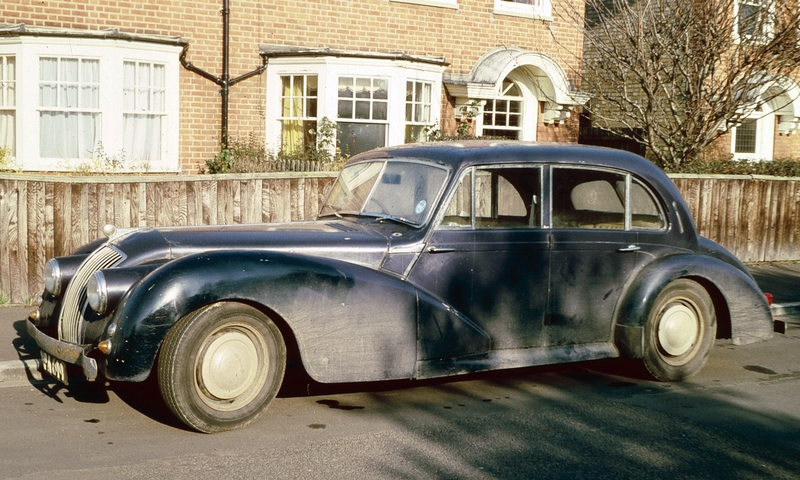 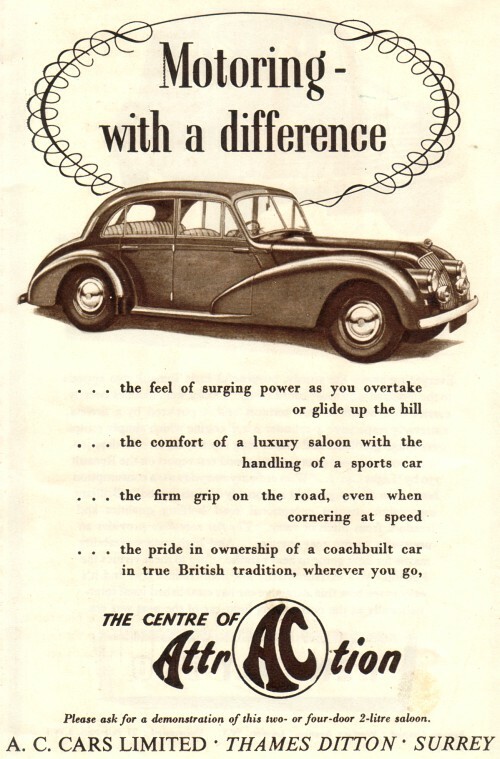 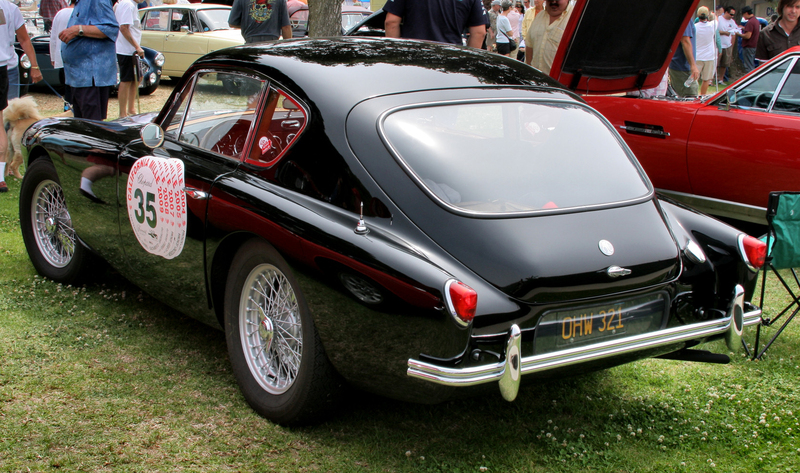 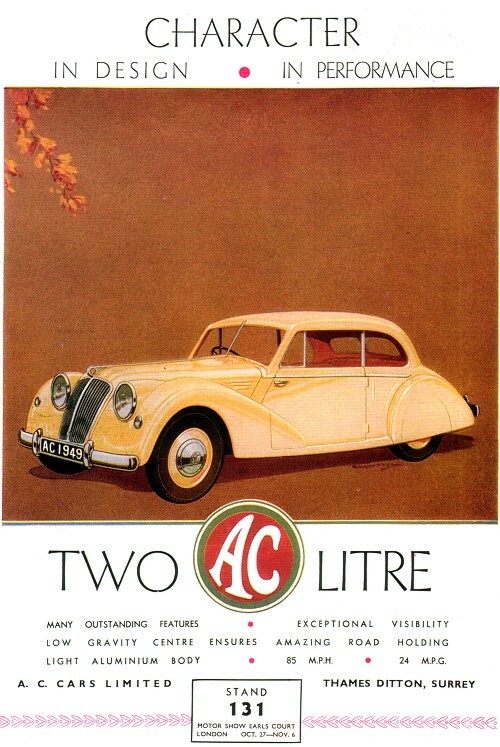 Early cars were sold as the Autokraft MKIV, but eventually Angliss acquired the rights to use the AC name. 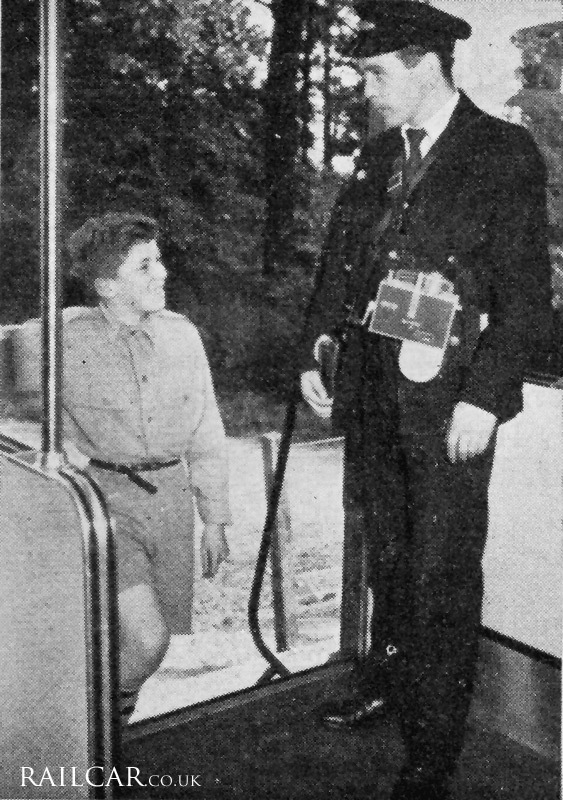 Derek Hurlock had been strongly protective of the name, but Angliss’ high standards of craftsmanship won him over. 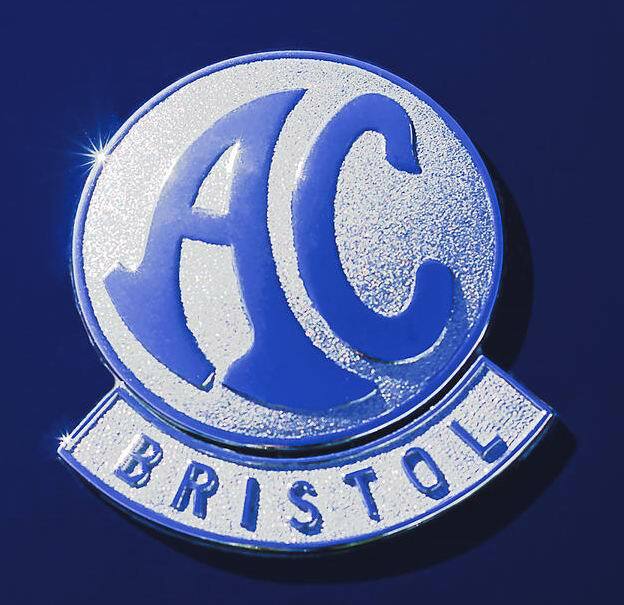 When the Hurlock family finally sold up in 1986 Angliss fully acquired the AC trademark rights and set up a new AC company as a joint venture with Ford, who had also recently bought Aston Martin. 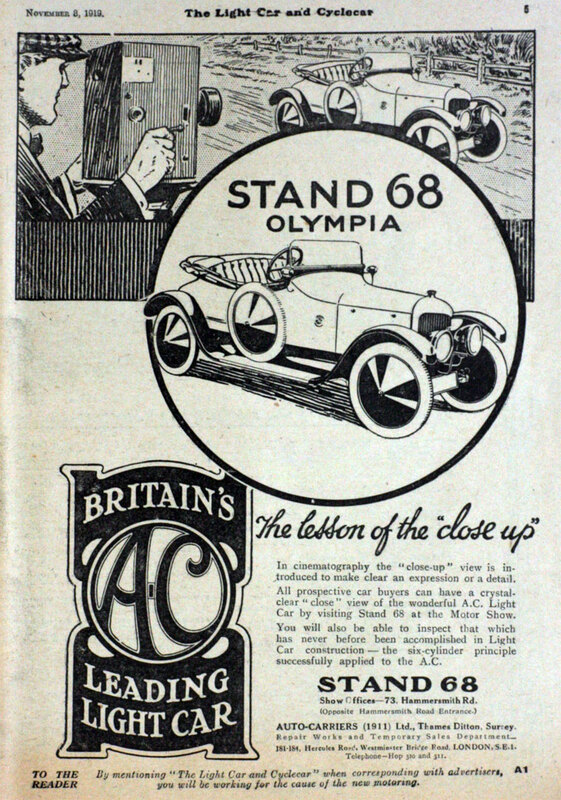 A big conflict followed over the future direction for AC, but Angliss eventually won his independence as well as Ford’s continuing and essential cooperation as an engine and parts supplier. 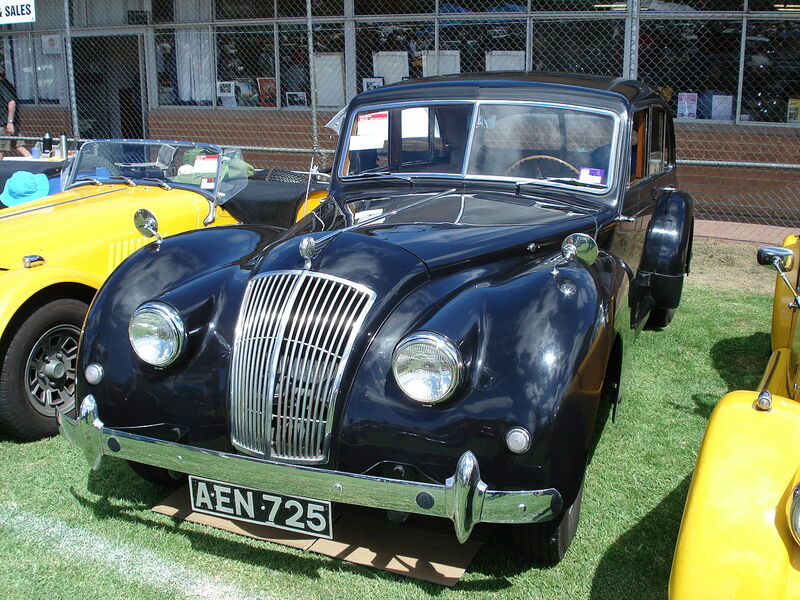 Angliss looked for a new car to complement and perhaps replace the MKIV. 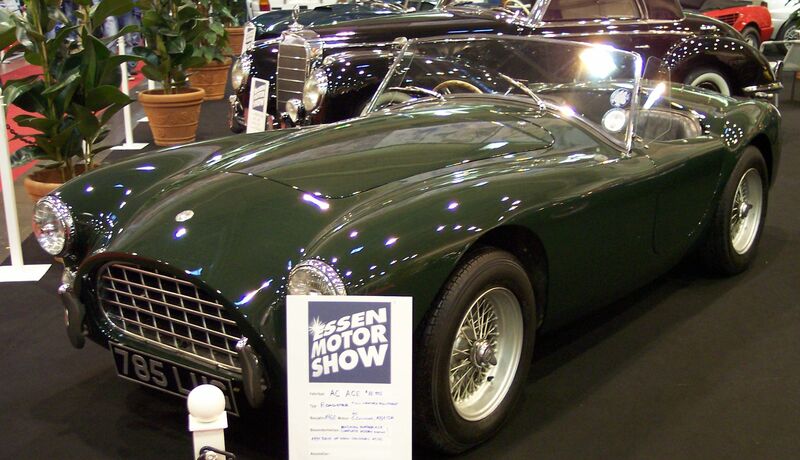 At the 1993 London Motor Show, he introduced a new vehicle that he named the AC Ace. 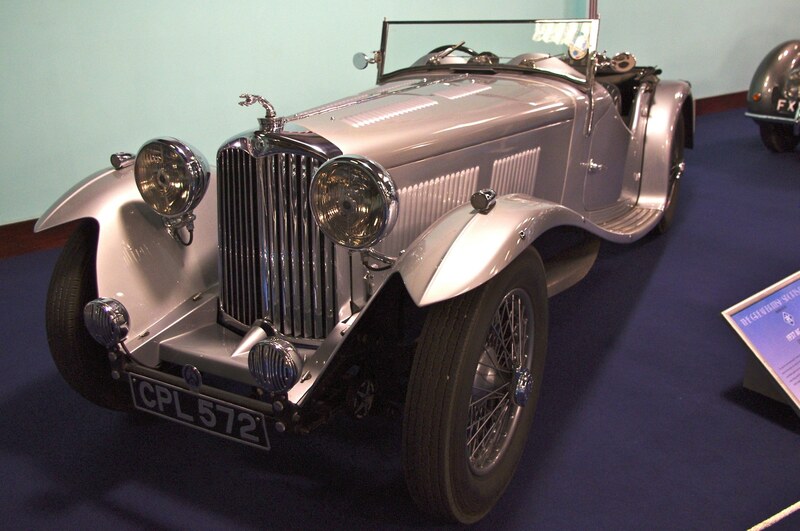 It was a modern automobile with a stainless steel chassis and an aluminum body, but was expensive to develop and build. 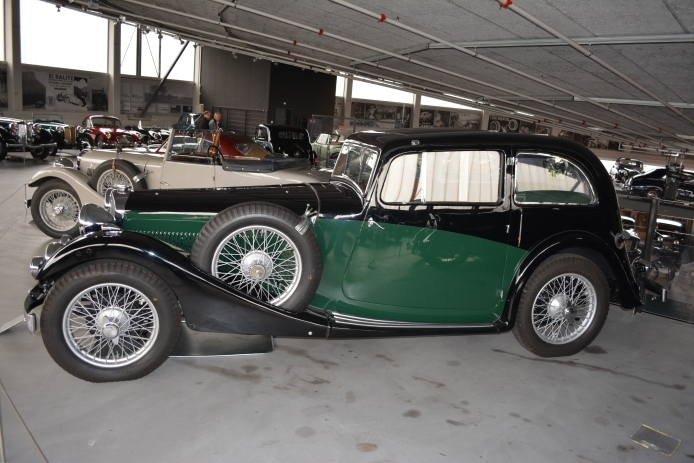 The costs hit Angliss hard and he sold his large motor bike collection, vintage Bentley and other assets to try to make ends meet. 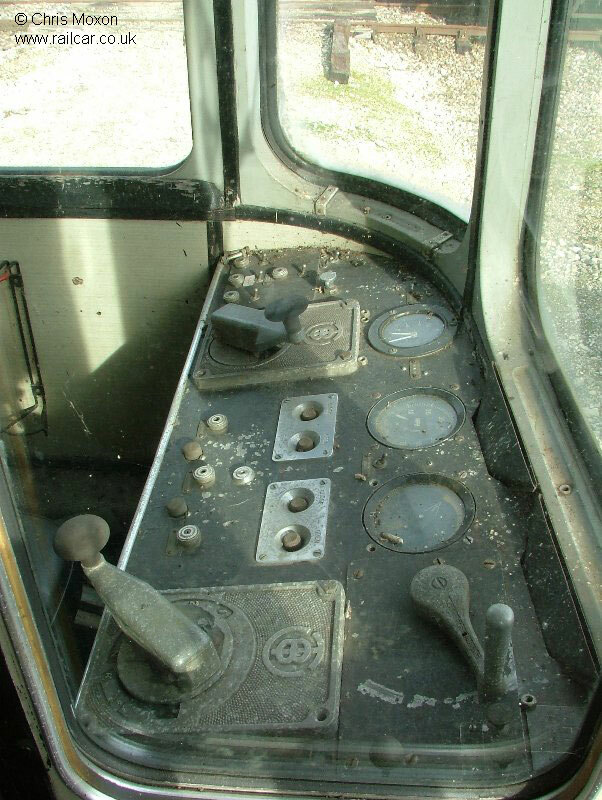 The receivers were called in by 1996 after approximately 50 “new” Aces had been built. 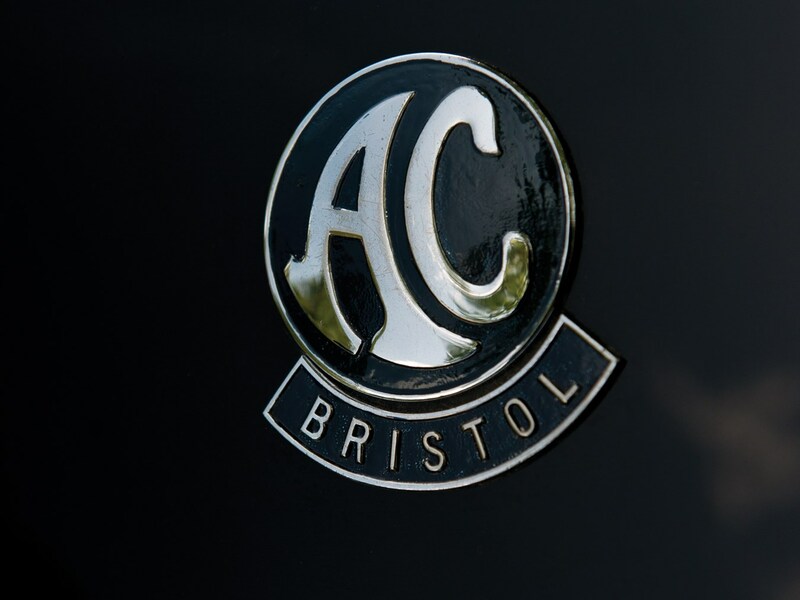 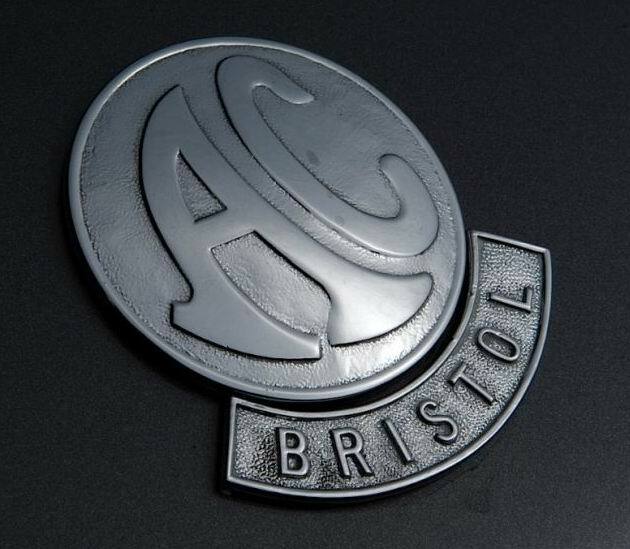 In March 1996, largely due to the cost of developing the new Ace, Angliss’ company went into receivership and was eventually sold to Pride Automotive in December 1996, who continued car production in Weybridge, Surrey under the name of AC Car Group Ltd. 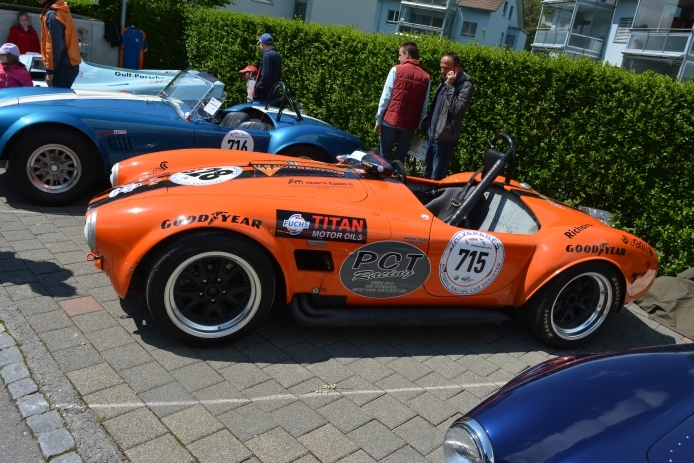 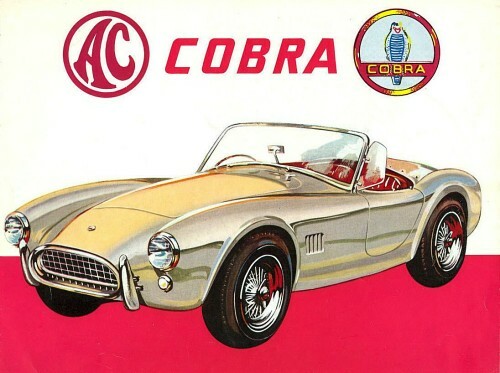 Both the Cobra Mk IV and the Ace were made, and soon a ‘CRS’ version of the Mk IV was announced with a carbon fibre body shell, a 212 S/C version with Lotus twin turbo V8 power, as well as the AC Superblower with a supercharger Ford V8. 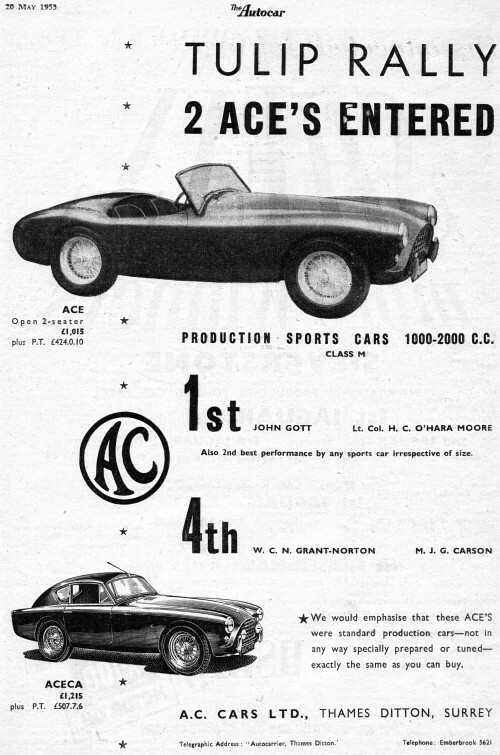 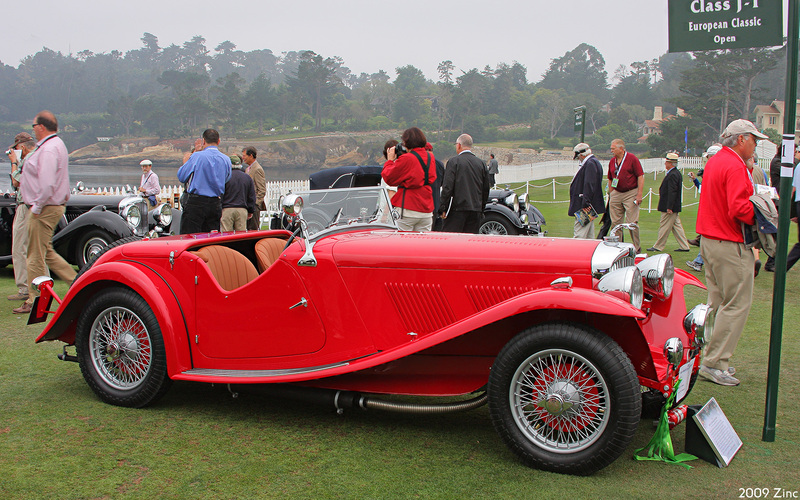 Two Aceca coupes (in closed version of the Ace) were also made. 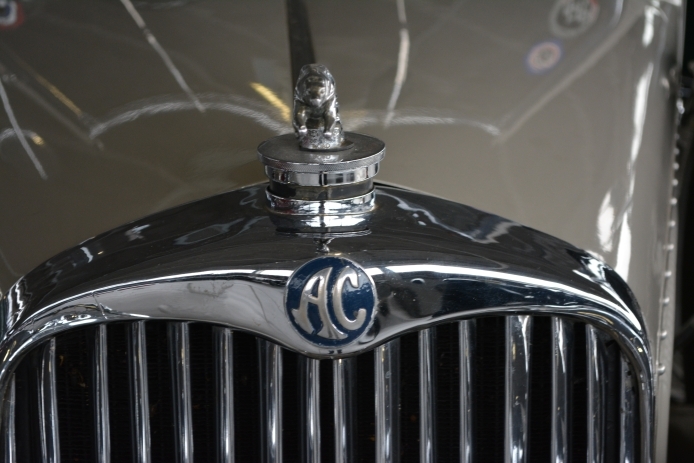 In August 2002, AC Motor Holdings Ltd, was incorporated in Malta. 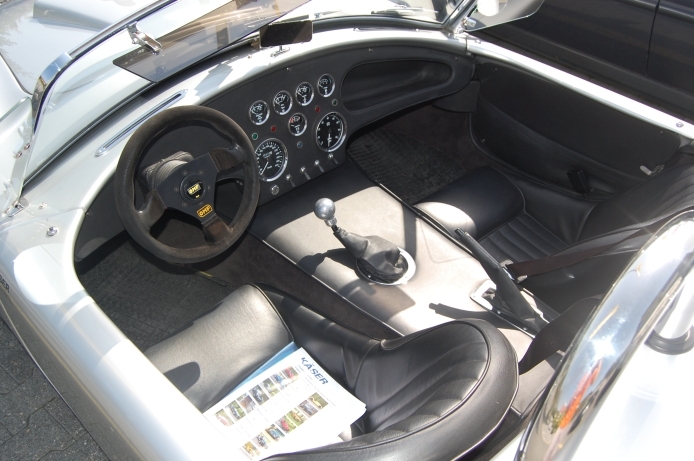 In 2003, Carroll Shelby International and AC Motor Holdings, Ltd. announced production of an authentic Shelby/AC Cobra, with the production vehicle arriving at dealers in July 2004. 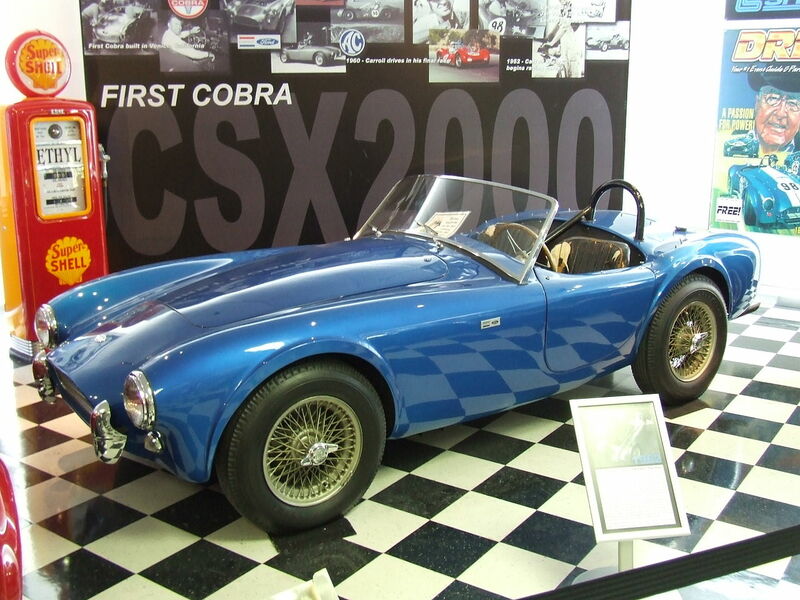 Initially, available models included Shelby AC 427 S/C Cobra and Shelby AC 289 FIA Cobra, which would be branded as the CSX 1000 and CSX 7500 Series, respectively. 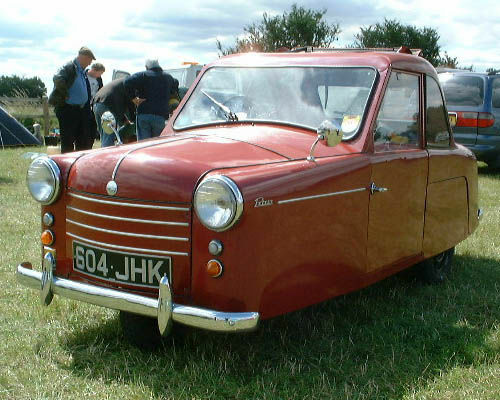 In February 2004, the first handcrafted aluminum body shell was built at Frimley works. 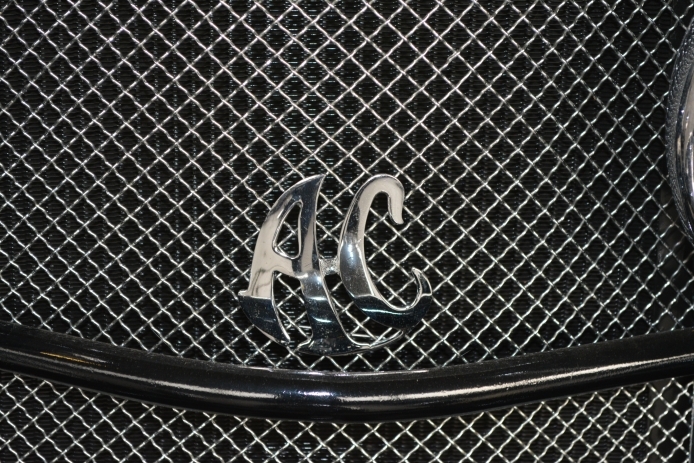 In 2004 a new manufacturung plant was opened in Malta and production of the carbon-fibre-bodied AC MkV began. 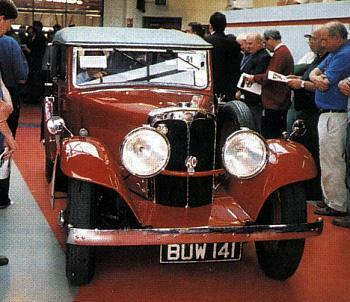 Due to problems with the factory building, production ceased in 2007. 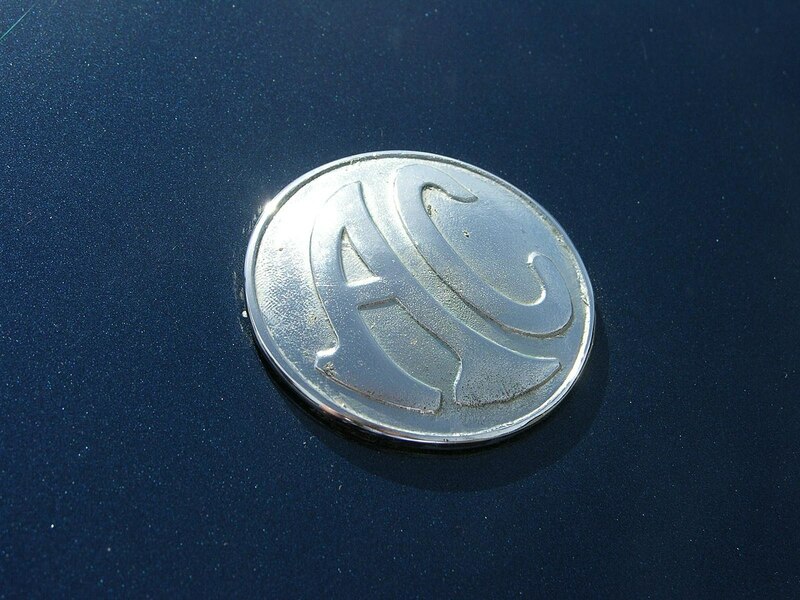 In August 2008, Acedes Holdings Llc, was incorporated in St Kitts. 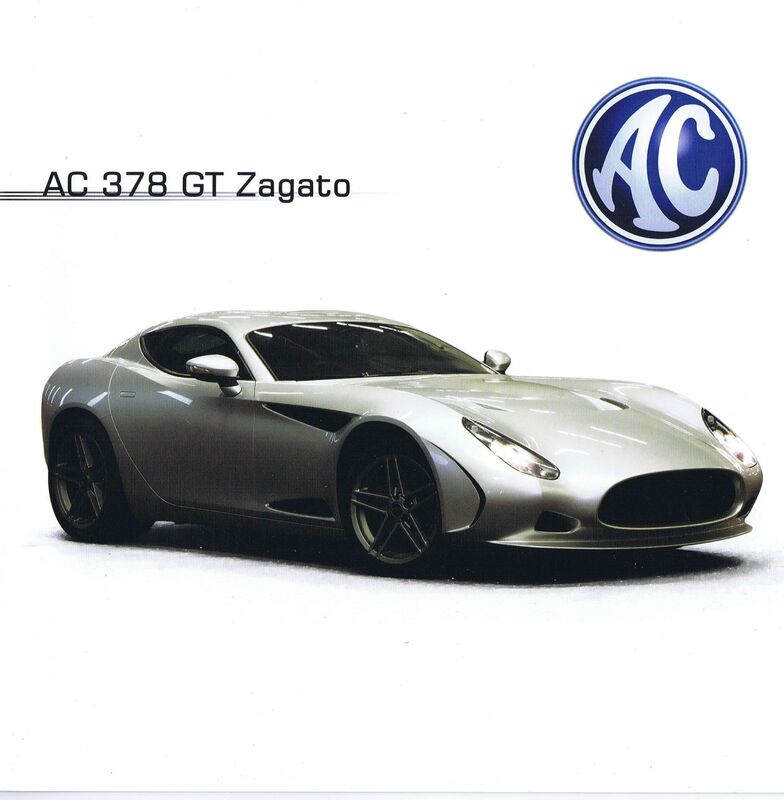 In 2008, AC announced a joint venture with Brooklands Motor Company (the spiritual successor of Autokraft) in Weybridge, Surrey, UK and confirmed plans for the continuation of the traditional AC designed tubular chassis and aluminium-bodied models. 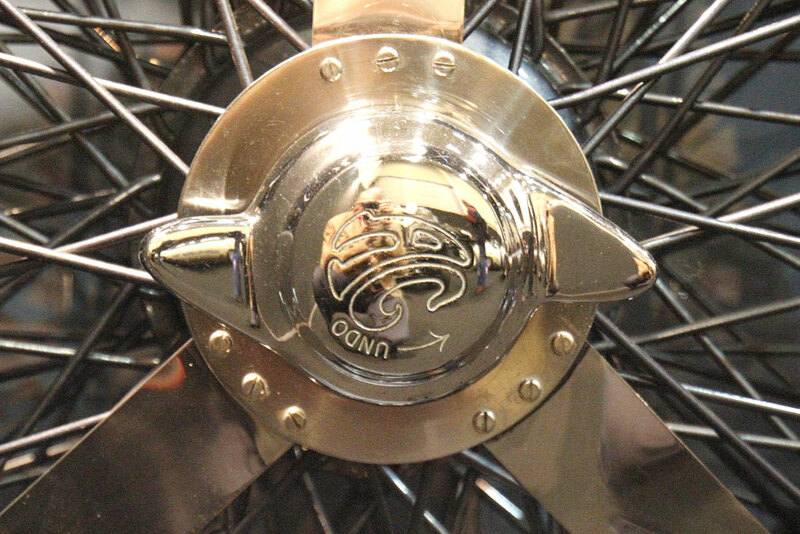 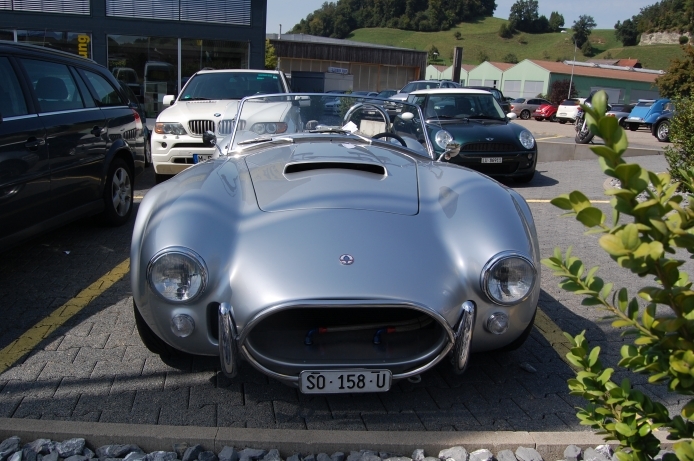 In 2010, AC announced a joint venture with the USA-based company Iconic which resulted in the design of the ultimate “Cobra”: the “Iconic AC Roadster”. 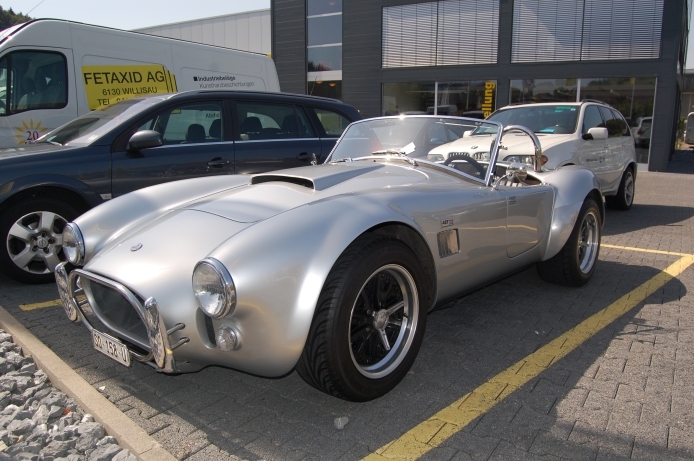 AC Cobra 260/289 4261/4727 cc V8 75/571 1962–1965 Legendary two-seat aluminum roadster. 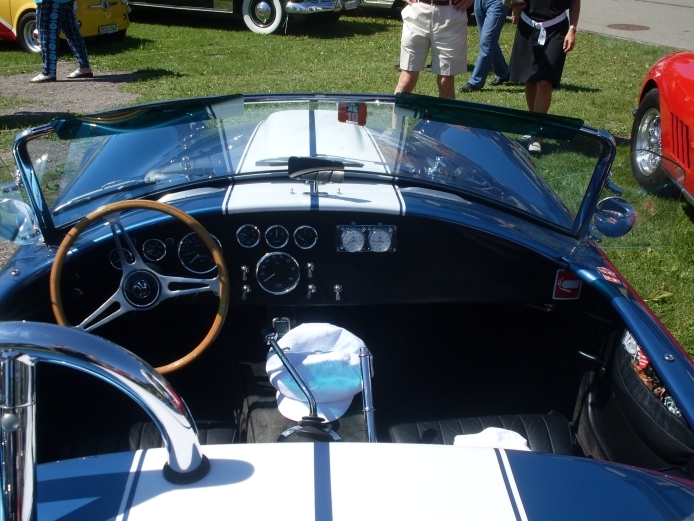 Ford small block V8 Engine. 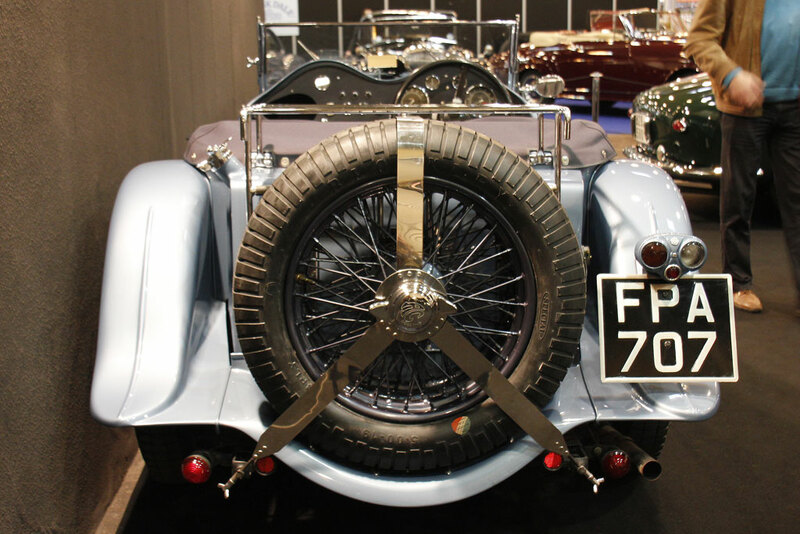 Four-wheel disk brakes. 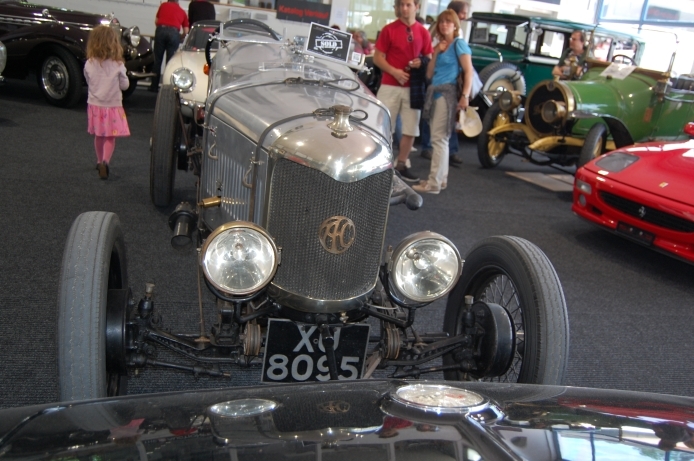 Early MK1 cars had cam and peg steering, later MK2 cars rack and pinion. 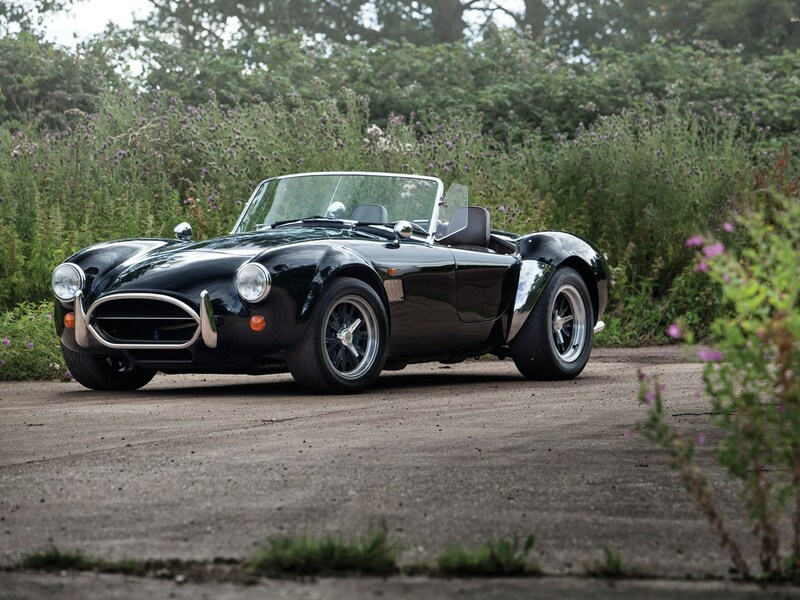 AC Cobra 427/428 6997/7016 cc V8 306 1965-1966 MK3 series. 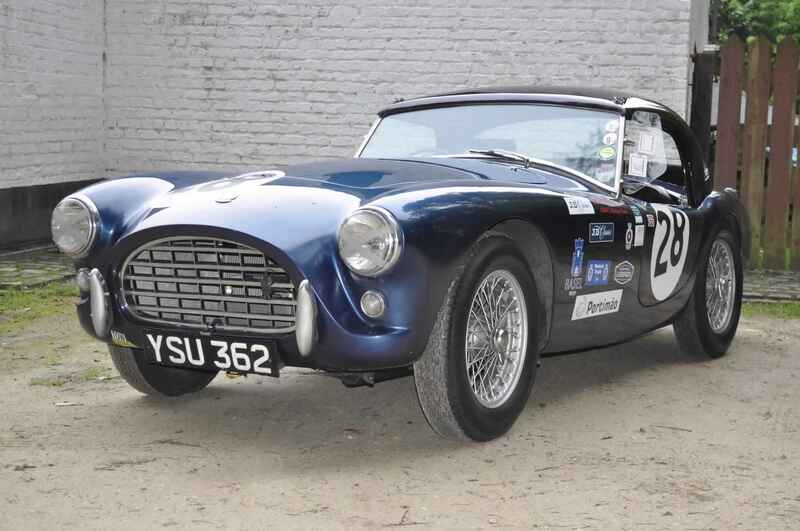 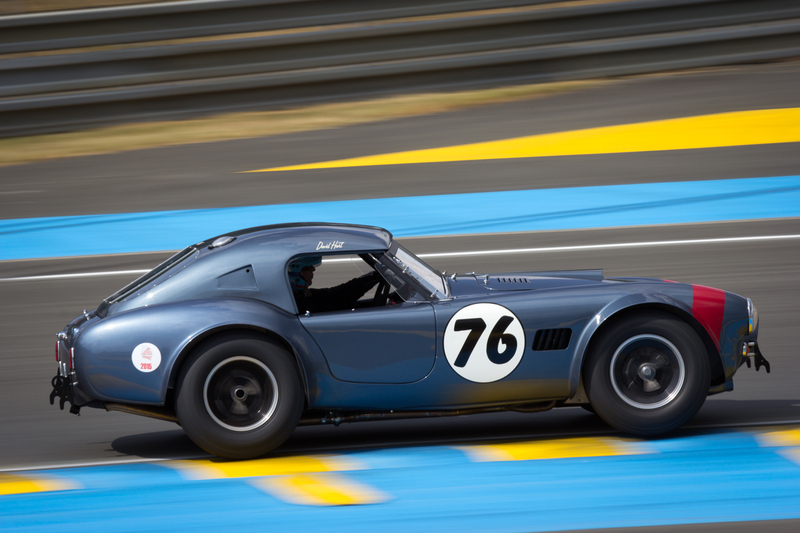 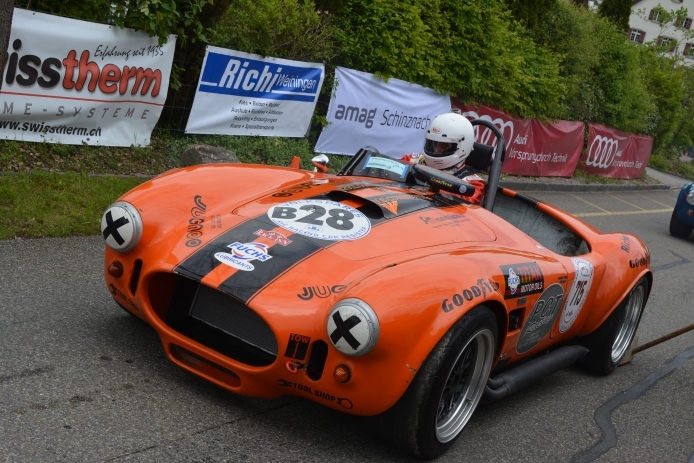 A reworked AC Cobra designed for racing with coil springs all around and beefed up 4″ chassis tubes. 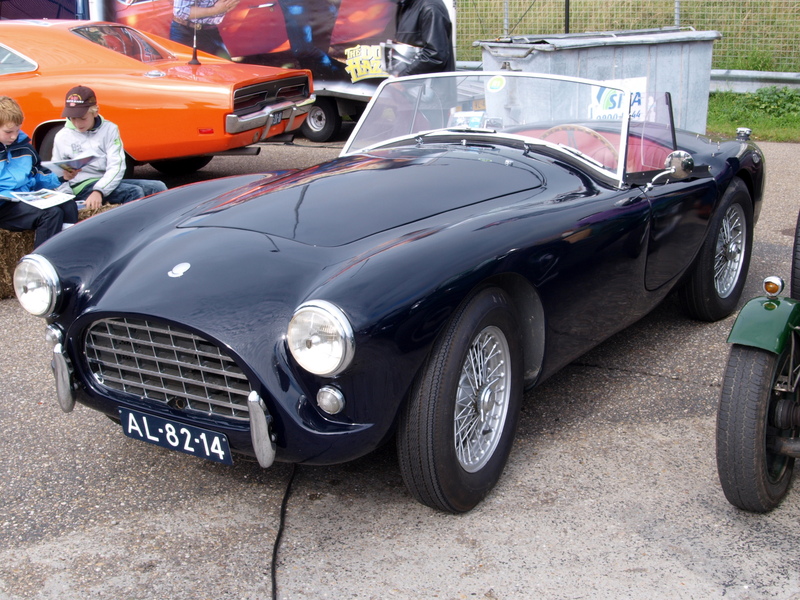 Early cars had Ford FE 427 Engines, later cars fitted with less expensive 428 FE motors. 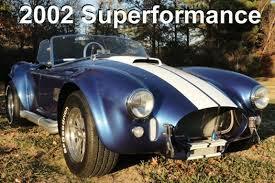 Around 400 bhp (298 kW) or more depending on version, four-wheel disc brakes and rack and pinion steering. 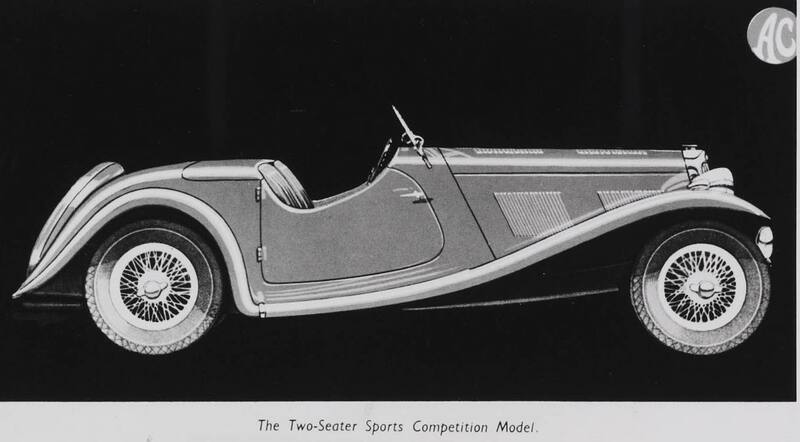 Aluminum-bodied two-seat roadster bodies. 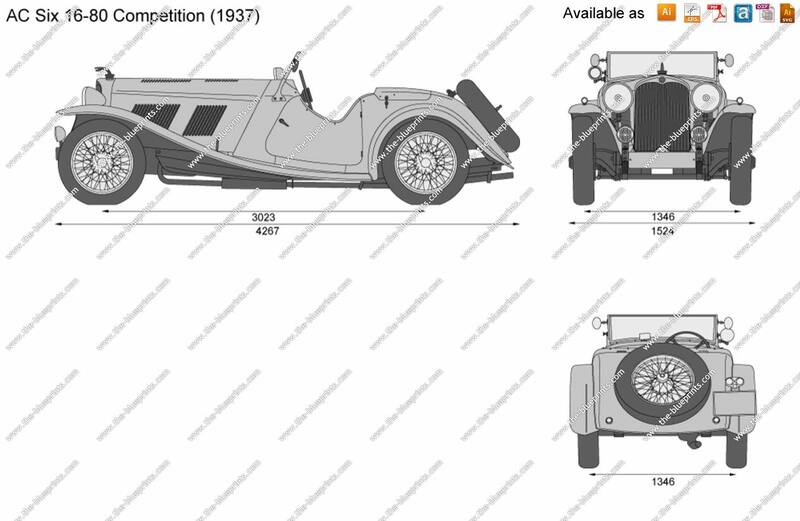 AC 3000ME 2994 cc V6 Ford ‘Essex’ 101 full production cars 1979–1985 Transverse mid-engined with five-speed AC gearbox. 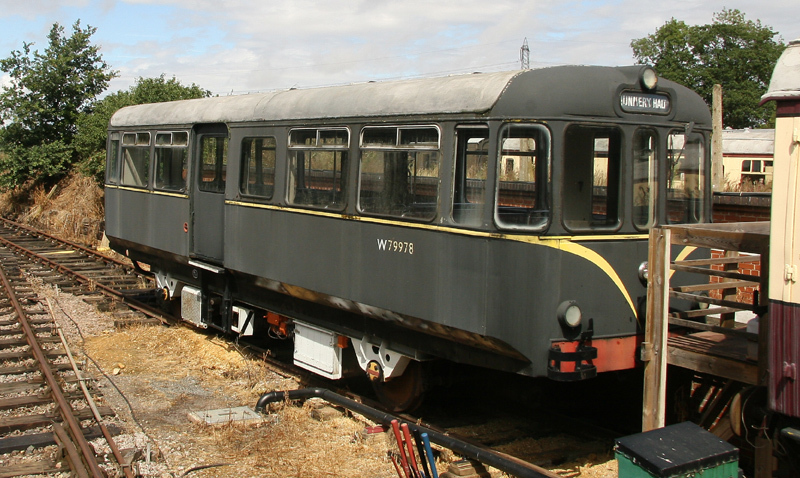 Platform chassis with front and rear subframes, GRP body. 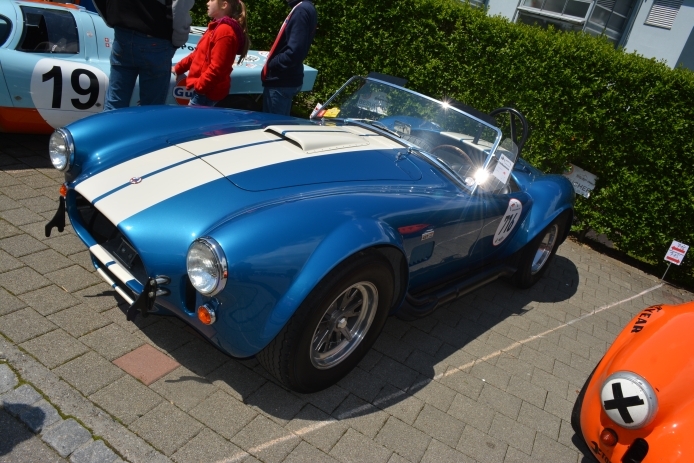 AC MK IV V8 1982–1996 Engine made by Ford. 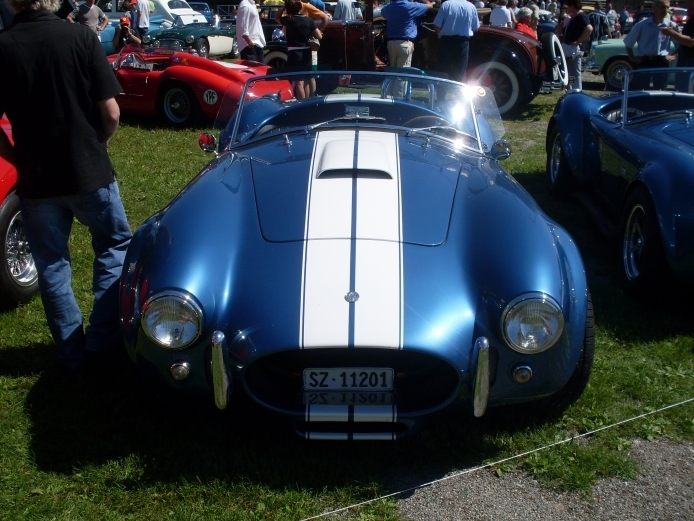 AC Aceca 4601/4942 cc V8 2 Cars 1998–2001 Engine made by Ford. 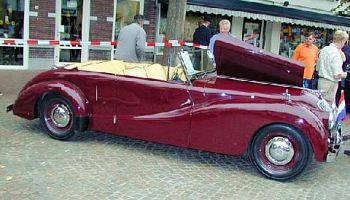 4942 cc version supercharged. 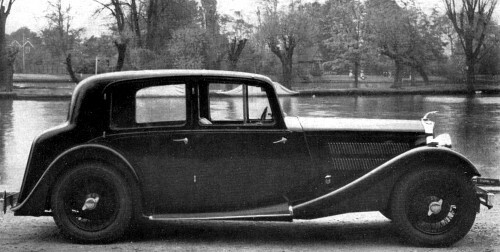 Four-seat coupé version of the Ace. 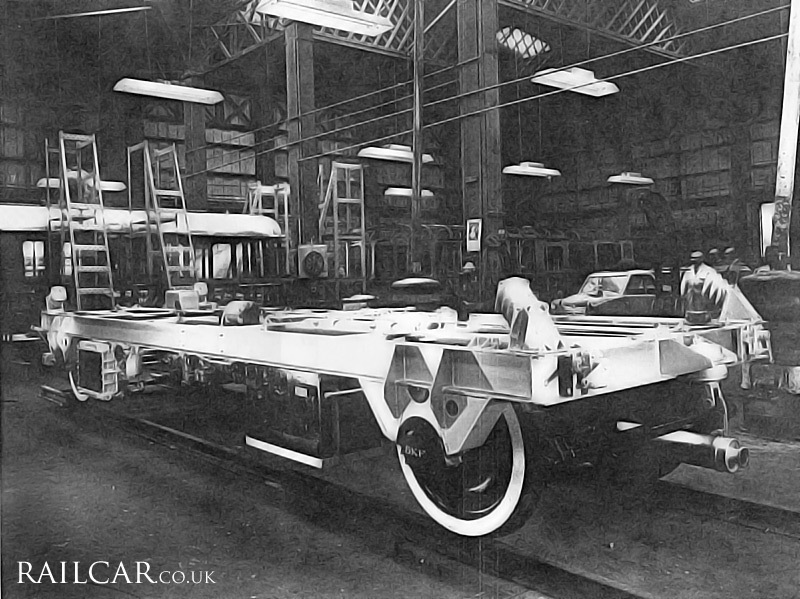 Chassis made in South Africa, bodies in Coventry. 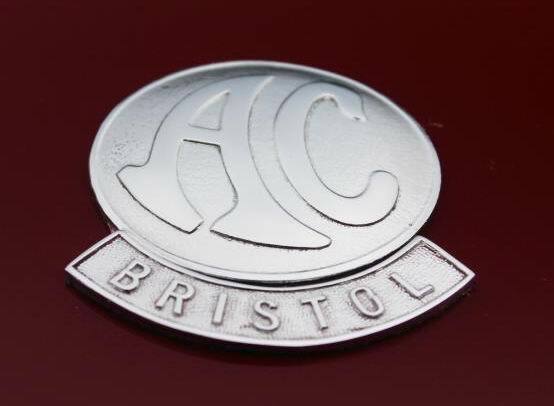 AC MK III FIA V8 1 Car 1998 1 race model made for Brooklands Motor Company, (COB 4007). 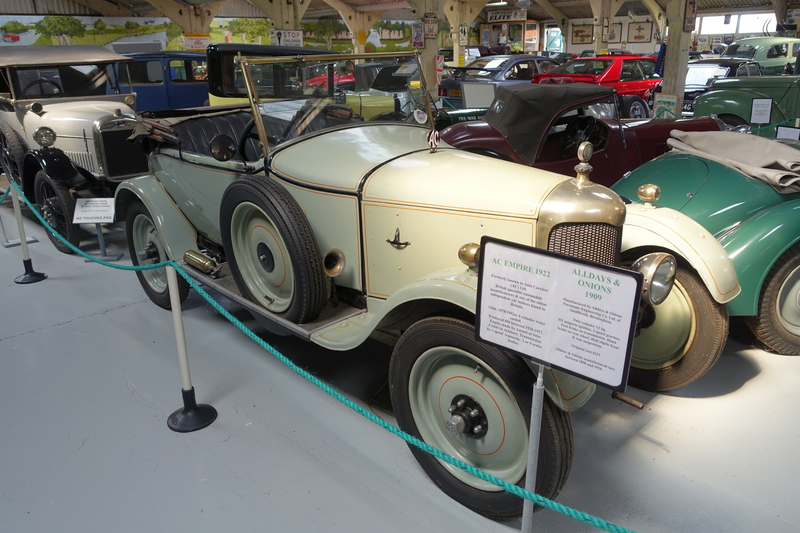 Car produced at Brooklands. 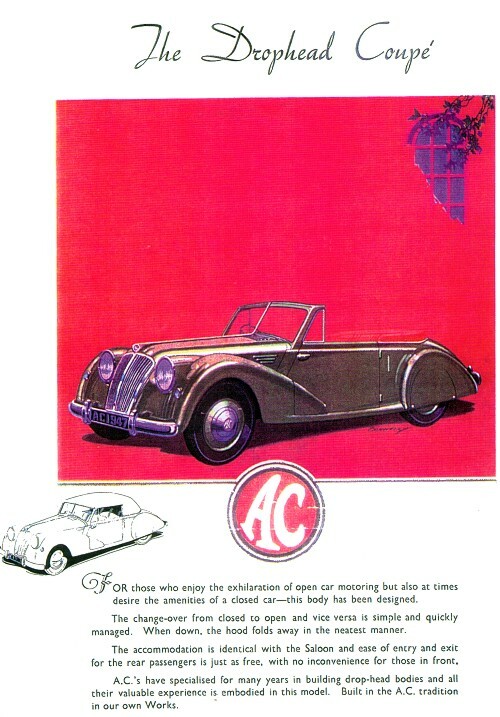 AC MK II FIA V8 1 Car 1999 Only 1 of the planned 25 cars were built. 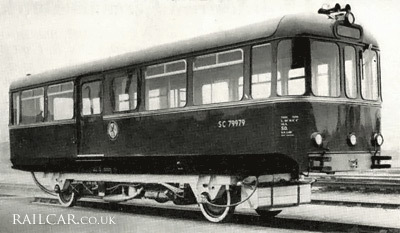 Chassis number COB 1001. 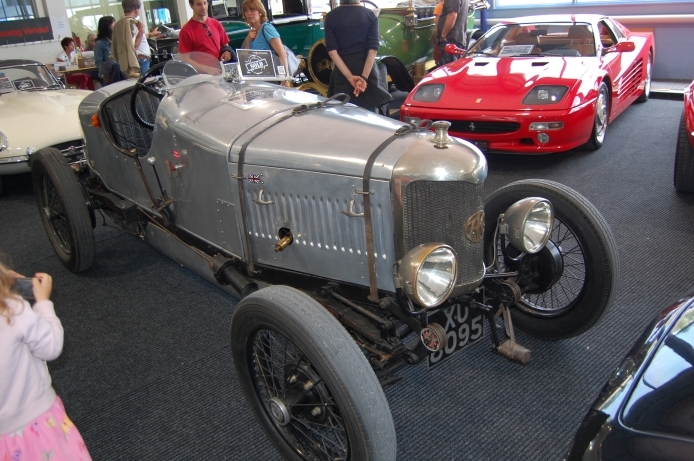 Aluminum Body and Chassis produced at Brooklands. 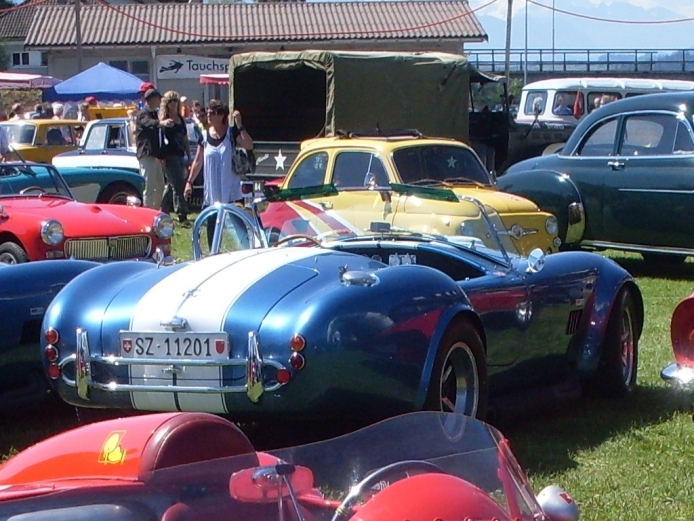 Painted Viking Blue with Red team stripe in 2001. 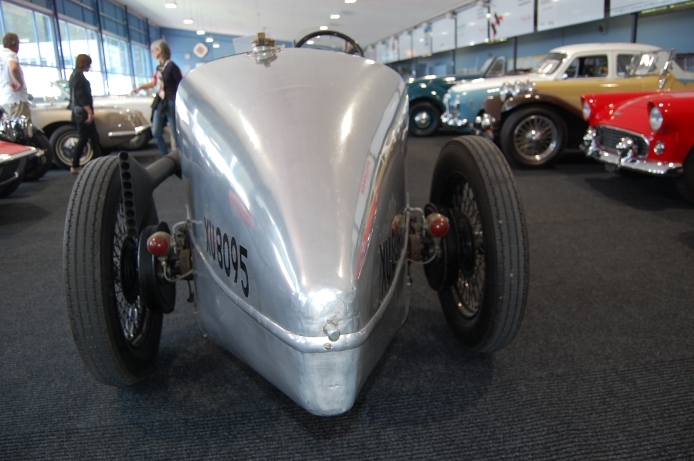 AC Superblower (MK IV) V8 1999–2002 Cars produced in Brooklands. 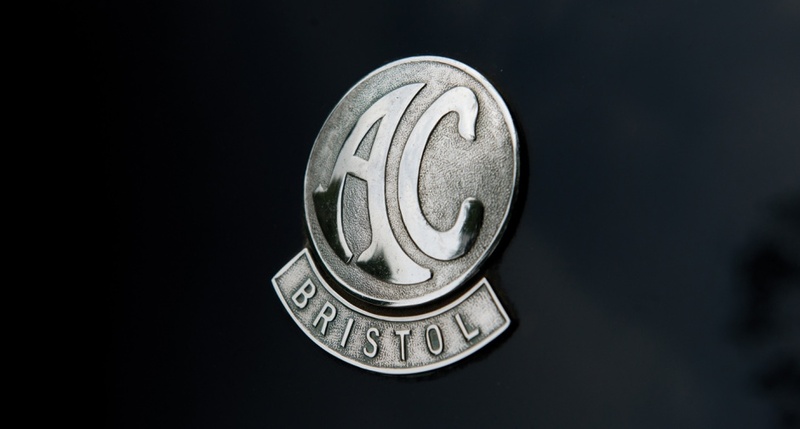 AC CRS (MK IV) V8 2000–2002 Cars produced in Brooklands. 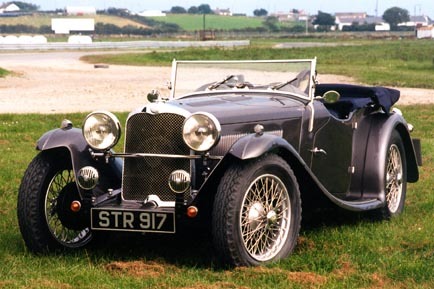 AC 212 S/C 3506 cc V8 Twin Turbo Lotus Engine 2 cars 2000 Car produced in Brooklands, Surrey. 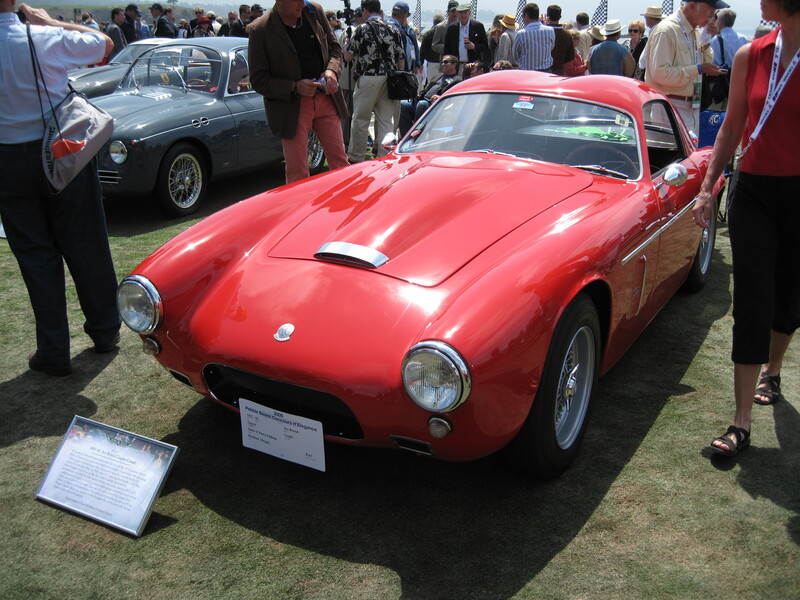 AC Mamba Coupe V8 1 Car 2000 Car produced in Brooklands, fiberglass coupe. 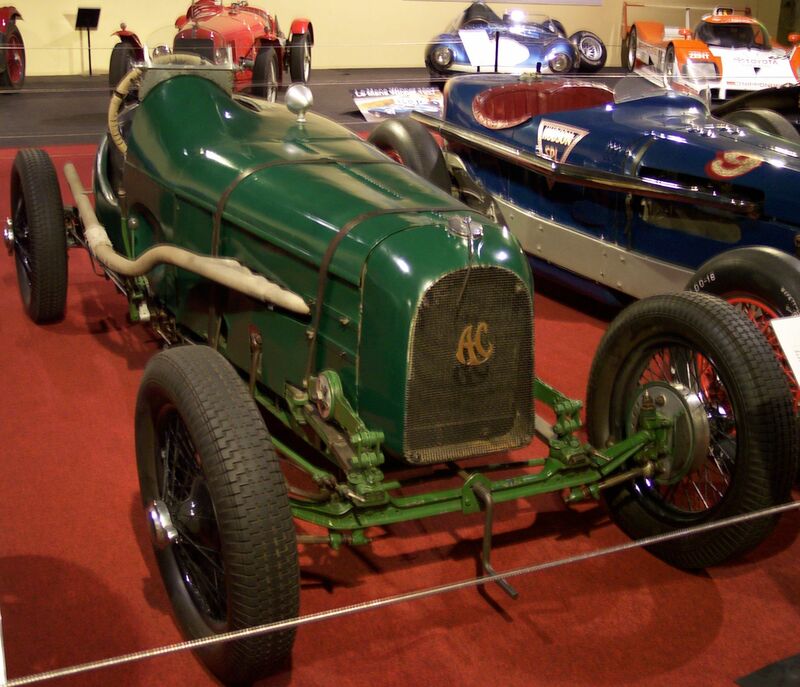 AC Centenary FIA V8 1 Chassis 2001 Chassis produced in Brooklands, (AC 100 Series). 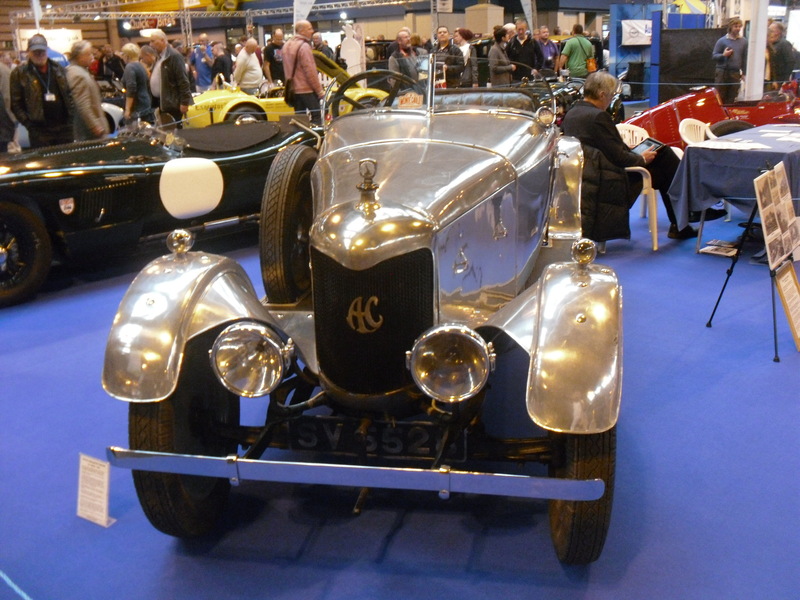 This chassis was produced for the 100th Anniversary of AC Cars. 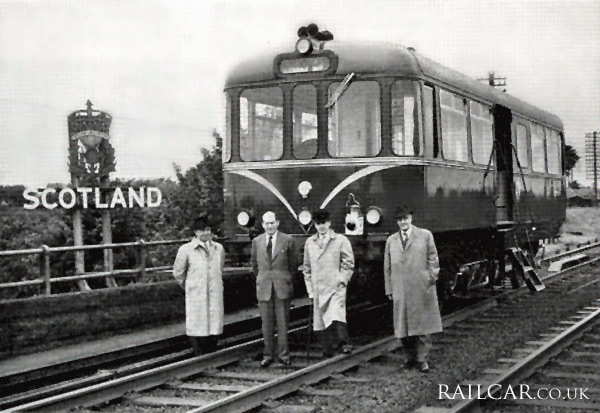 A planned run of only 10 cars. 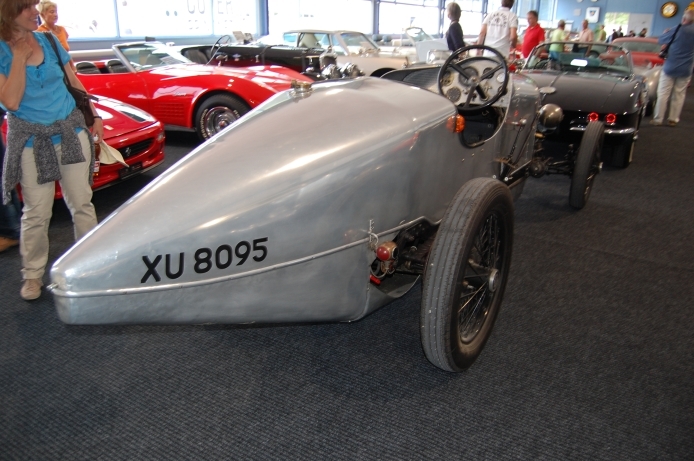 The chassis used a CRS chassis (with 4in main tubes and a double roll bar) with leaf spring suspension from a MK II FIA. 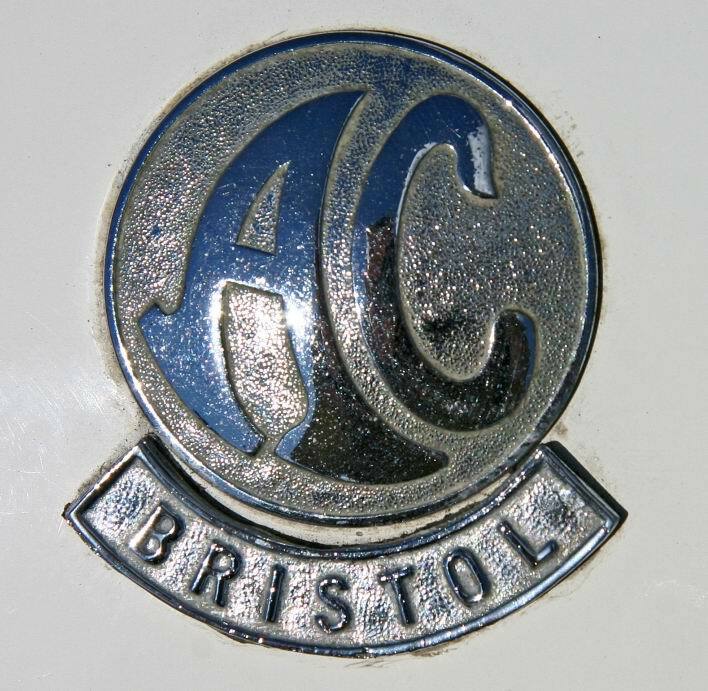 AC MK III V8 12 Cars 2002–2002 Cars made in Frimley works, (COB 5000 Series). 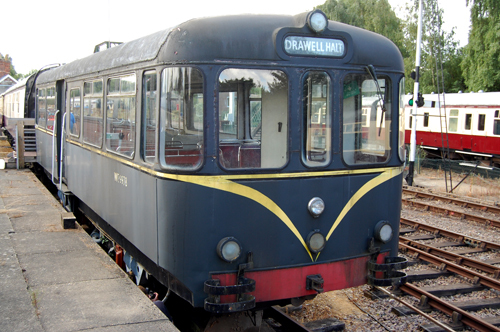 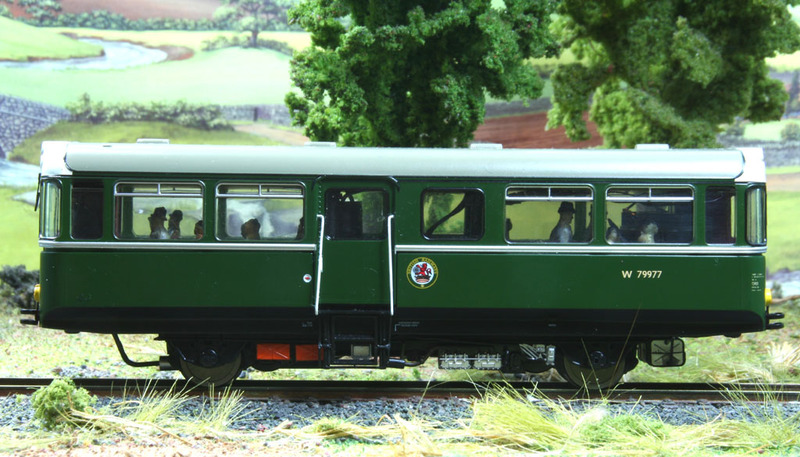 AC MK III V8 1 Car 2002–2003 Car made in Frimley works, (COX 3361). 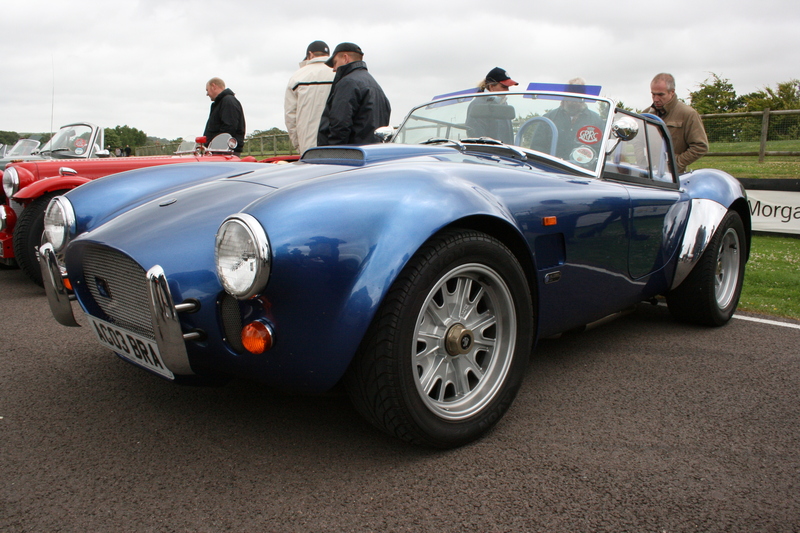 AC MK II Ace 2.6 V6 2 Cars 2002–2003 Car made in Frimley works, (RS 5027, RS 5028). 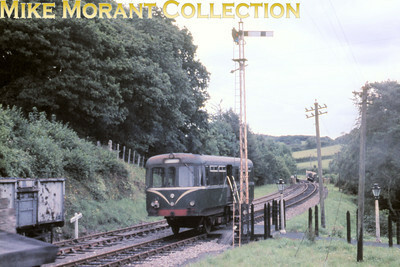 The Pictures from my collection, collected the past ten years on the www. 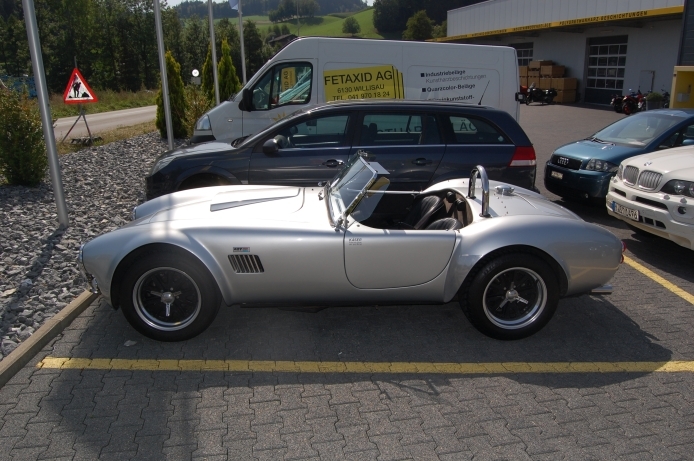 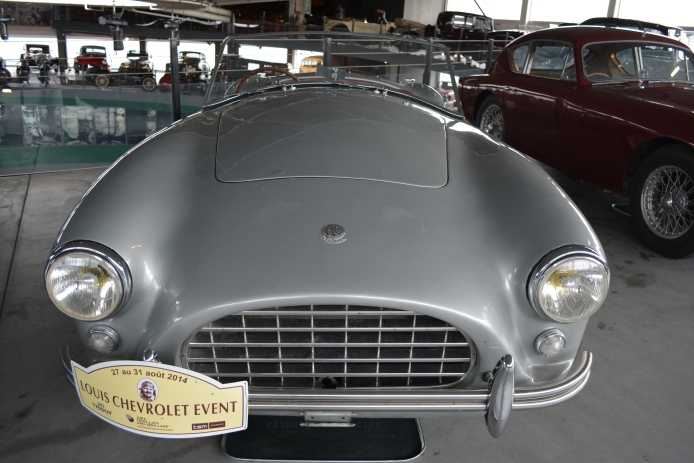 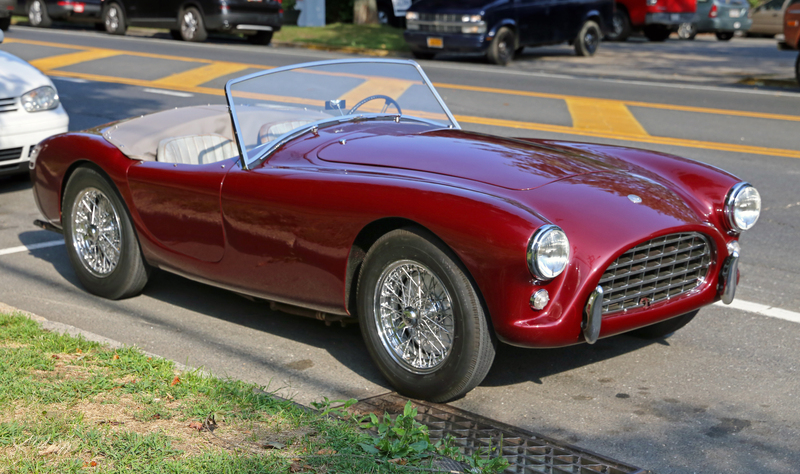 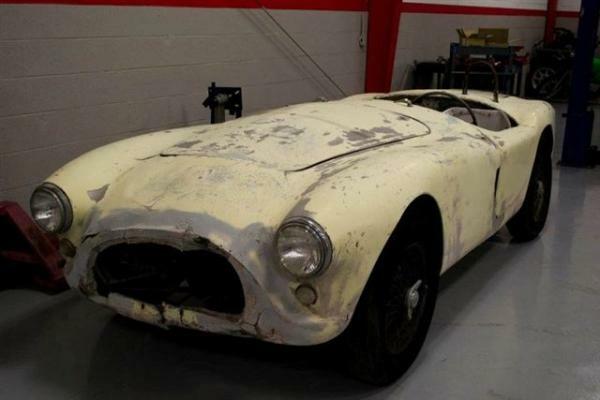 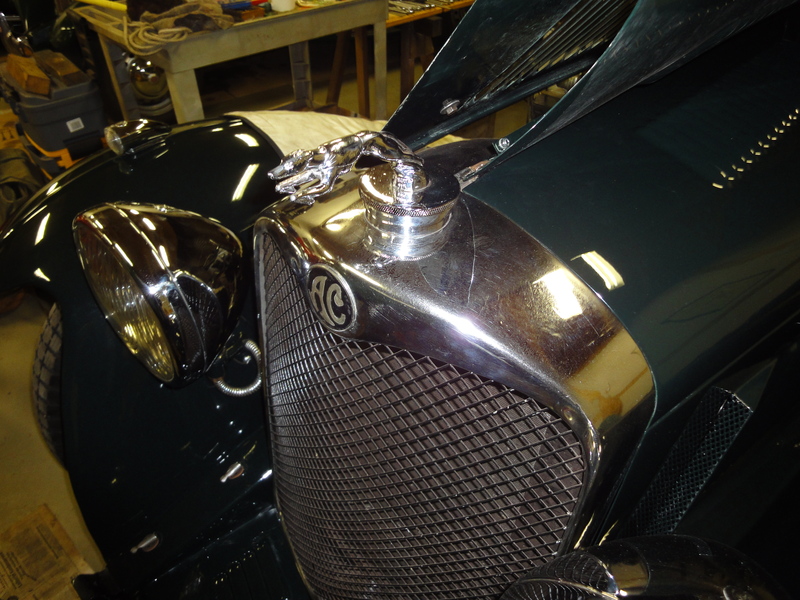 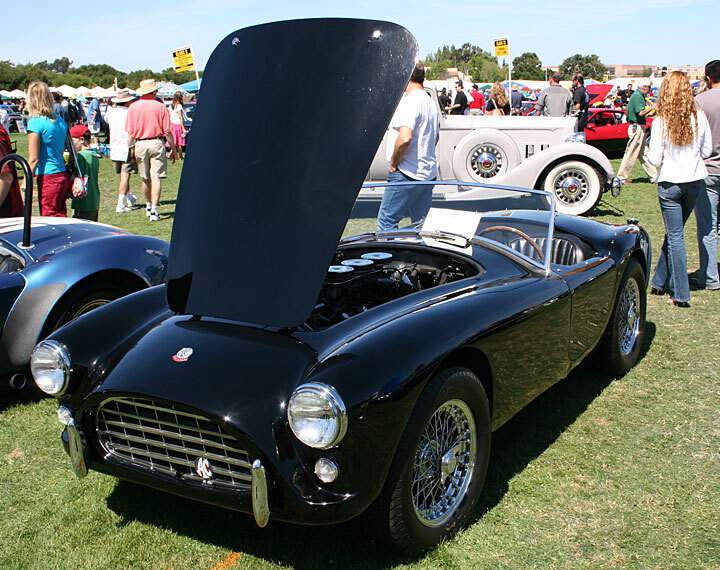 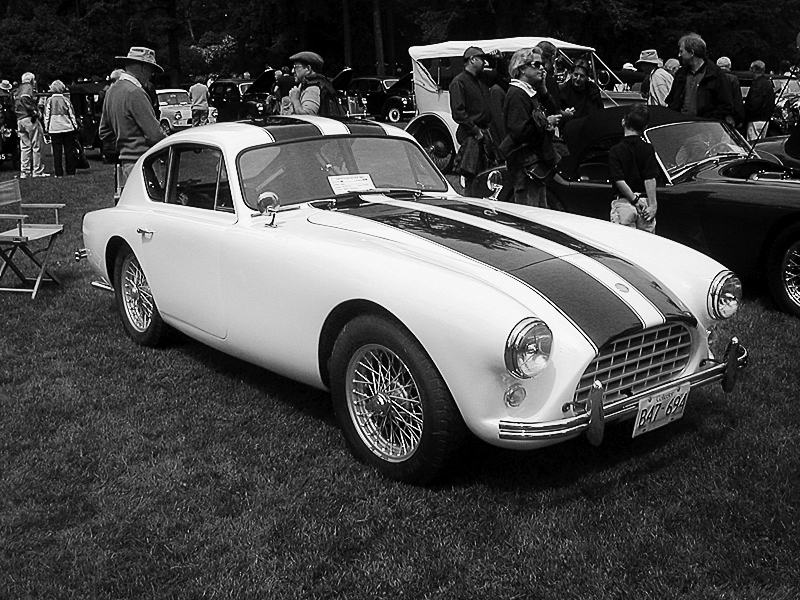 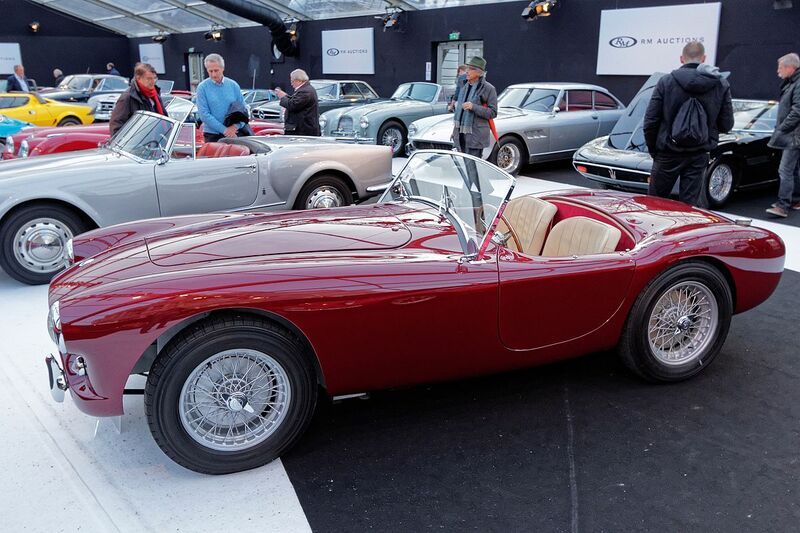 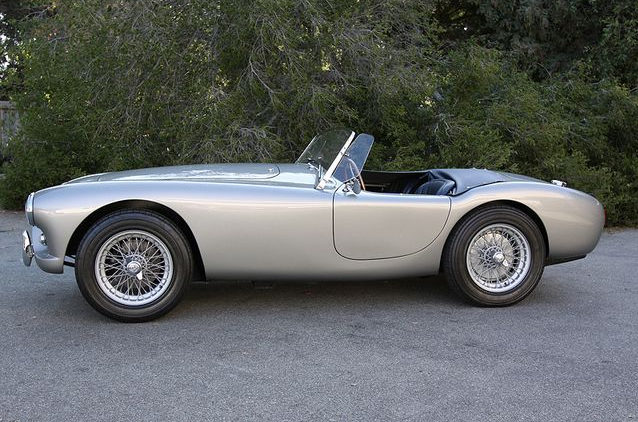 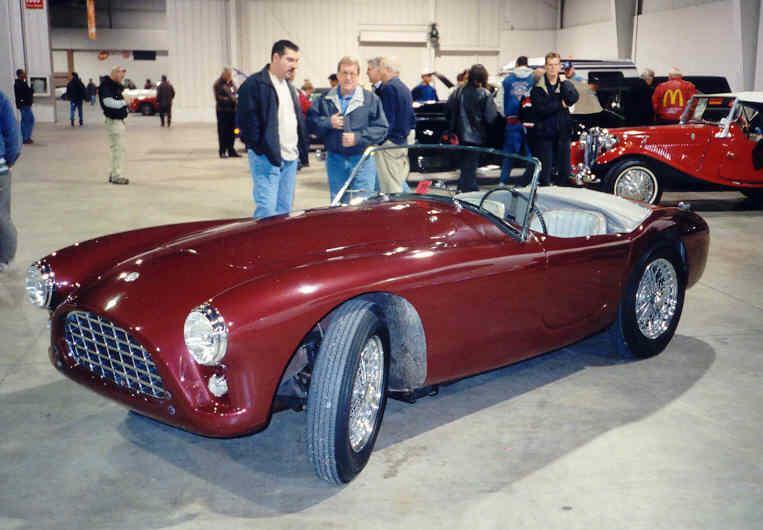 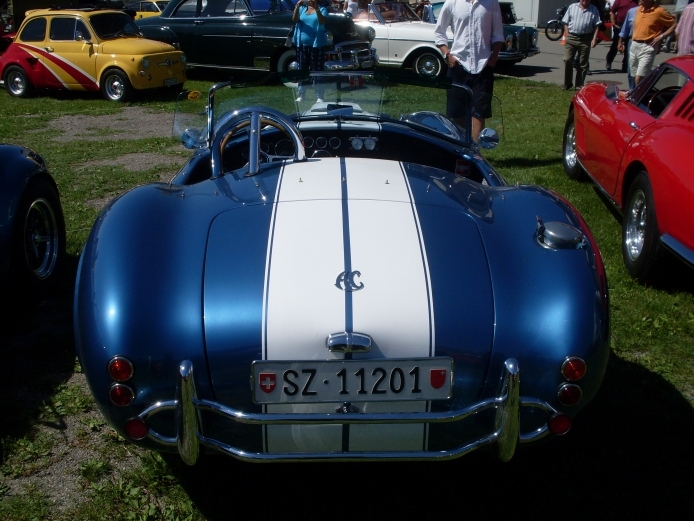 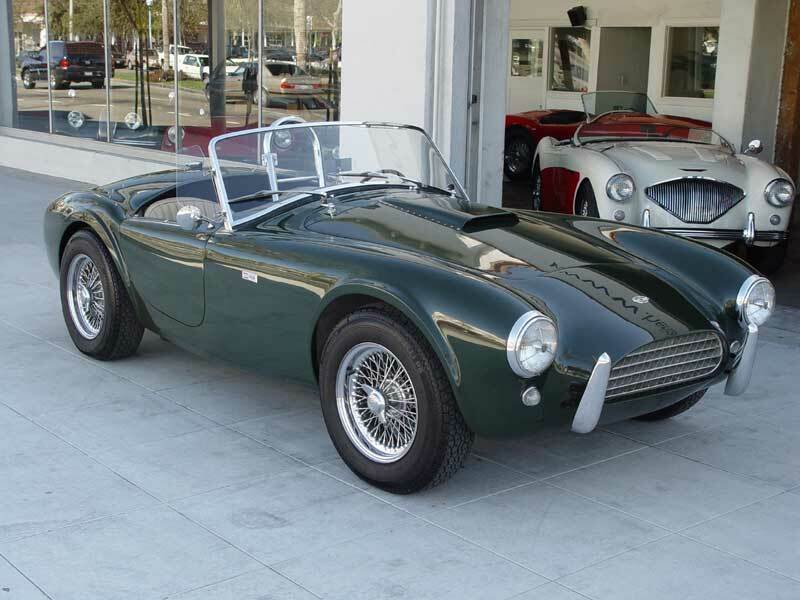 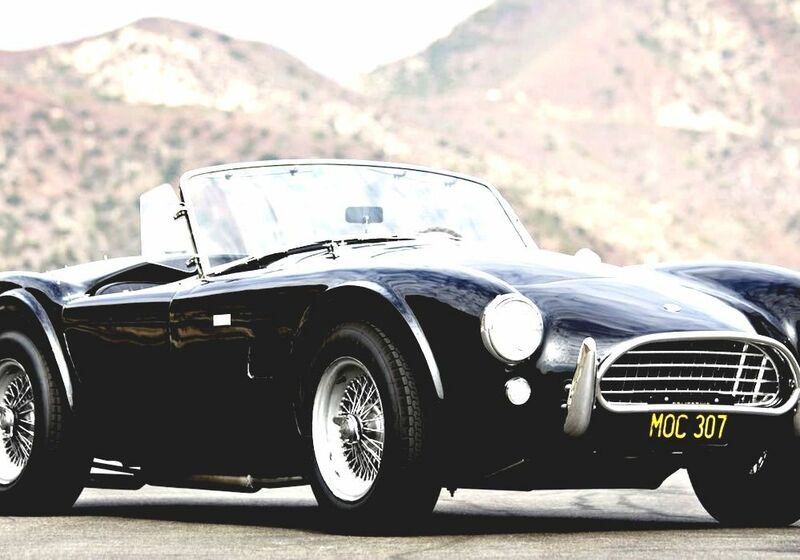 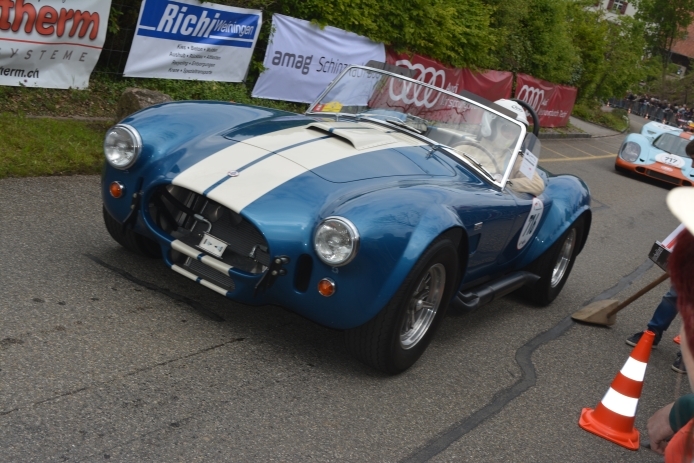 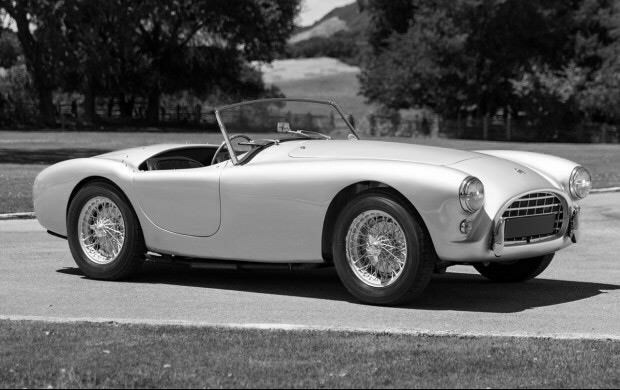 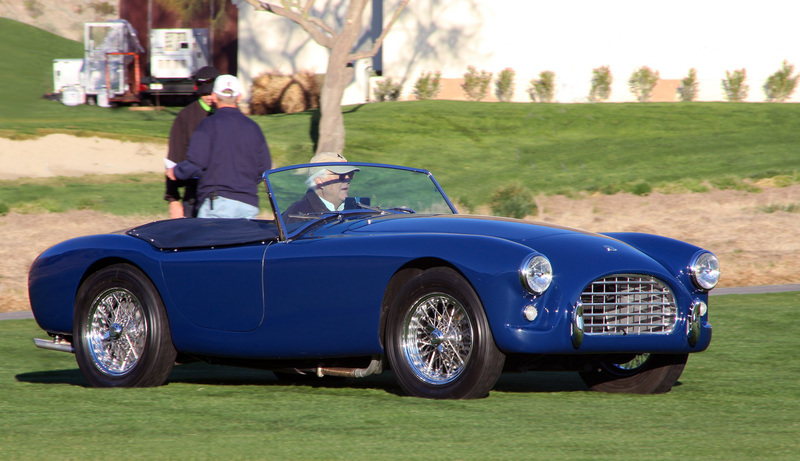 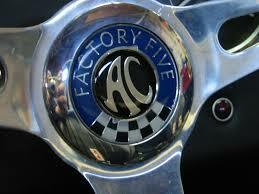 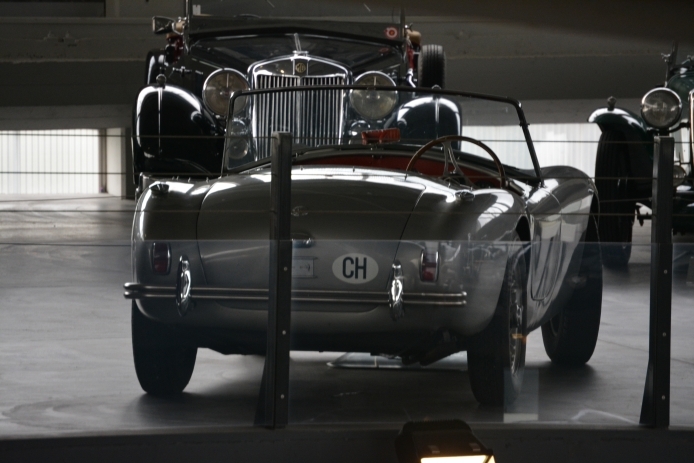 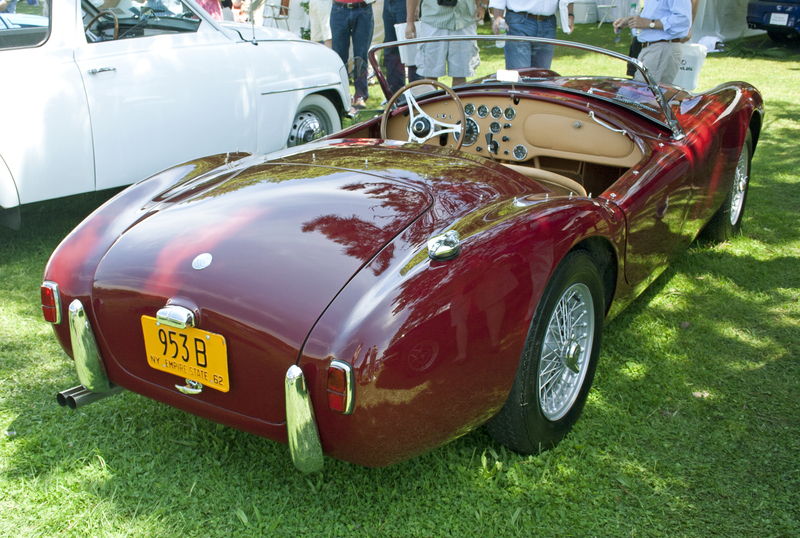 This is the coupe version of the AC Ace that Carroll Shelby used as the basis for his AC Cobra.